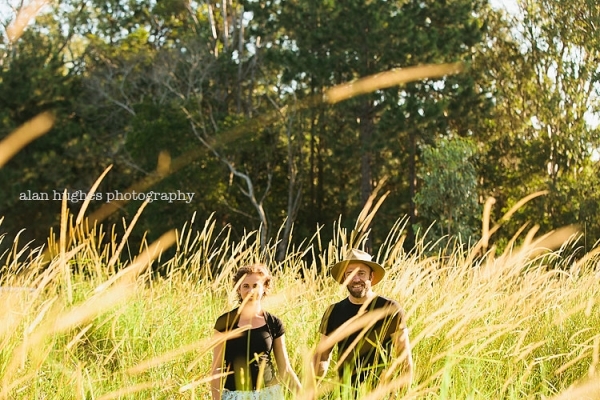 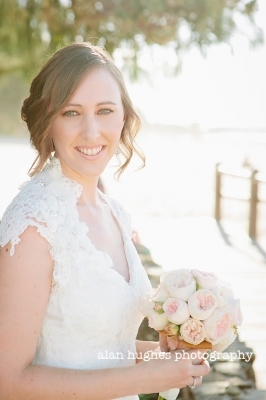 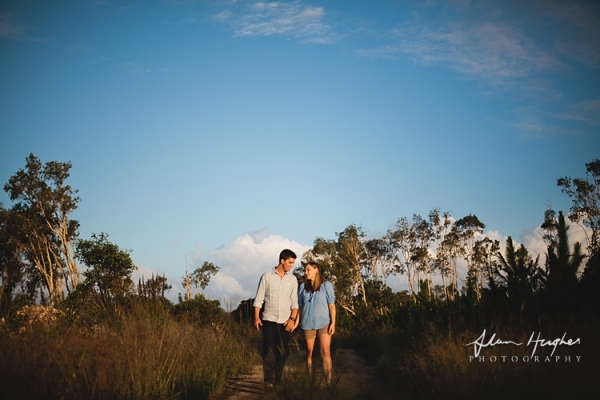 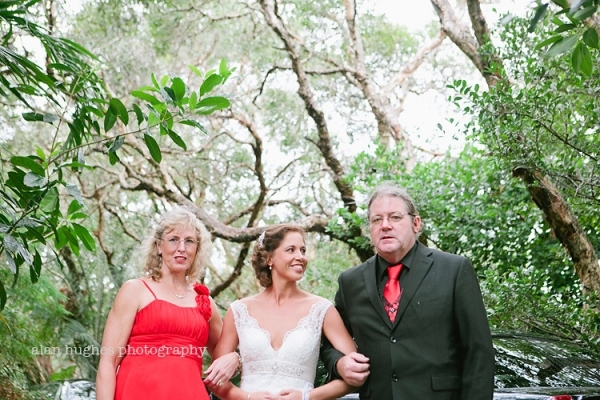 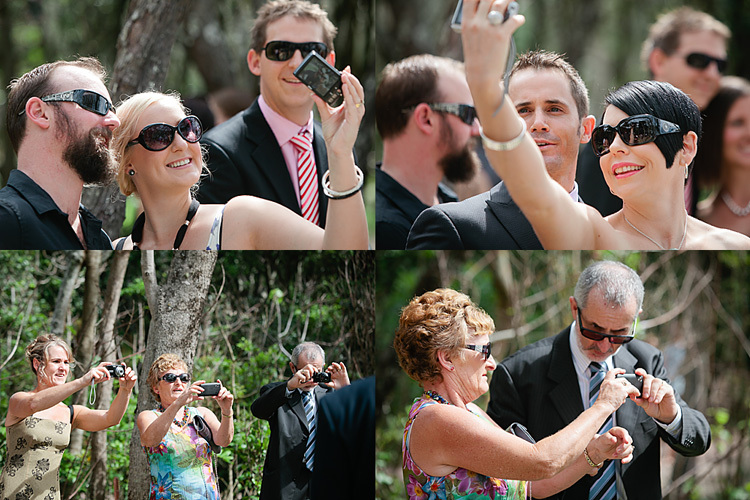 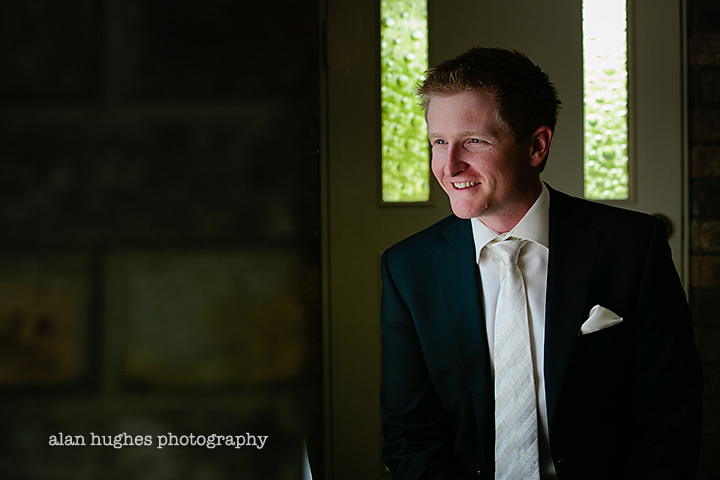 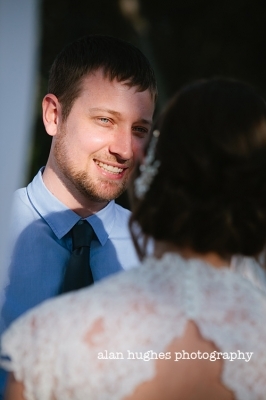 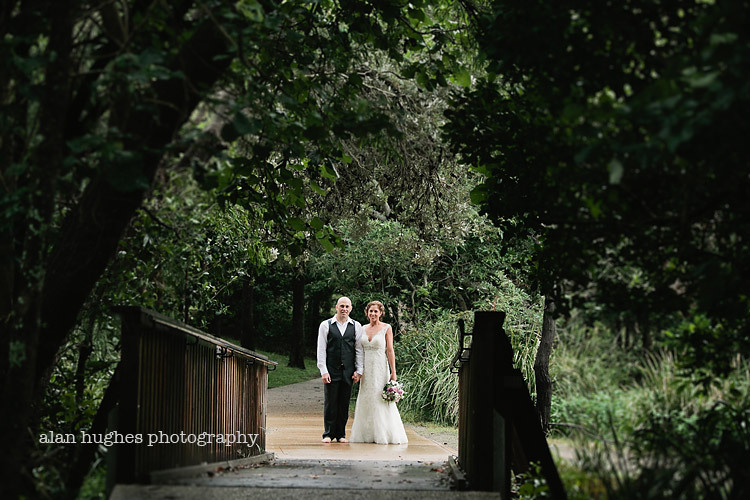 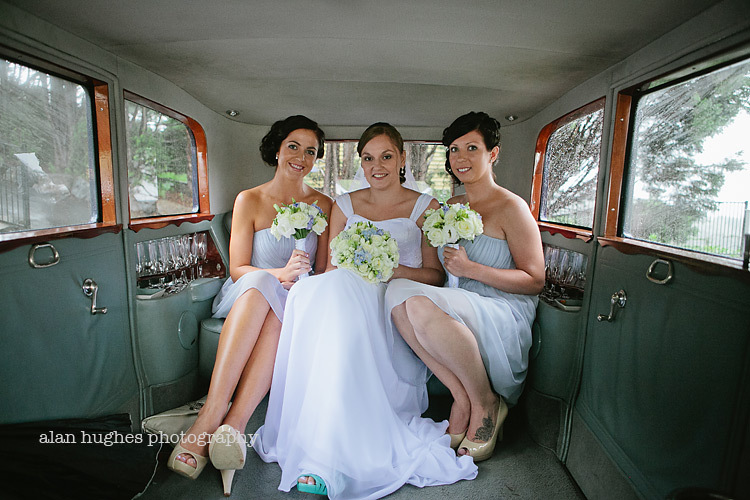 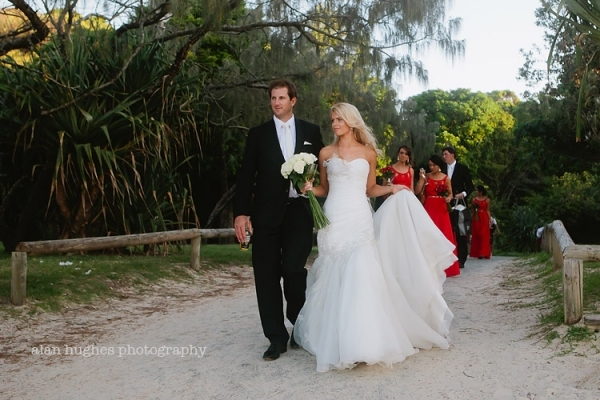 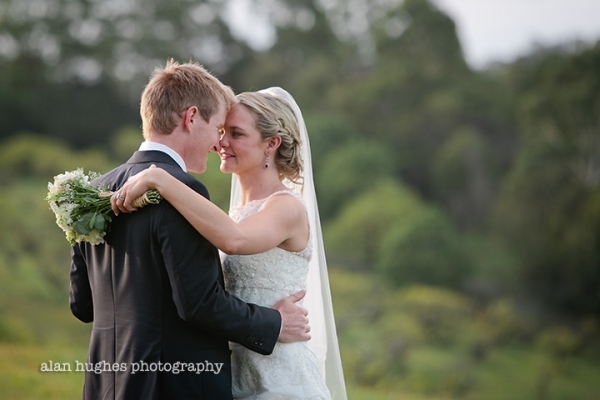 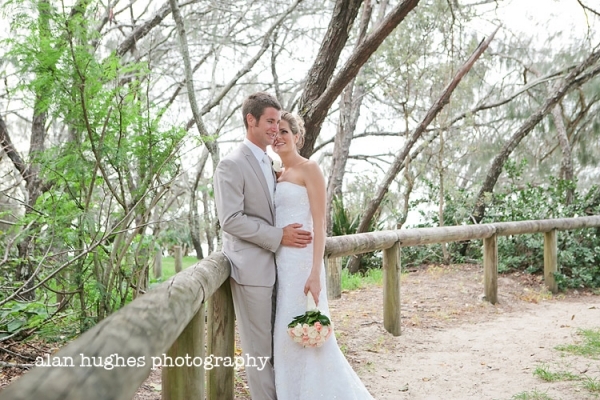 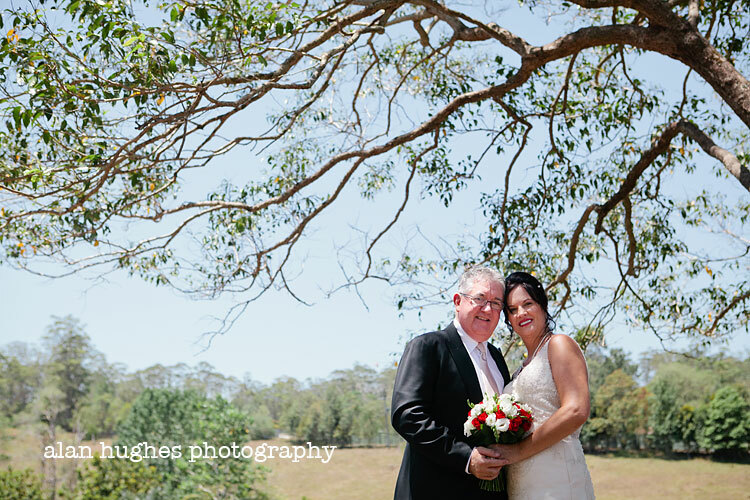 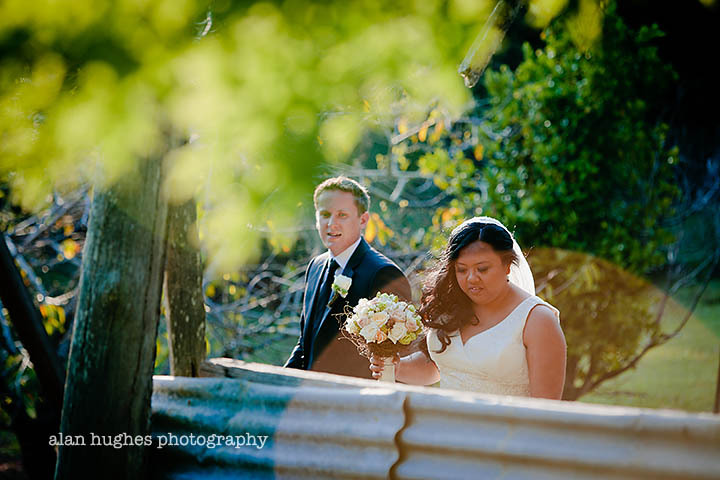 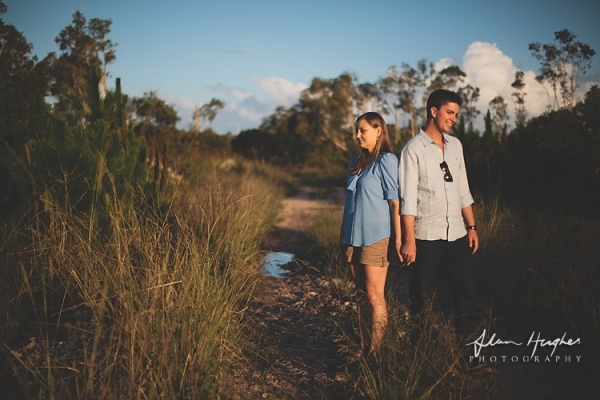 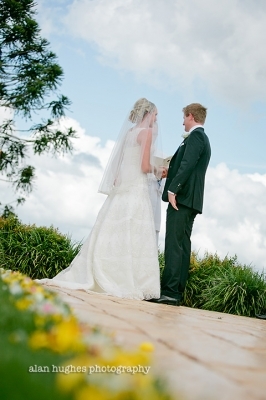 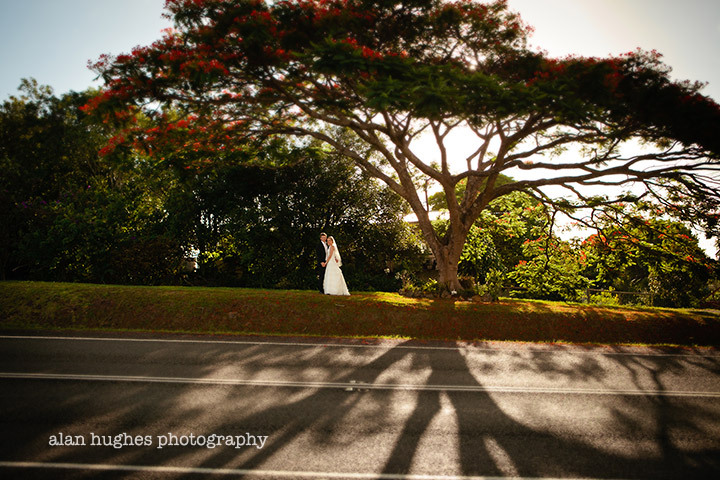 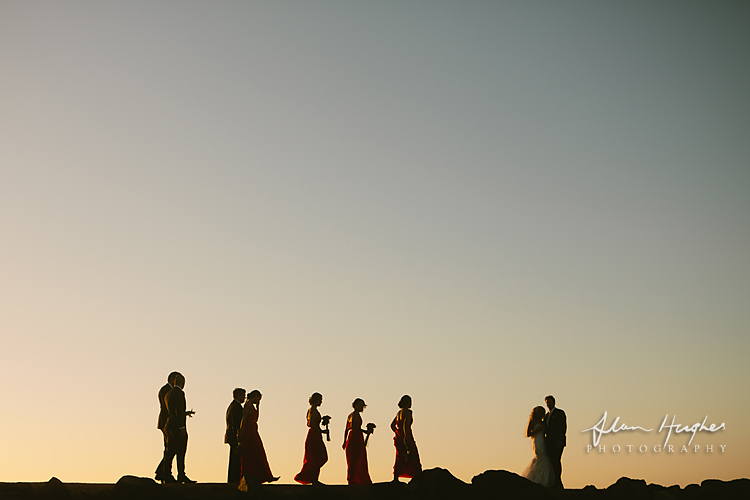 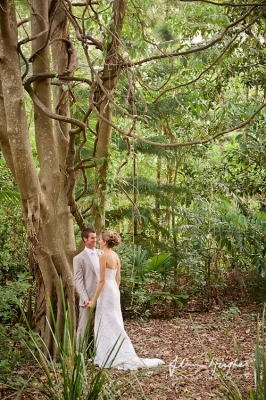 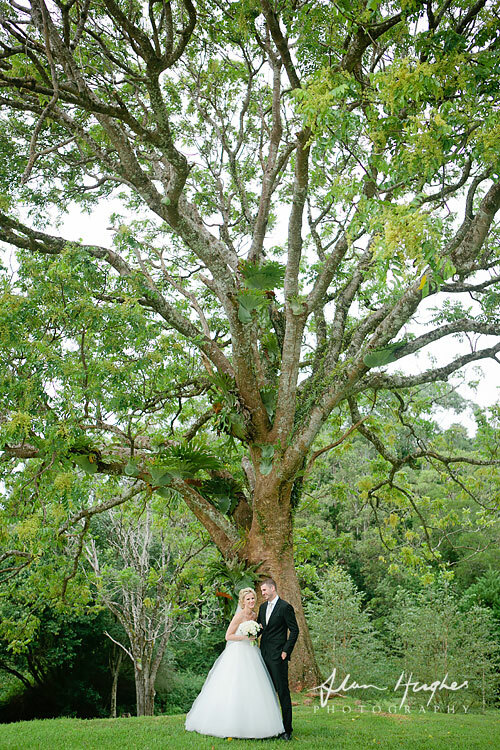 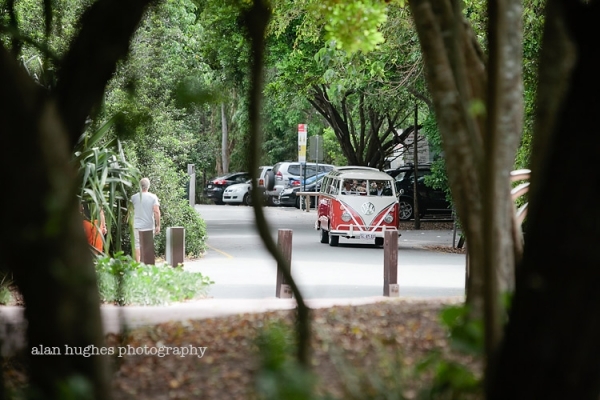 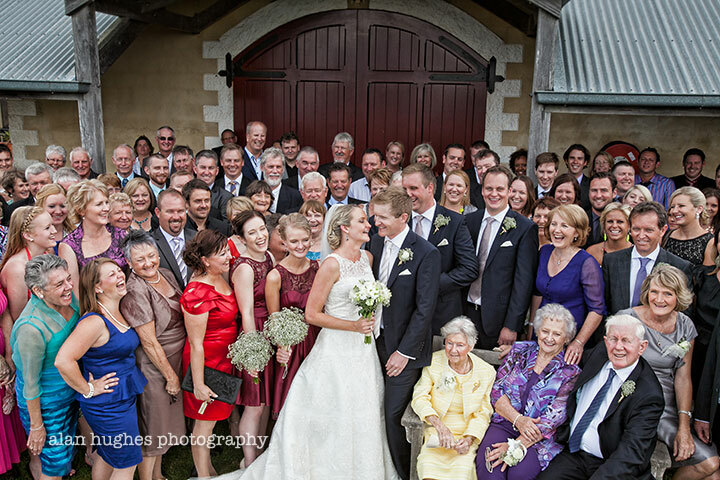 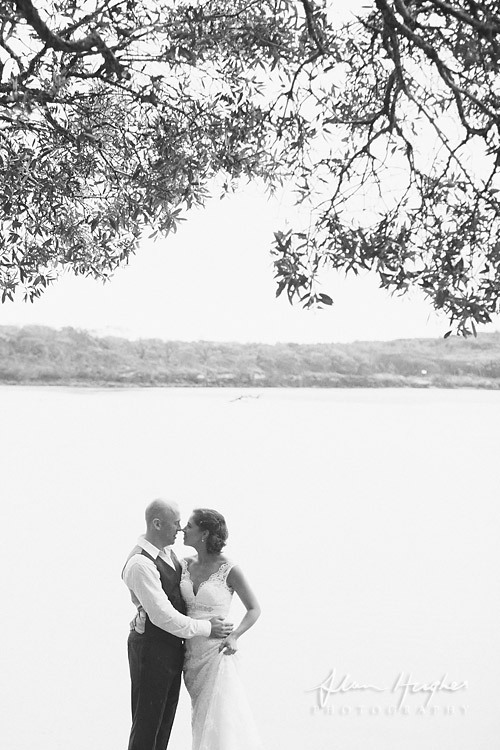 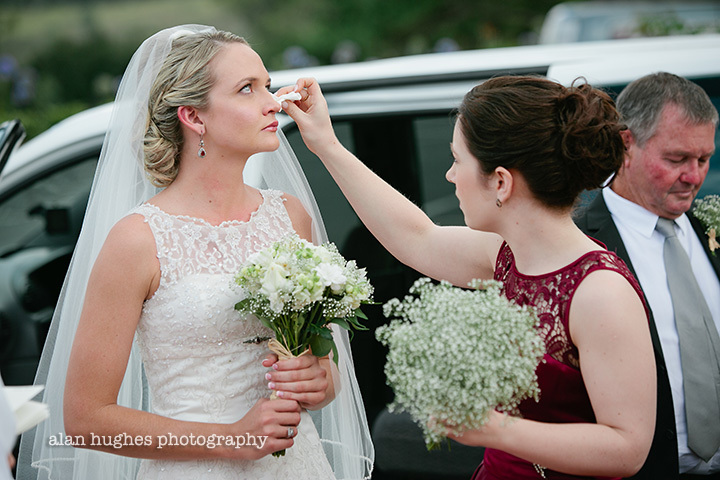 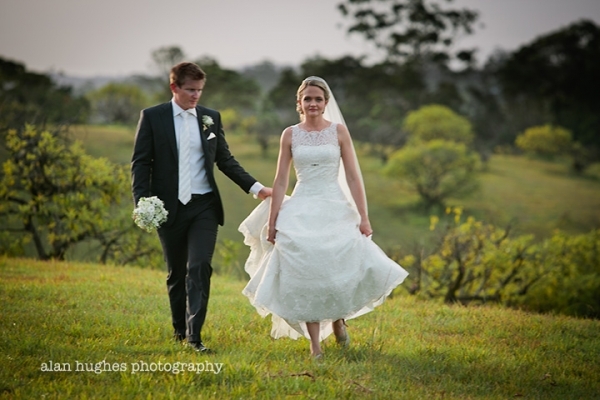 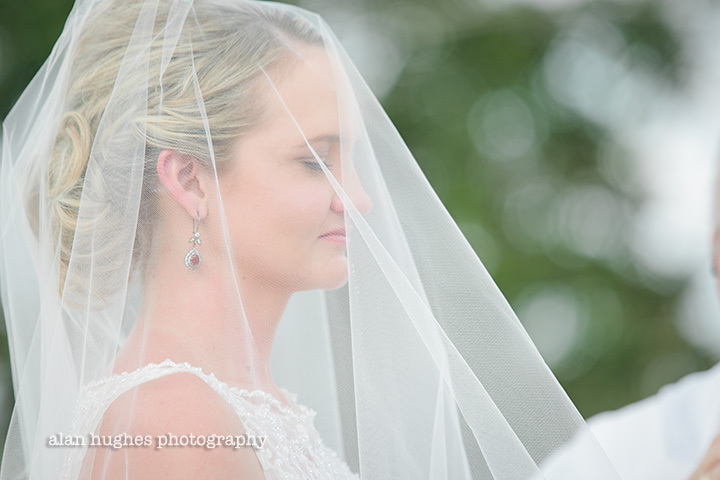 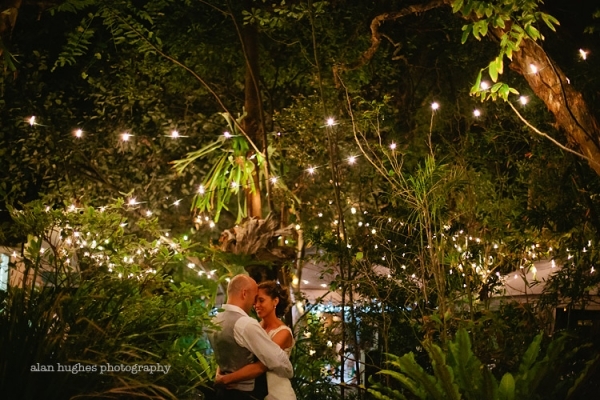 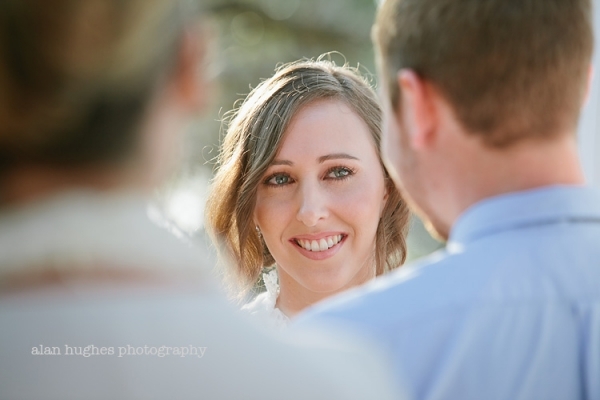 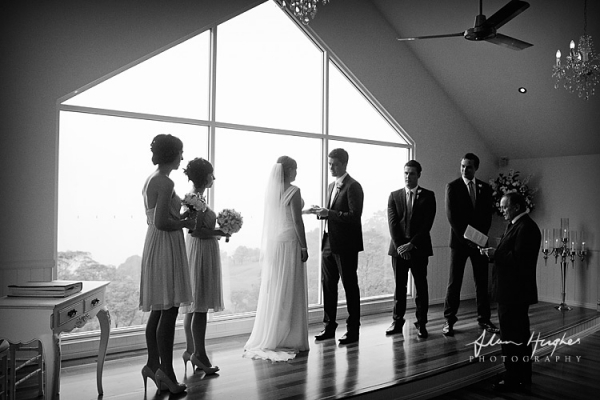 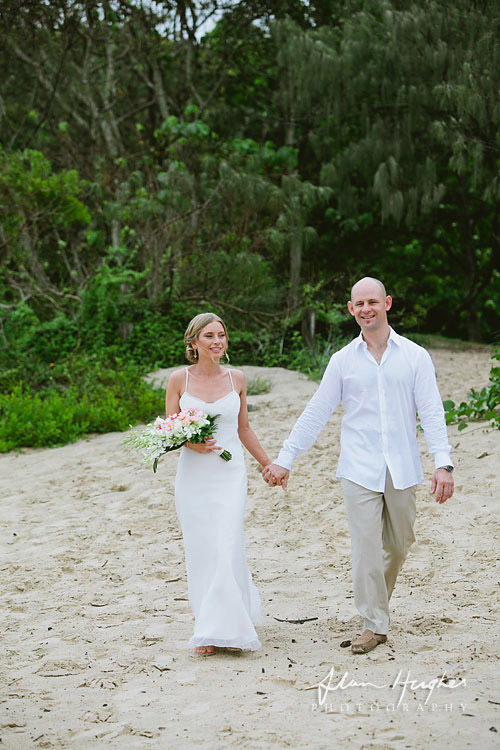 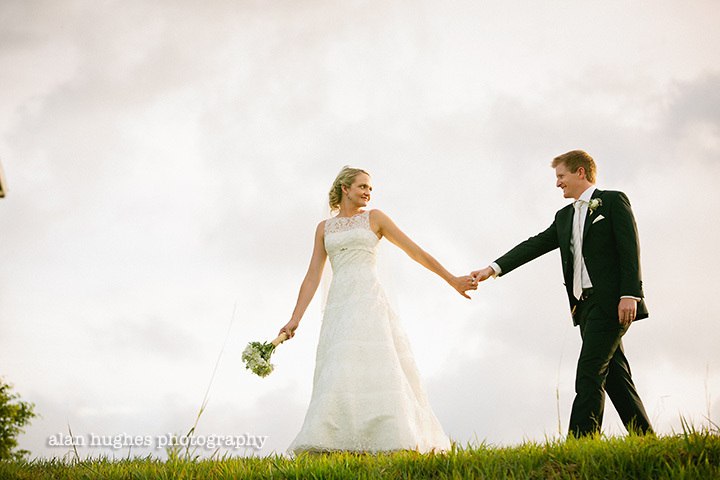 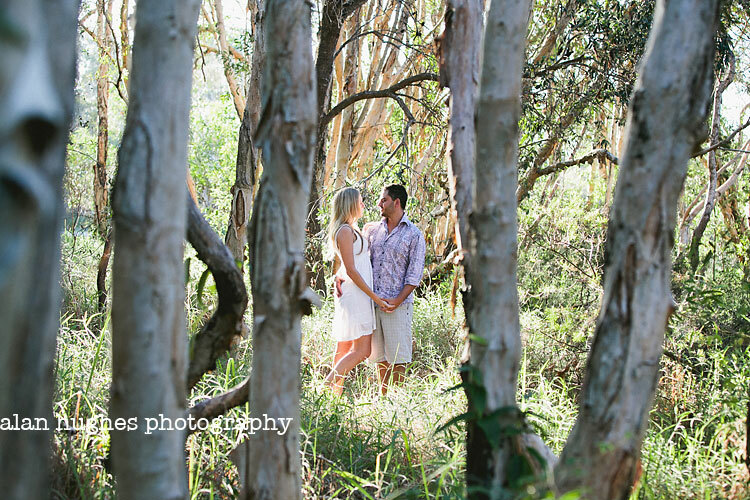 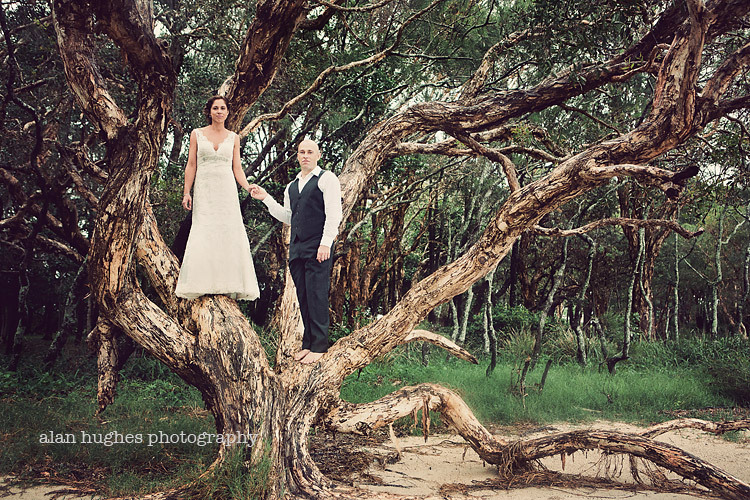 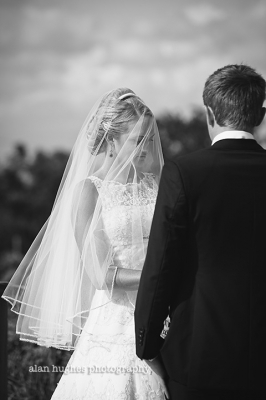 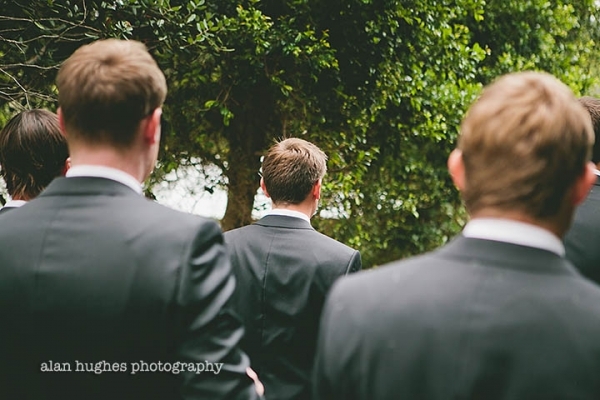 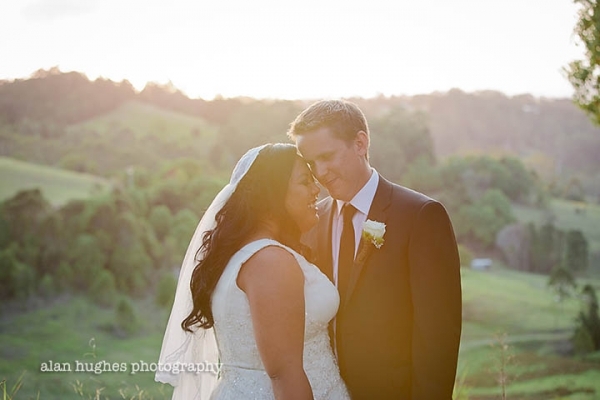 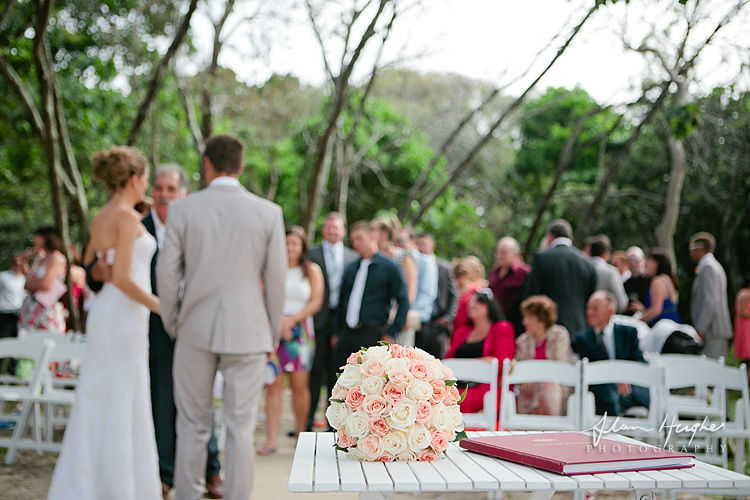 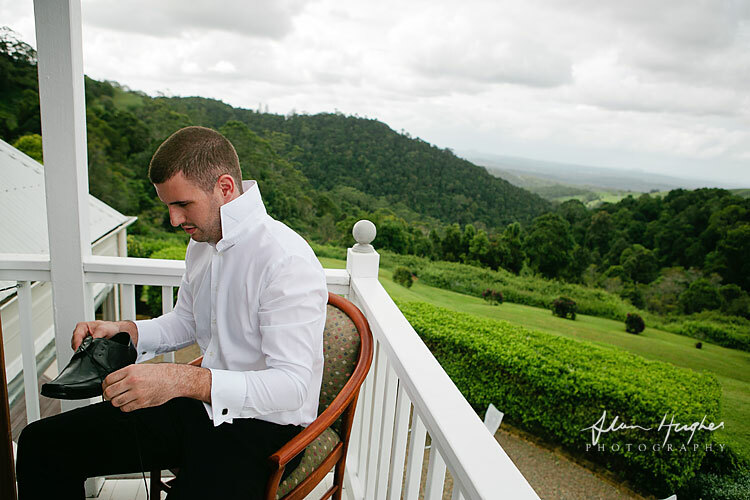 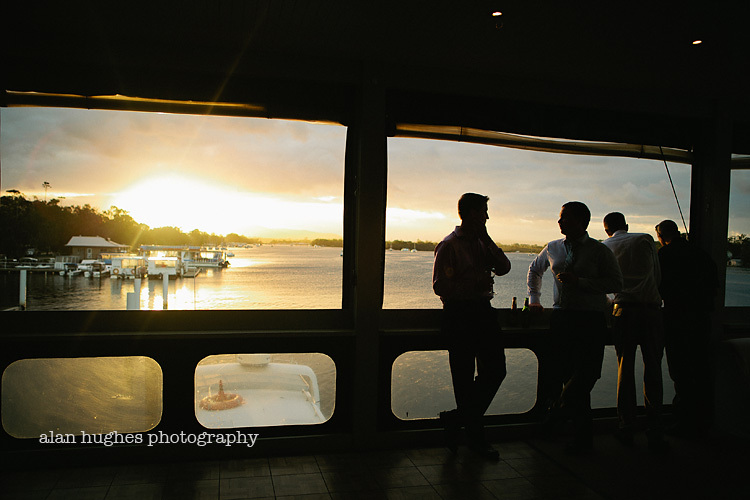 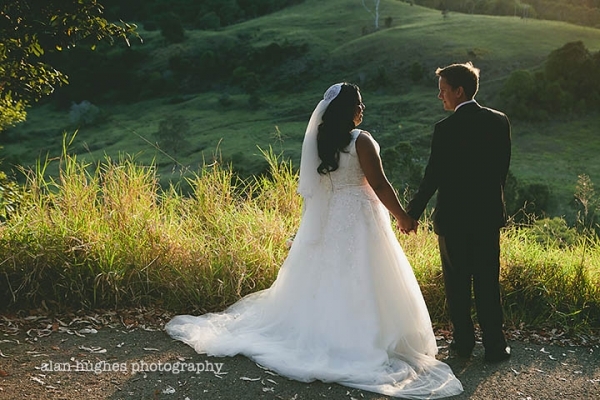 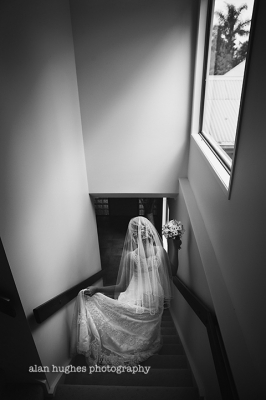 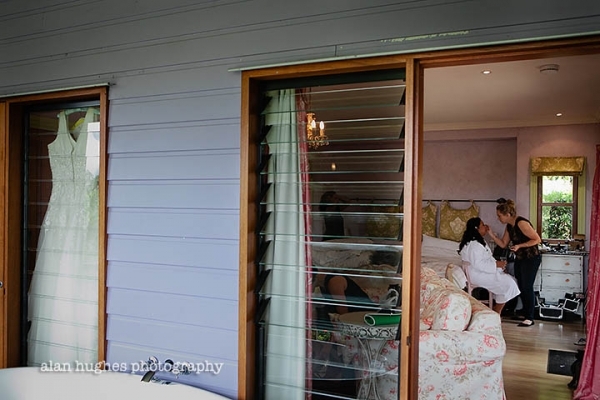 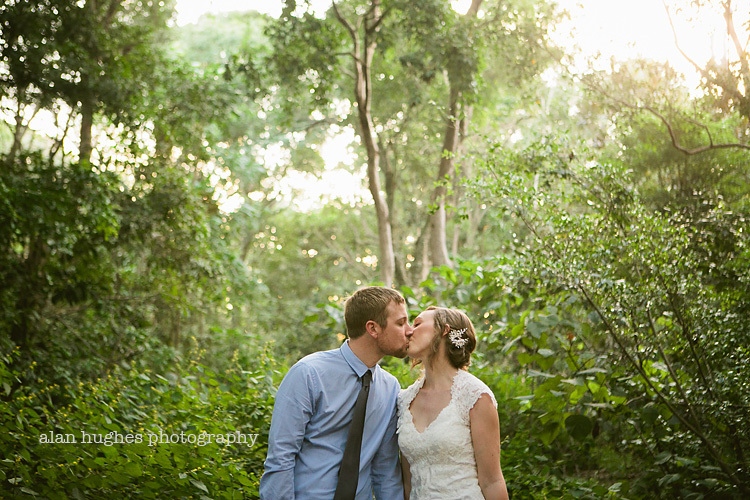 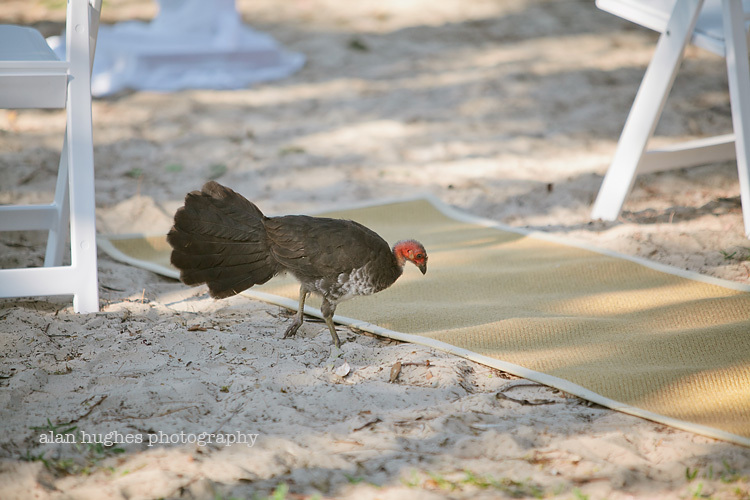 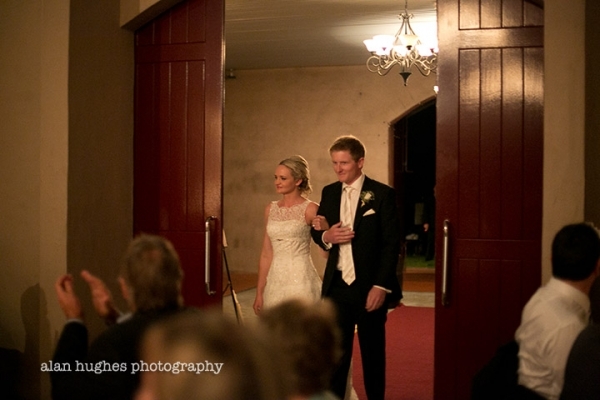 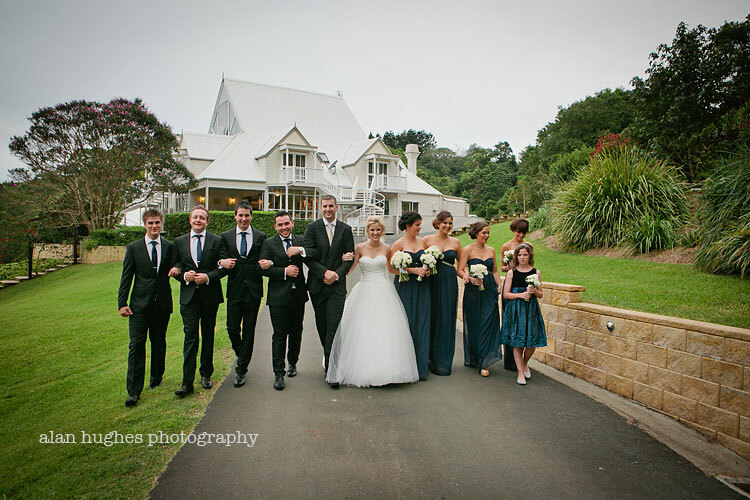 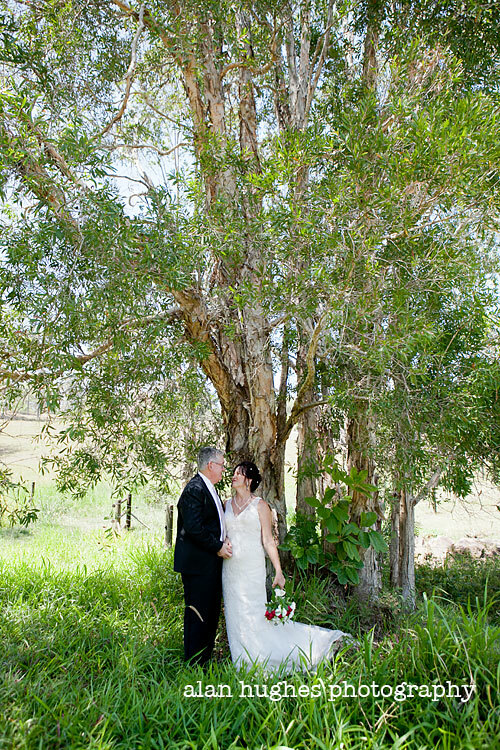 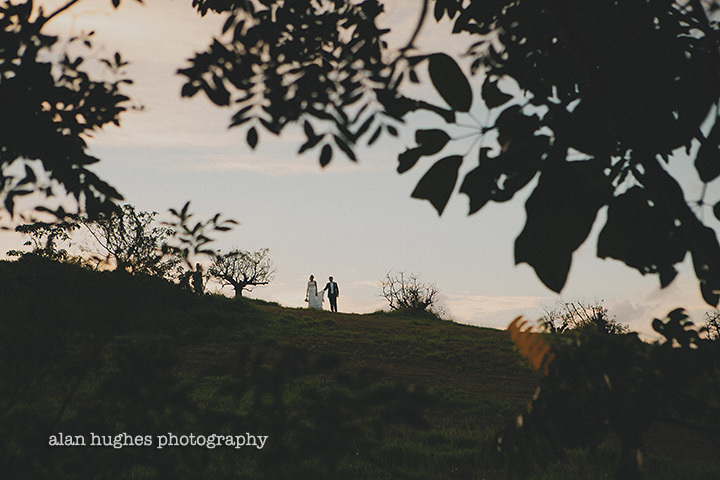 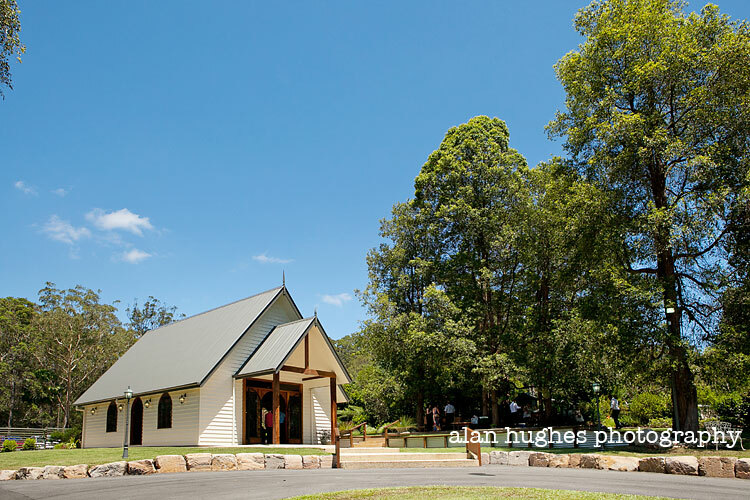 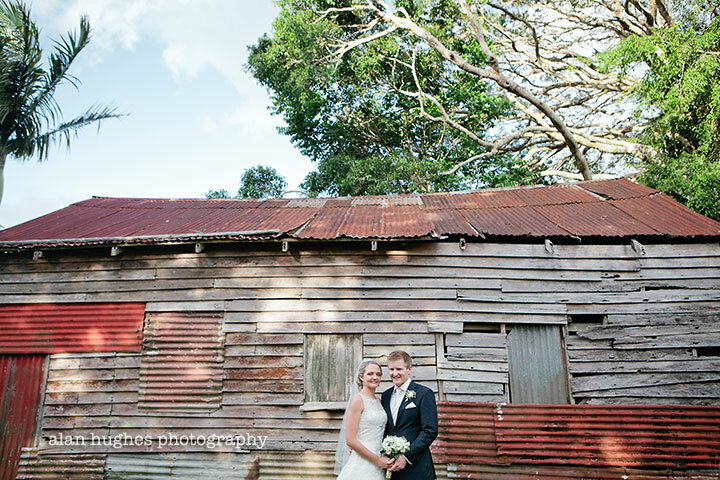 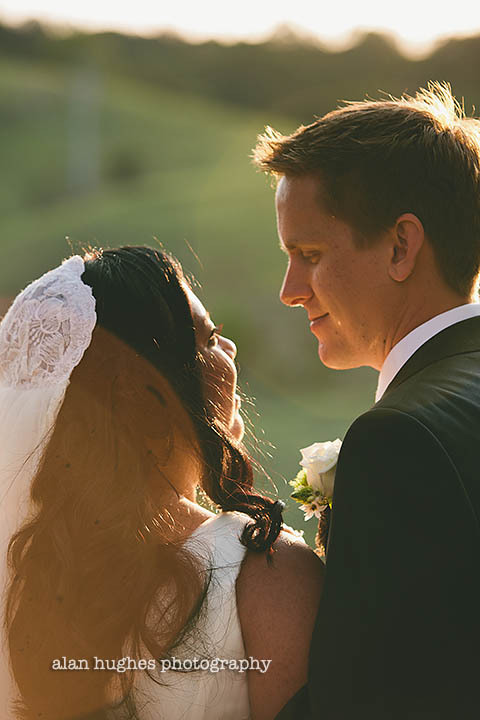 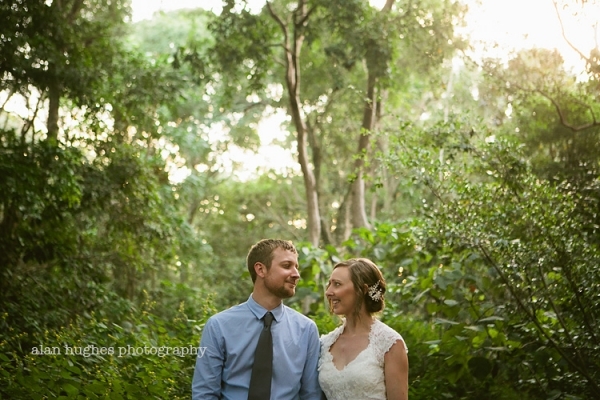 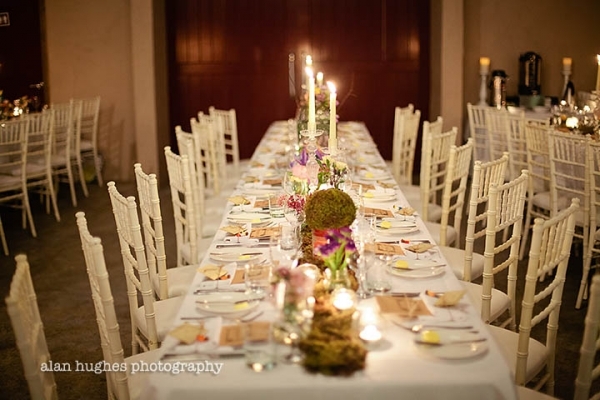 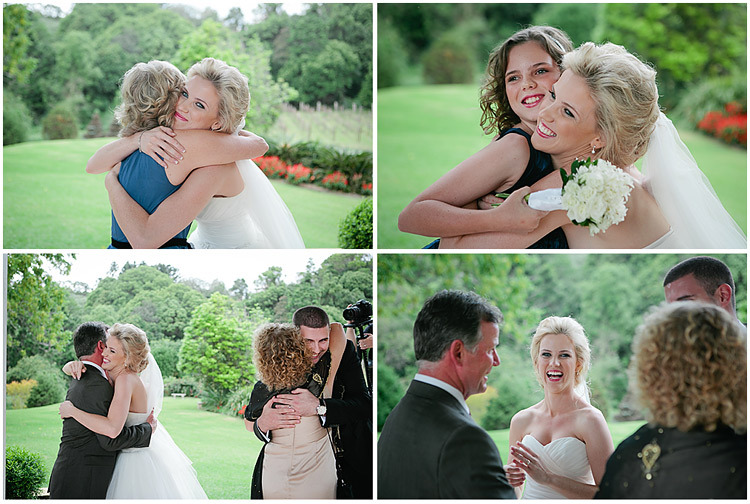 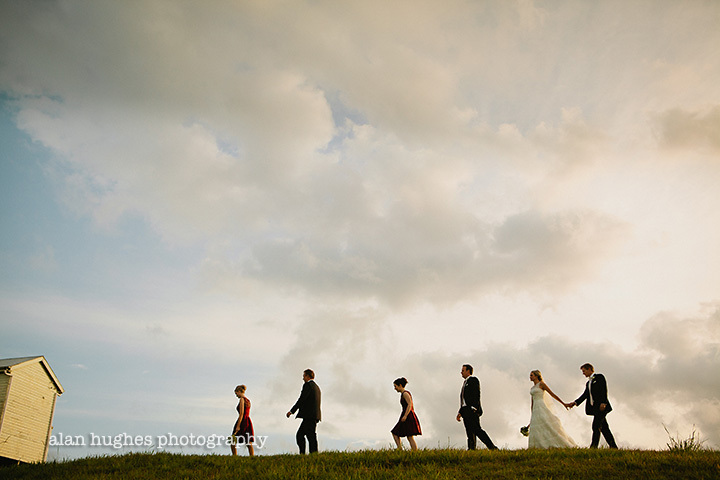 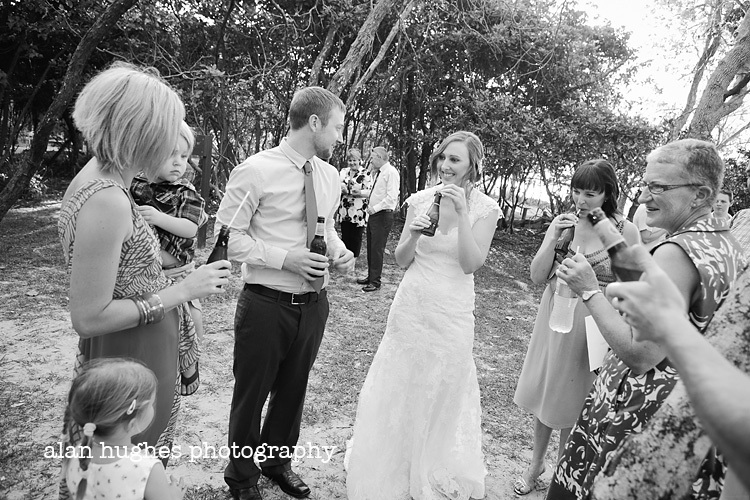 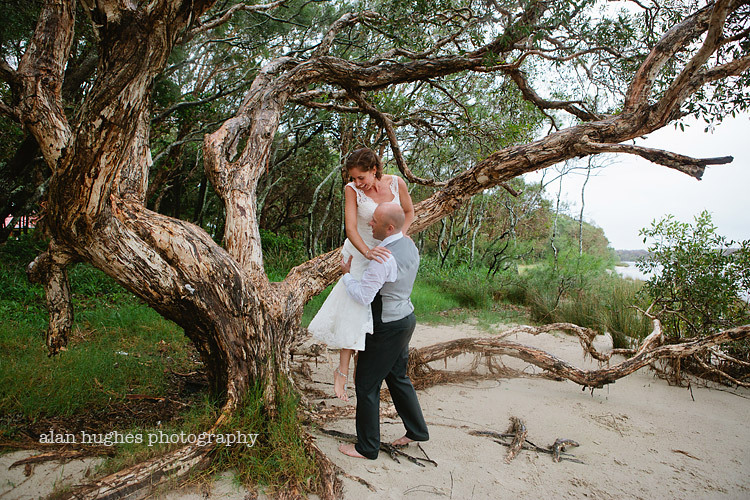 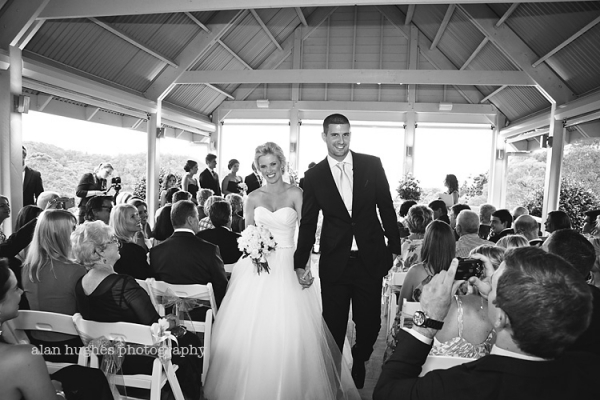 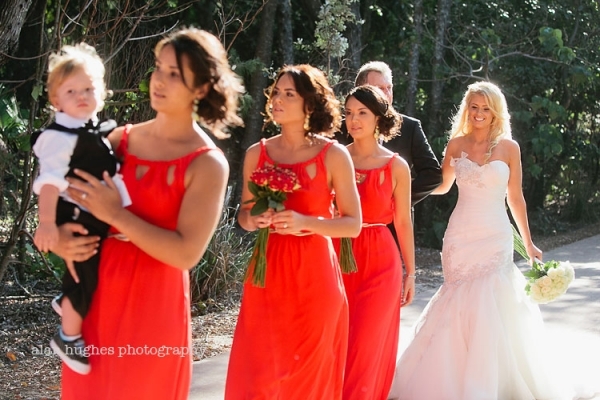 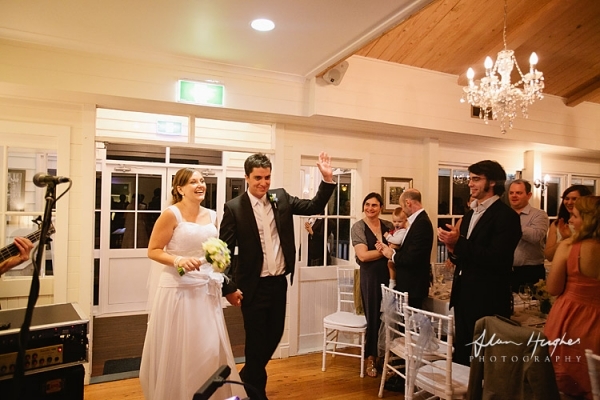 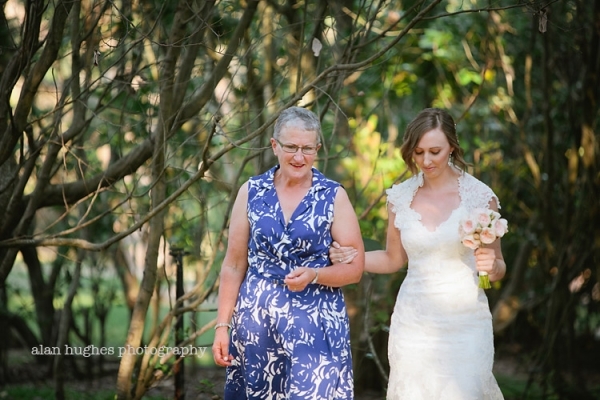 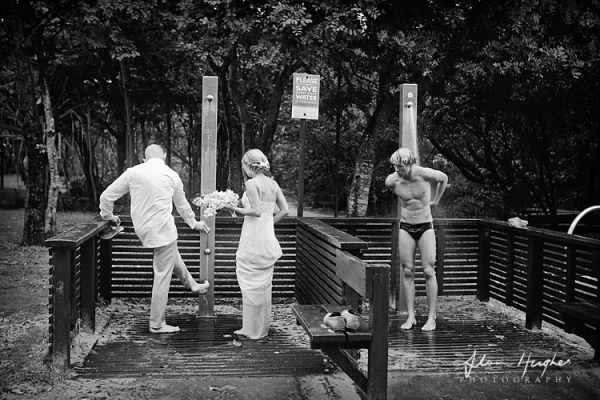 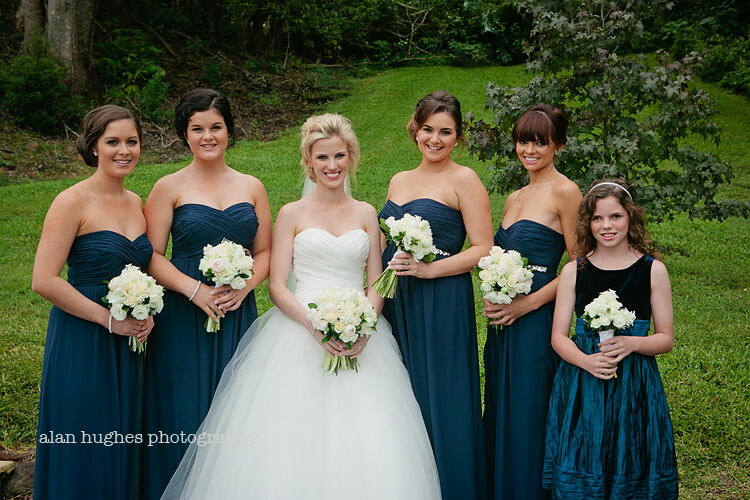 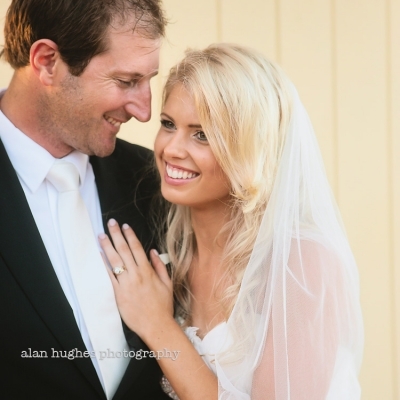 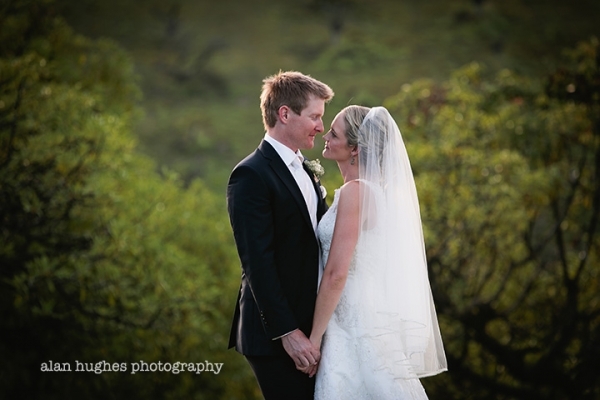 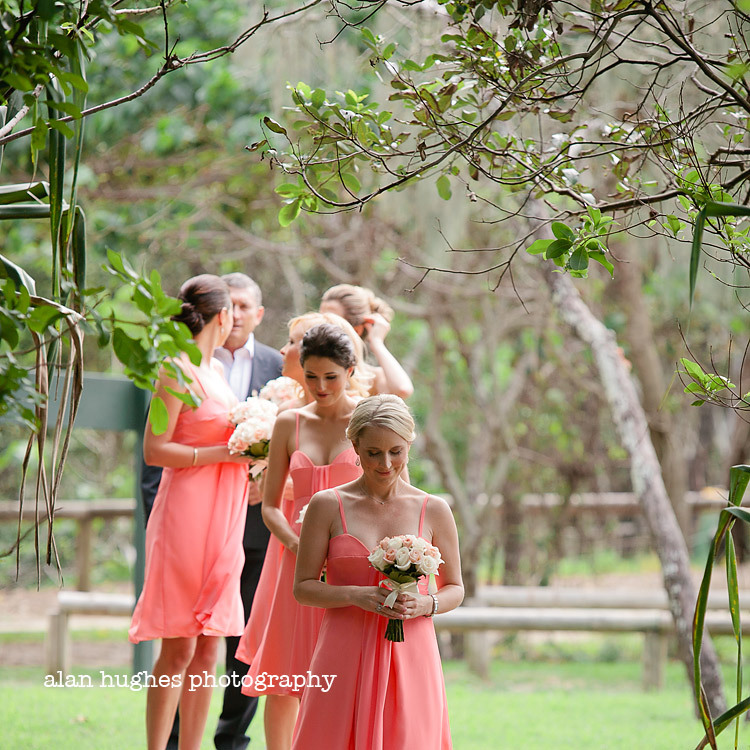 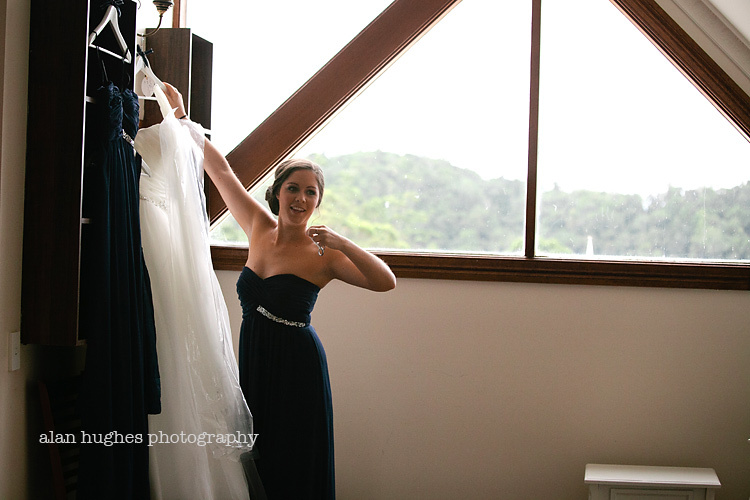 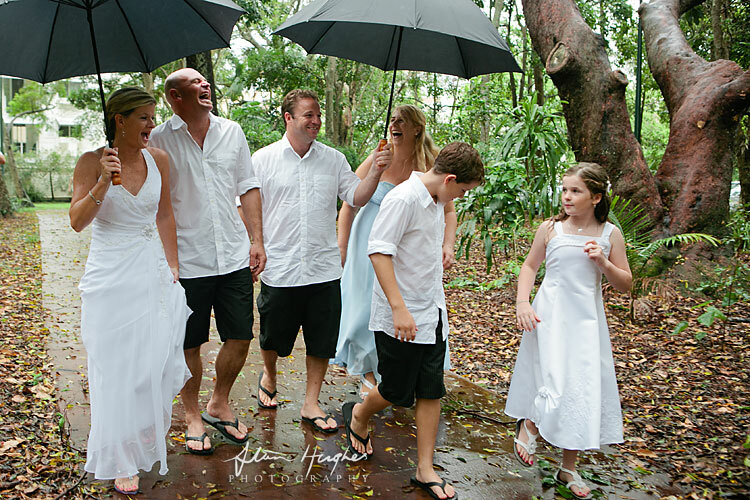 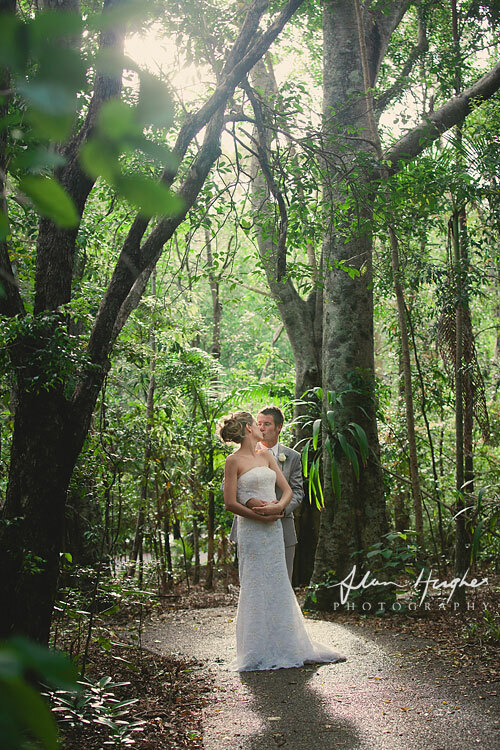 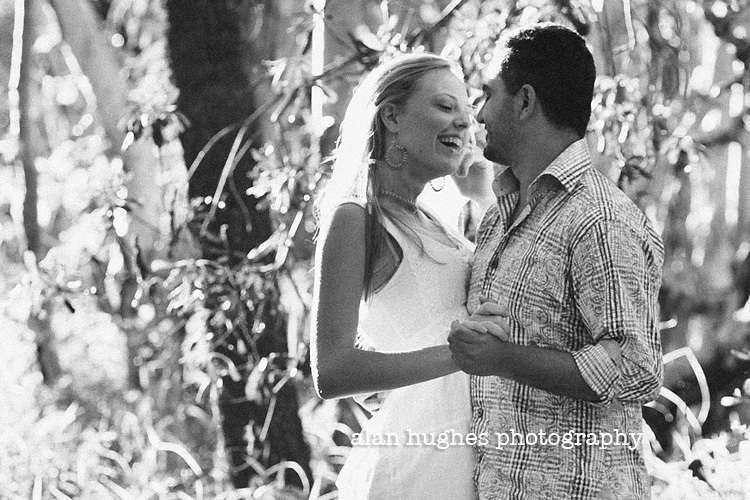 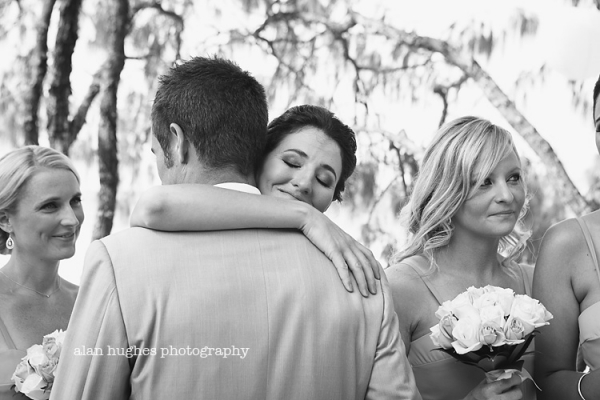 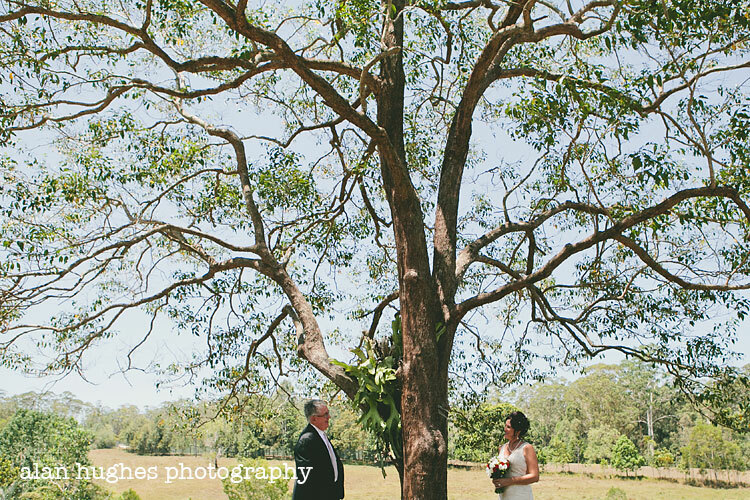 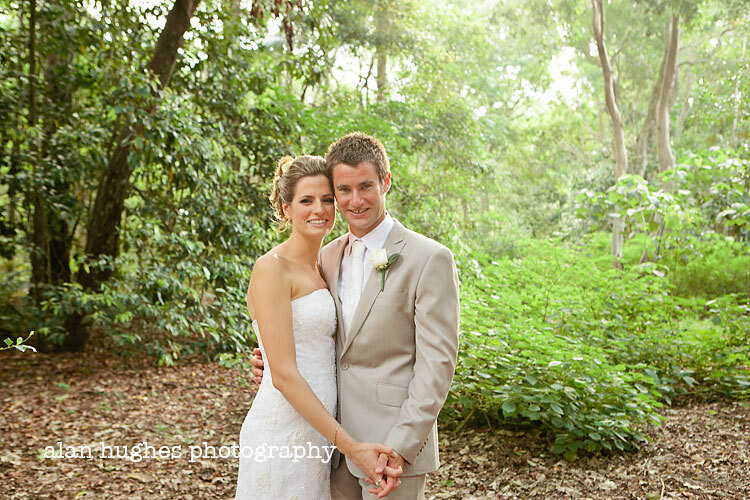 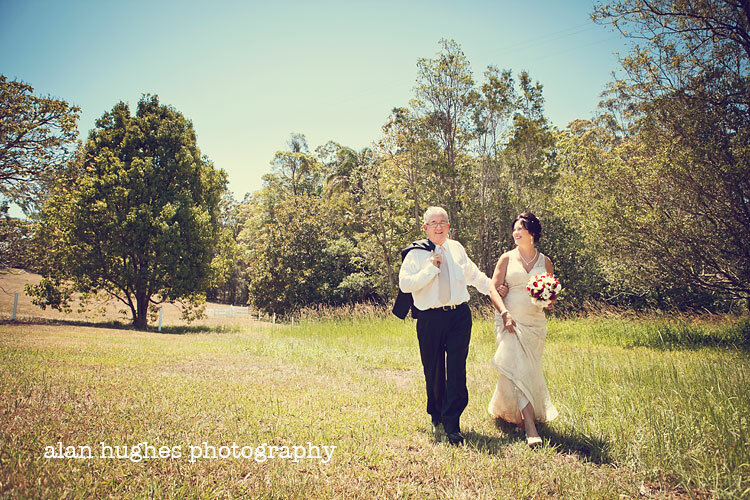 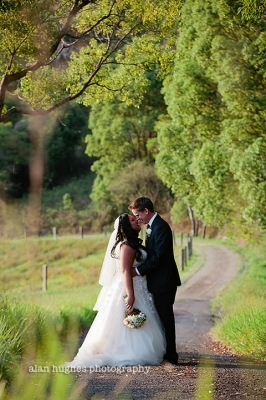 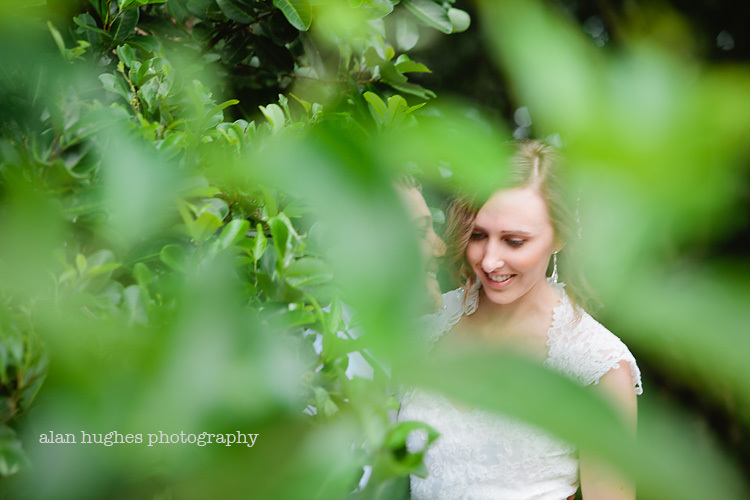 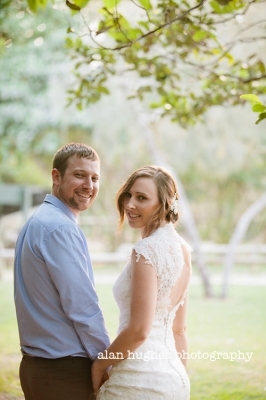 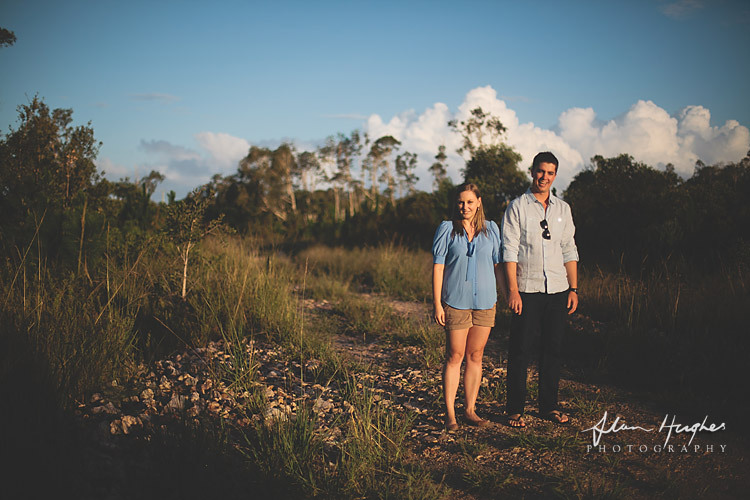 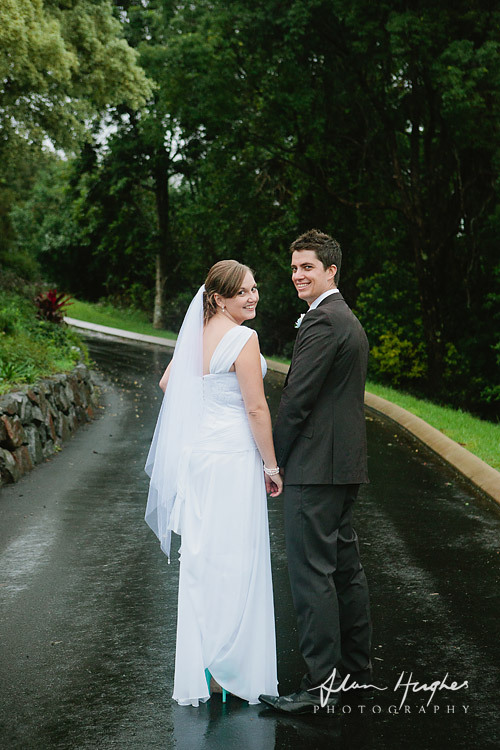 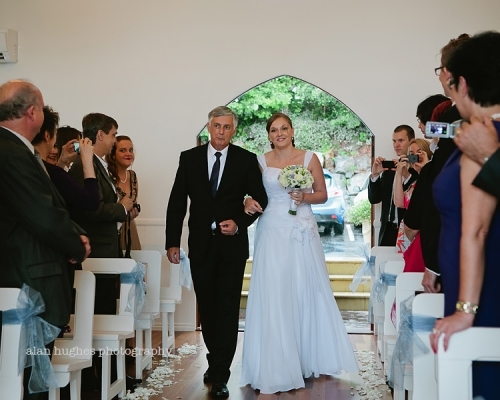 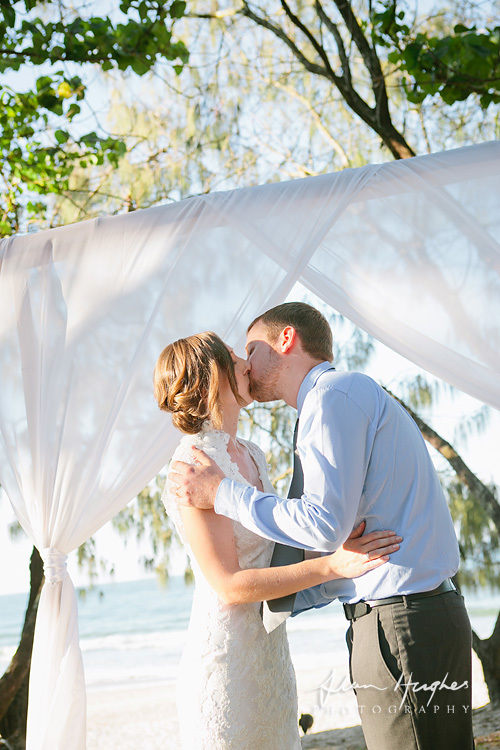 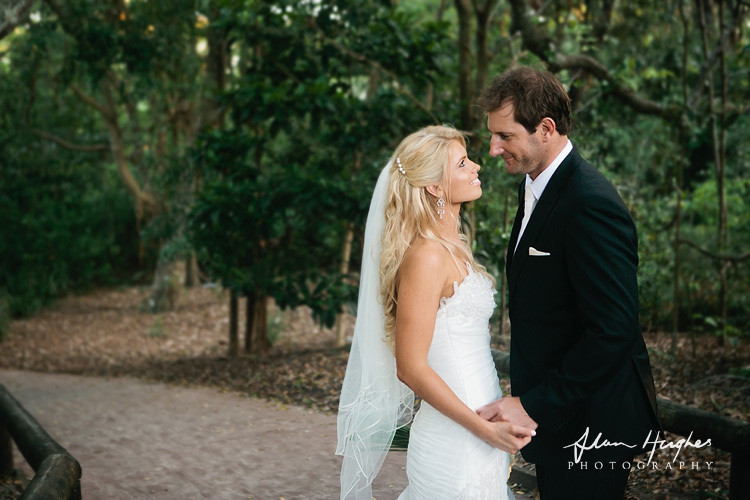 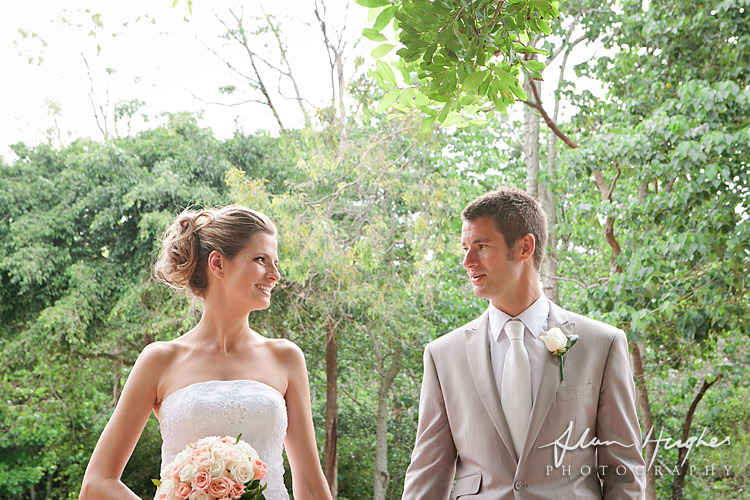 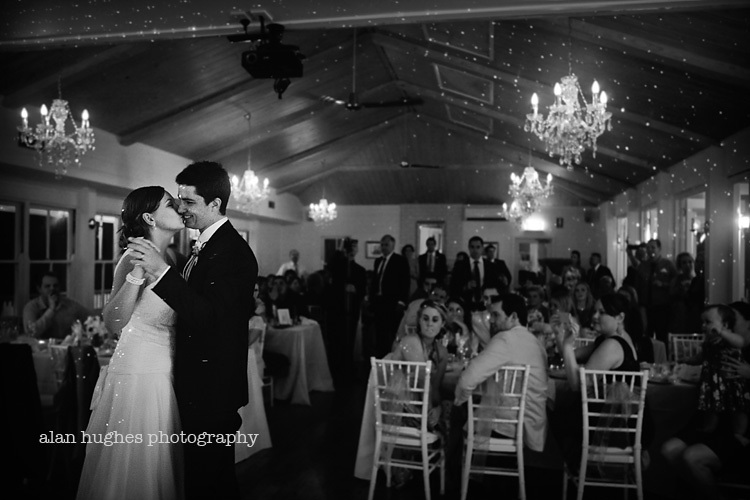 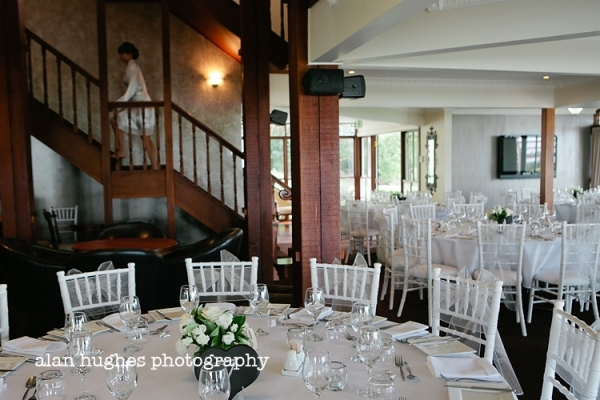 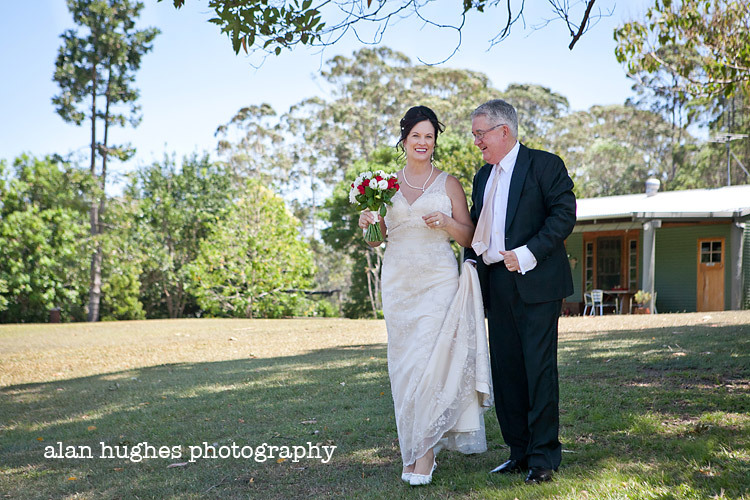 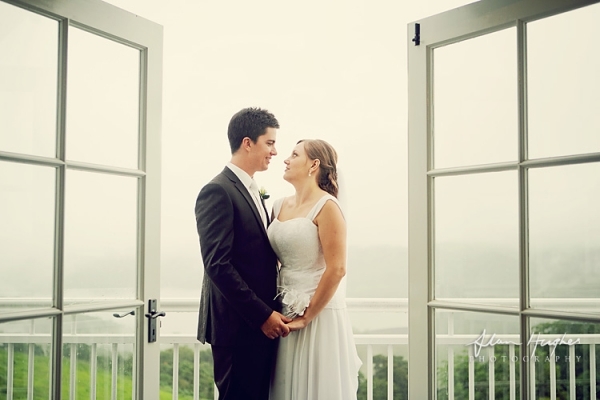 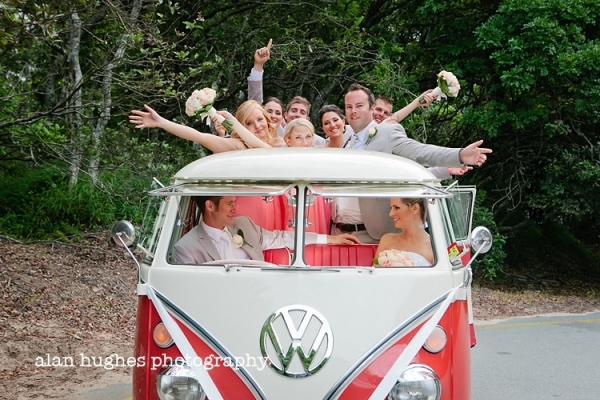 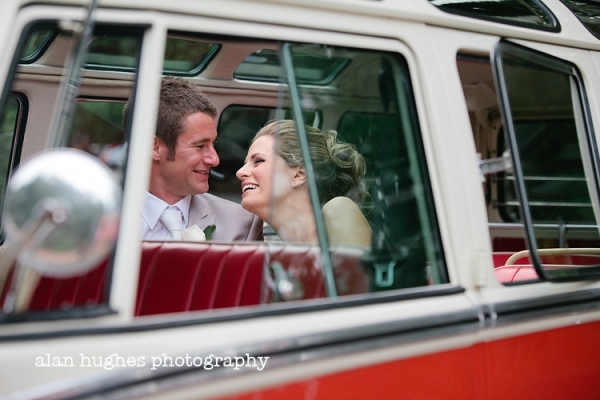 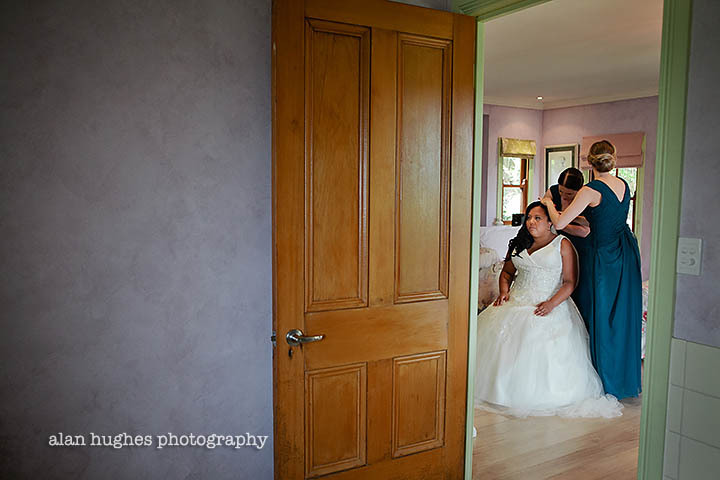 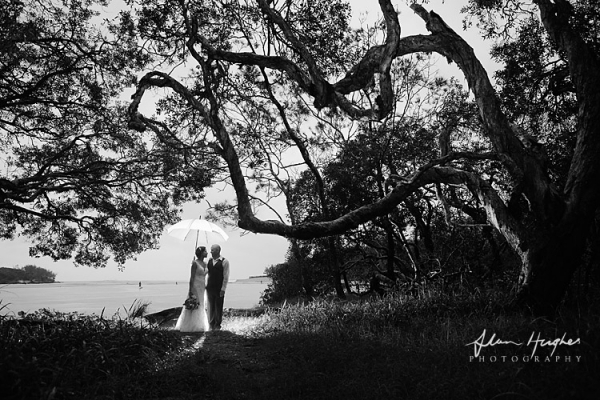 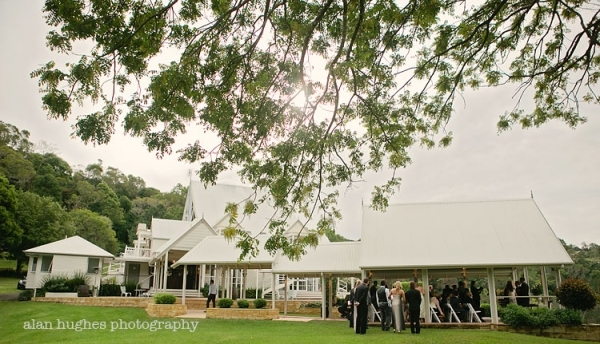 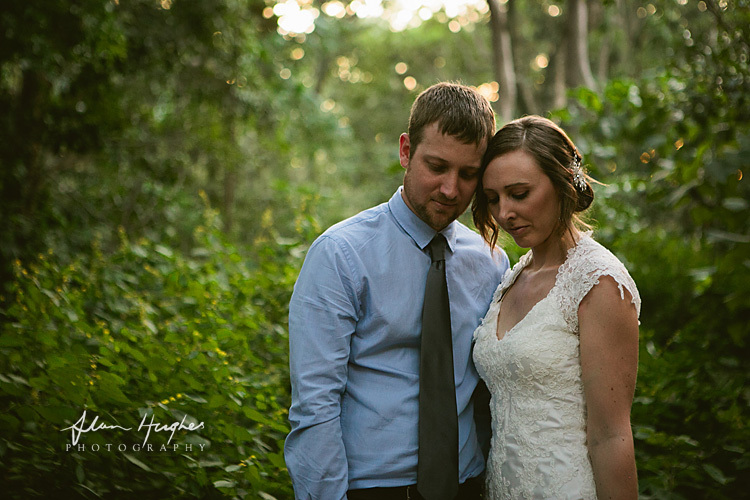 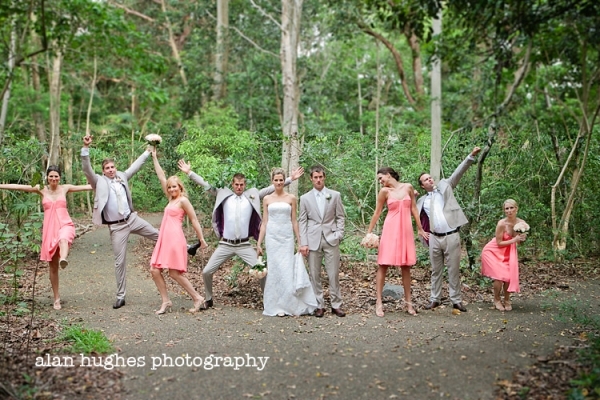 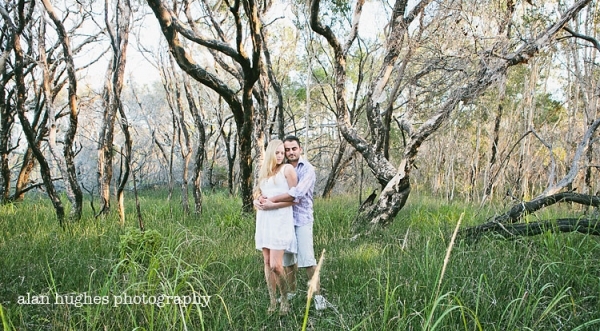 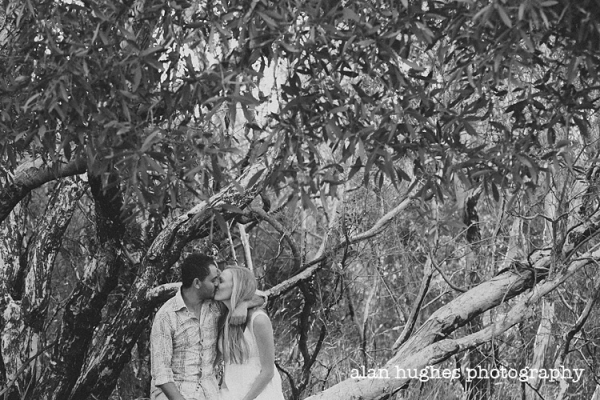 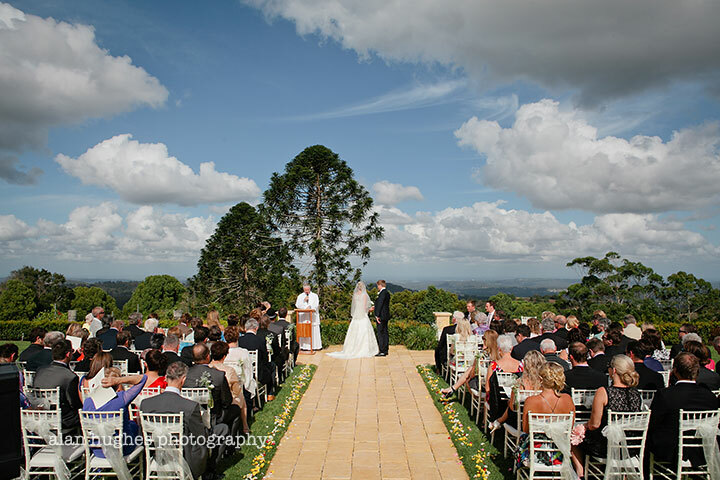 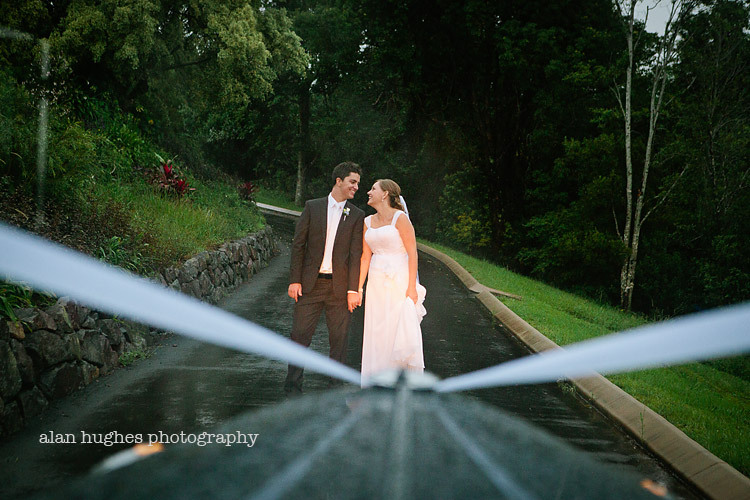 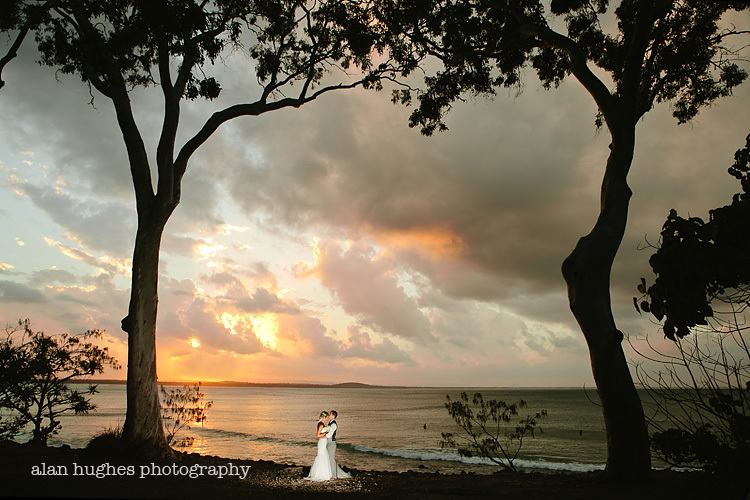 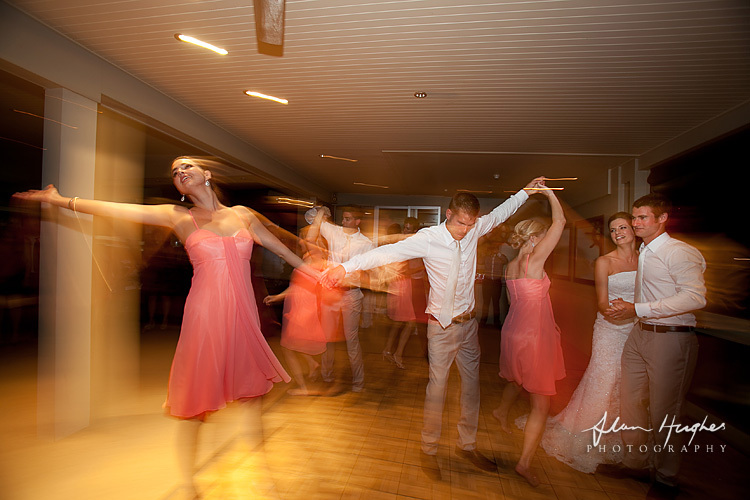 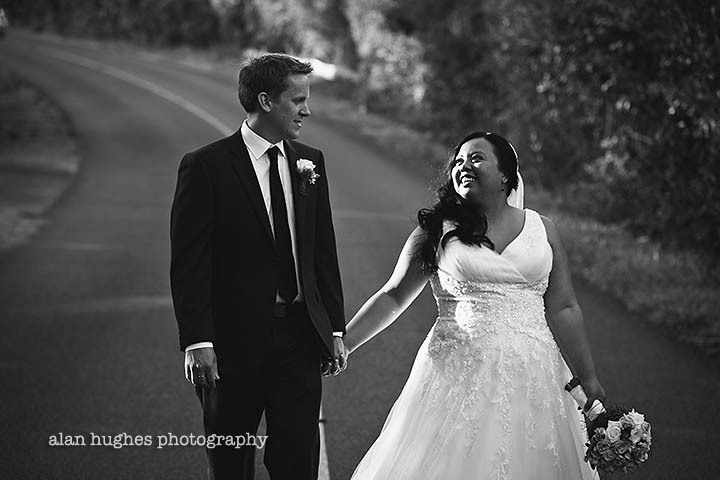 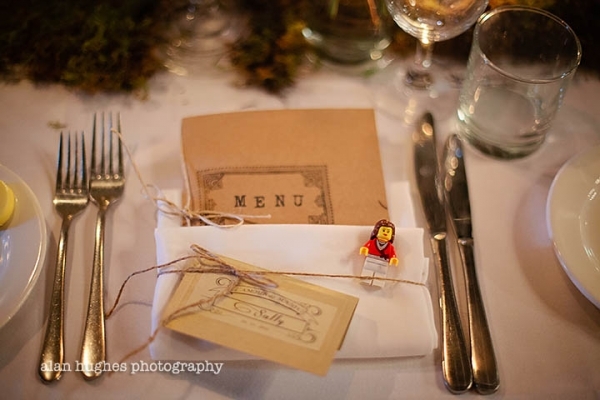 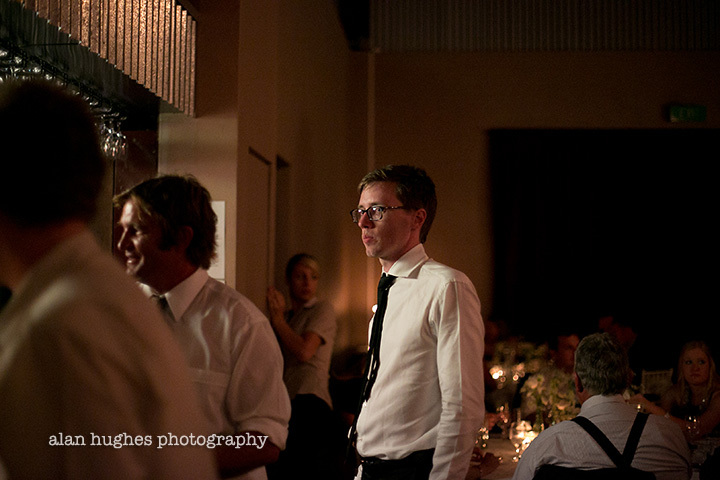 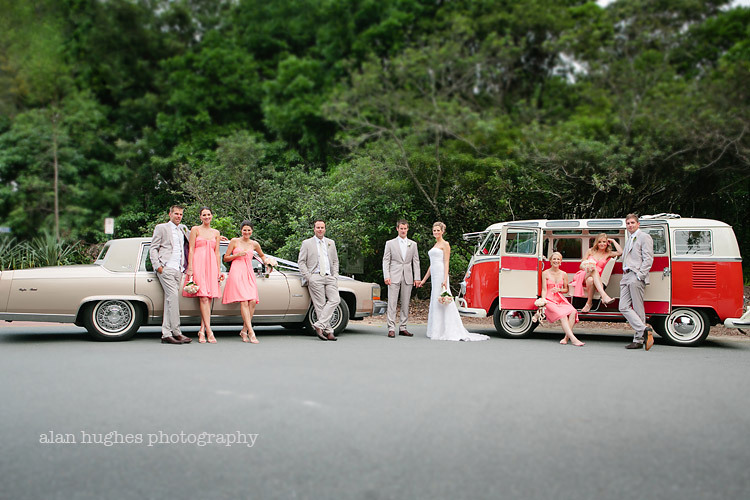 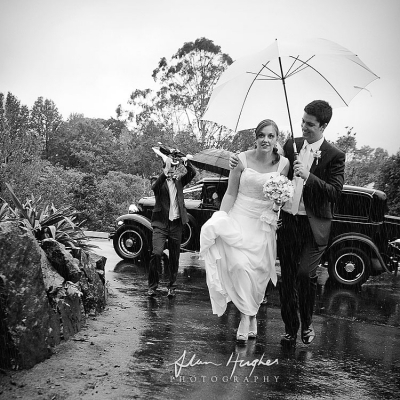 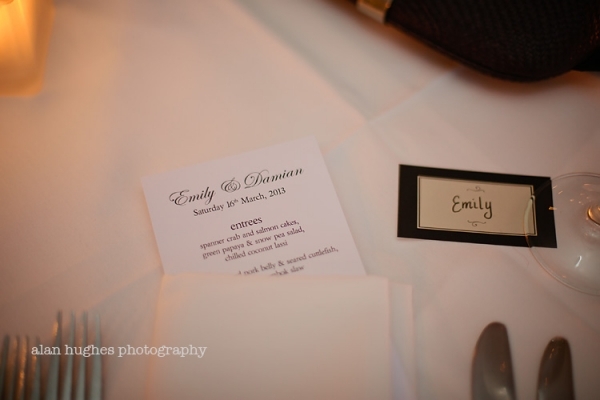 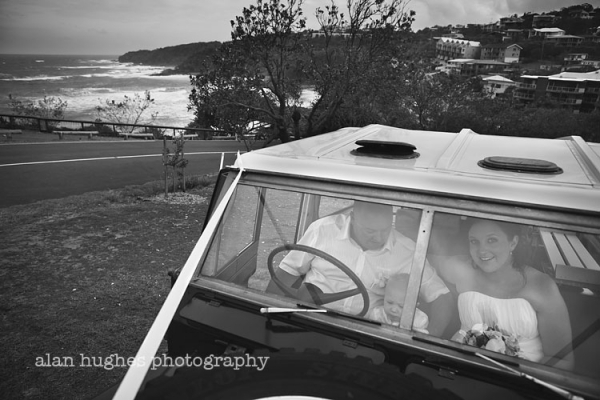 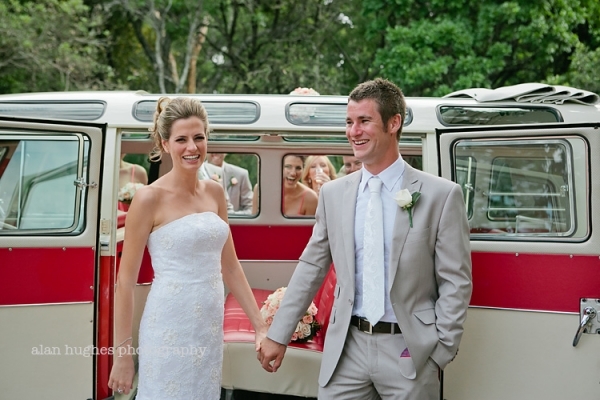 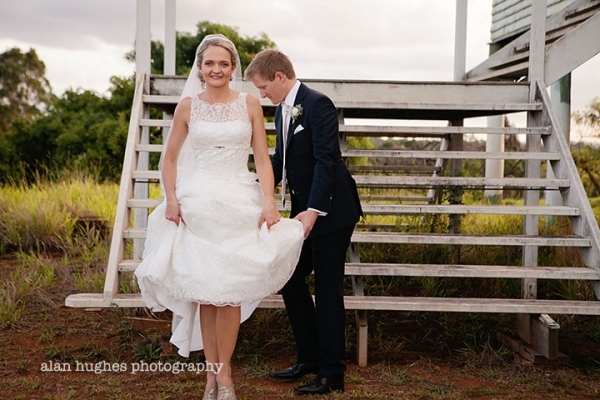 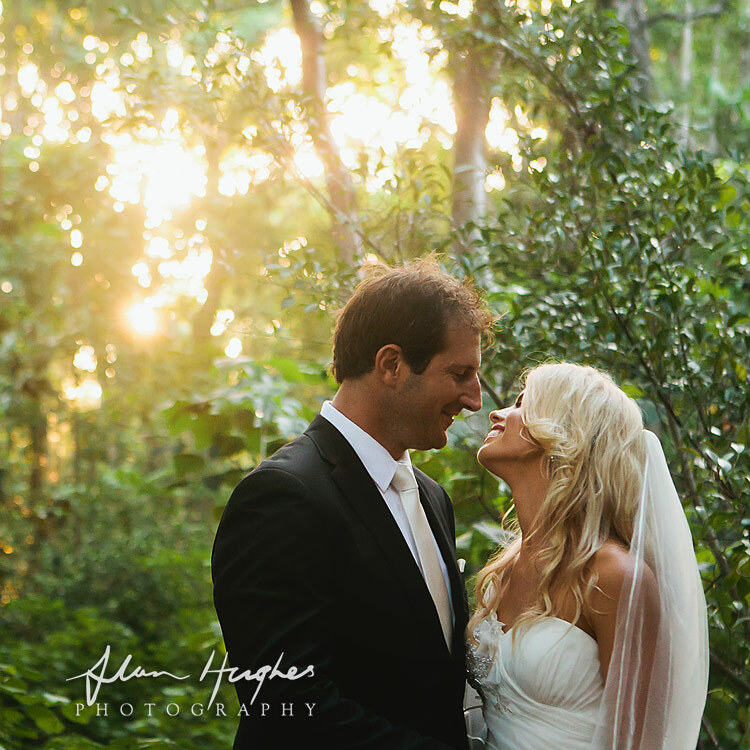 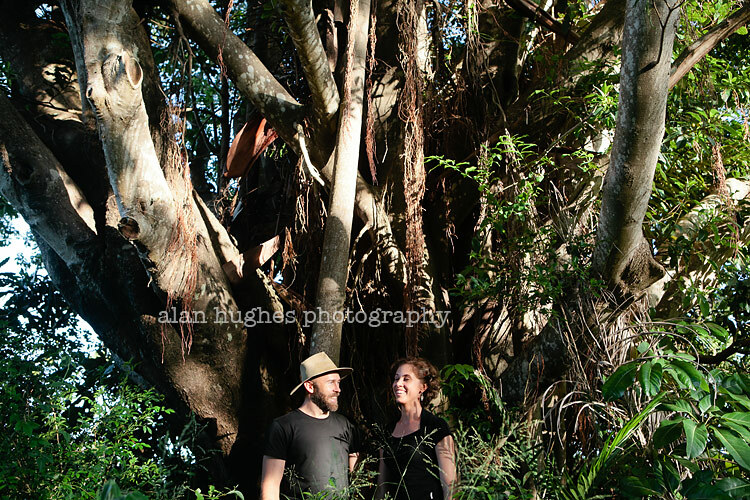 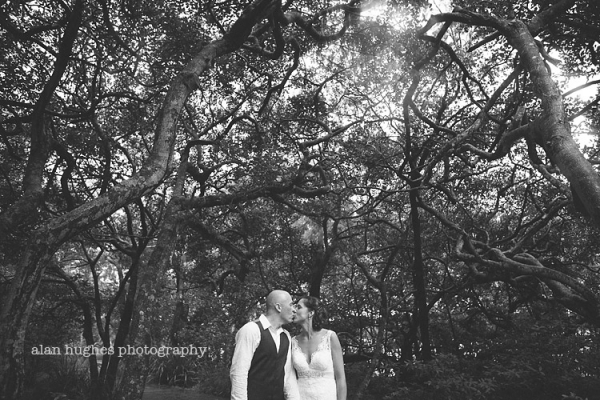 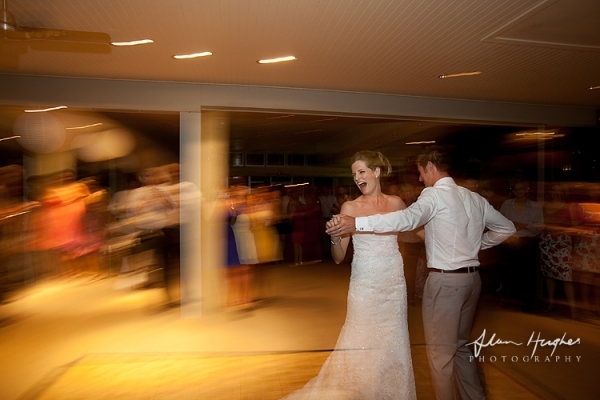 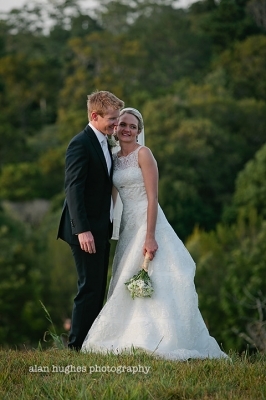 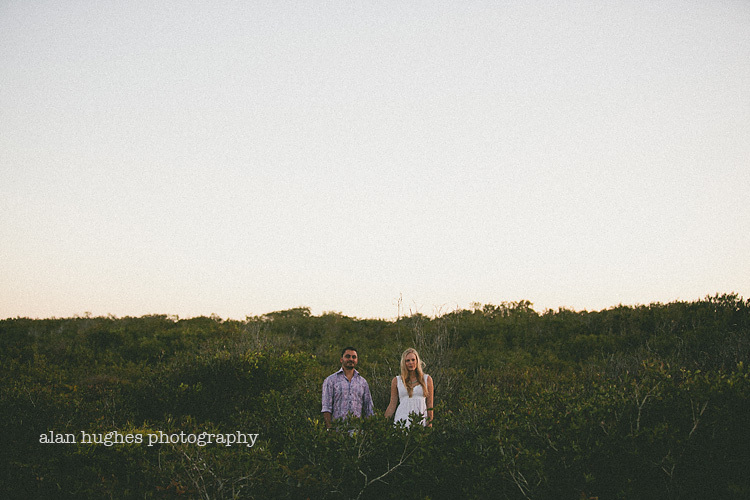 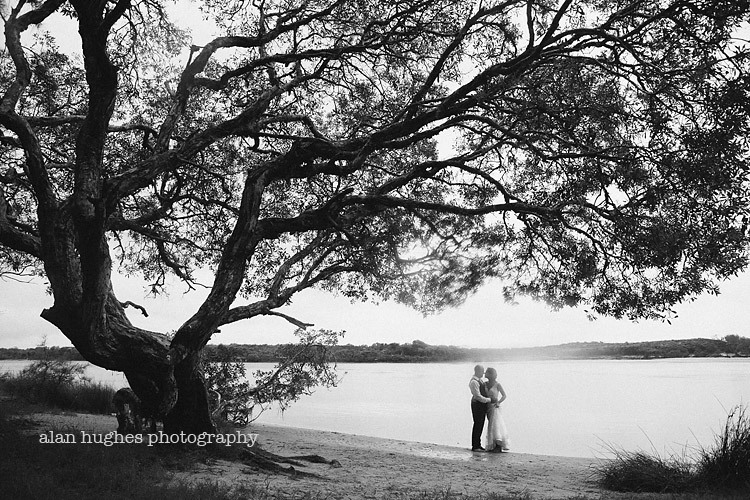 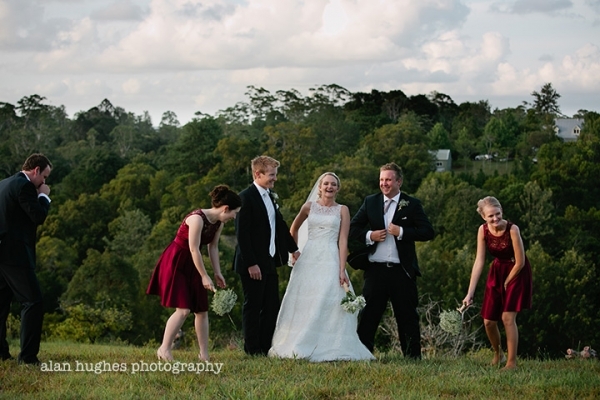 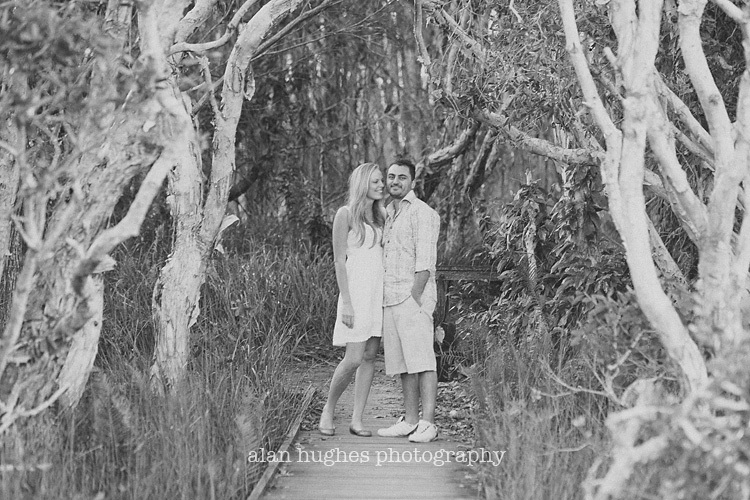 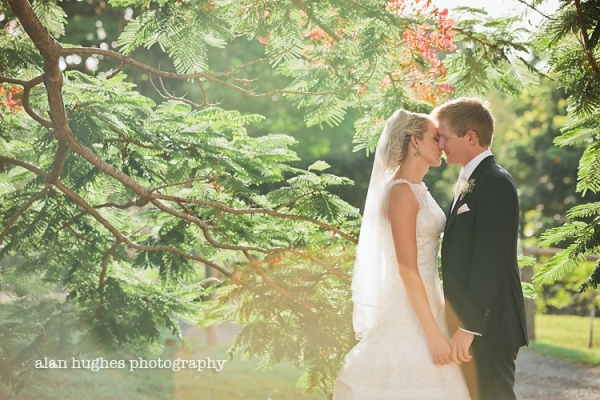 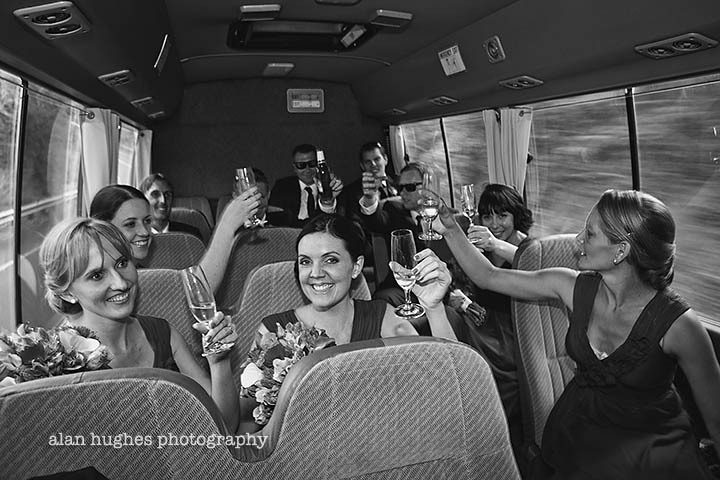 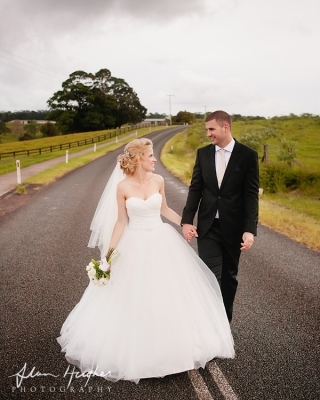 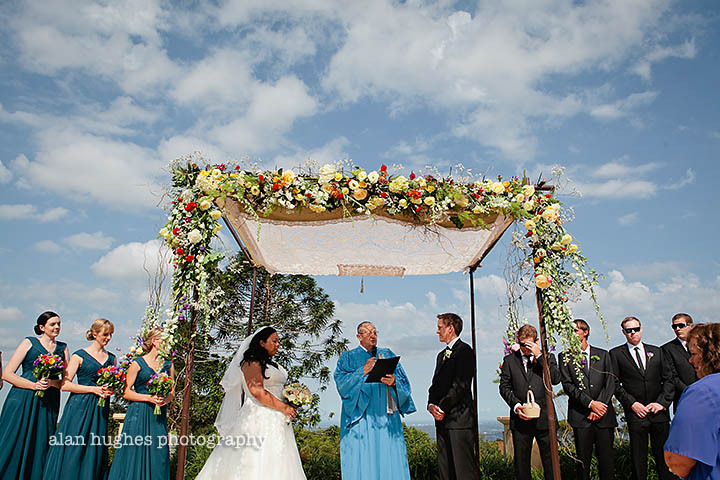 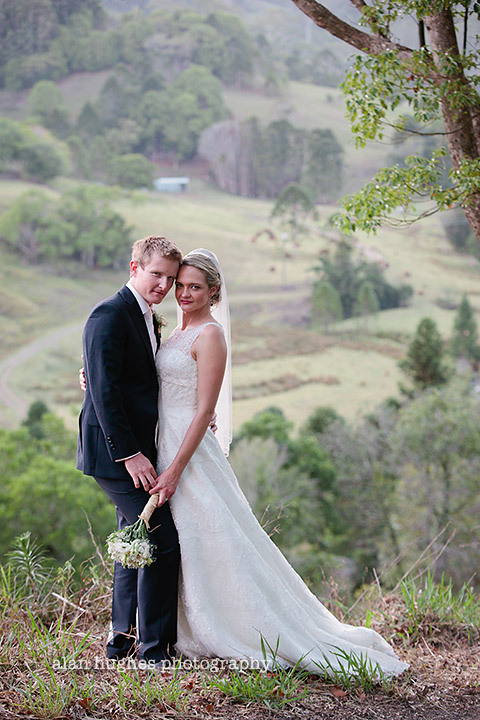 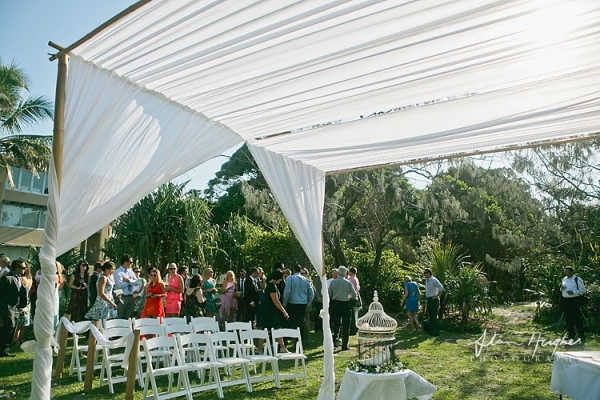 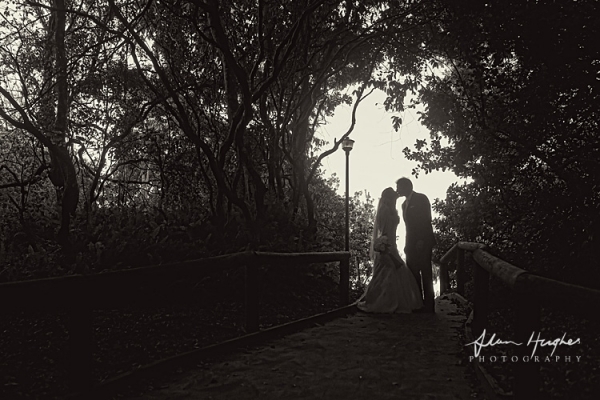 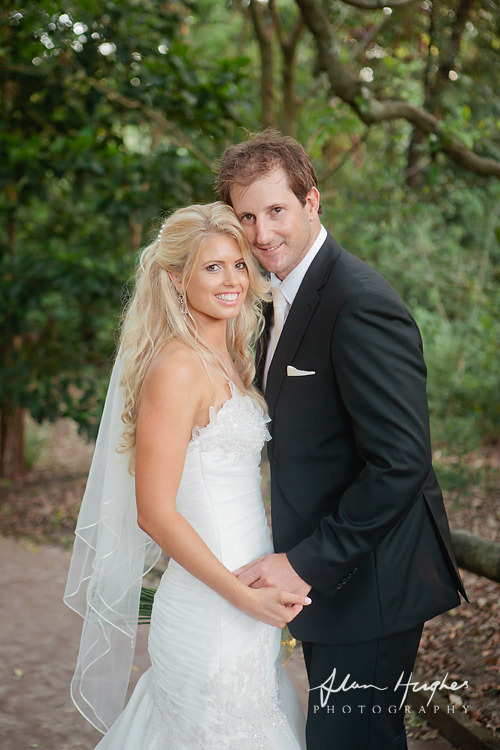 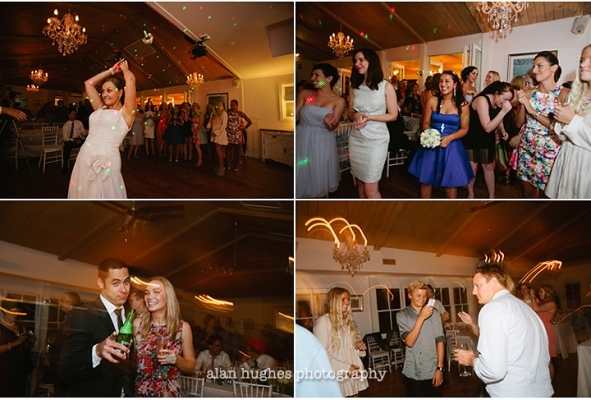 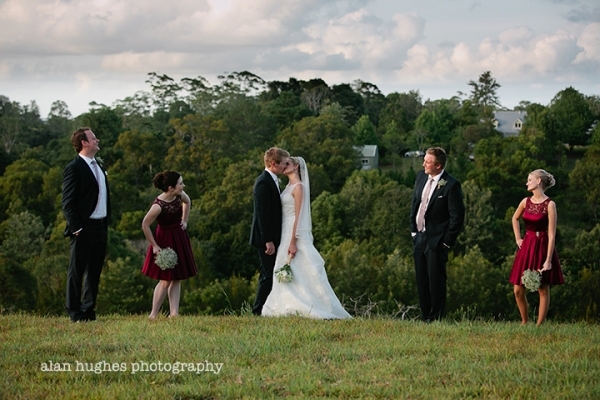 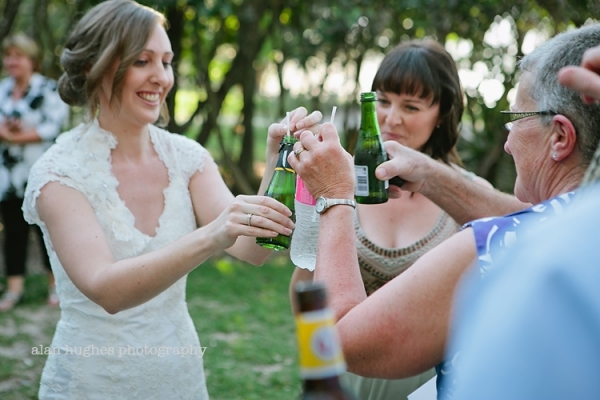 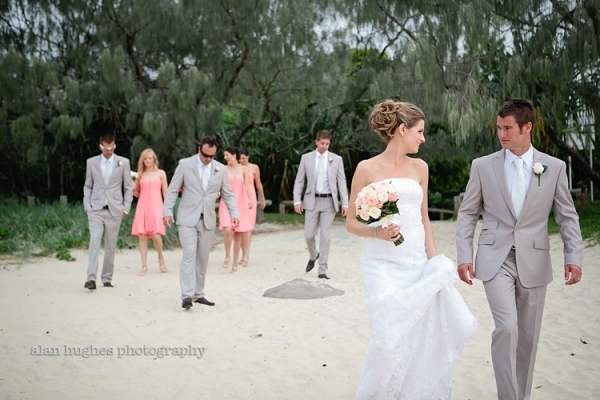 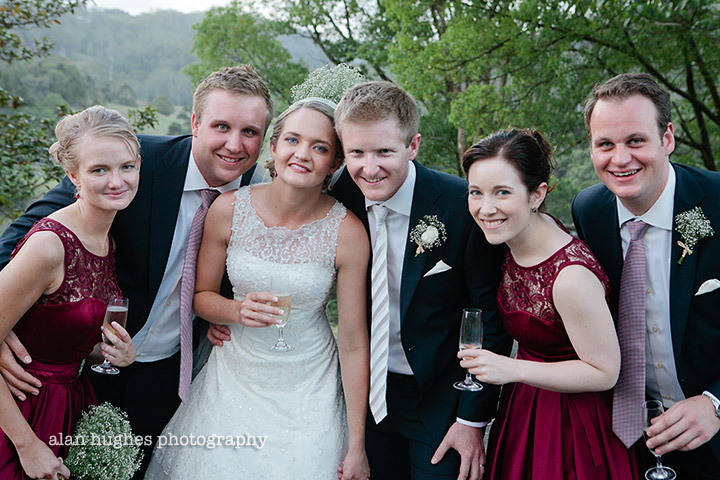 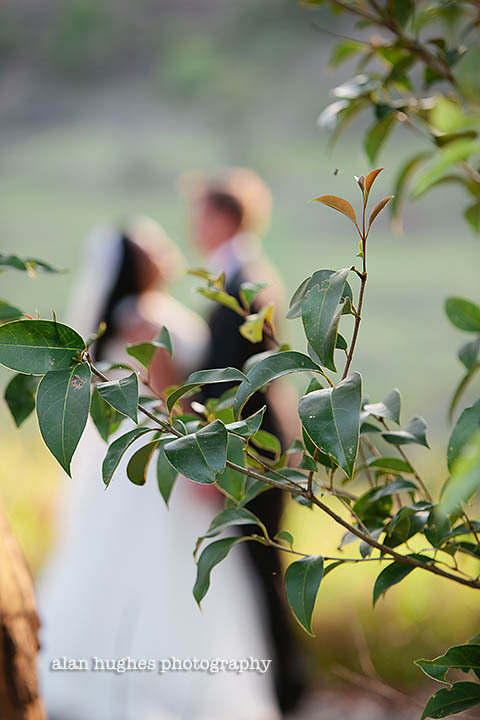 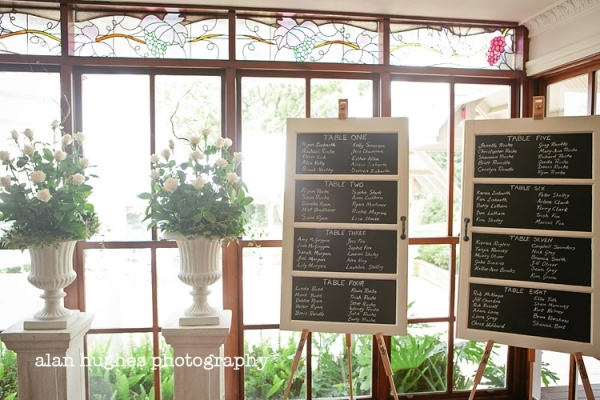 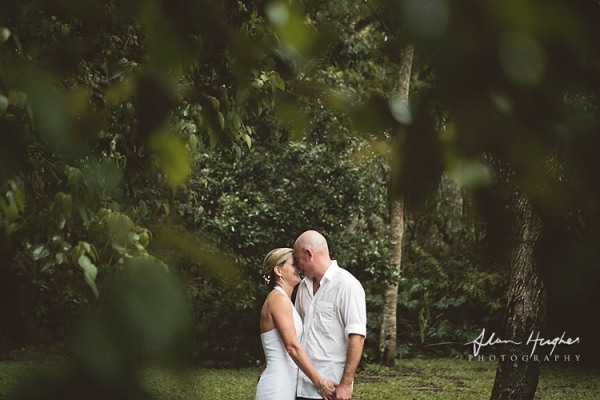 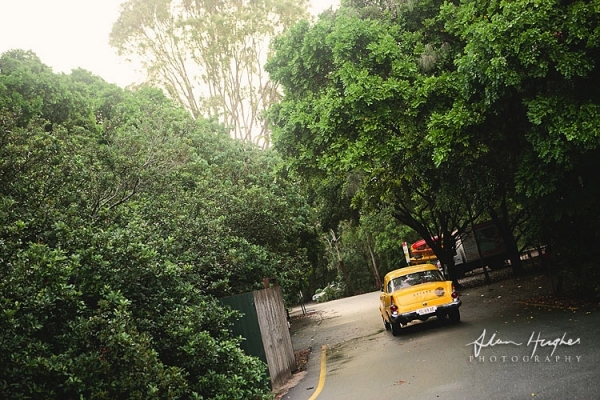 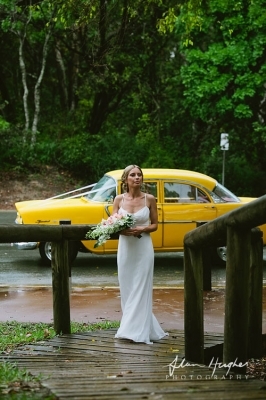 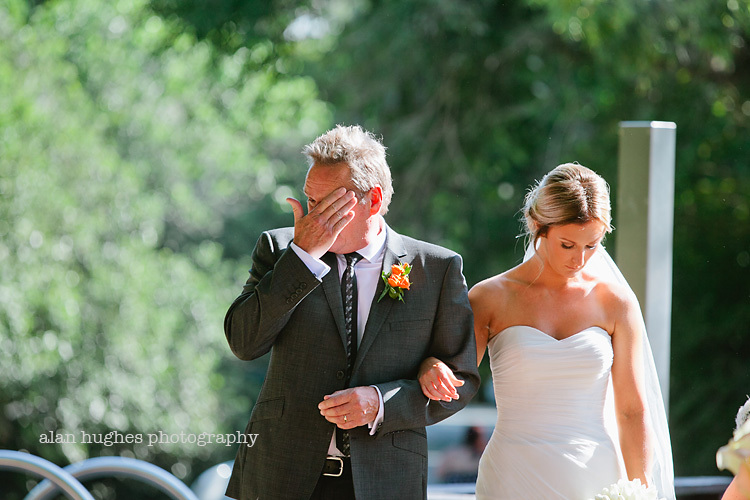 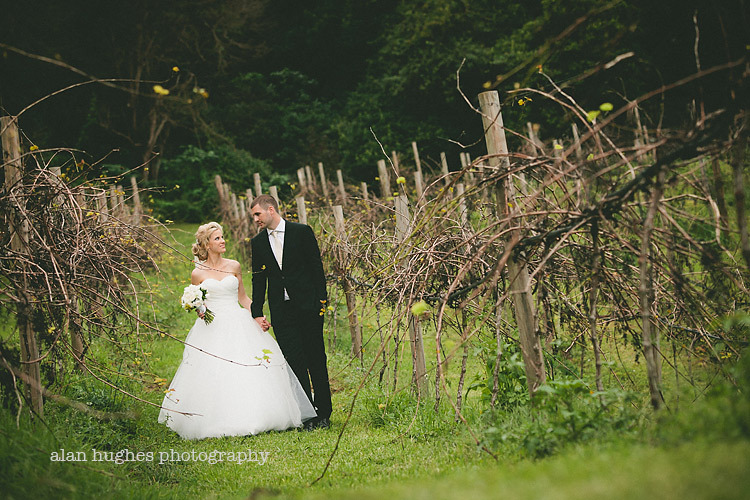 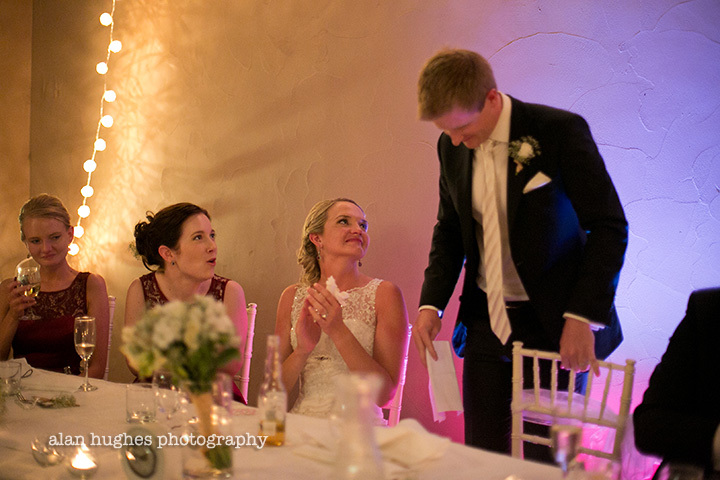 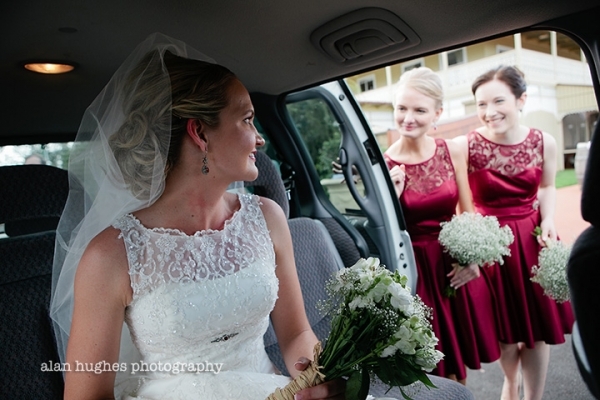 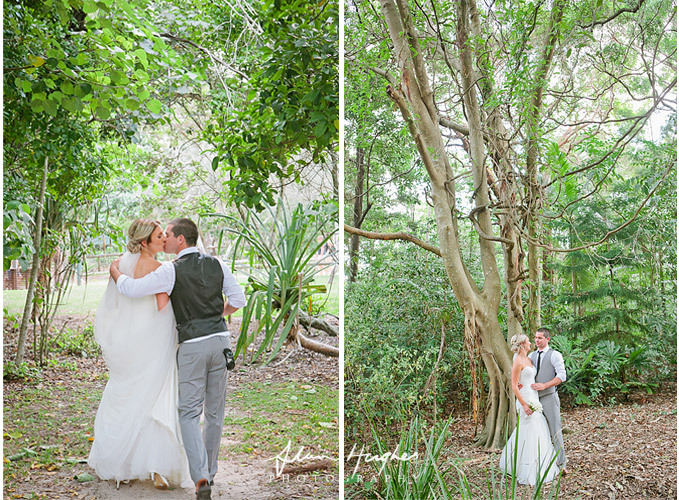 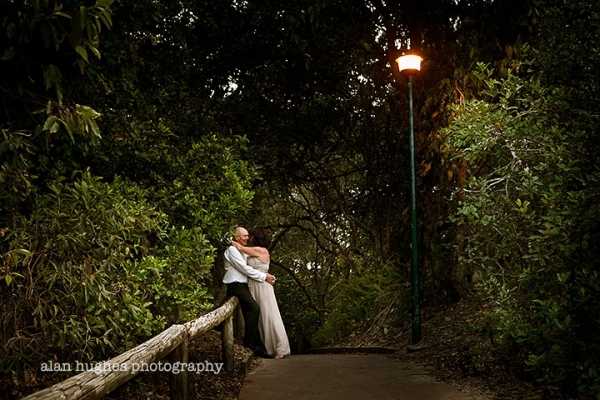 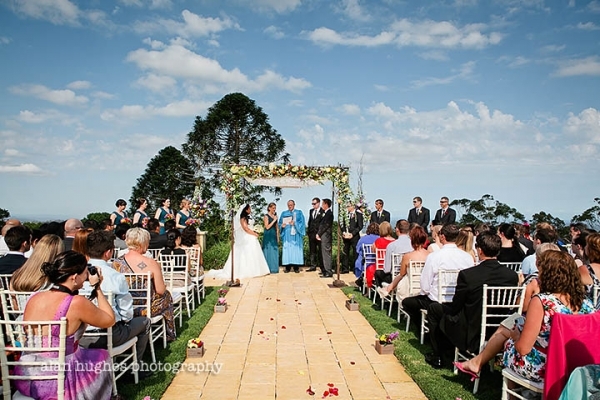 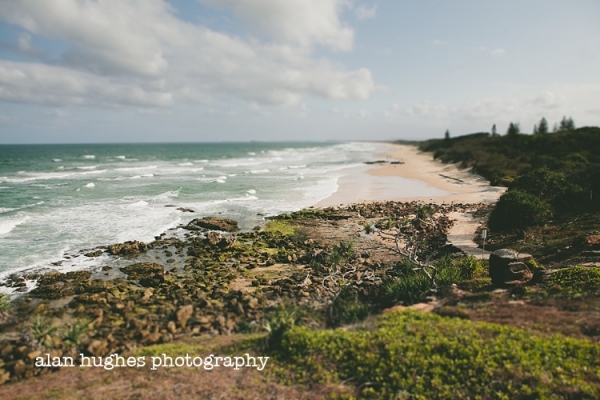 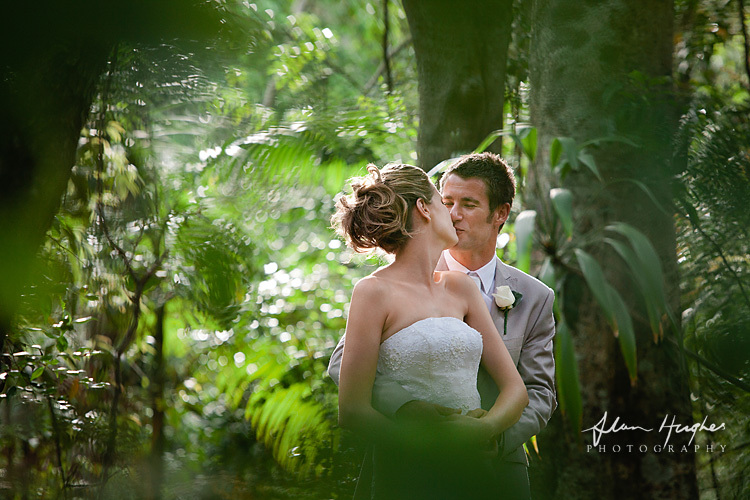 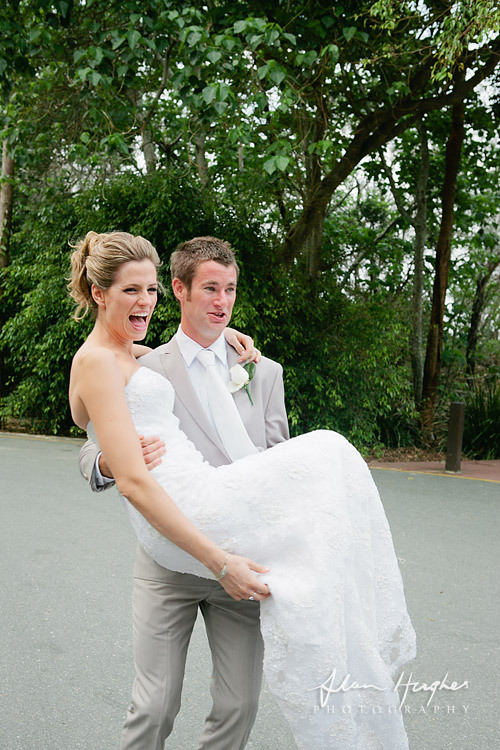 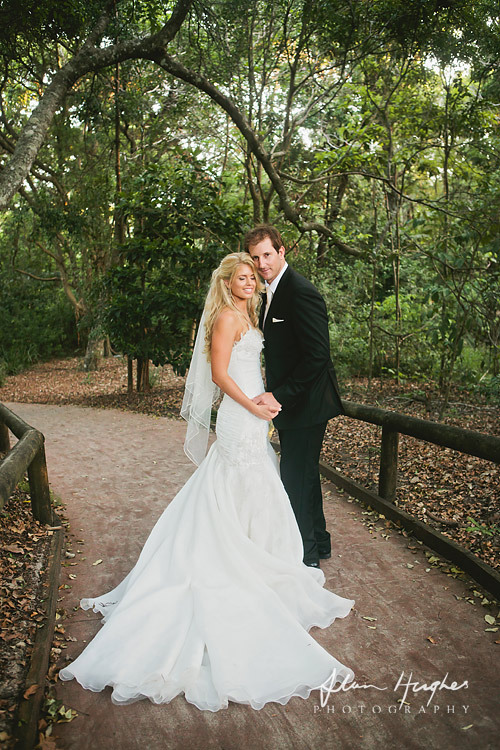 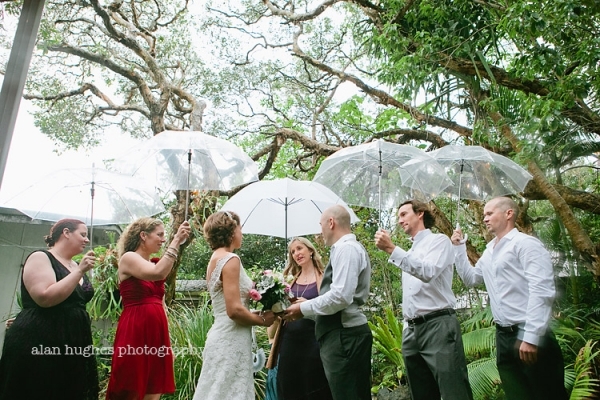 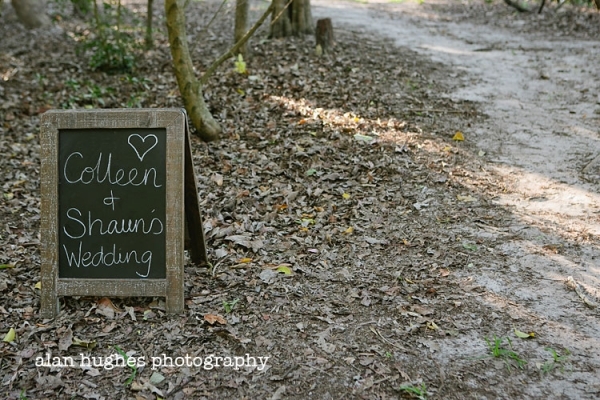 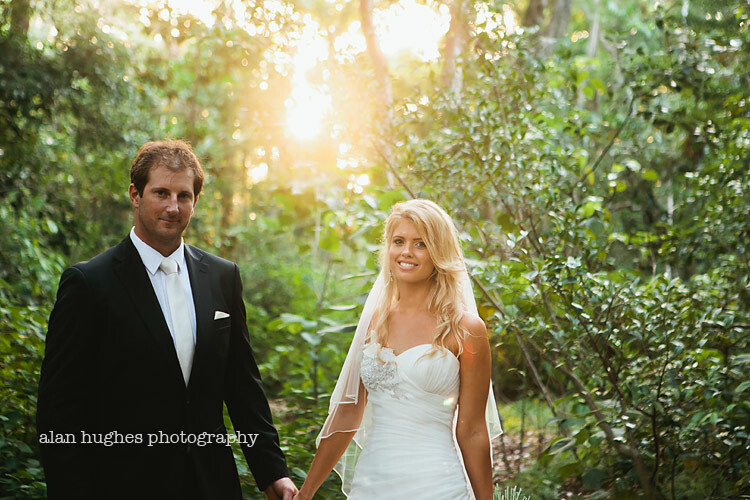 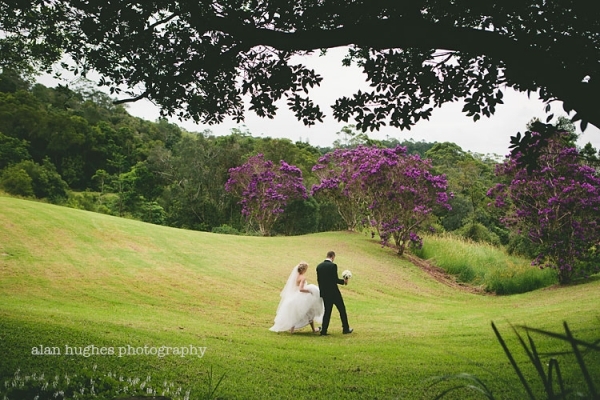 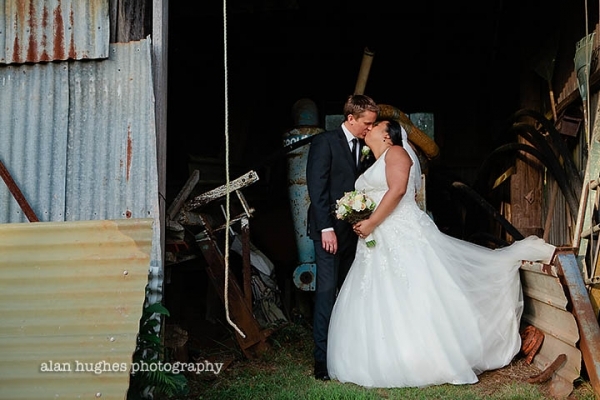 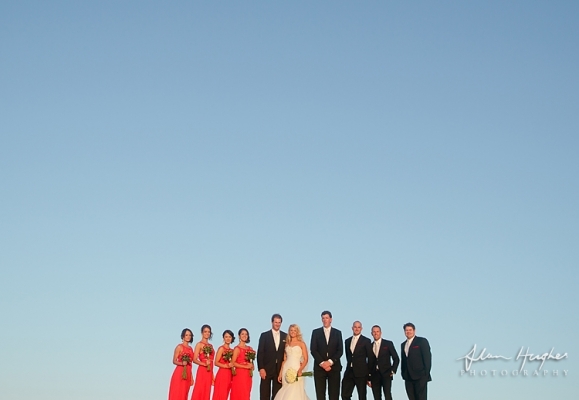 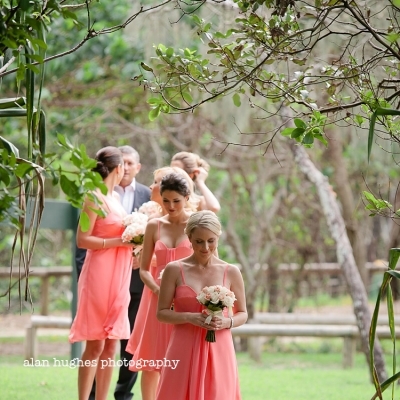 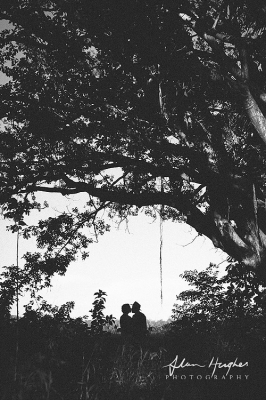 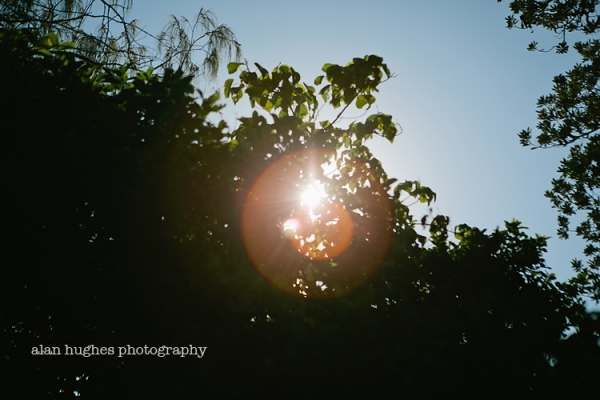 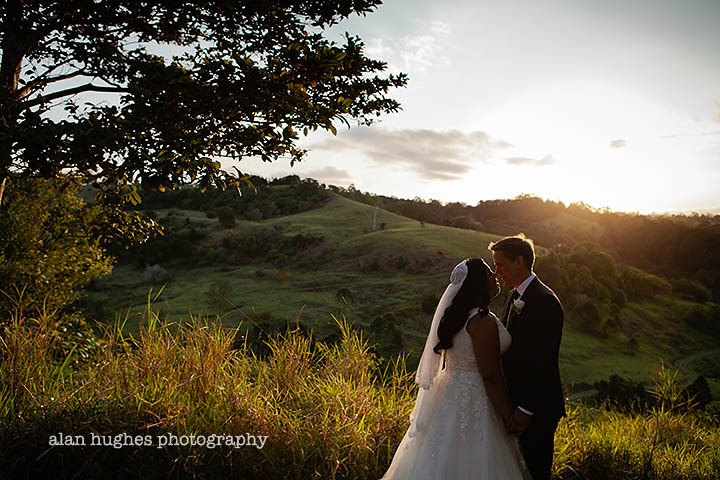 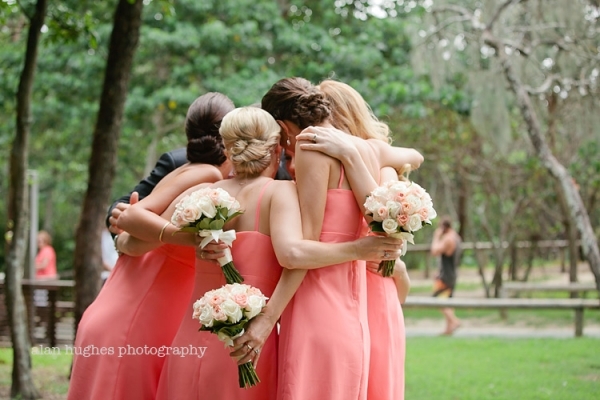 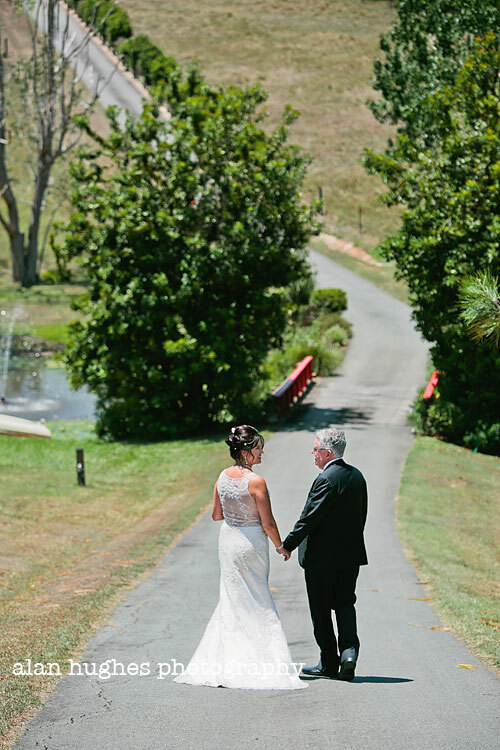 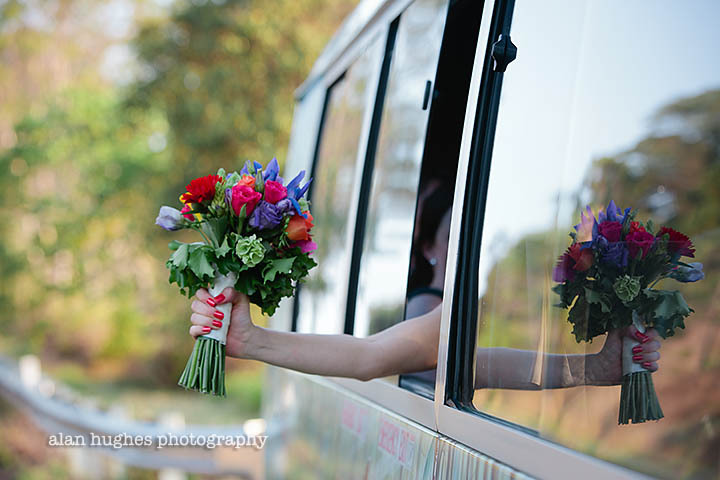 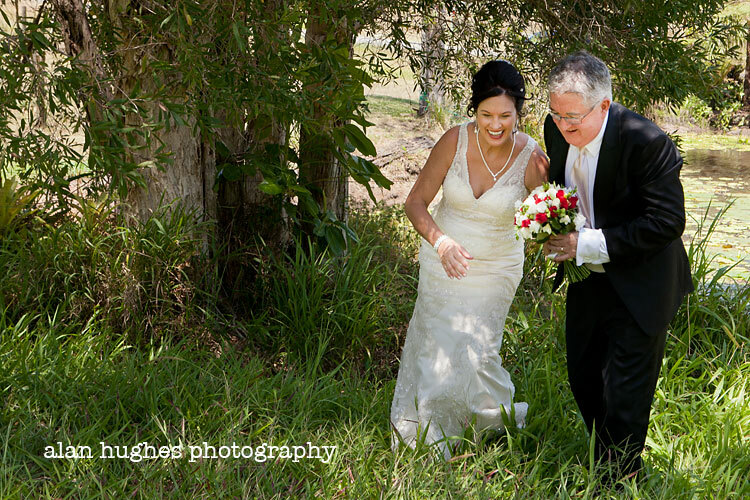 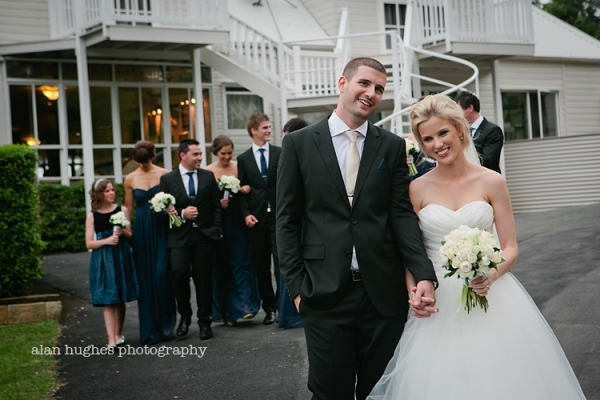 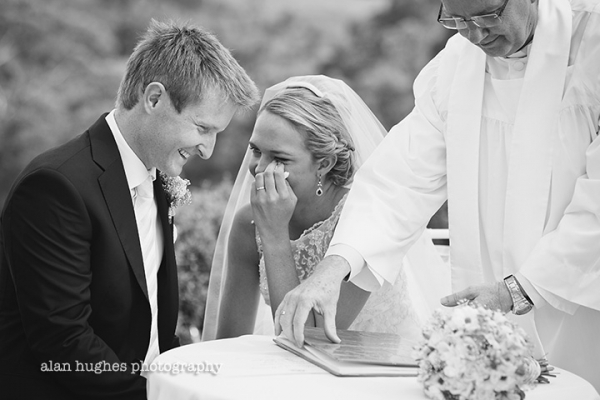 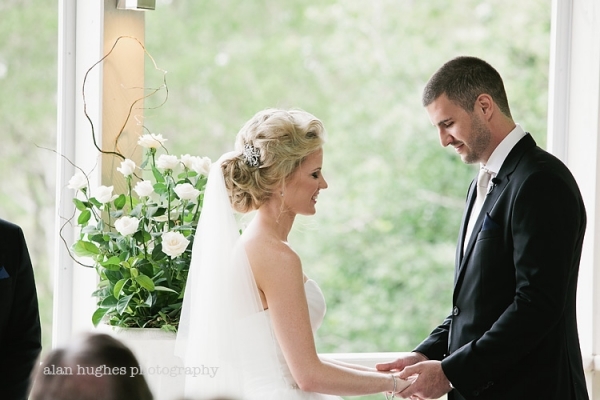 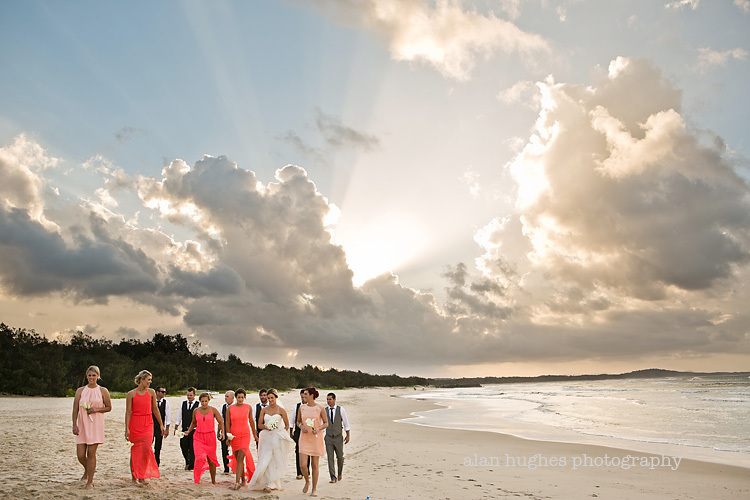 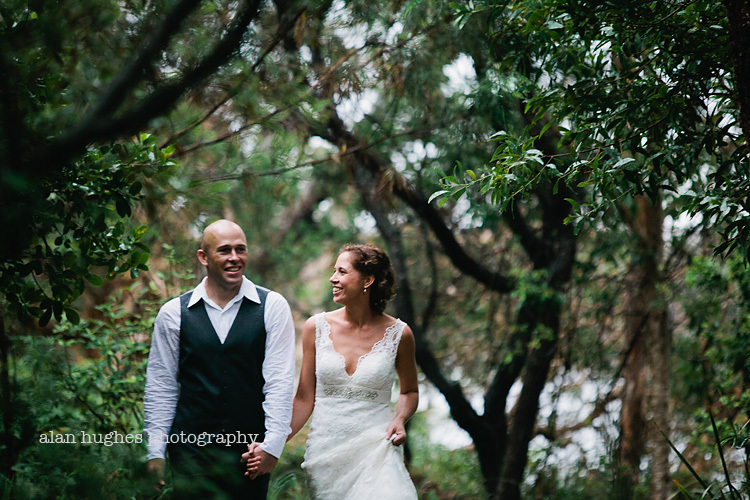 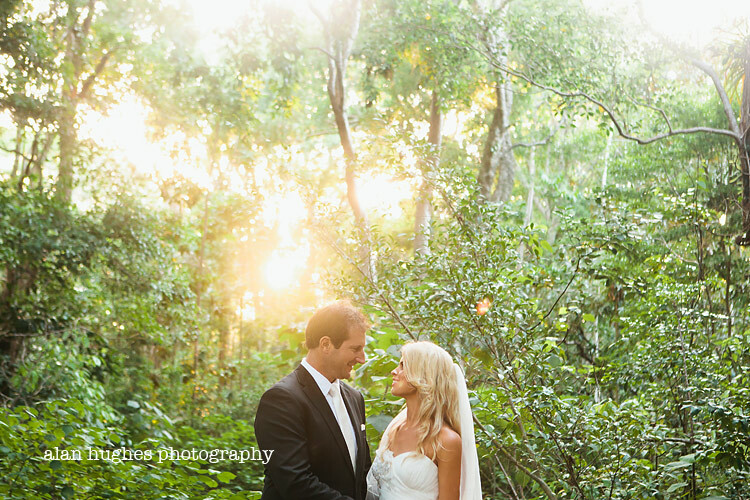 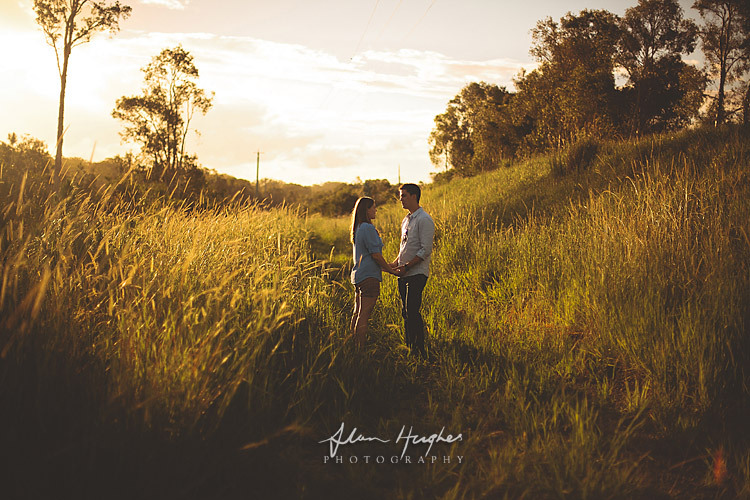 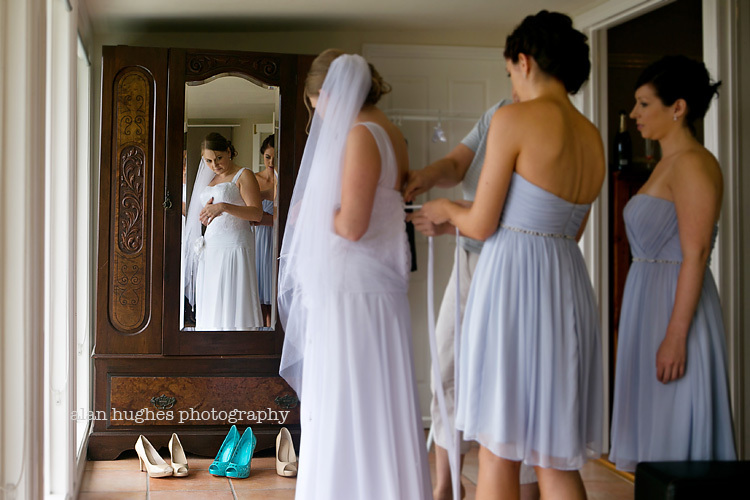 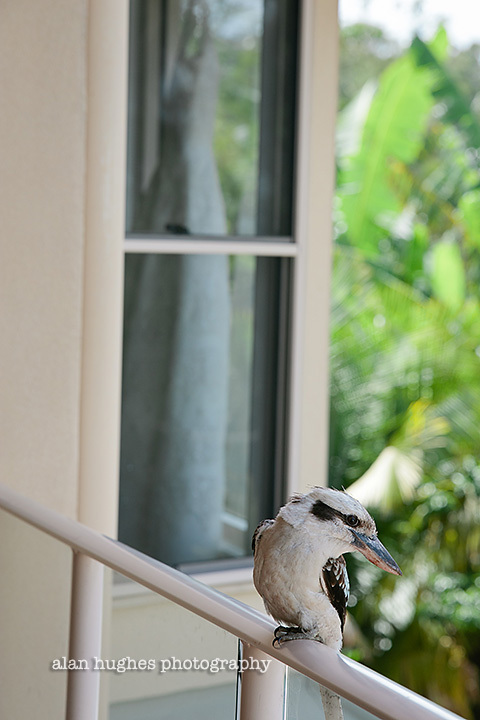 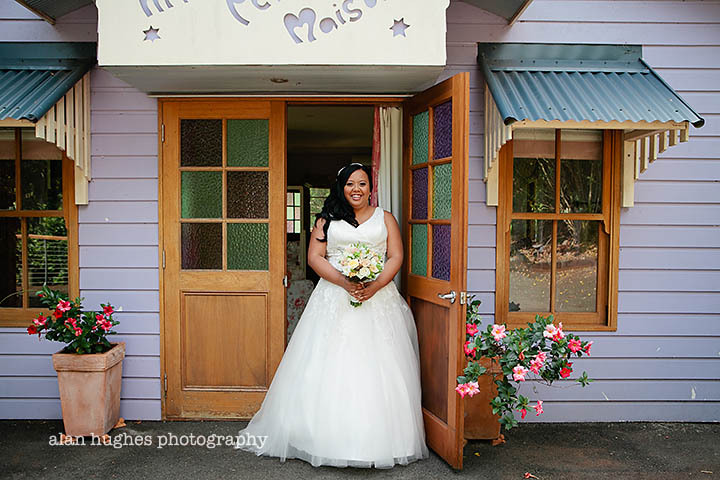 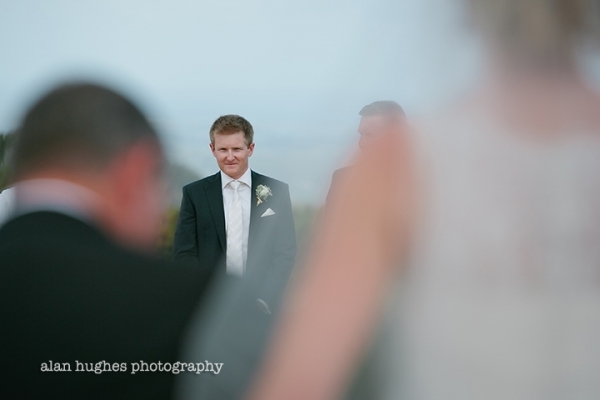 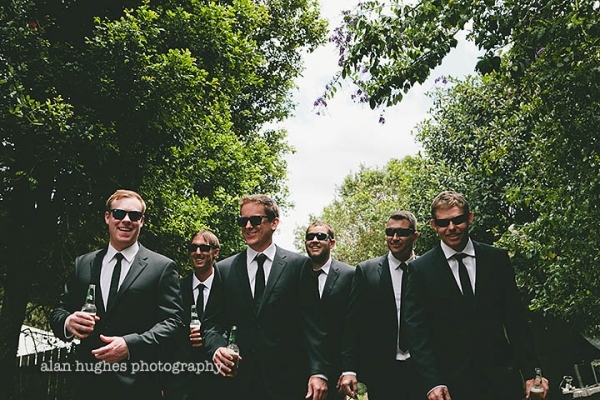 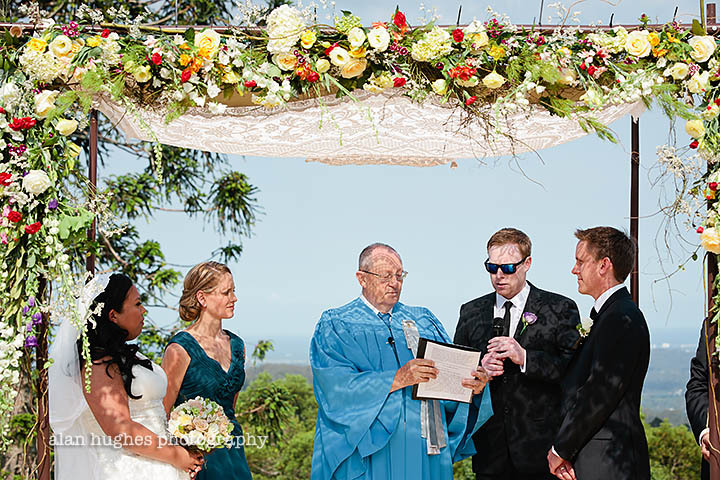 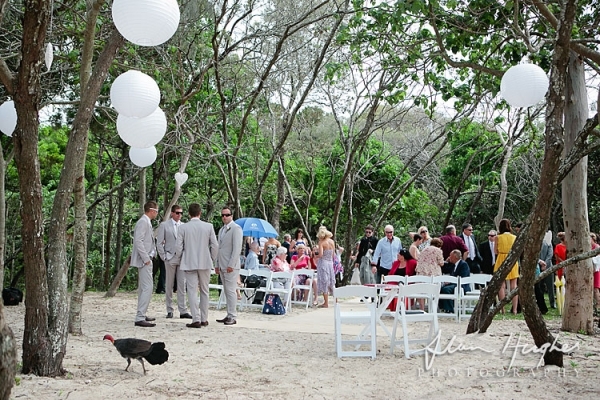 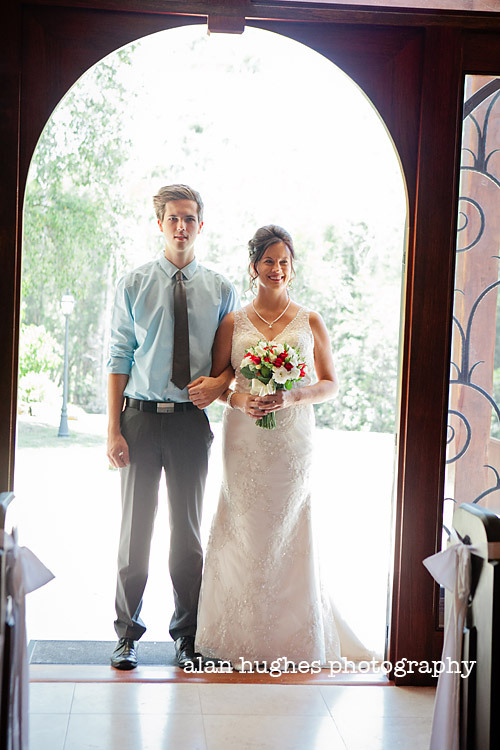 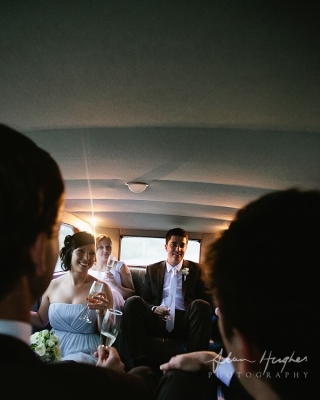 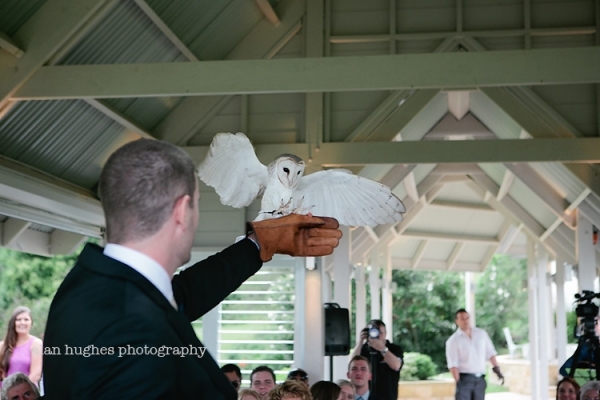 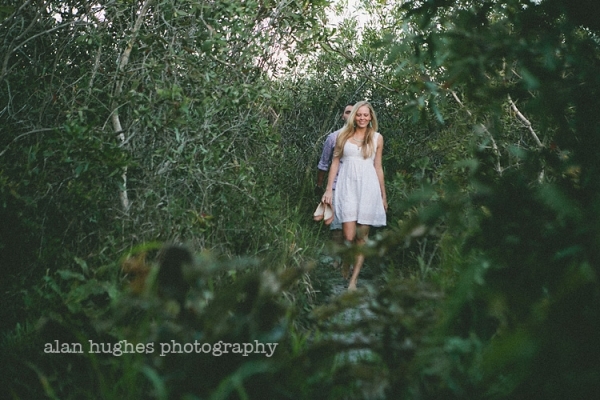 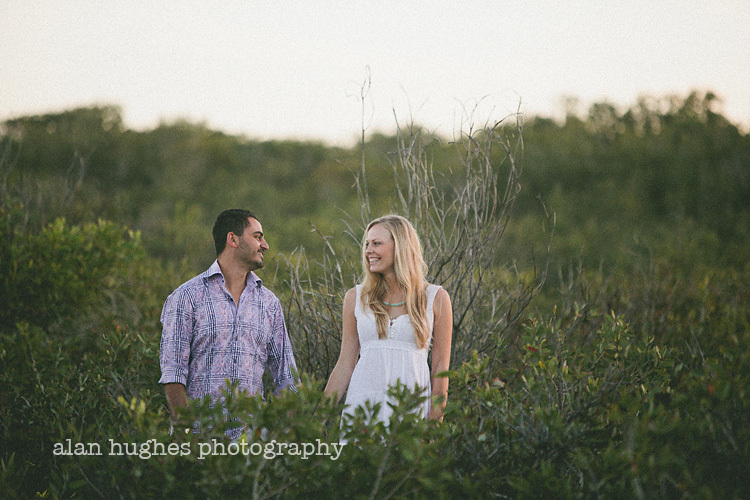 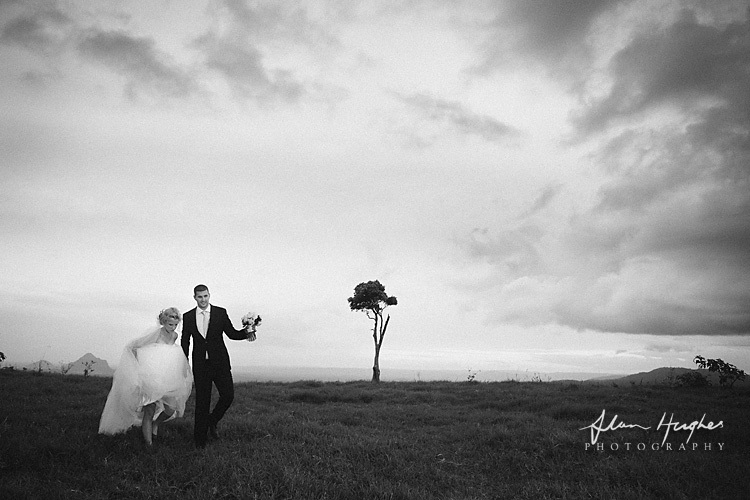 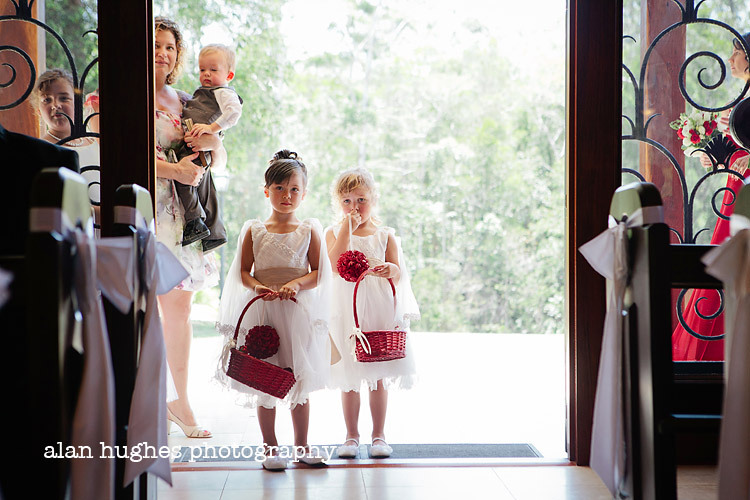 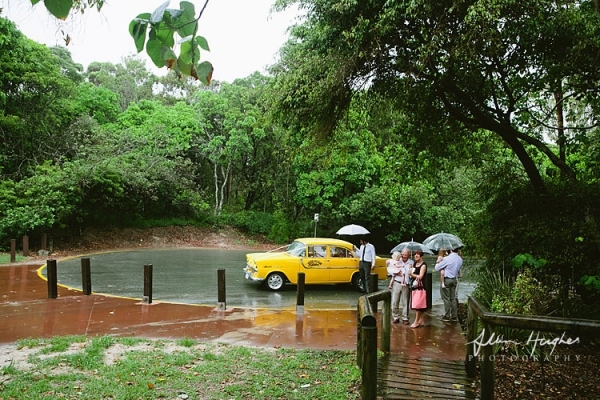 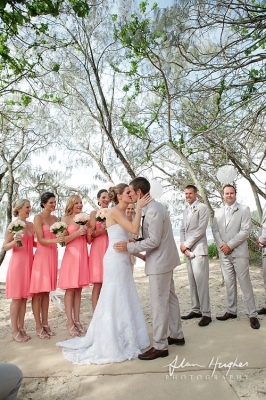 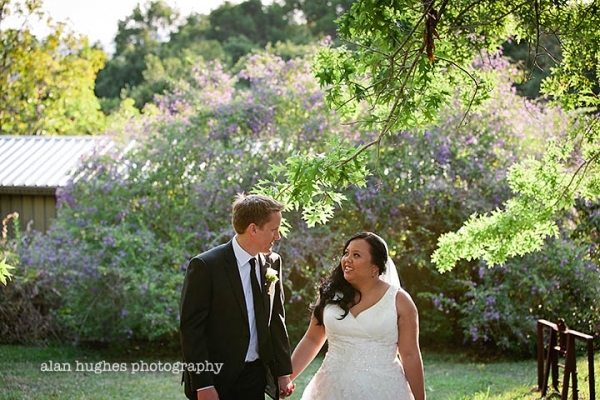 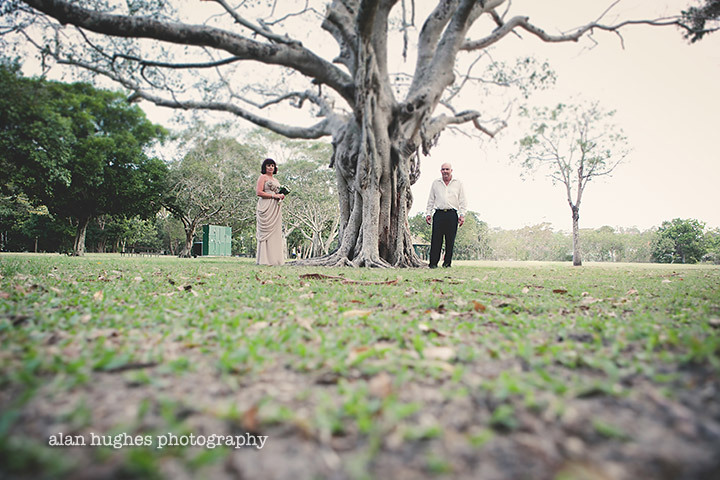 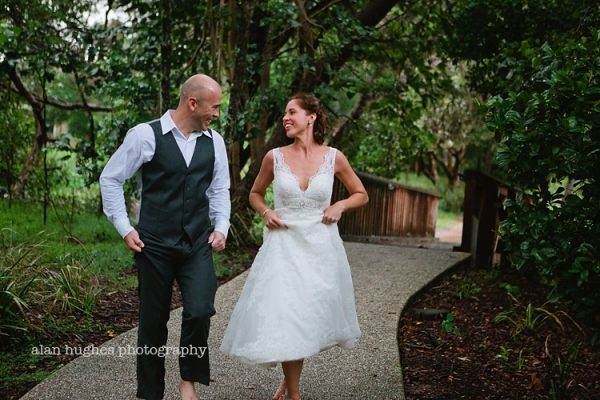 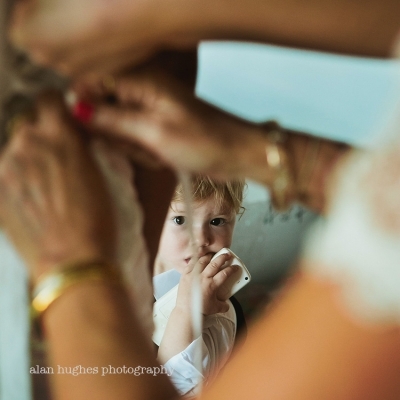 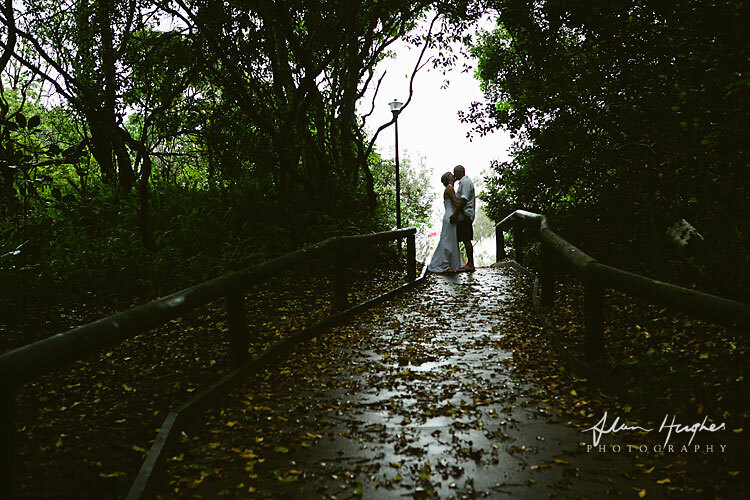 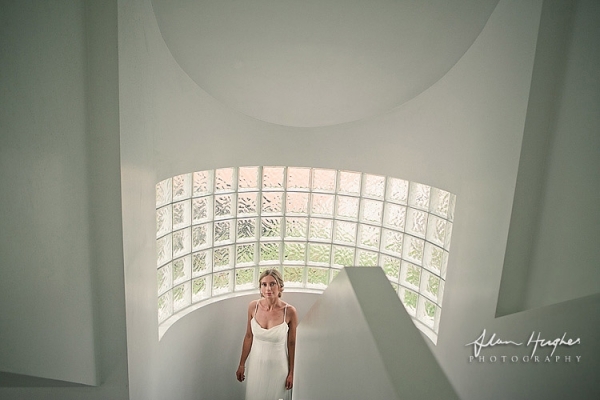 One beautiful Thursday in May, Eve and James got married at Hidden Grove, Noosa Beach. 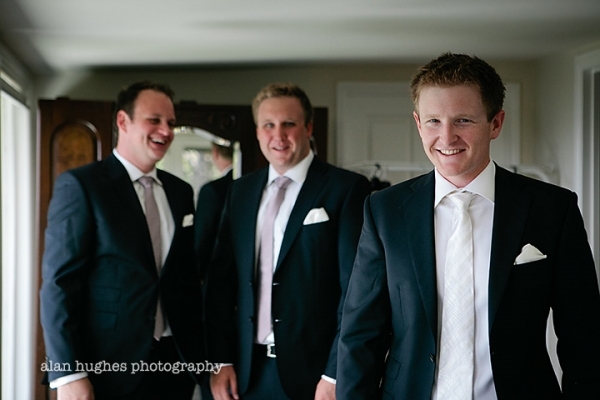 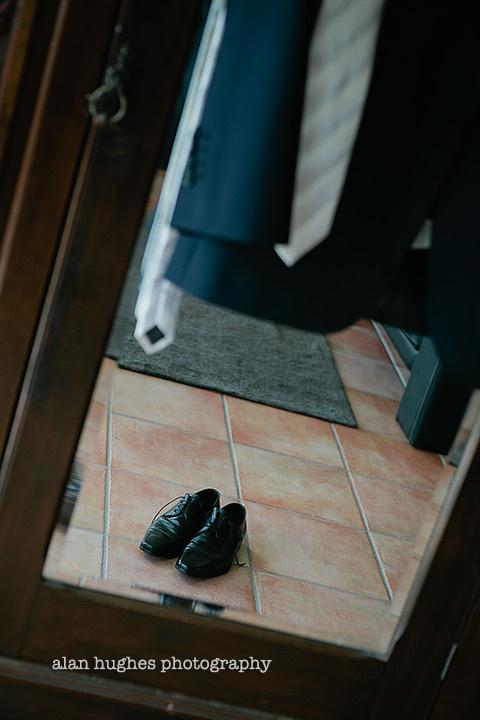 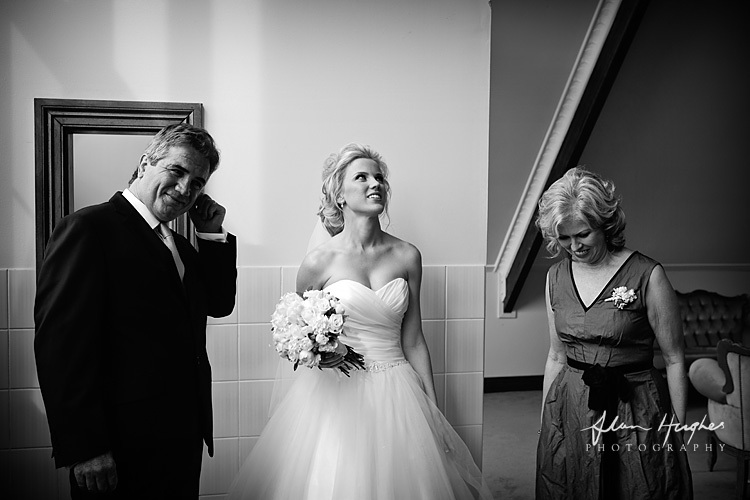 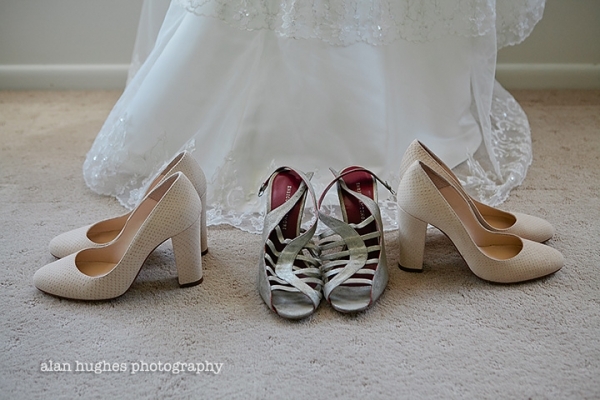 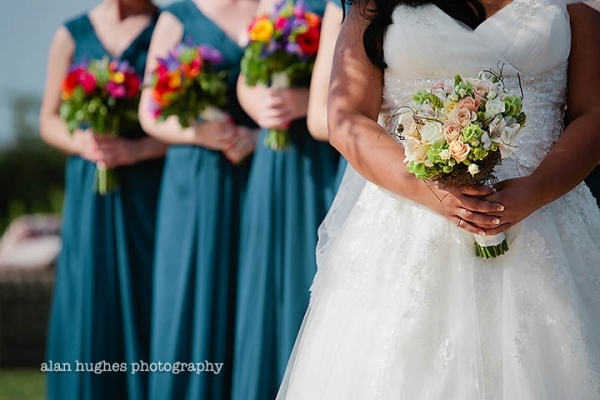 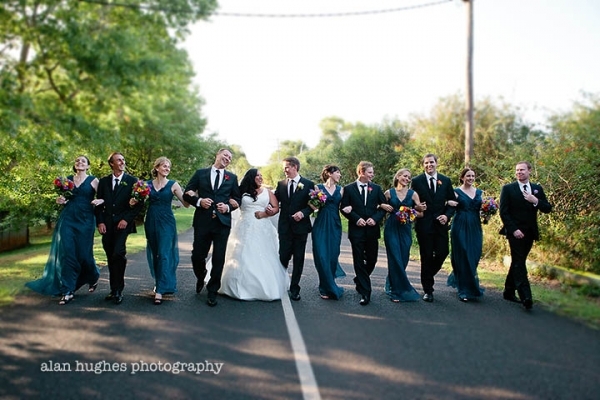 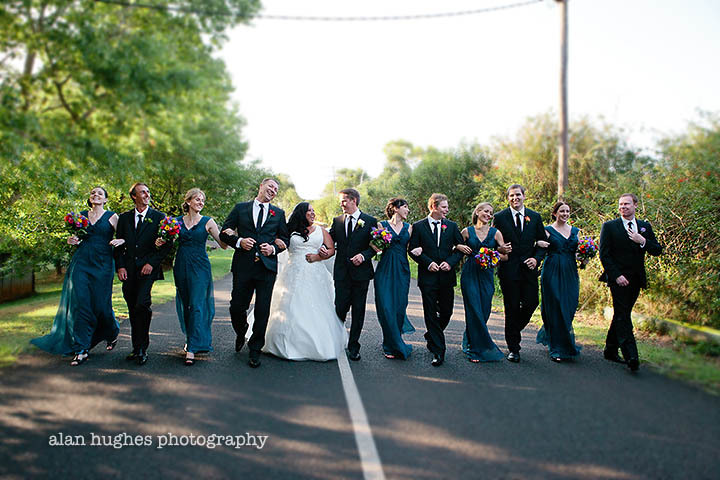 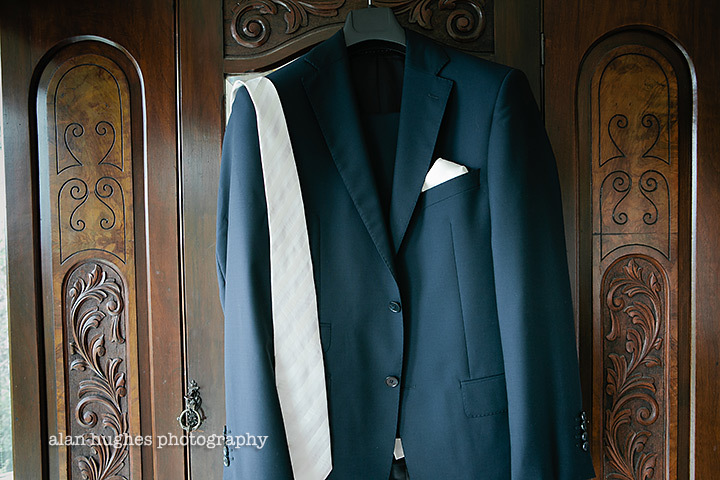 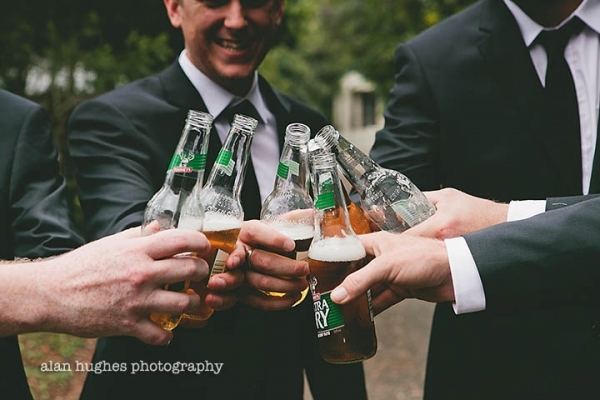 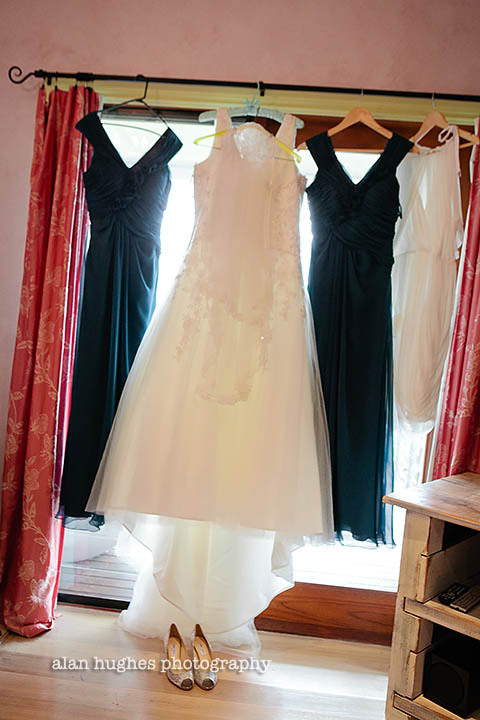 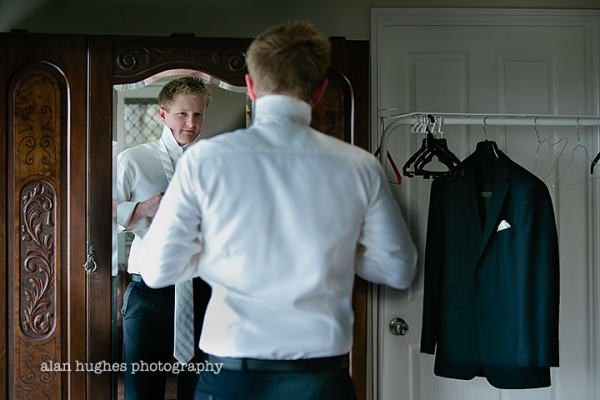 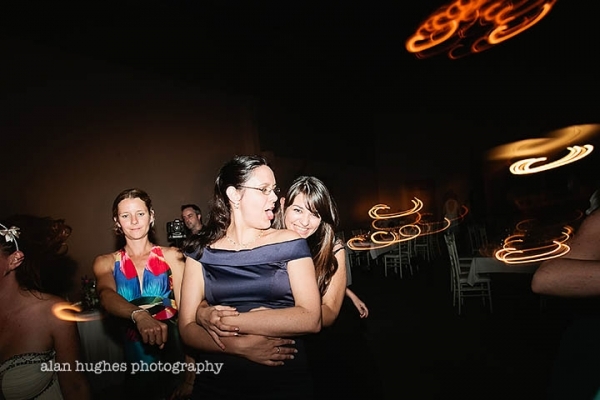 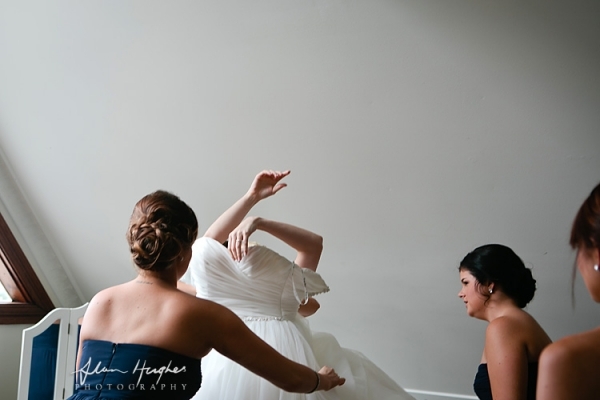 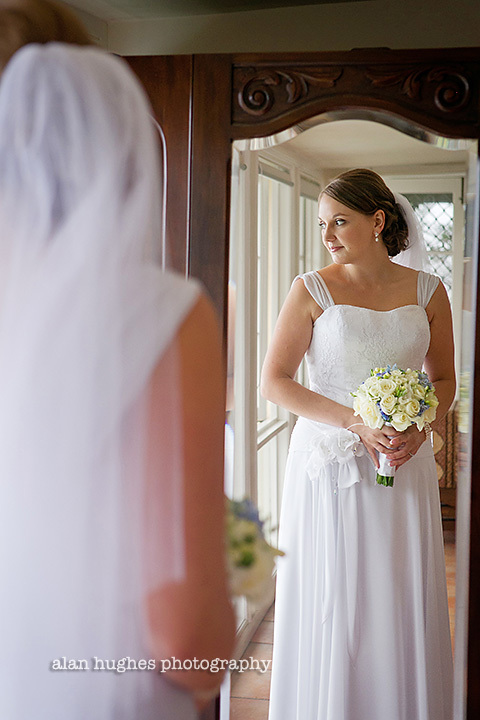 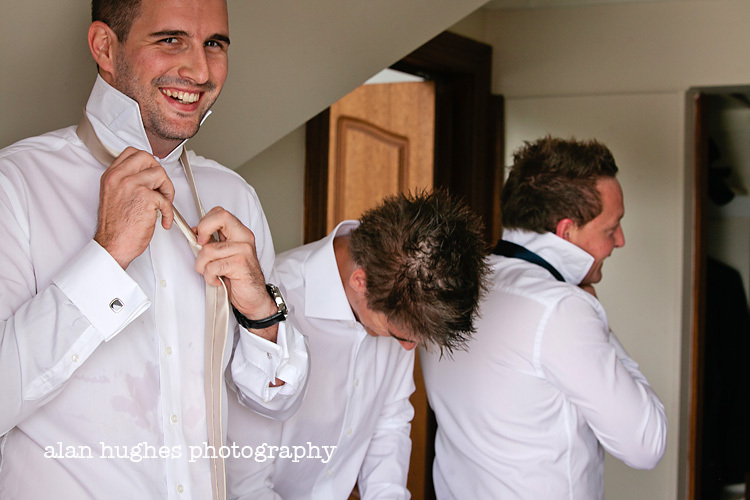 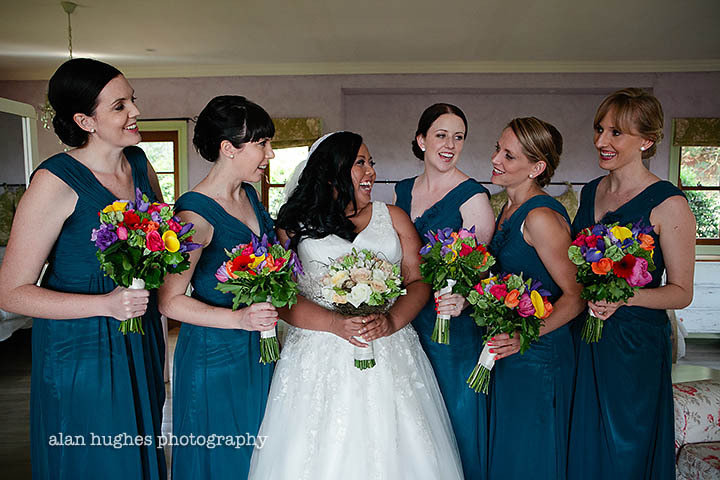 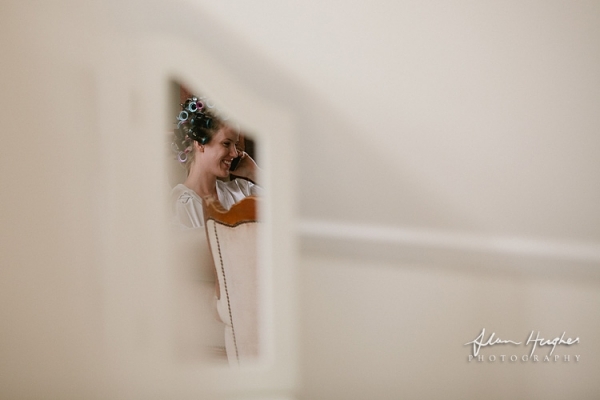 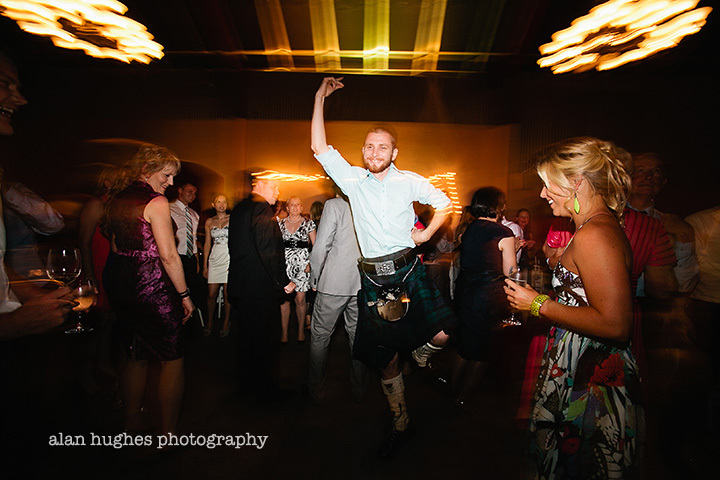 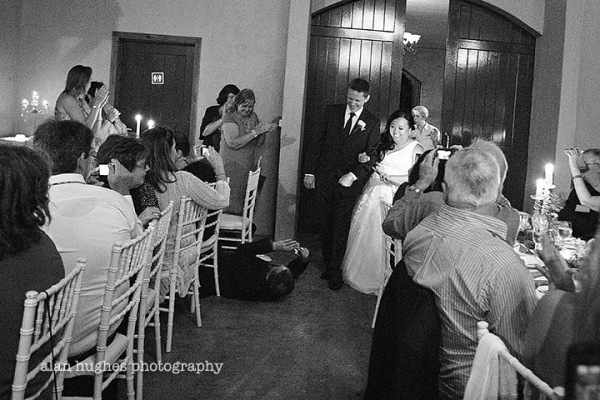 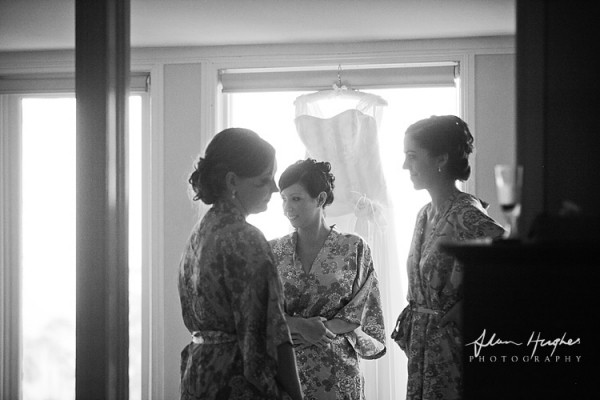 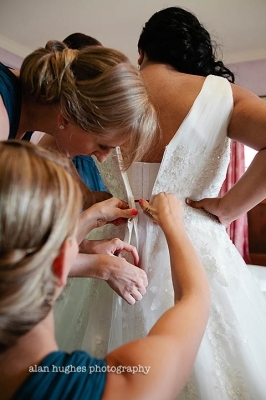 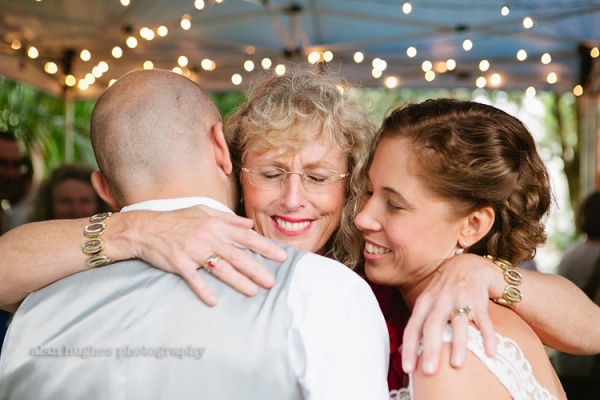 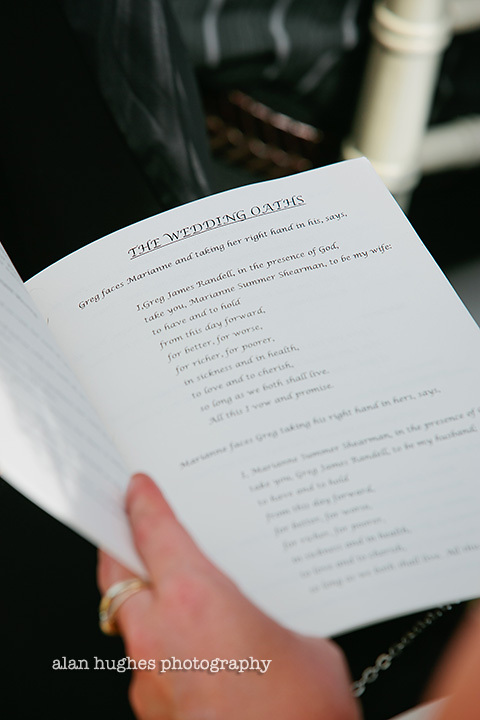 I'd been looking forward to this wedding very much since meeting the couple - I knew it was going to be one of those special occasions that would be fun from start to finish. 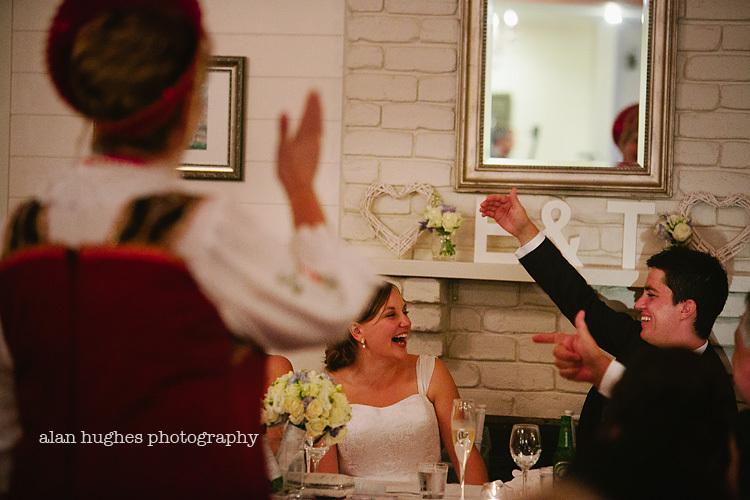 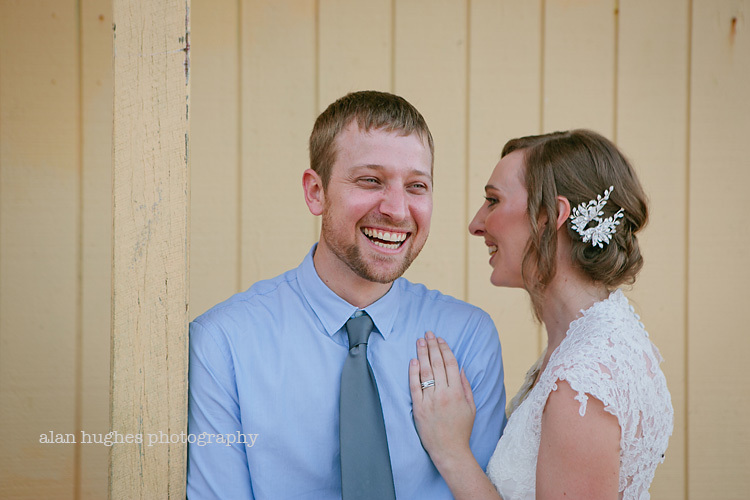 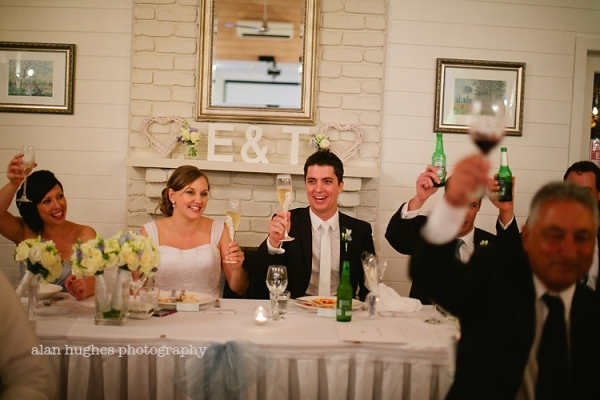 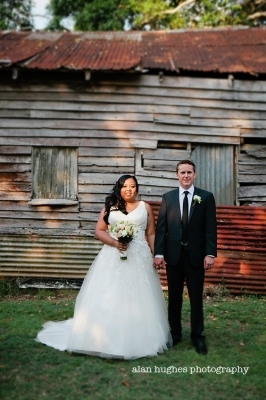 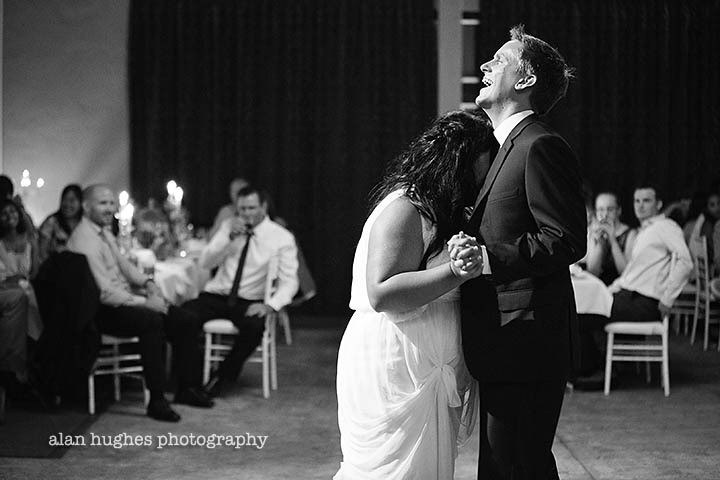 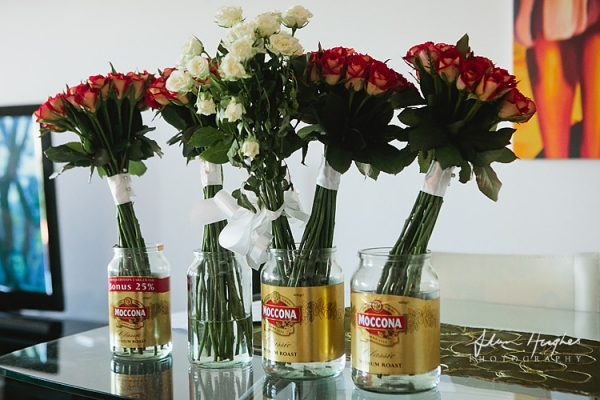 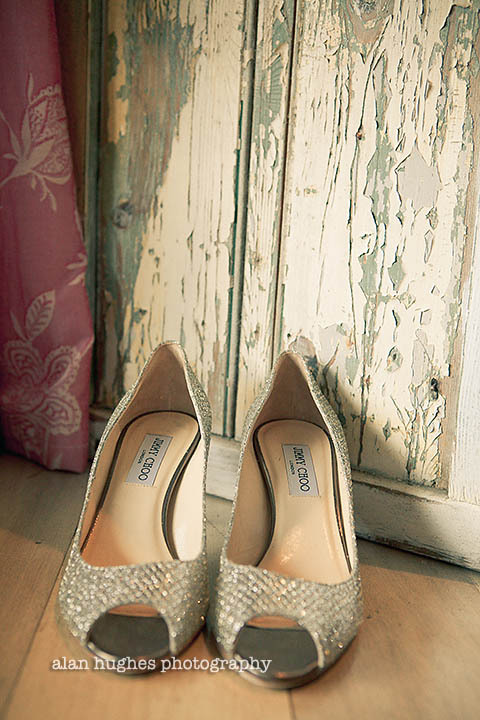 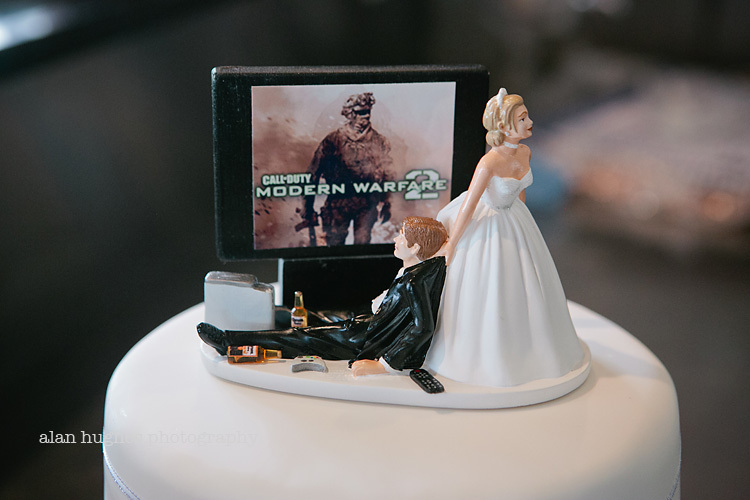 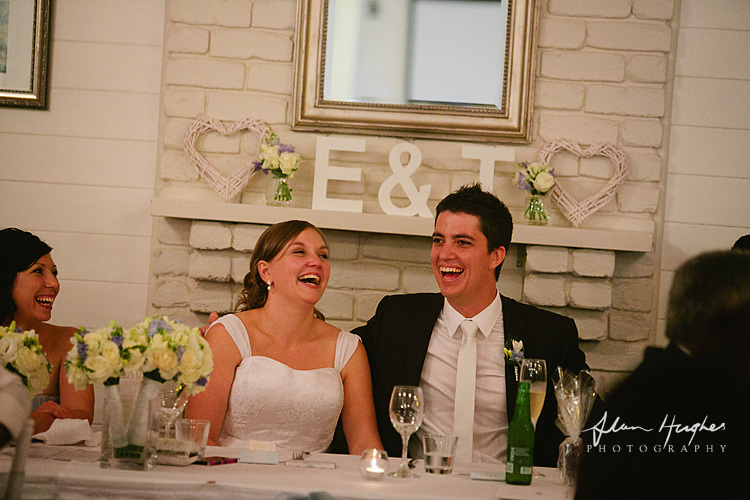 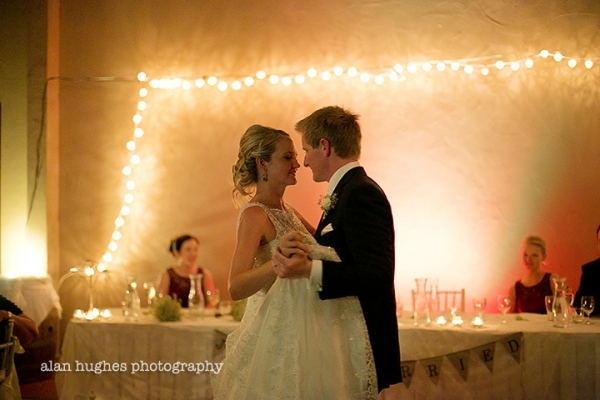 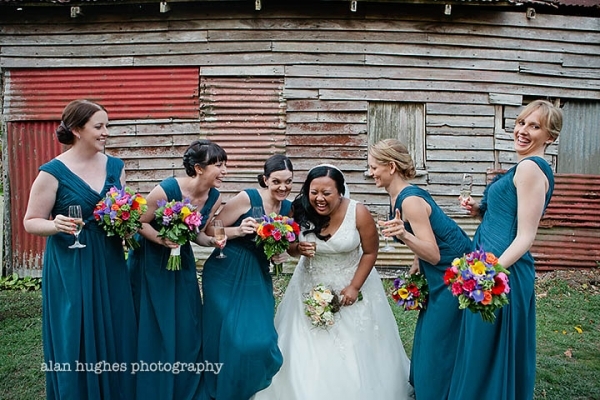 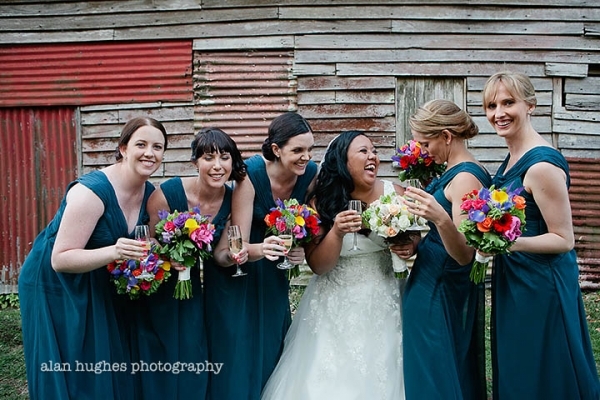 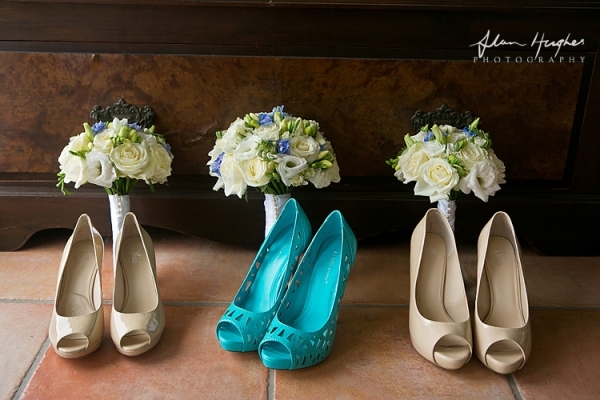 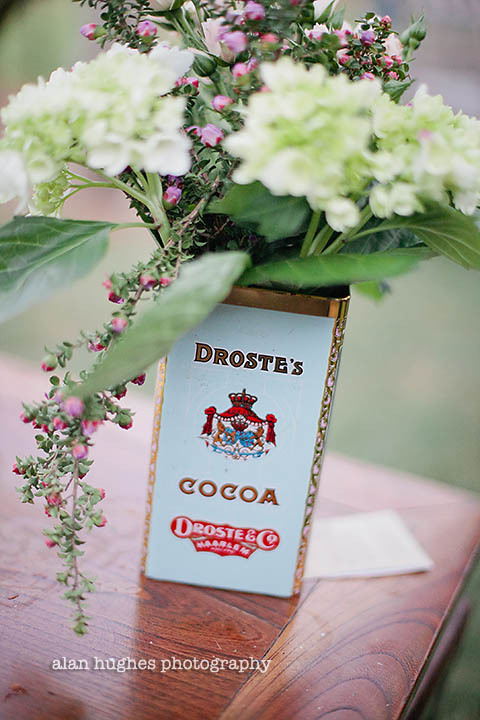 These two were just made for each other and the whole day was about celebrating (and boy did they celebrate!) that fact with their friends and family, who mostly came up from Victoria to enjoy a perfect day here on the Sunshine Coast. 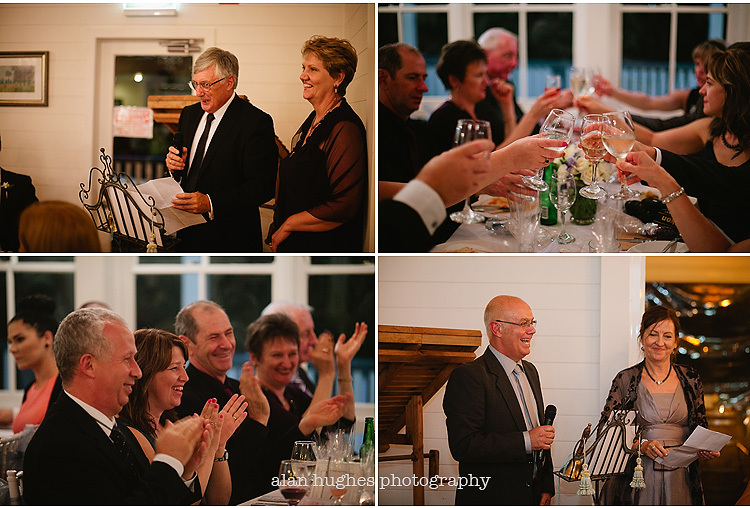 The celebrant was the lovely Natalie Banner, decorating by the ever attentive First Class Functions and an awesome reception at Bistro C (who do the best beef cheeks with beetroot and horseradish...yum yum..). 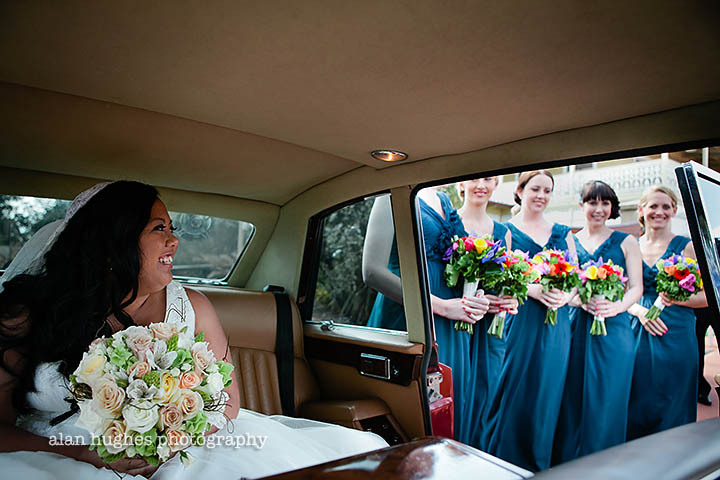 I simply have the best job in the world and also must have the best people to photograph - it was a privilige to be a part of this day and thanks must go to being made so welcome by a great bunch of people. 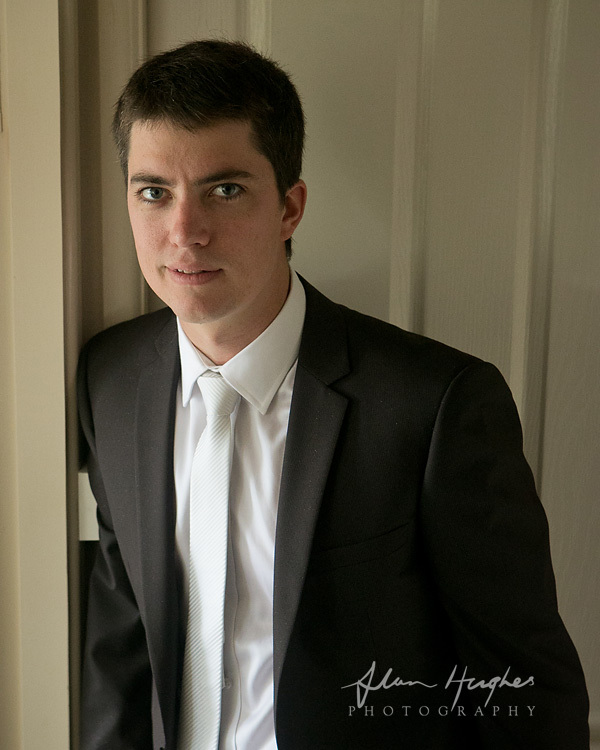 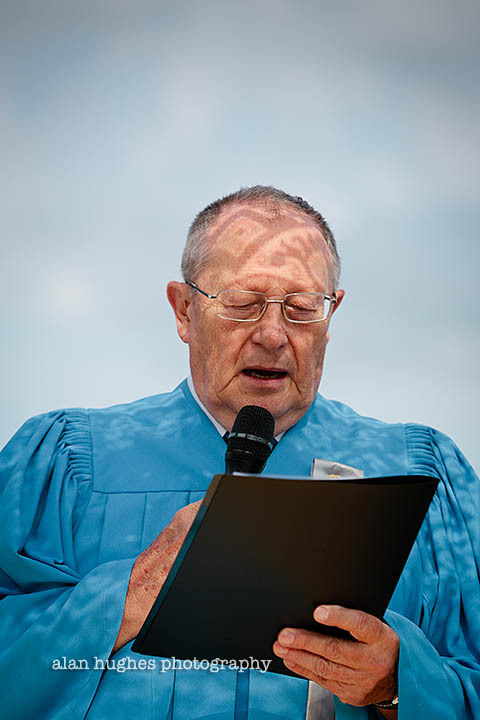 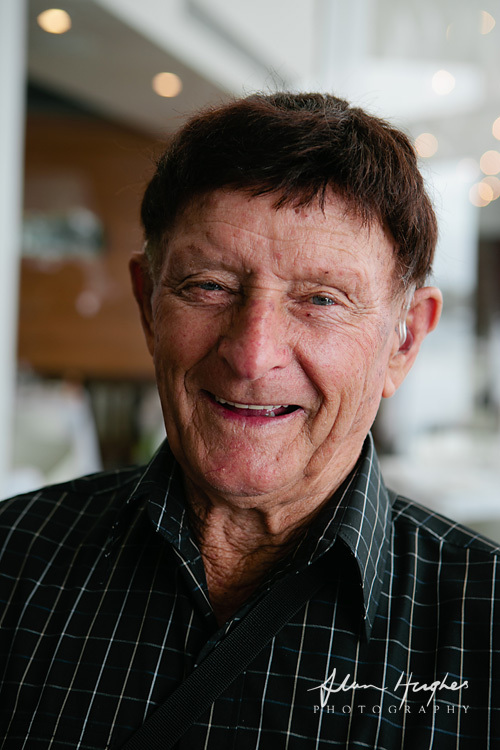 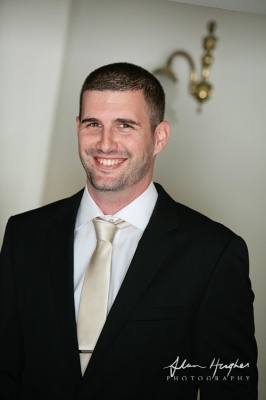 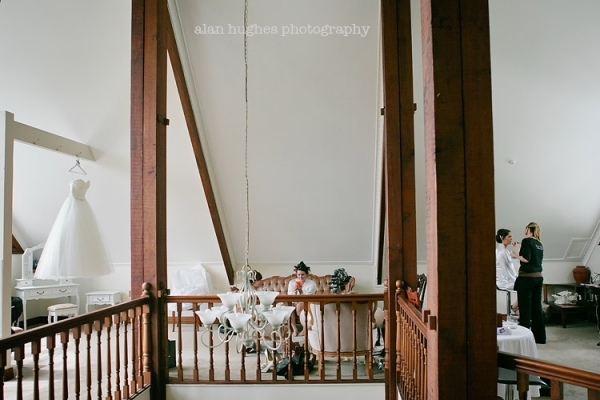 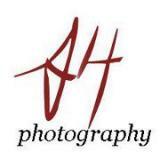 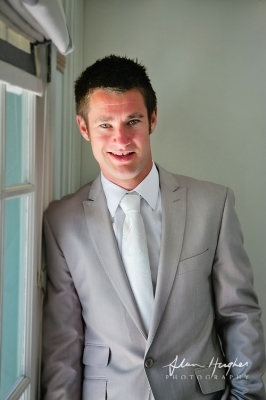 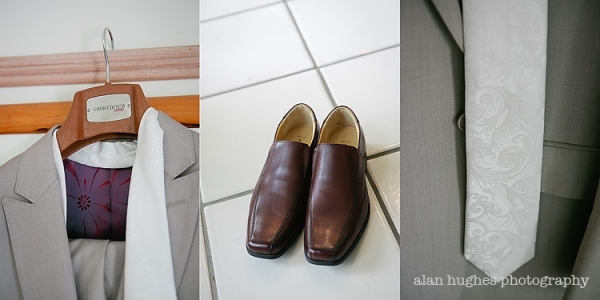 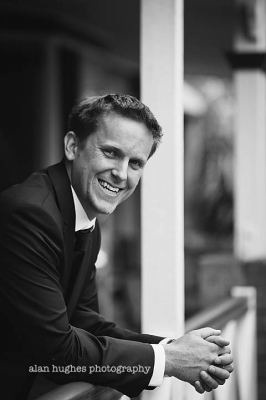 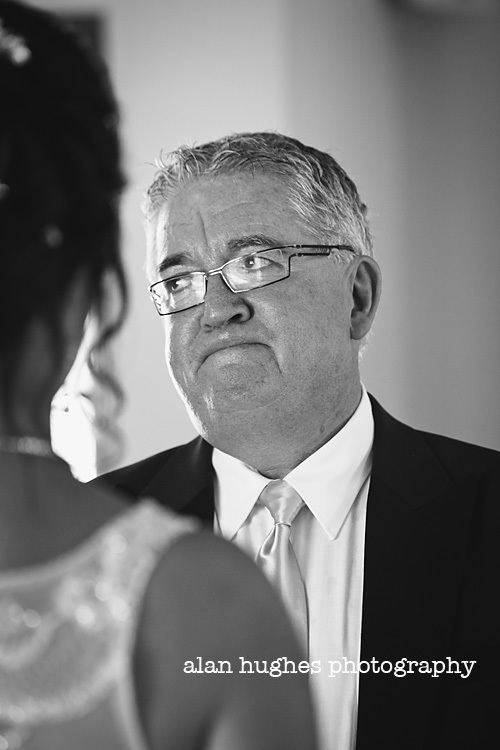 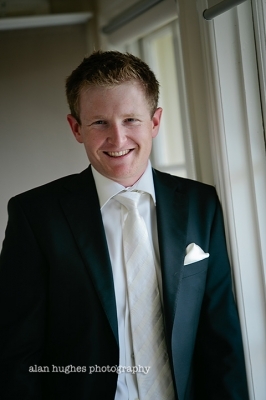 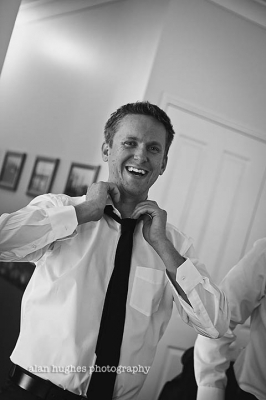 Follow Alan Hughes on Google+! 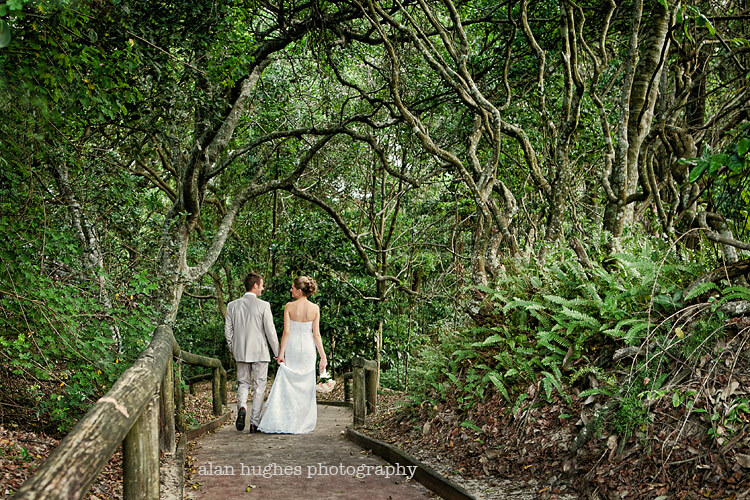 Had the real privilige of photographing Colleen & Shaun's elopement wedding down at Hidden Grove, Noosa a couple of weeks ago. 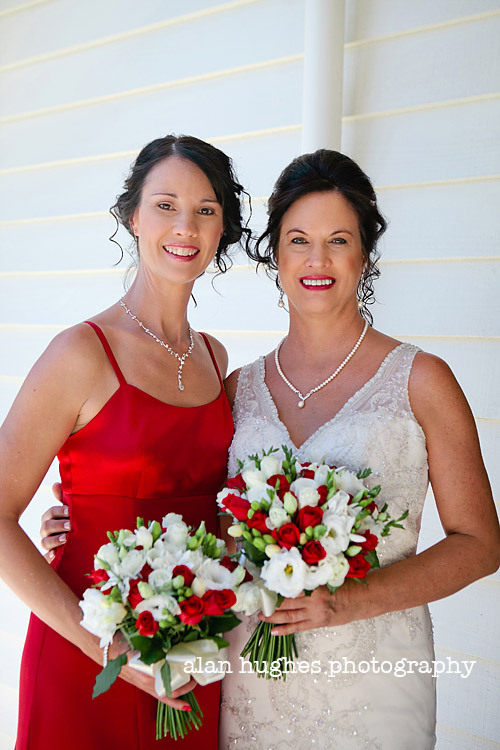 It was just the two of them and their parents and a handful of friends in an intimate ceremony by celebrant Jacqueline Gray. 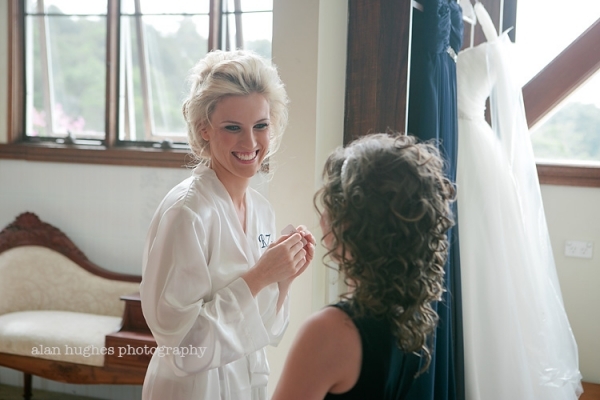 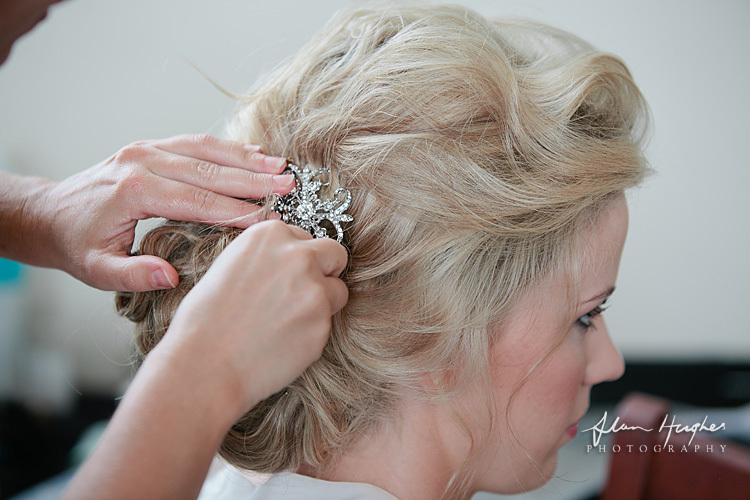 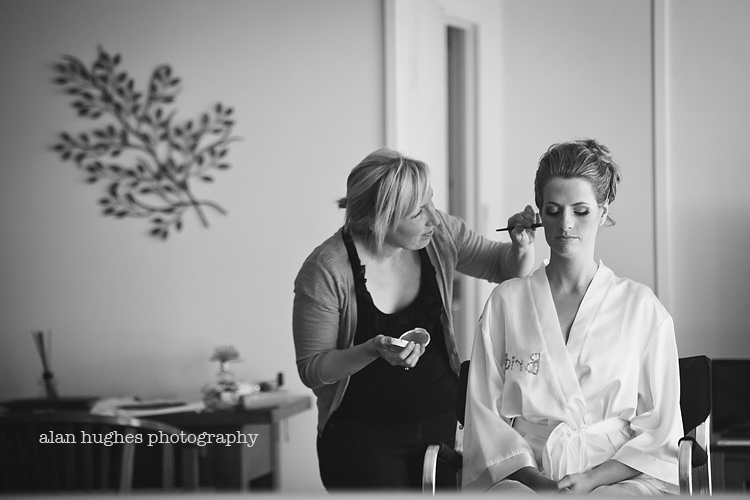 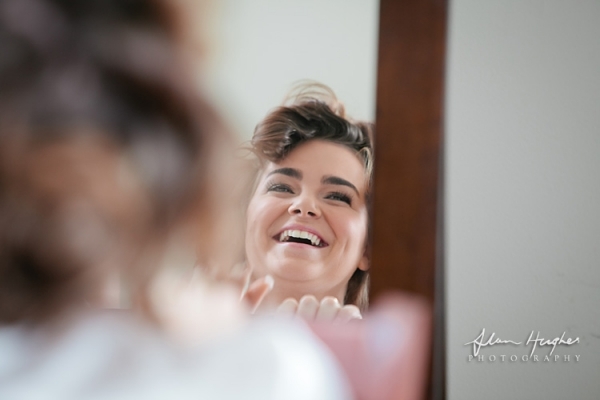 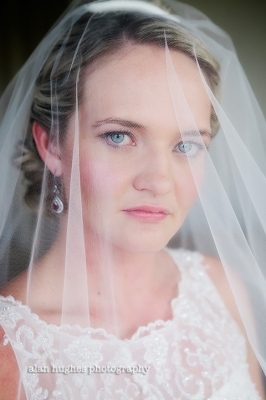 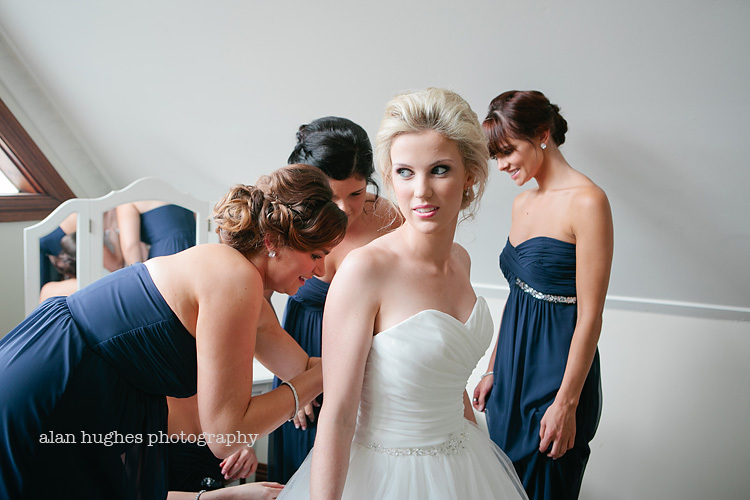 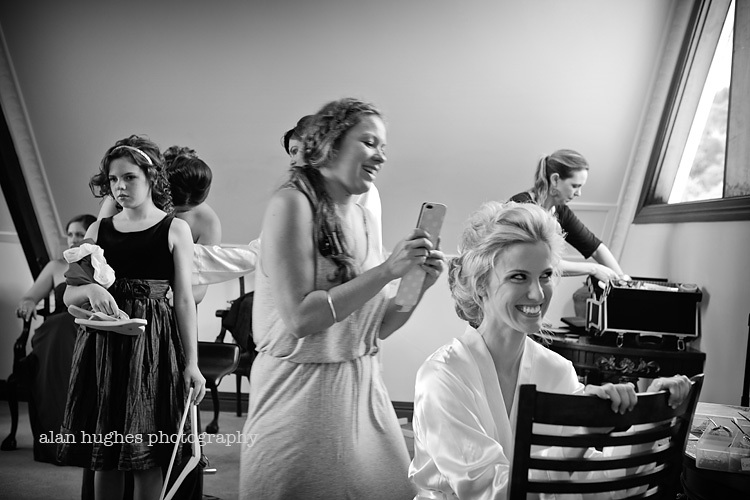 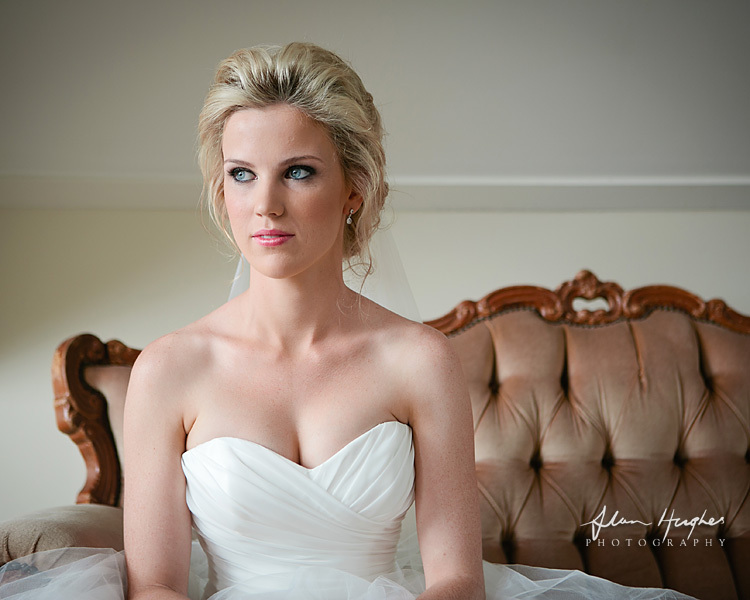 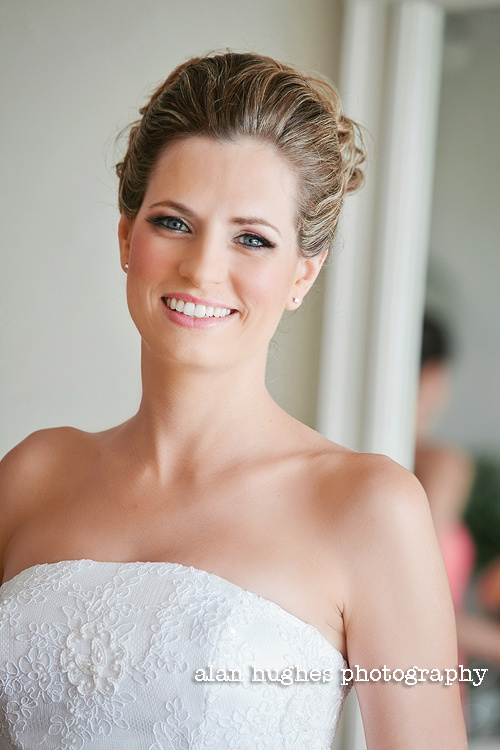 Colleen's make-up and hair by Vicki Nellis. 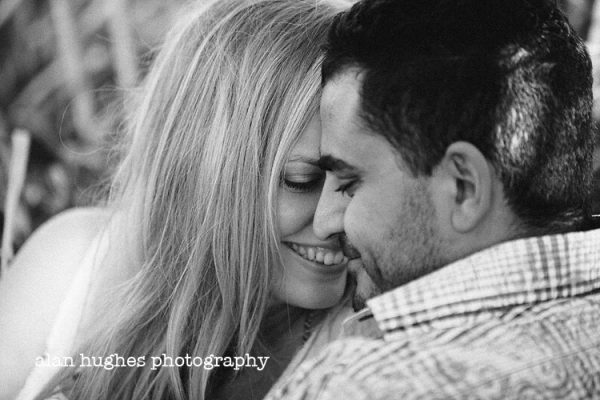 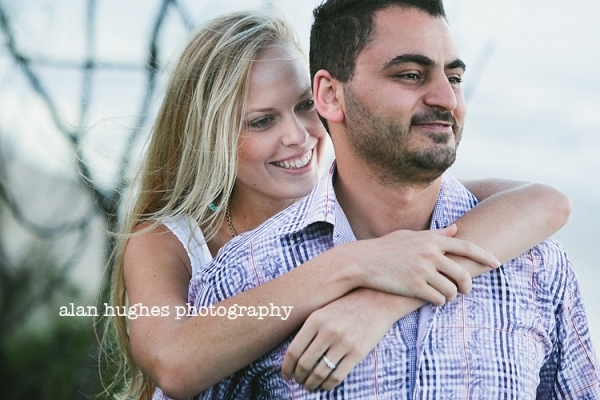 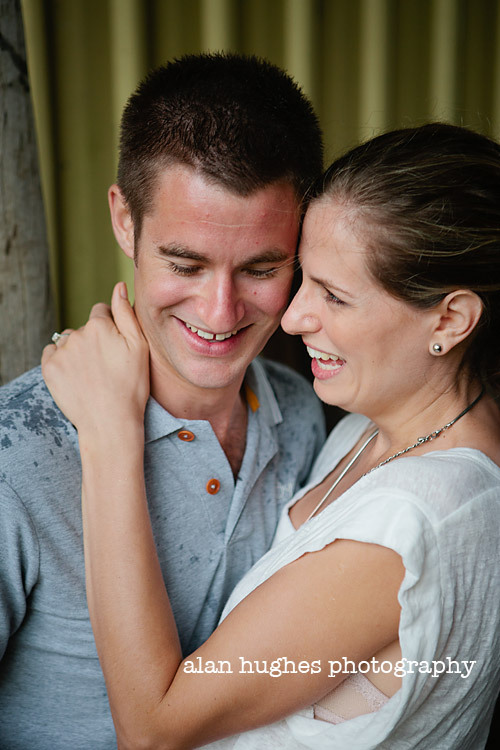 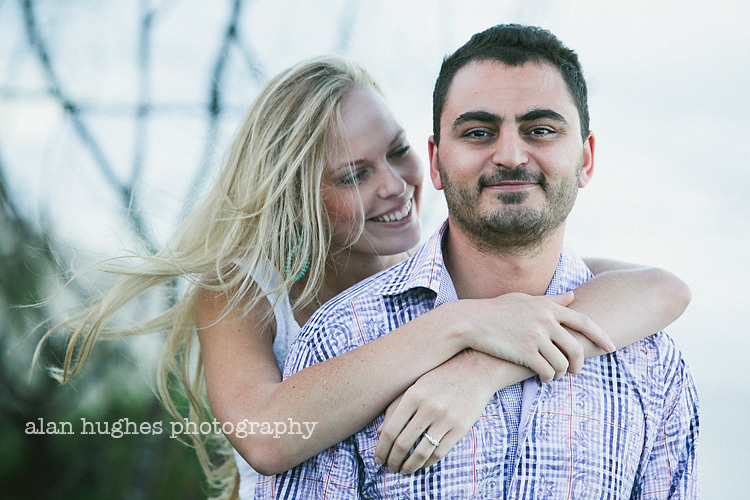 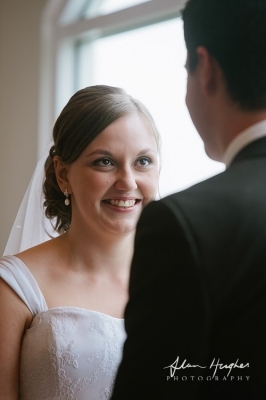 This is Hannah & Rami who are getting married in a few weeks at Solothurn Resort. 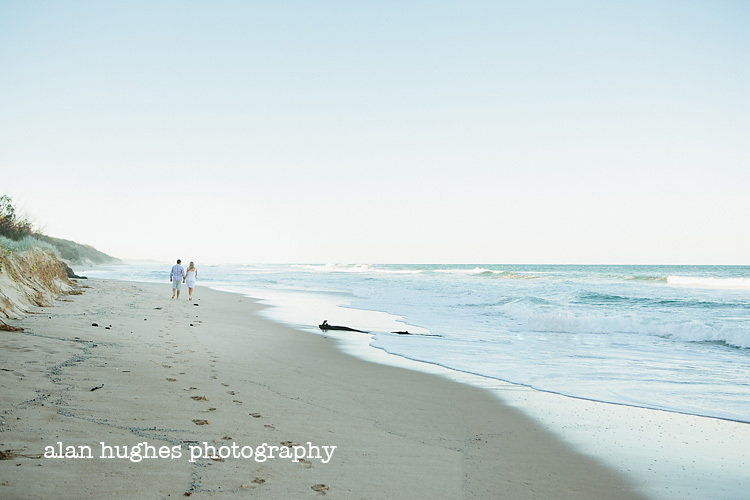 We caught up a couple of weeks ago for their pre-wedding shoot and headed down to the beach and there's nothing more I like than two people very much in love...and beautiful light to photograph them in. 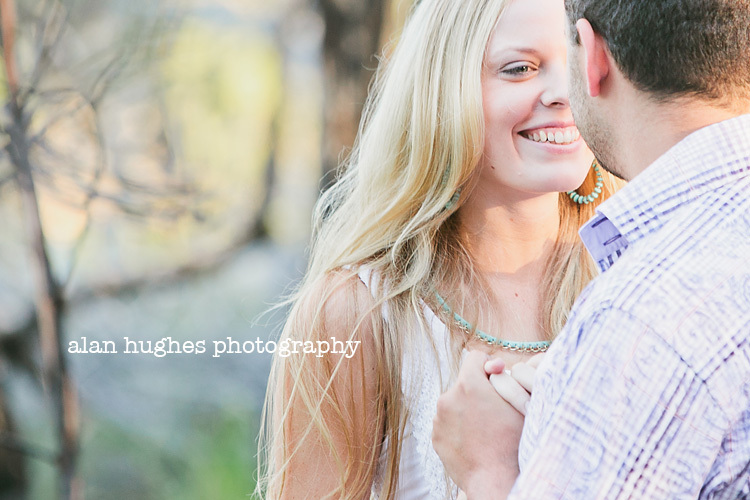 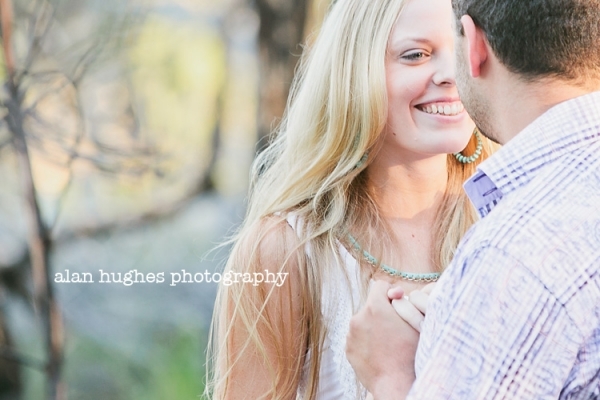 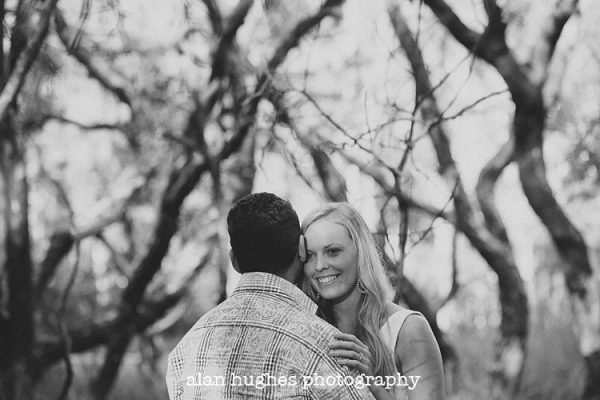 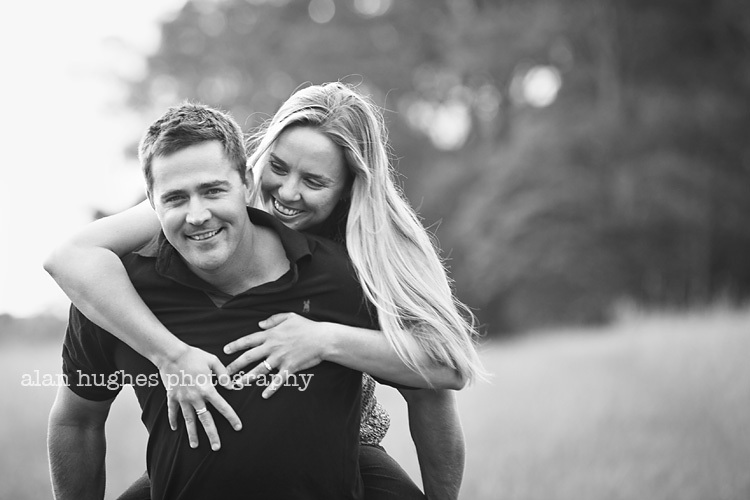 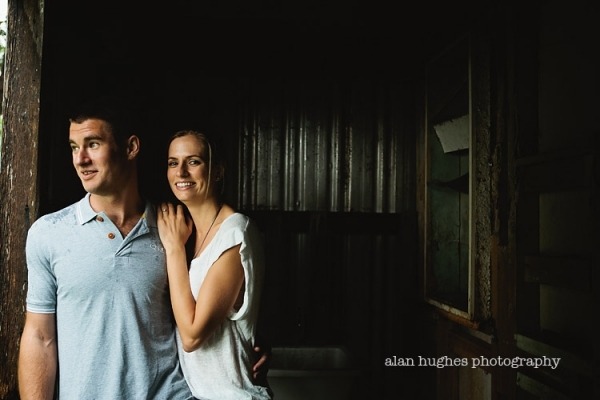 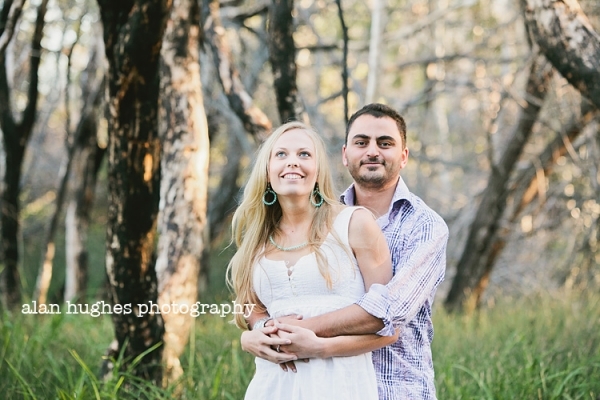 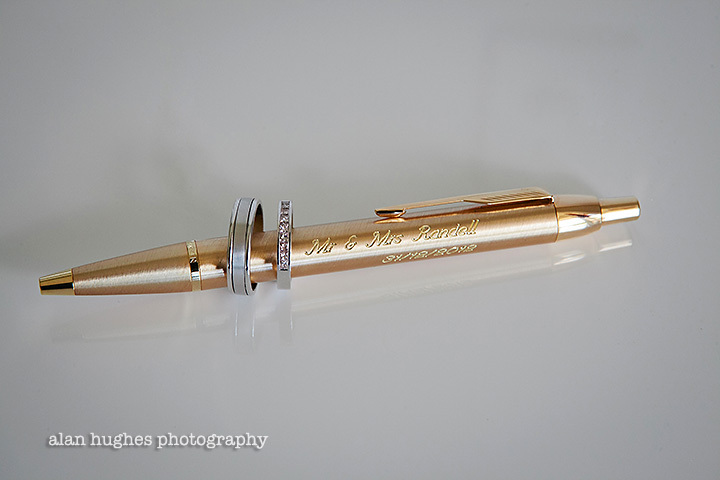 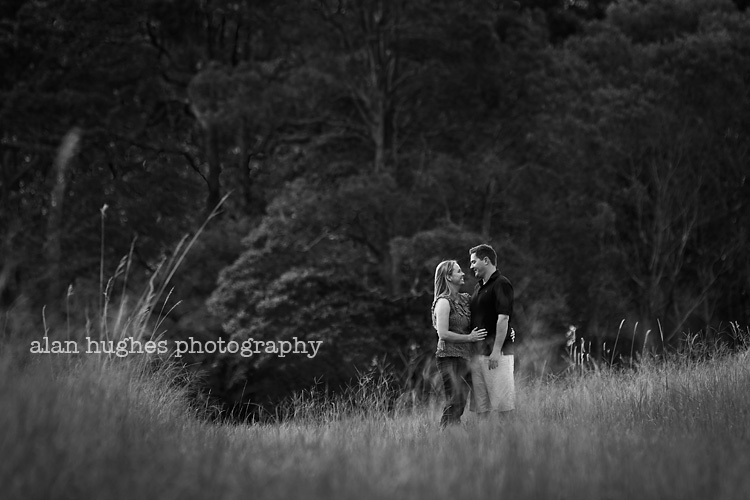 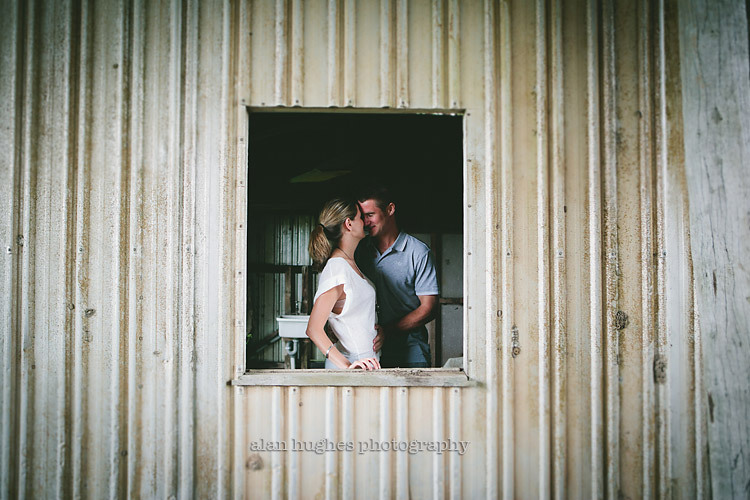 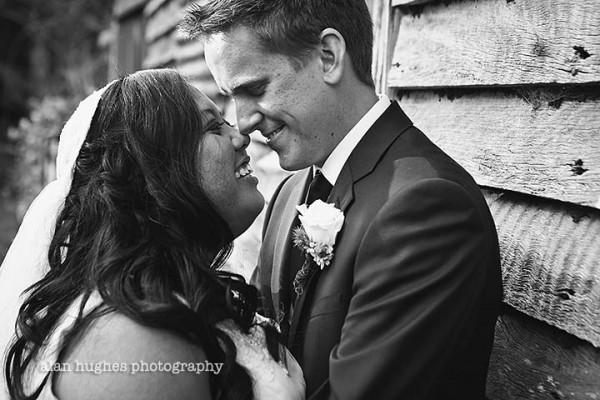 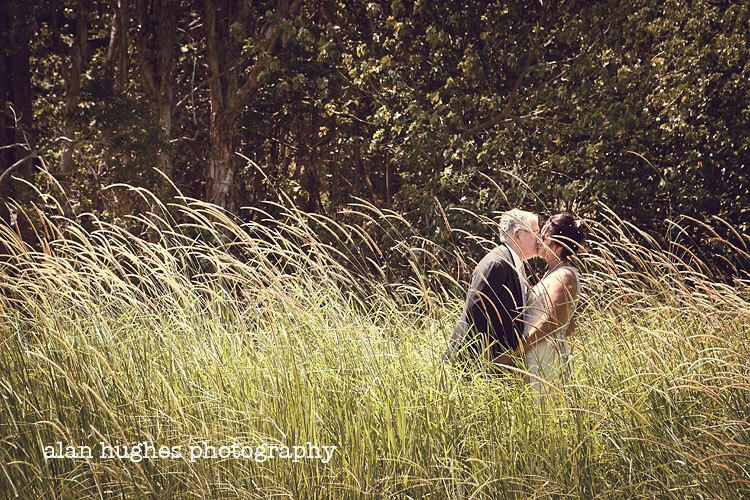 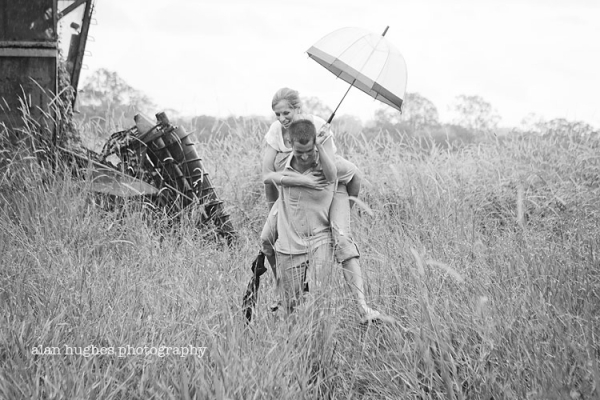 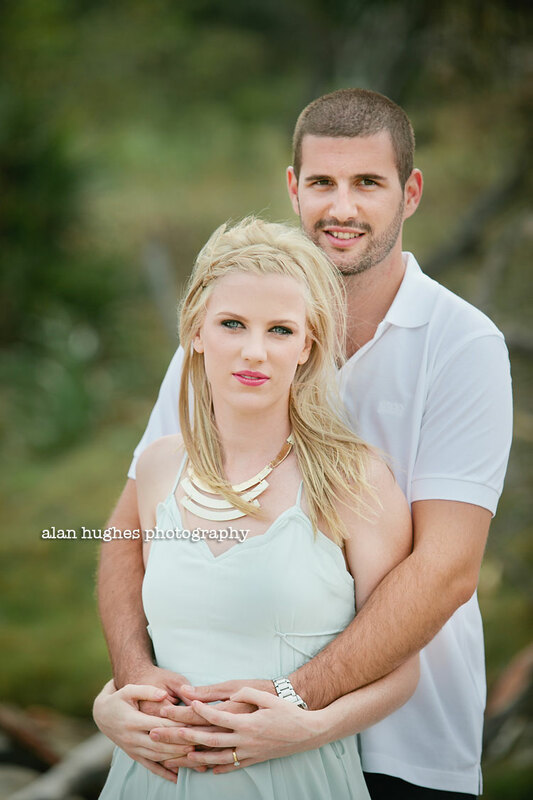 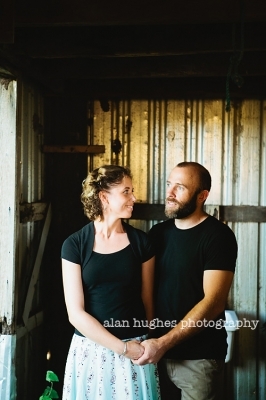 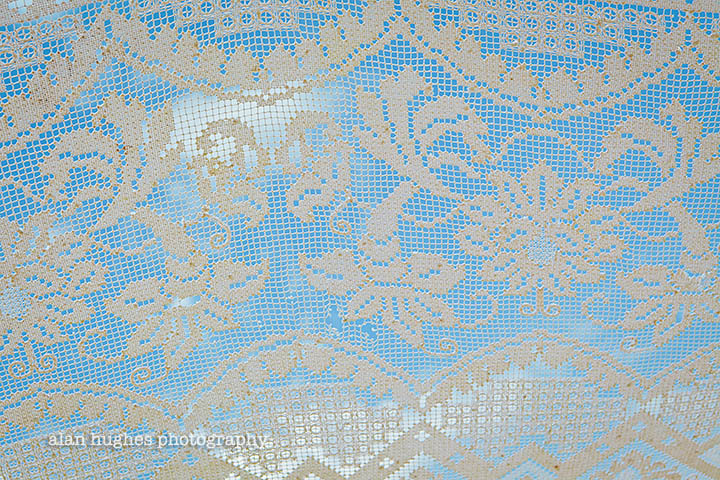 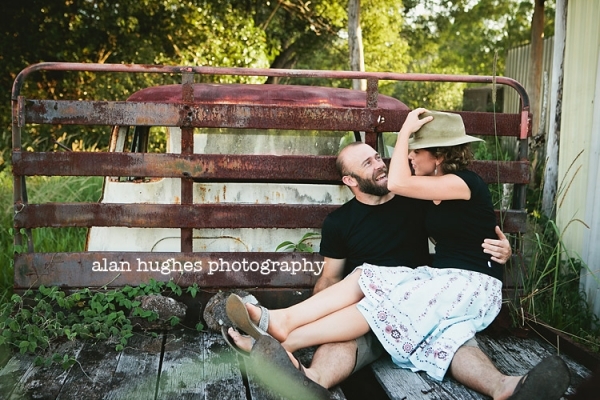 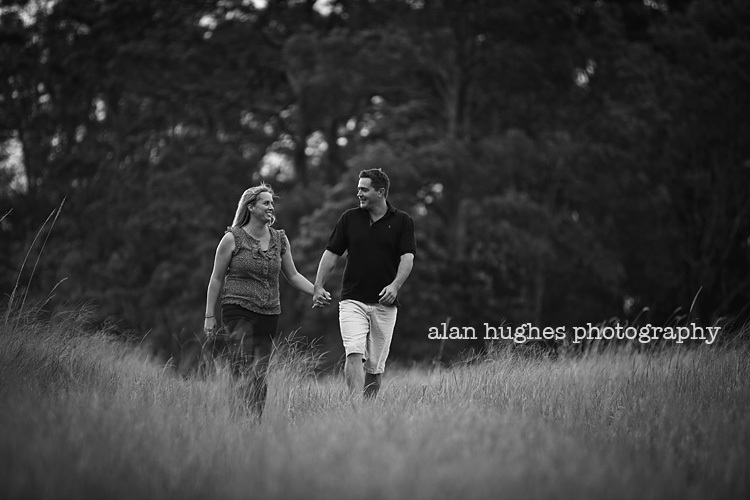 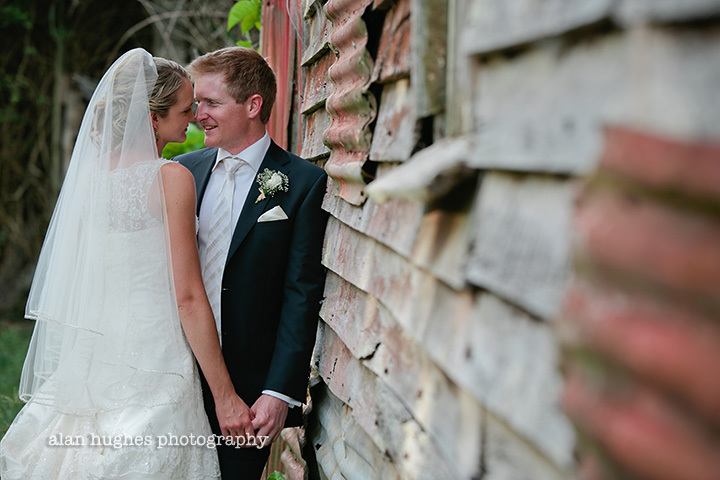 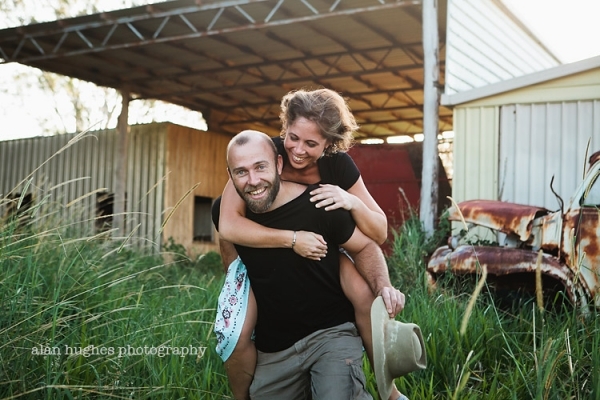 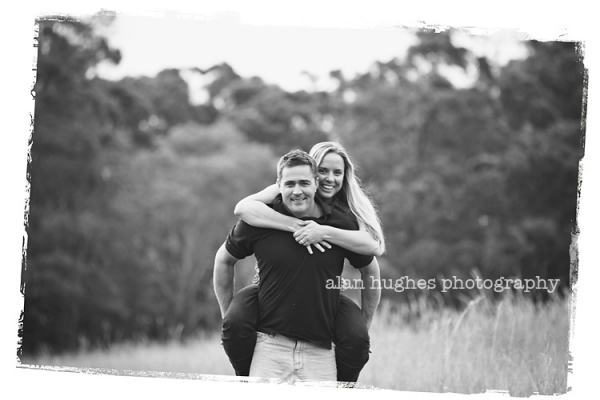 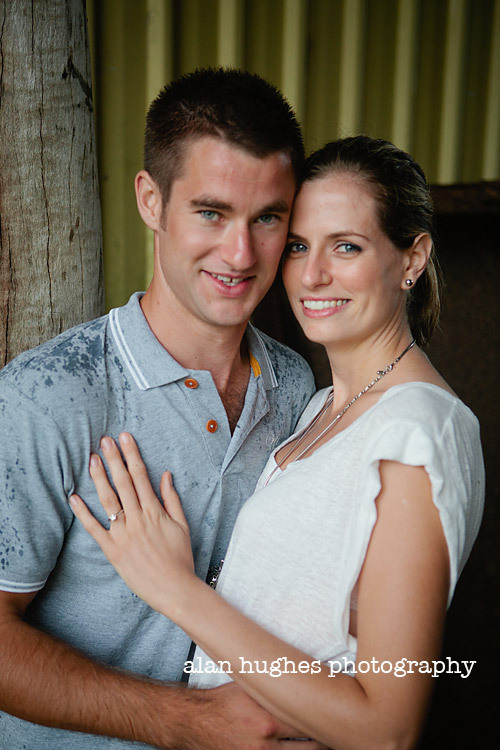 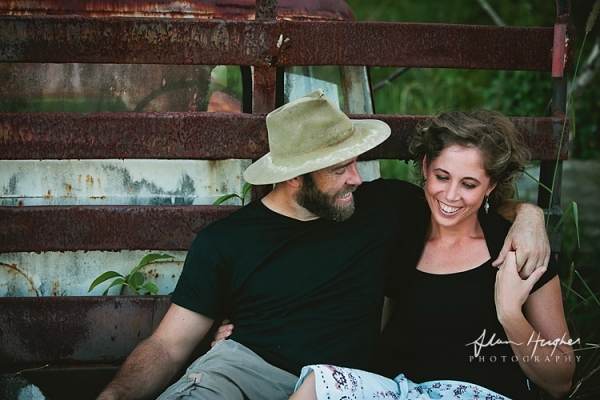 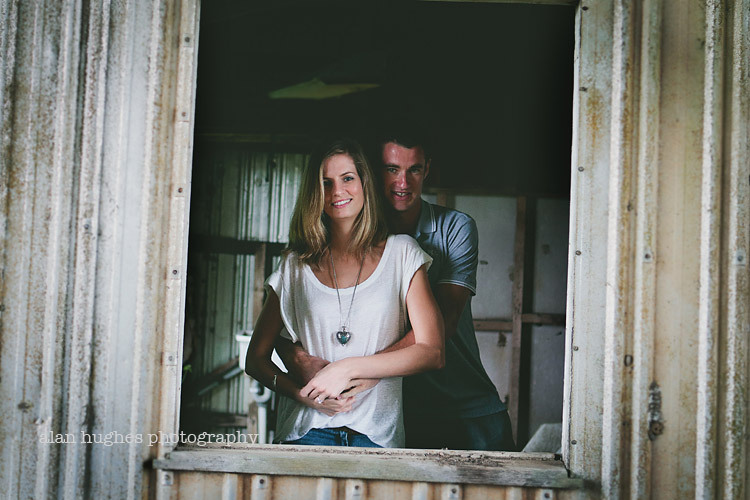 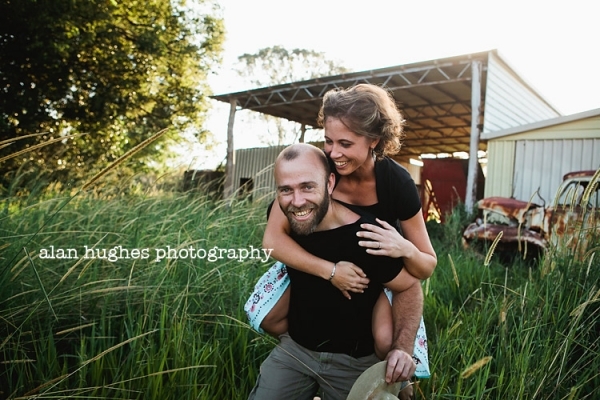 I'm looking forward to their wedding day, it will be very much a country affair full of happiness and love! 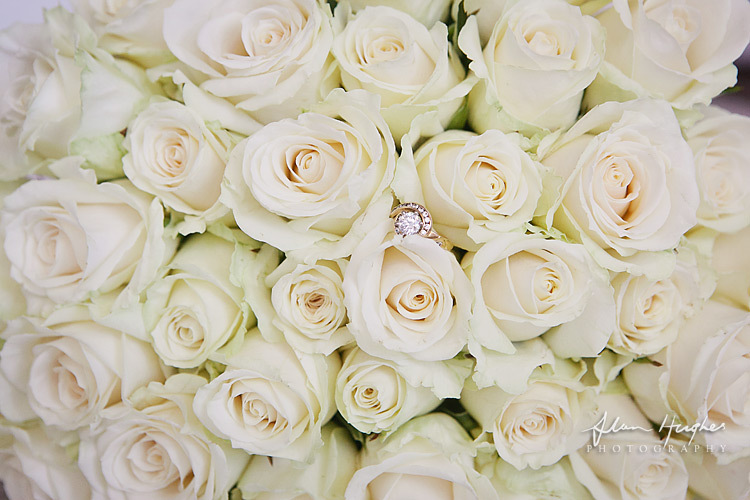 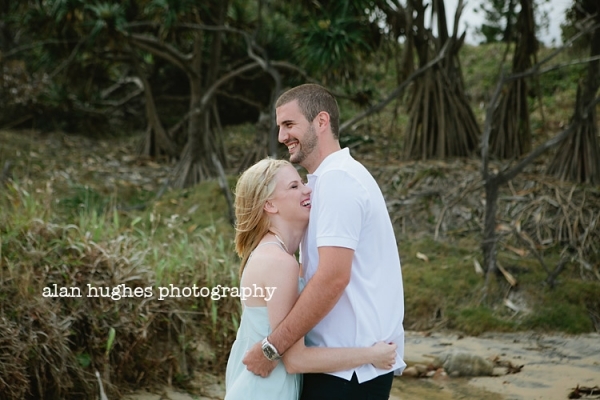 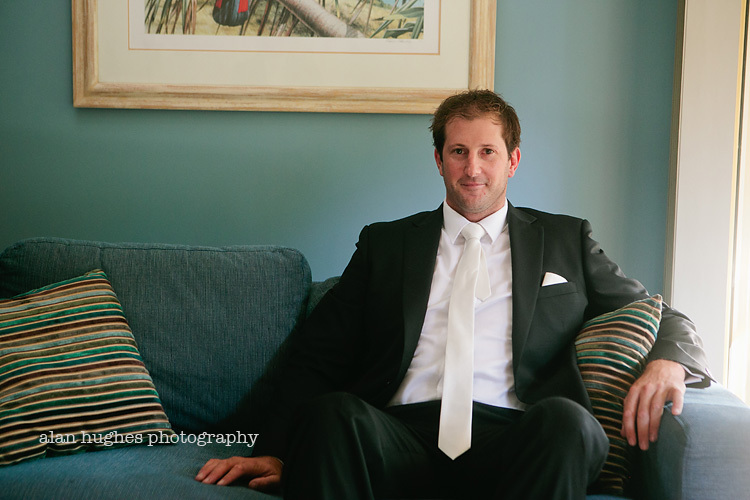 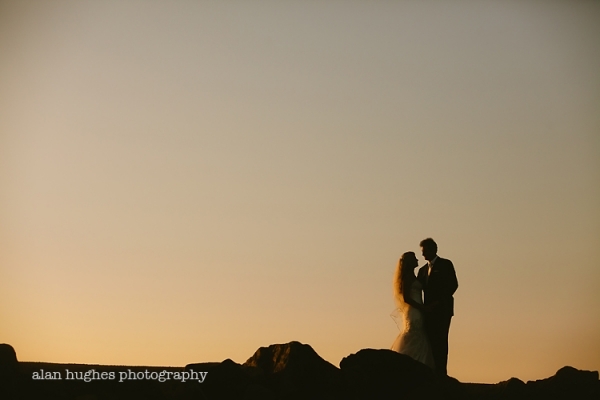 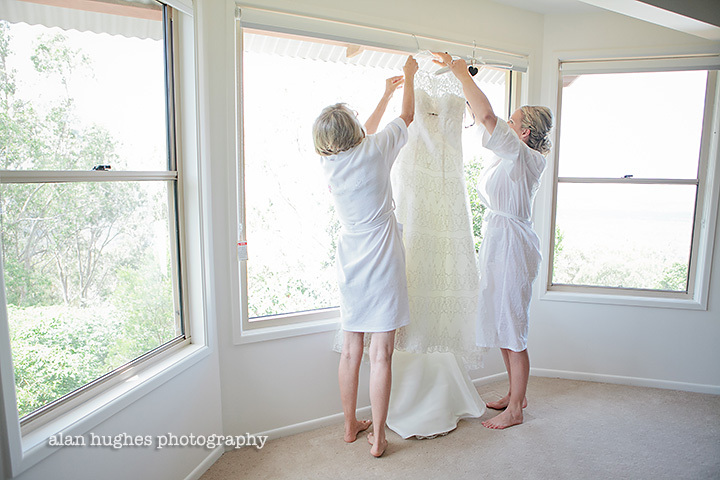 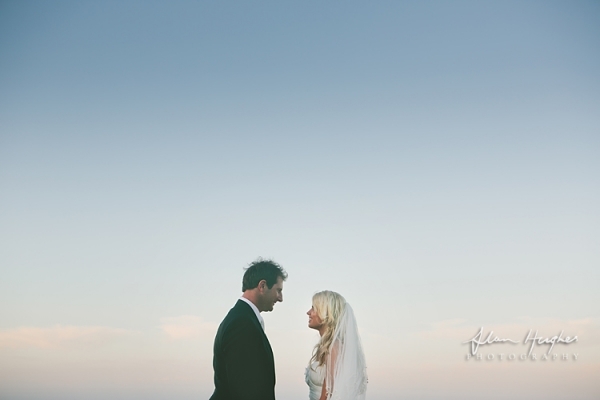 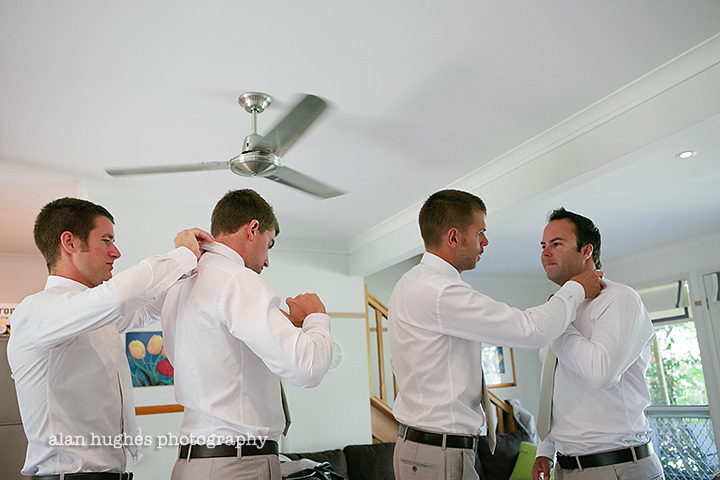 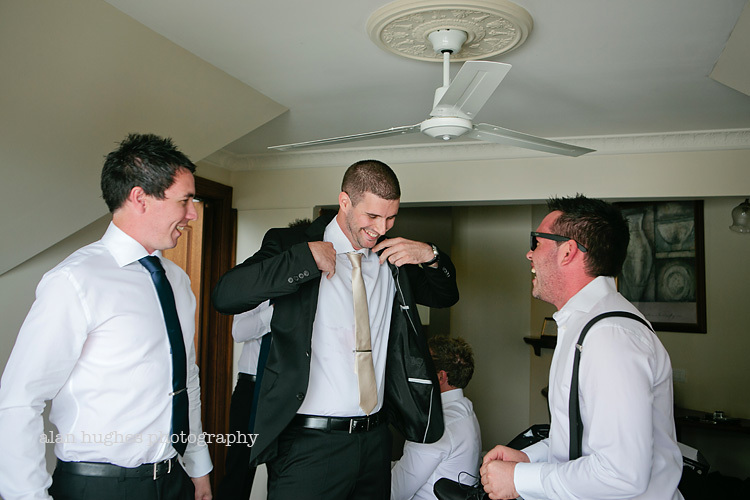 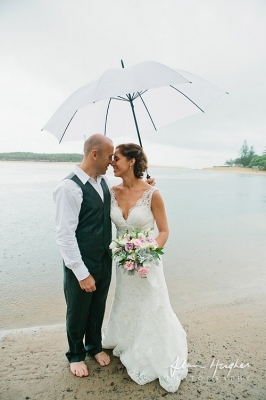 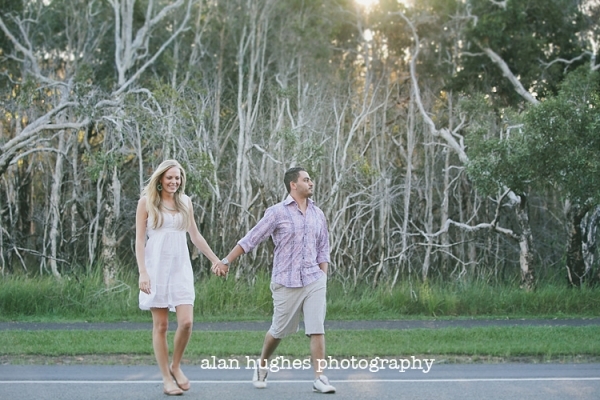 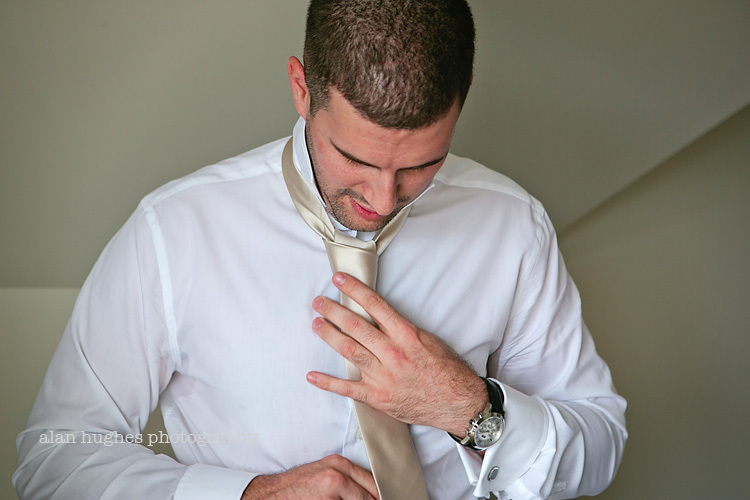 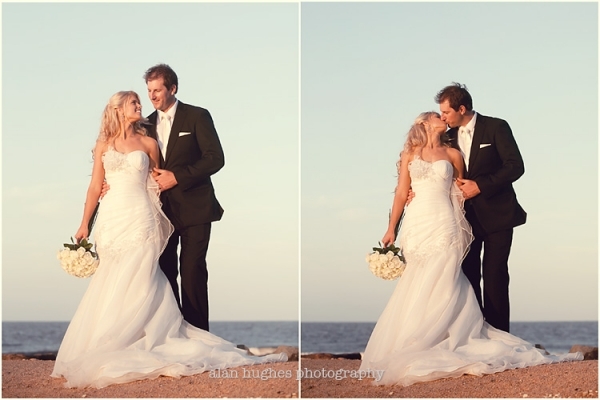 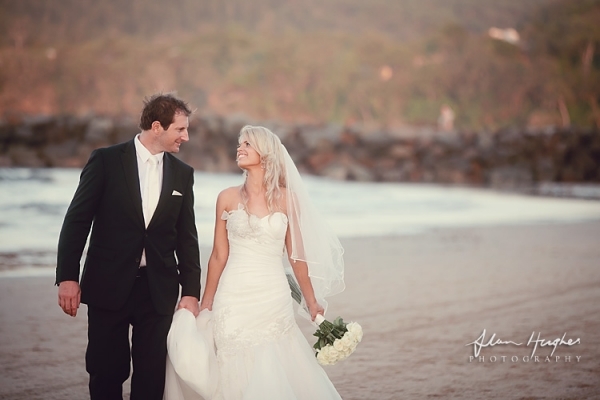 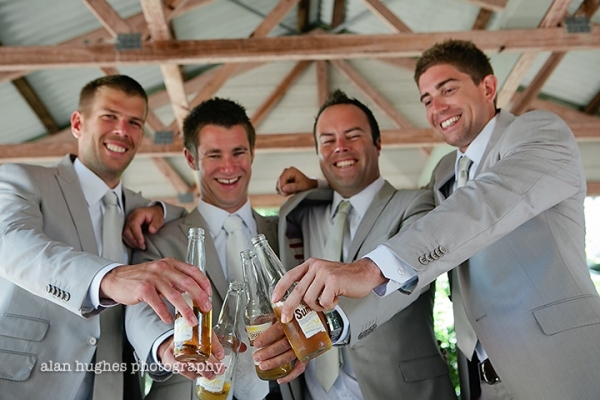 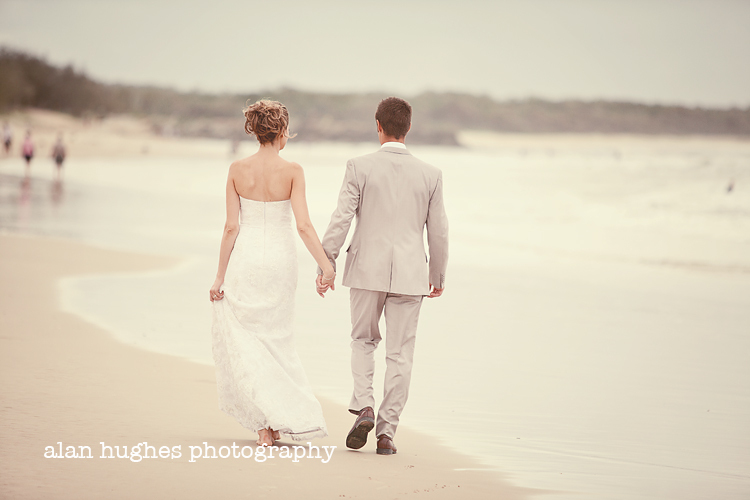 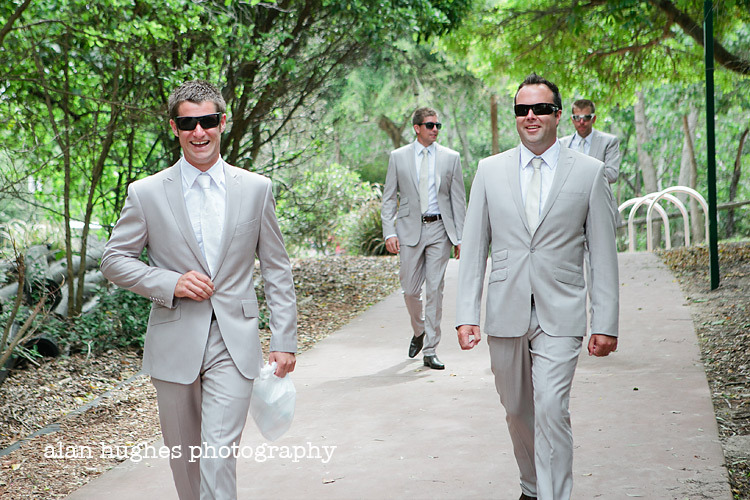 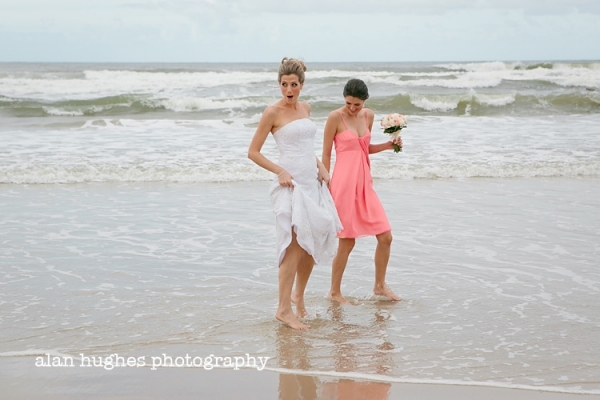 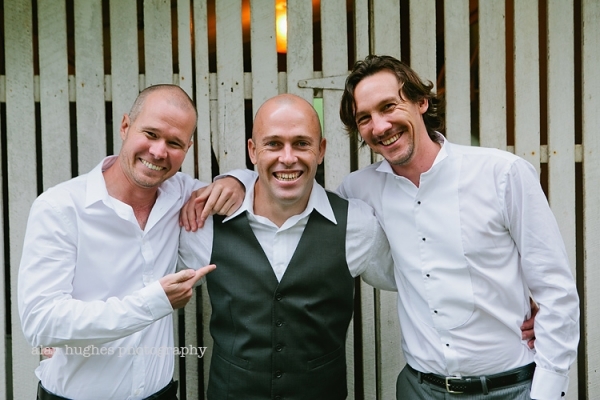 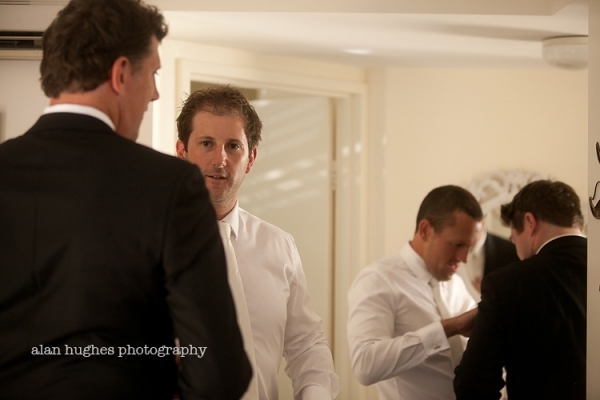 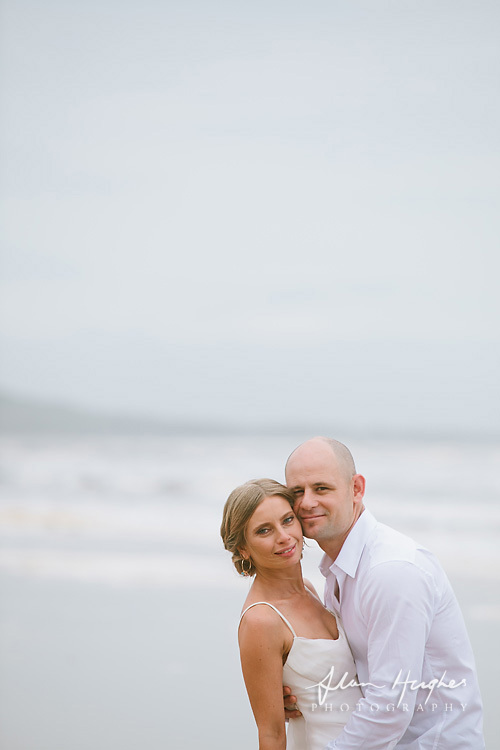 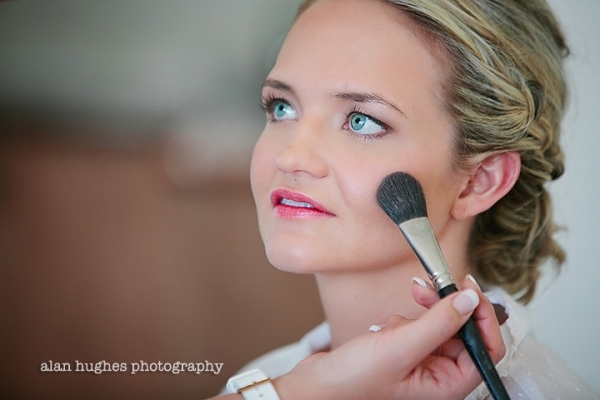 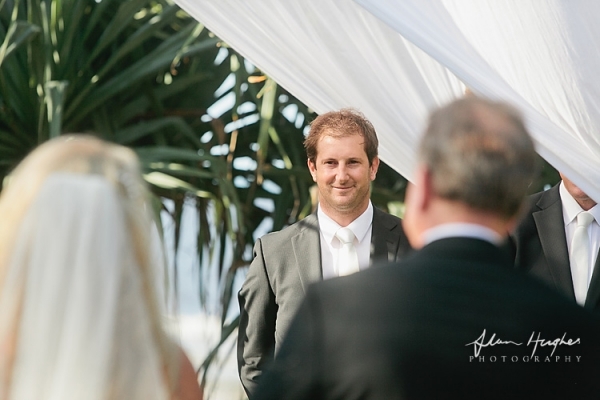 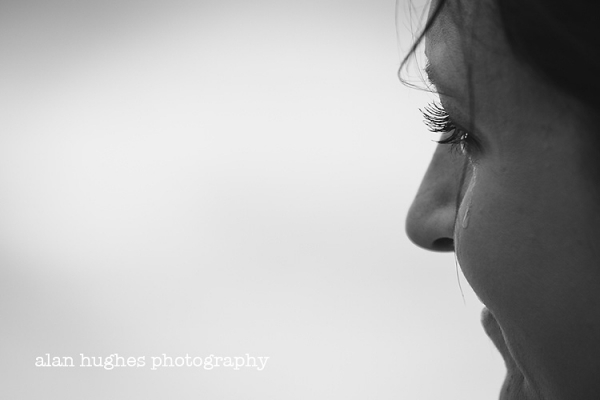 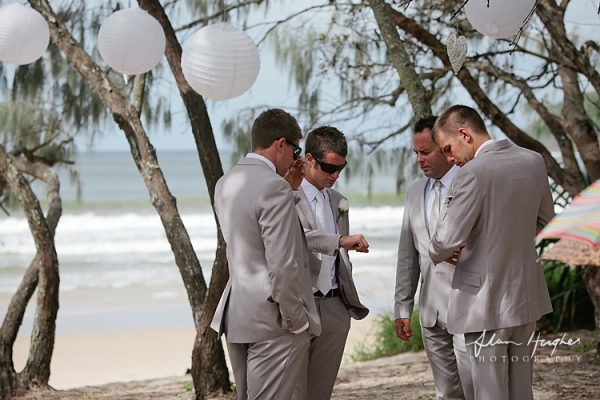 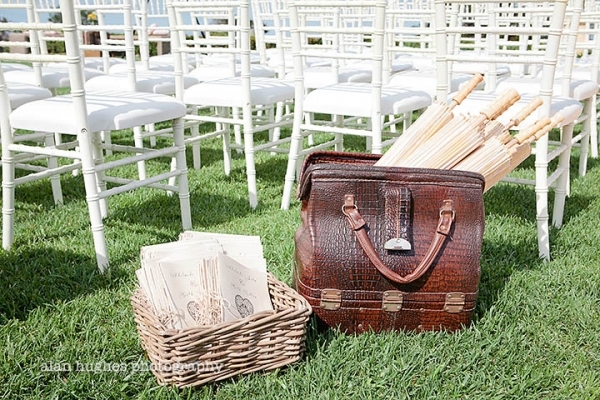 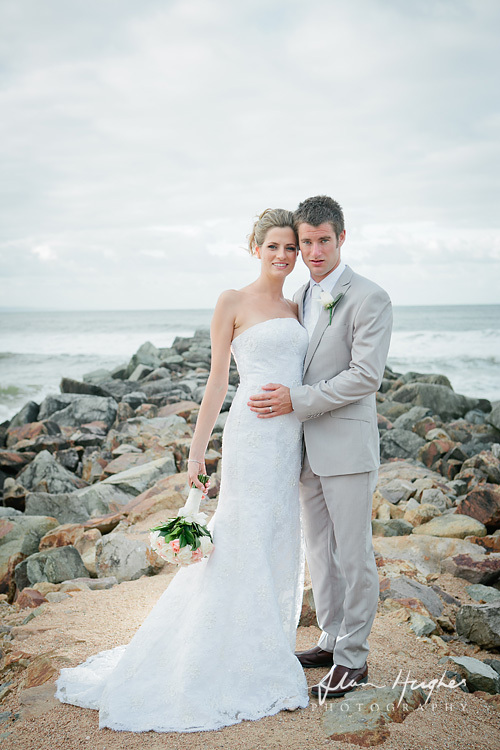 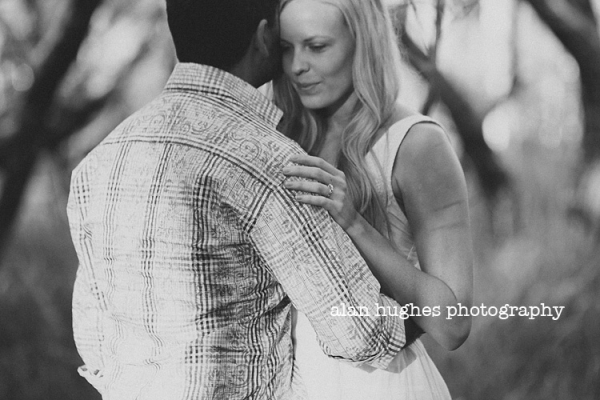 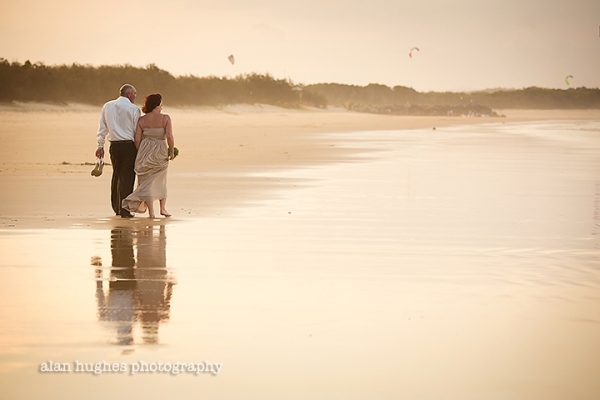 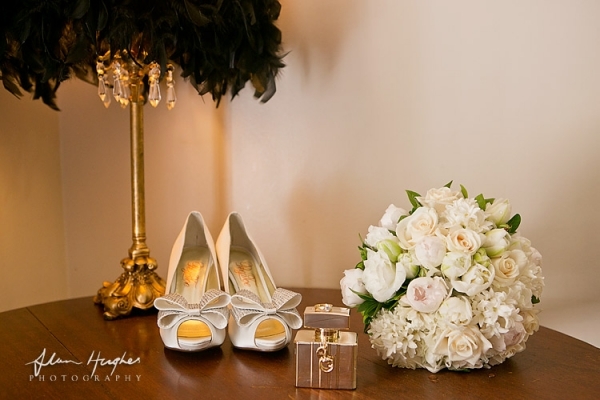 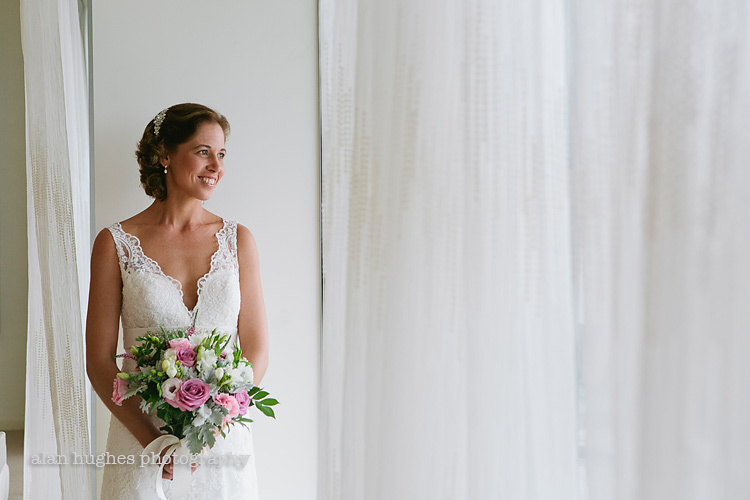 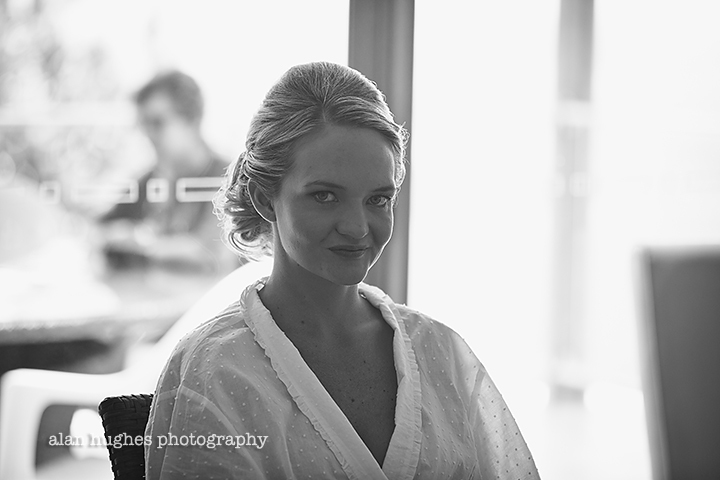 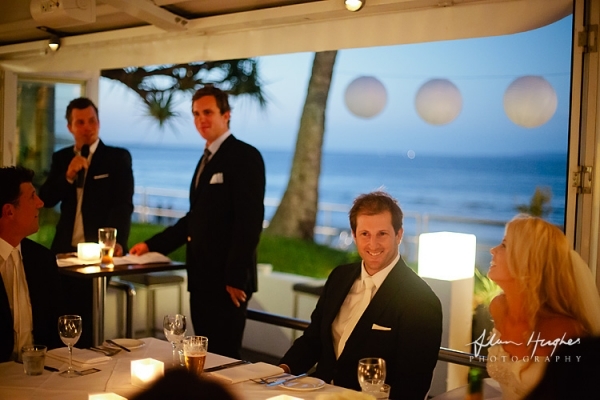 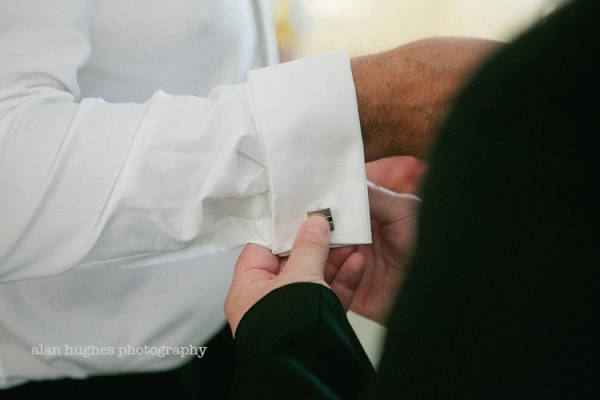 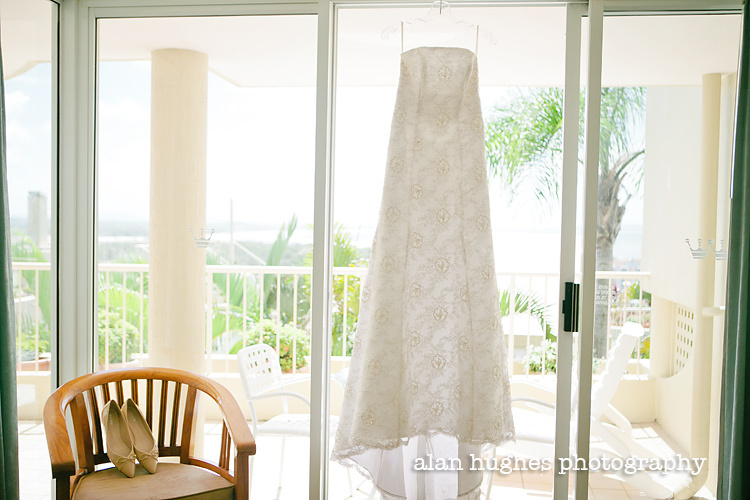 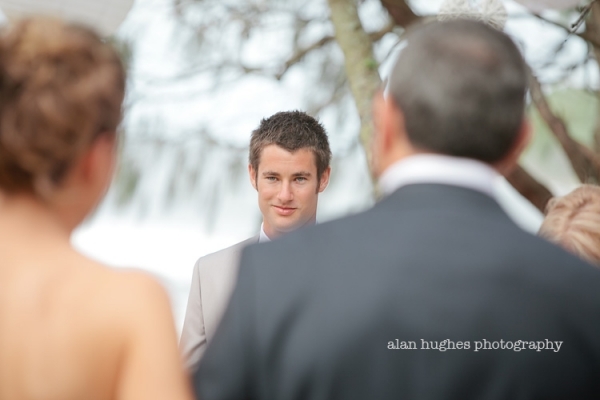 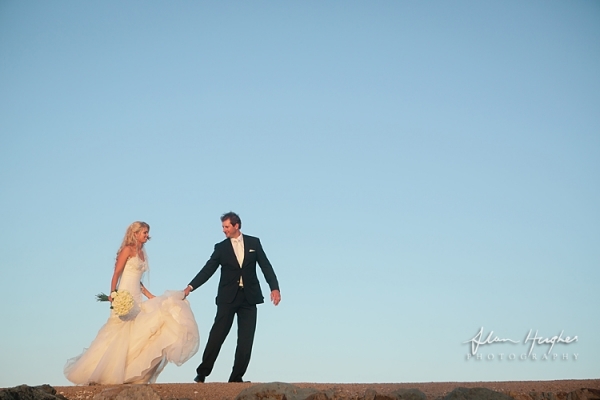 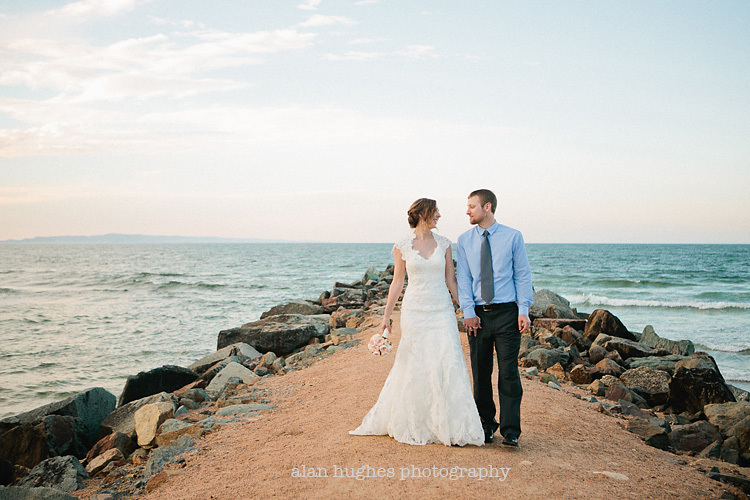 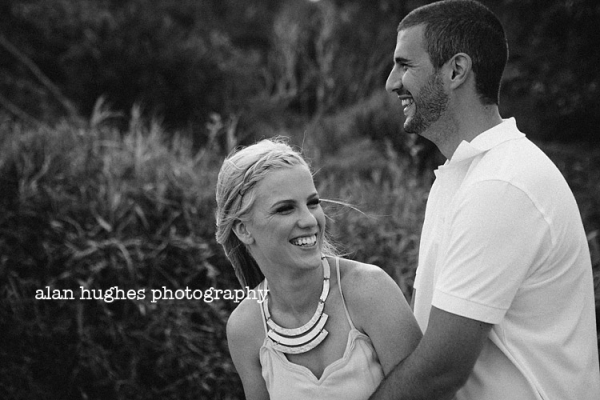 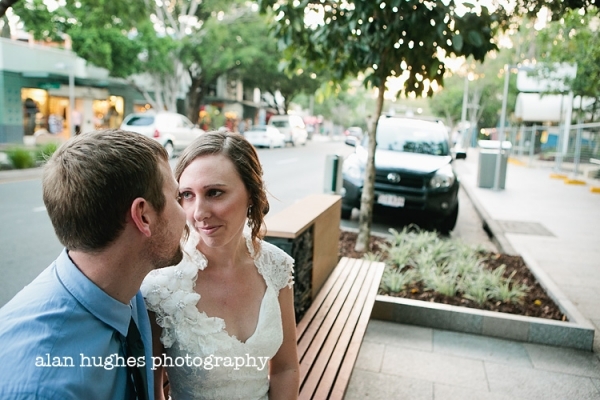 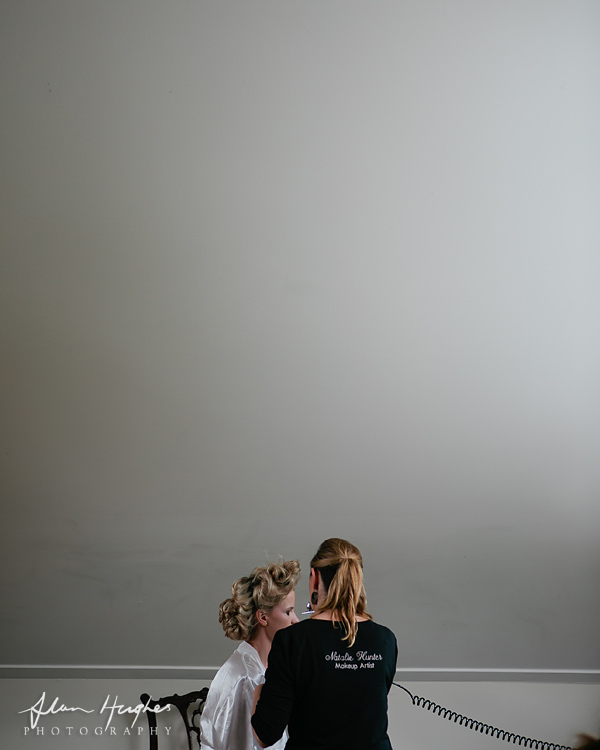 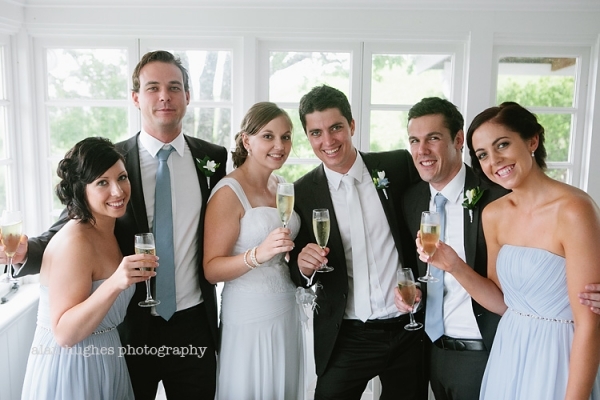 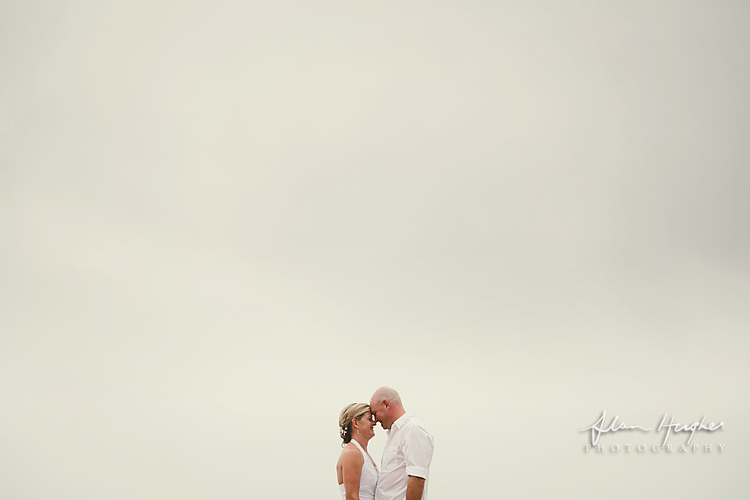 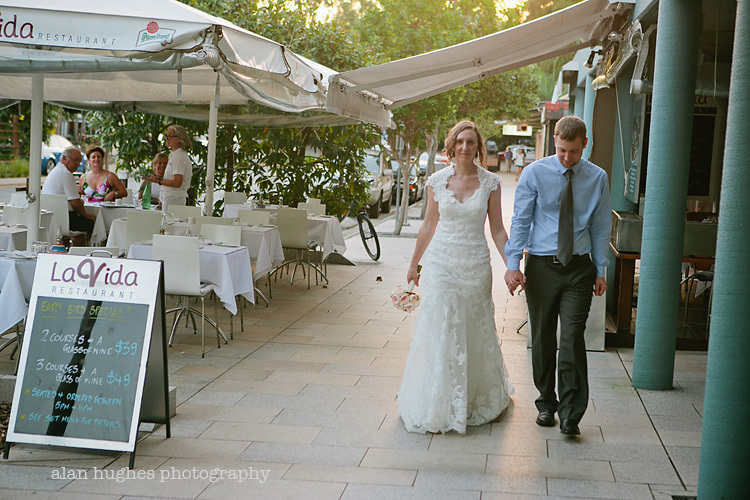 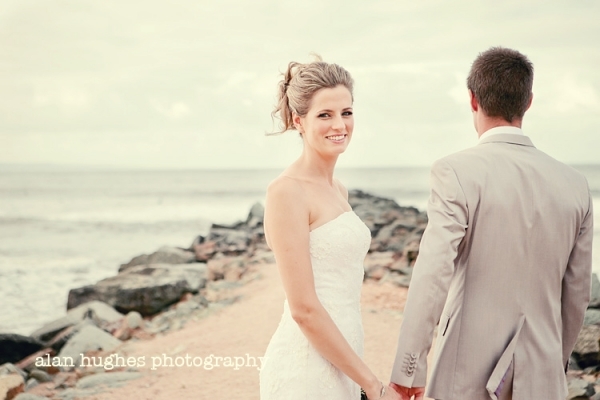 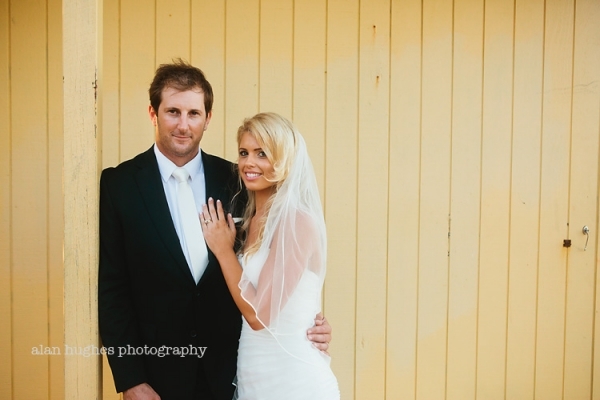 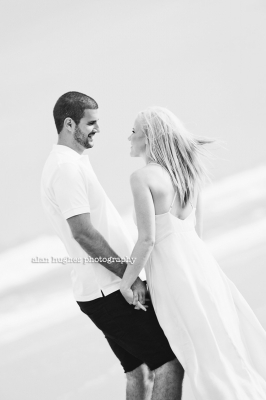 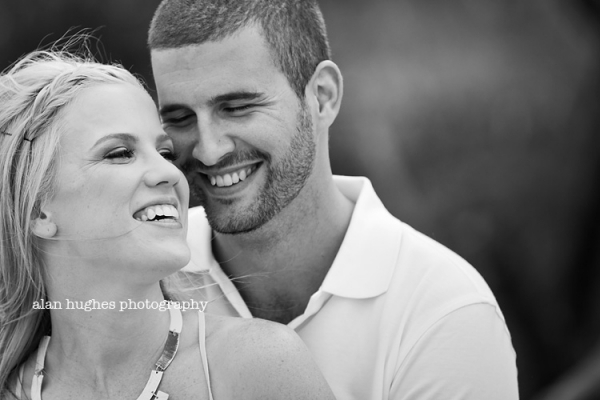 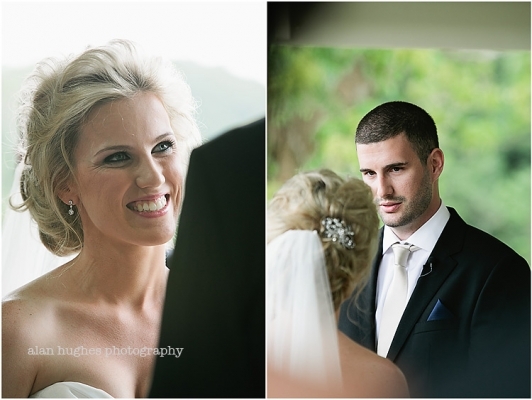 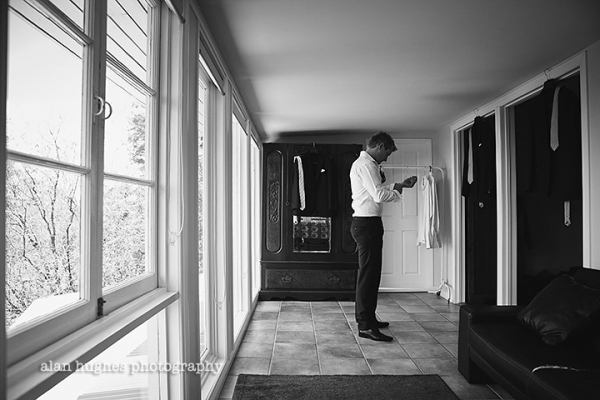 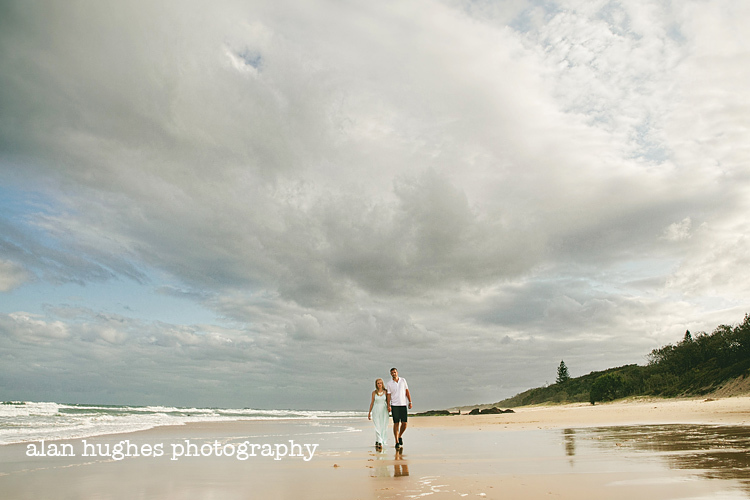 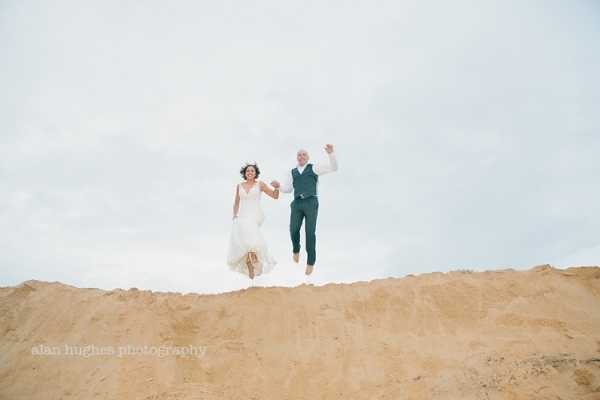 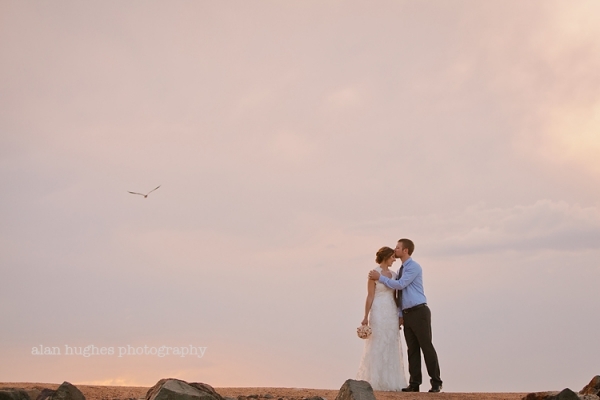 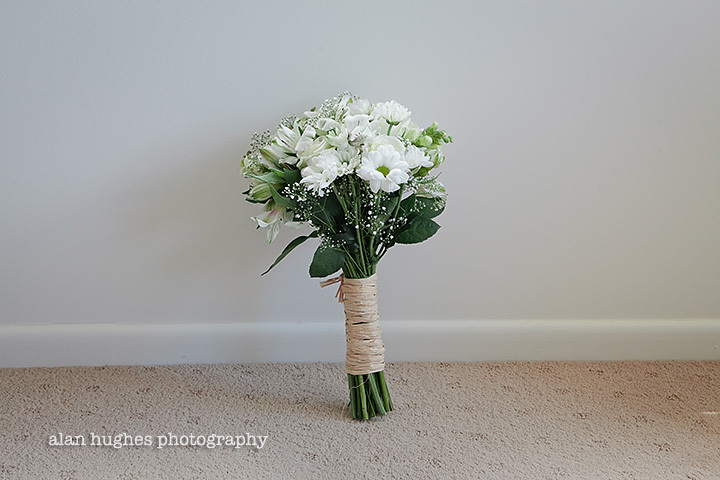 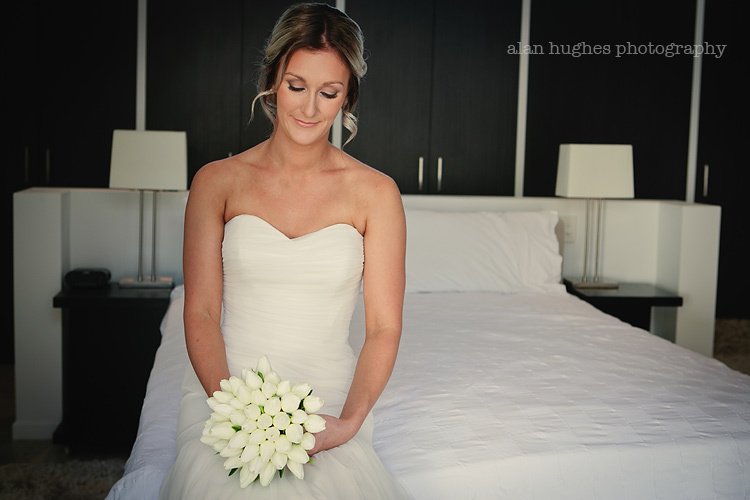 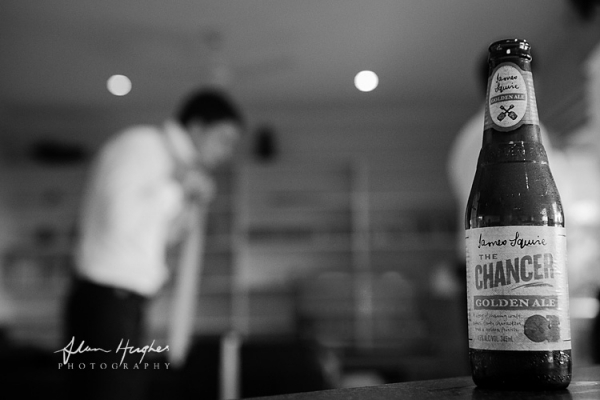 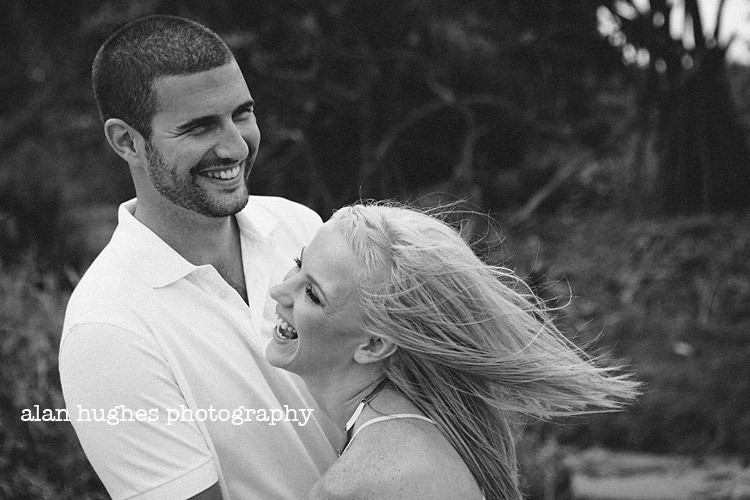 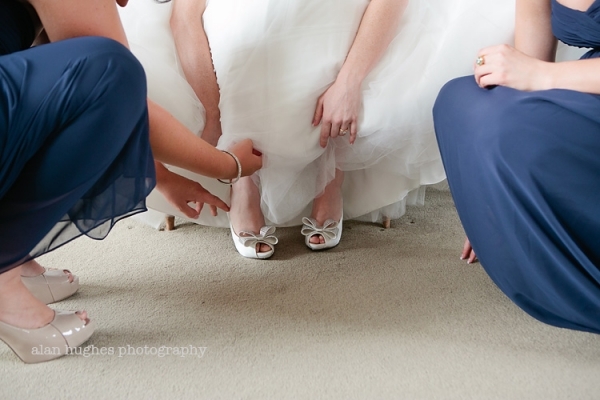 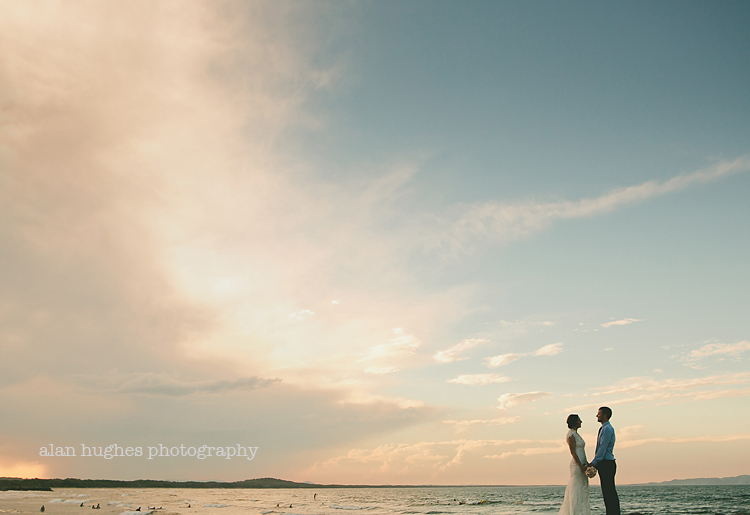 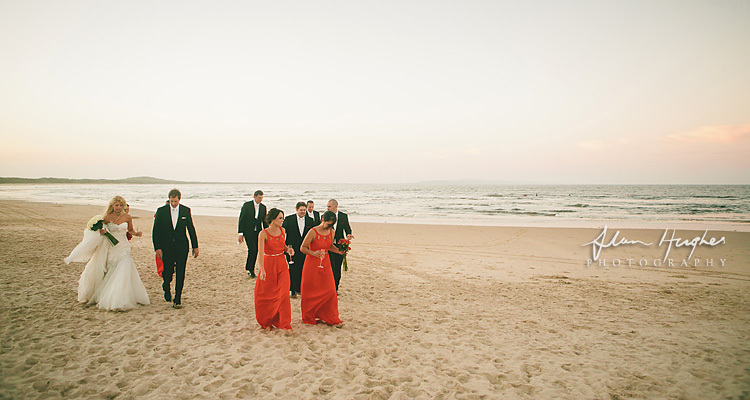 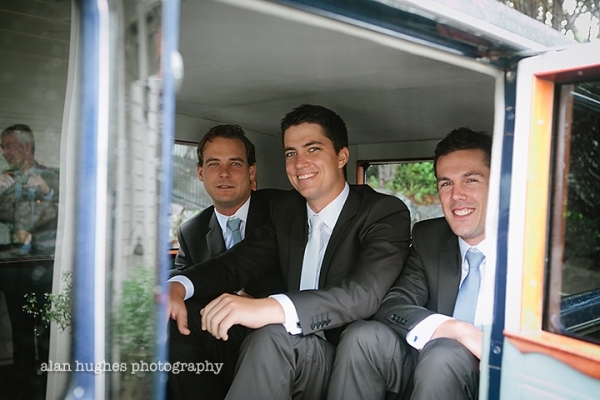 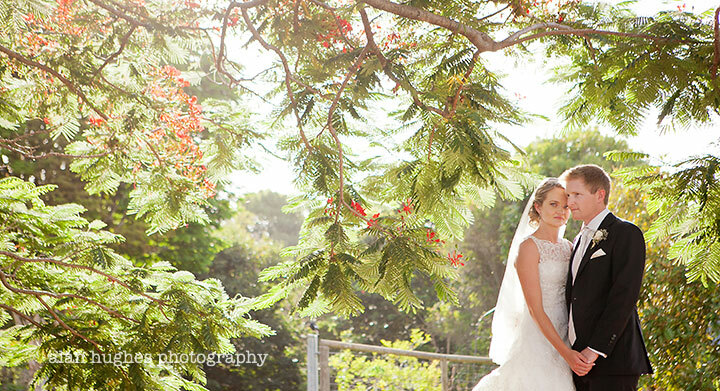 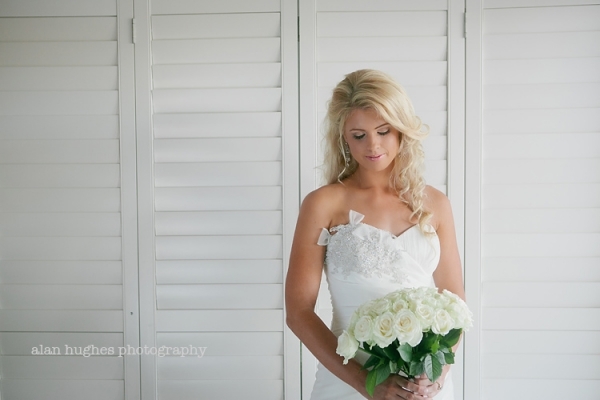 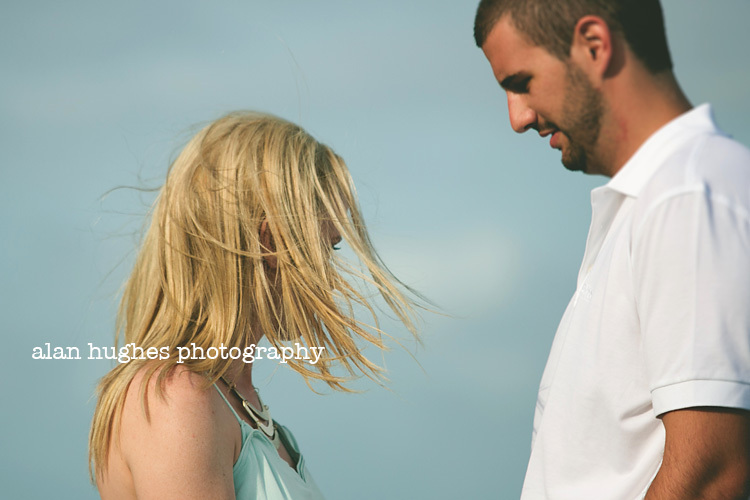 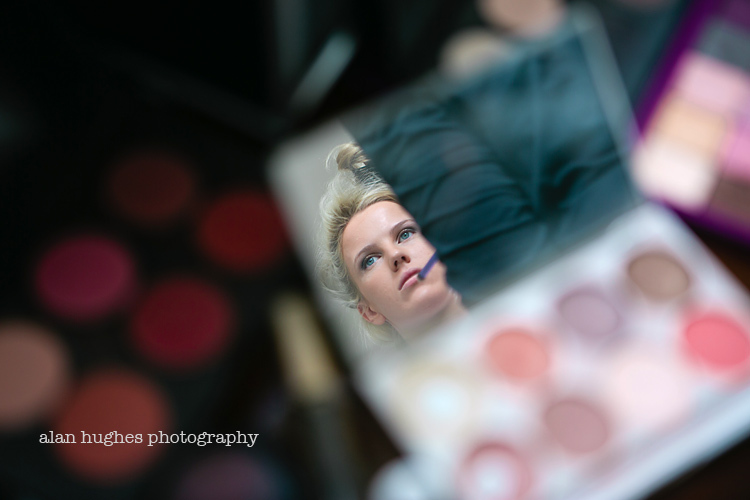 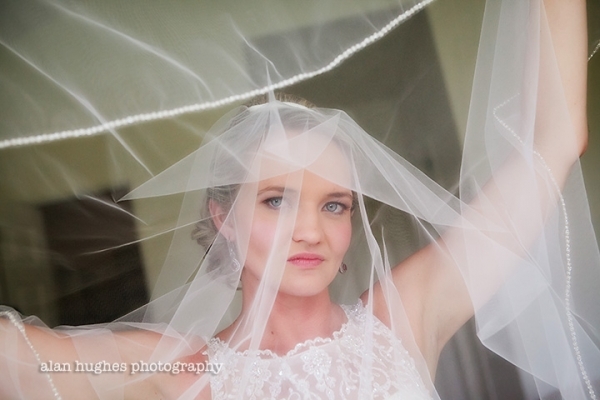 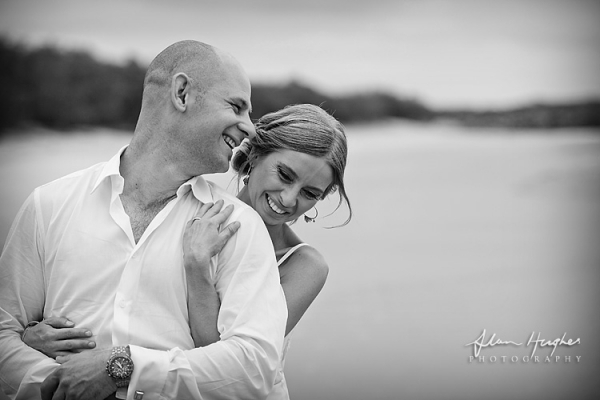 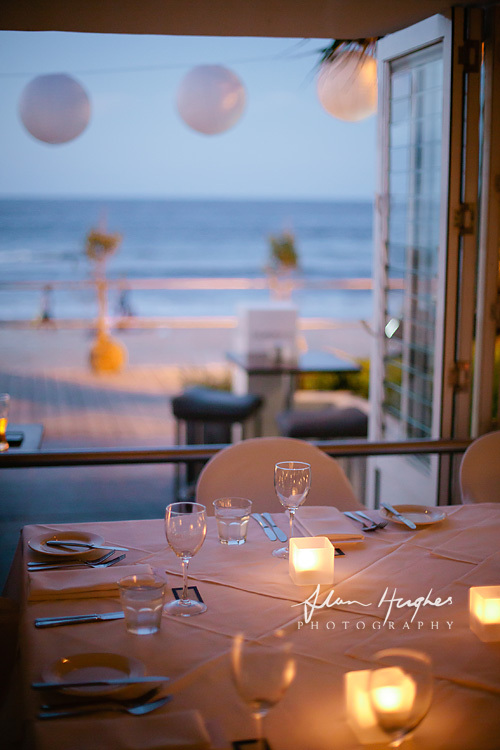 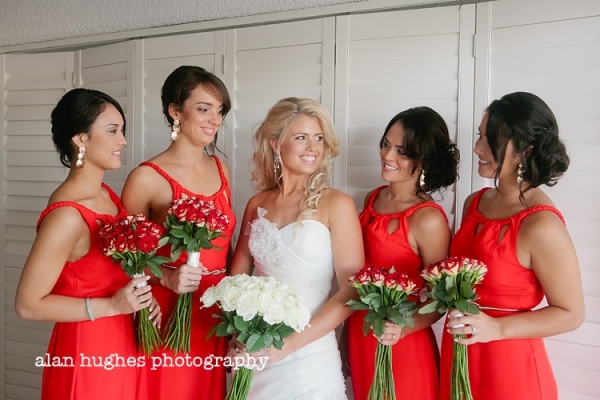 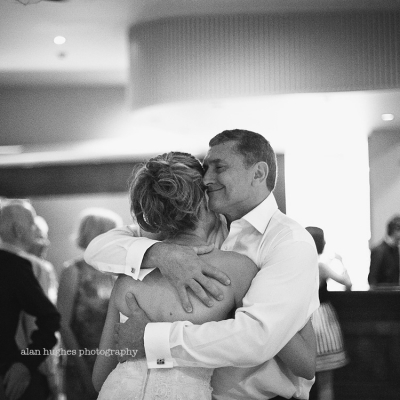 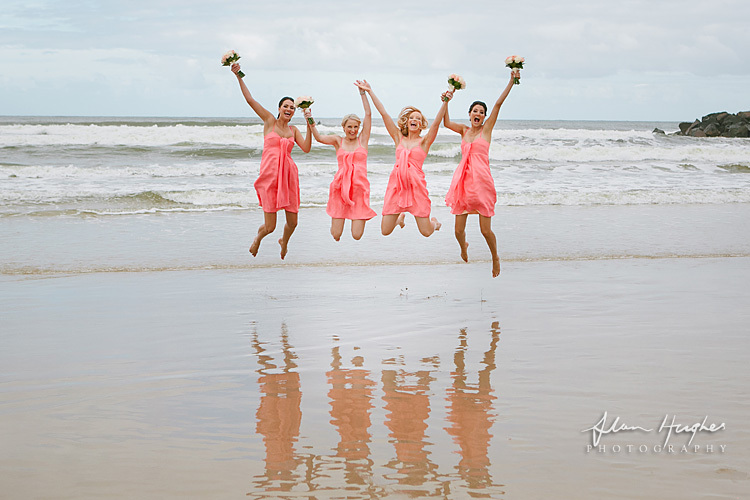 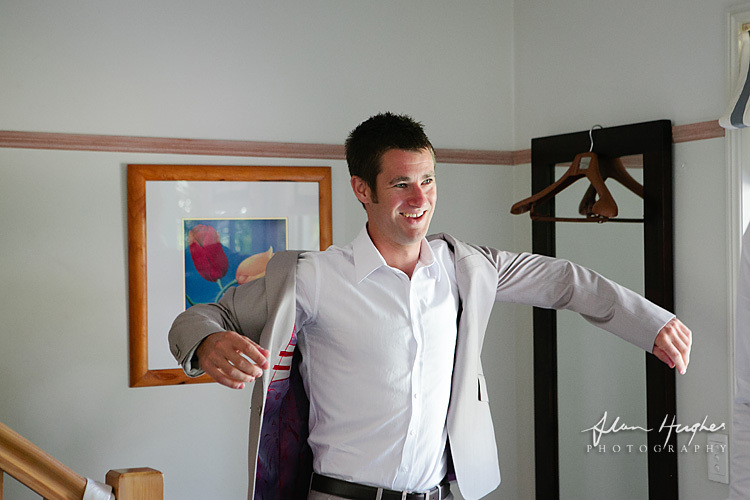 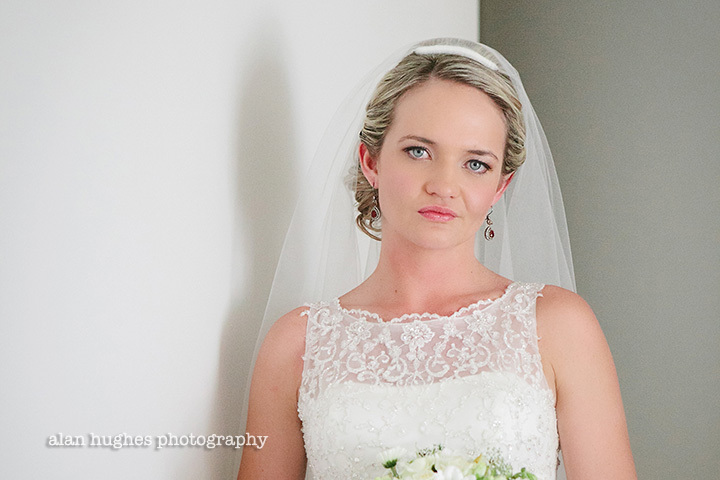 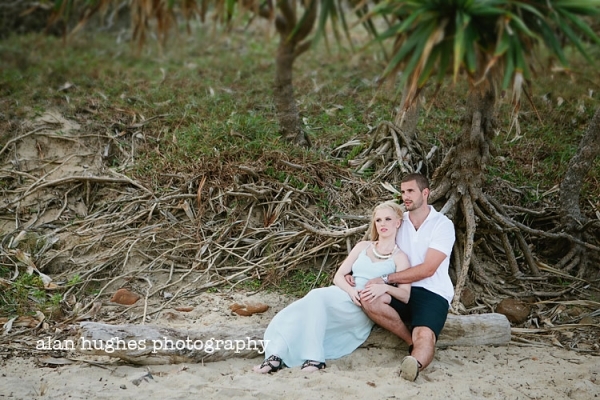 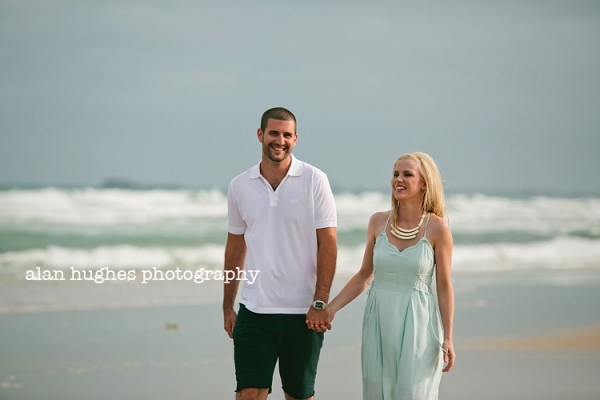 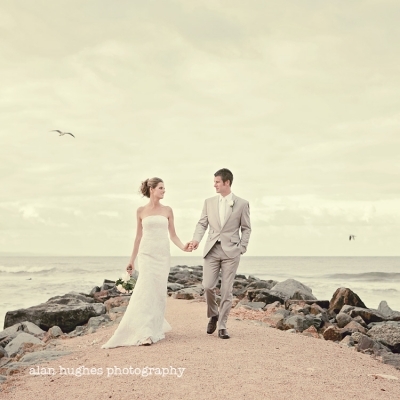 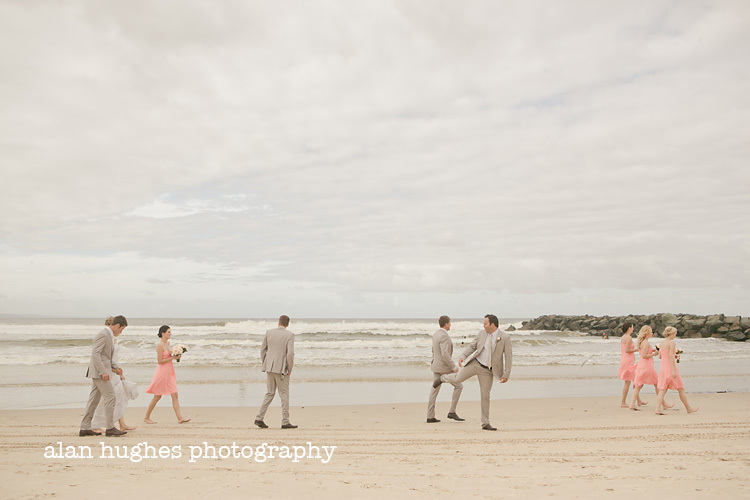 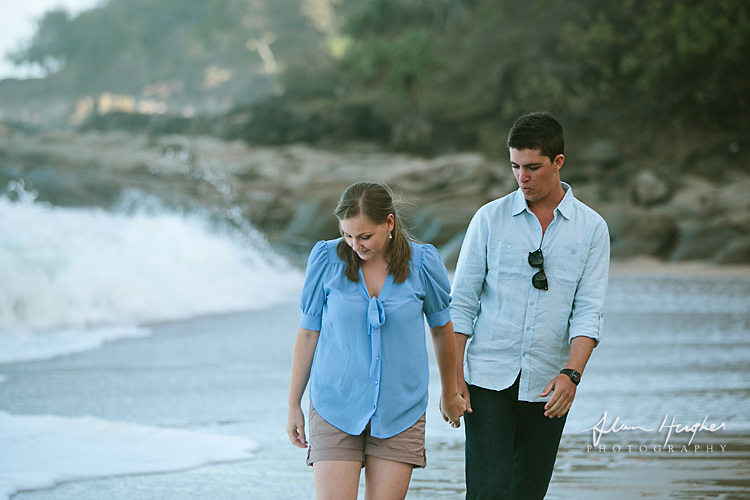 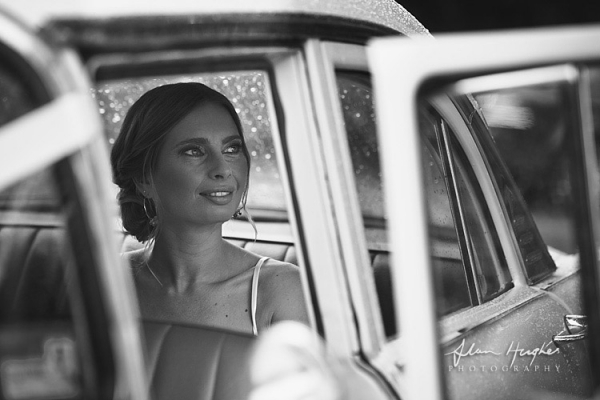 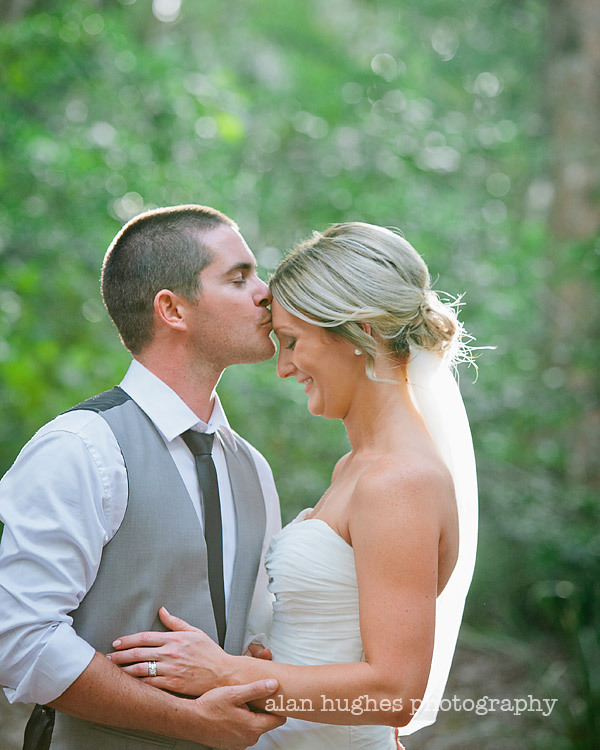 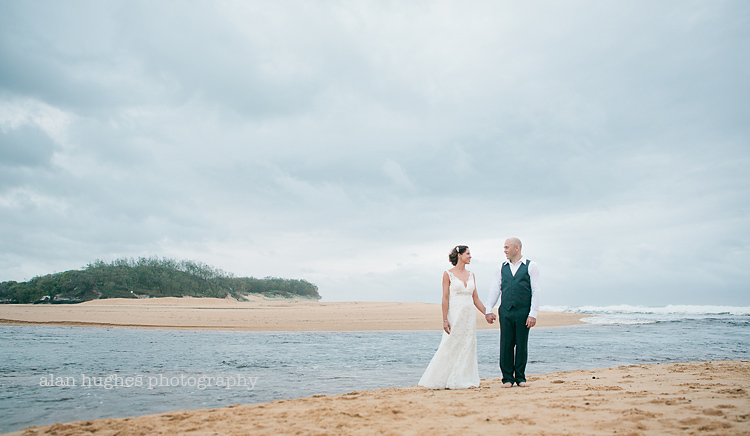 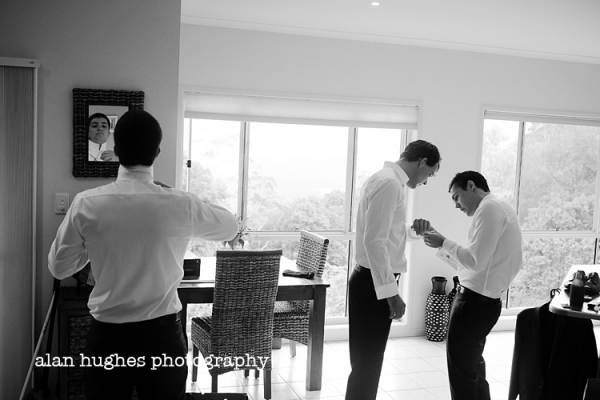 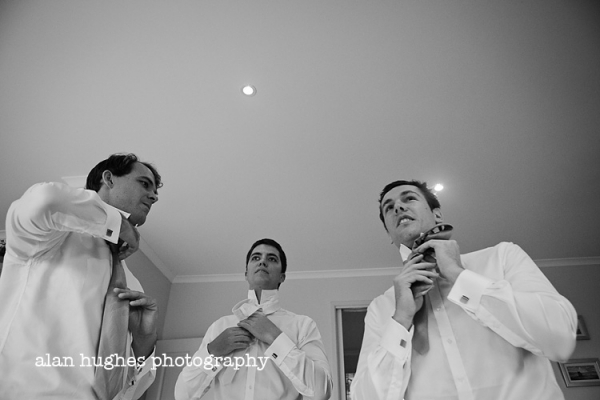 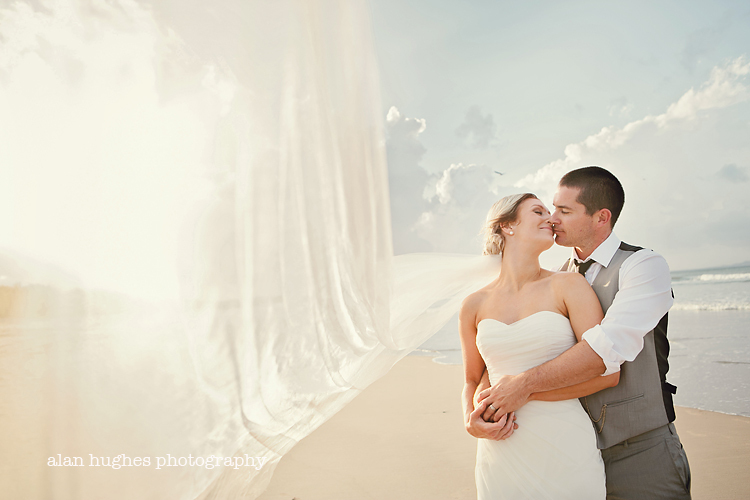 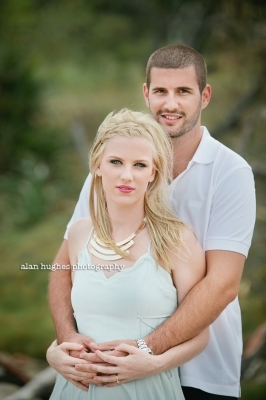 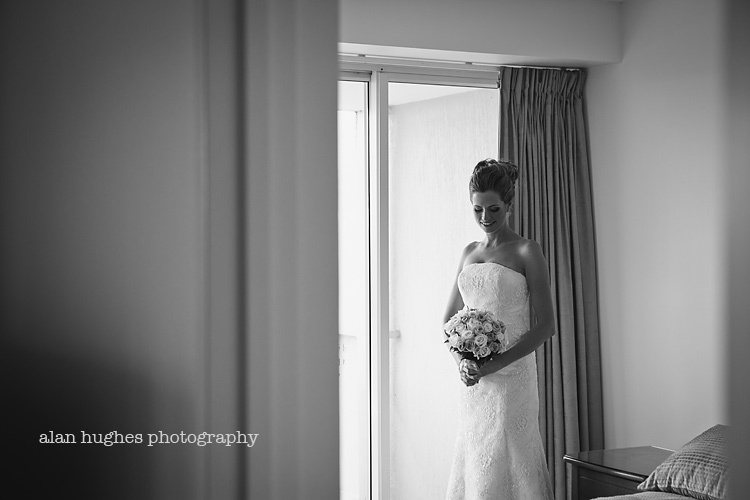 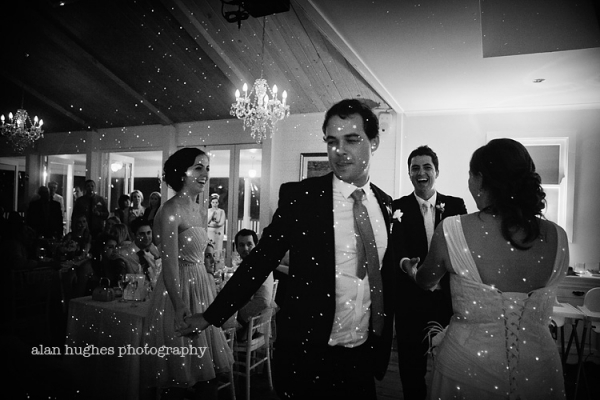 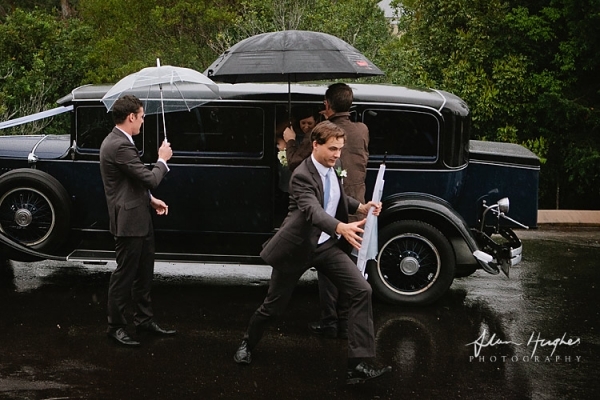 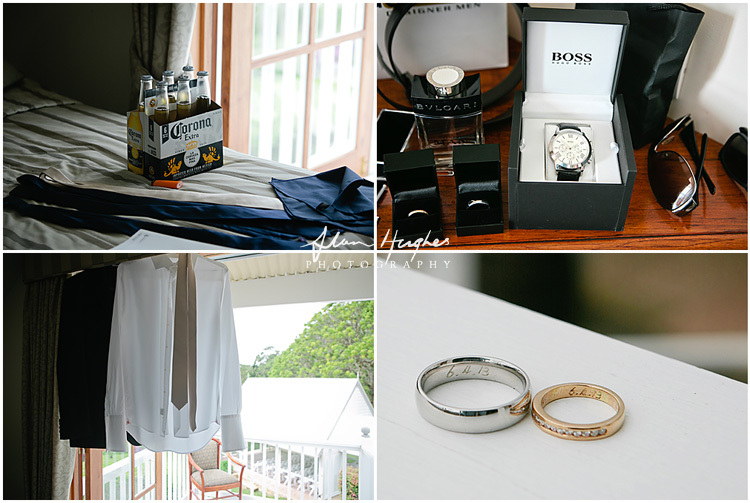 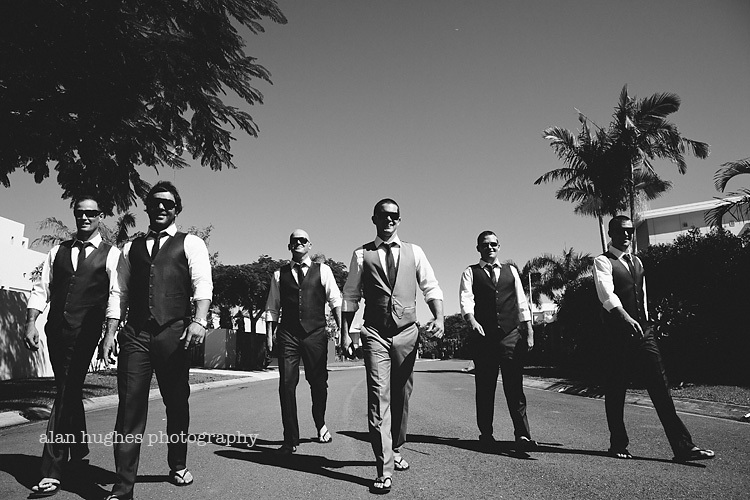 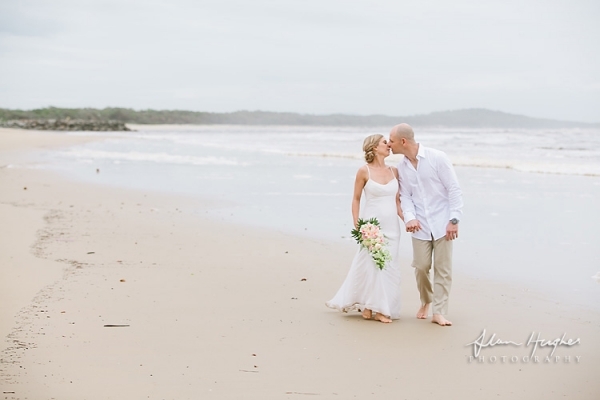 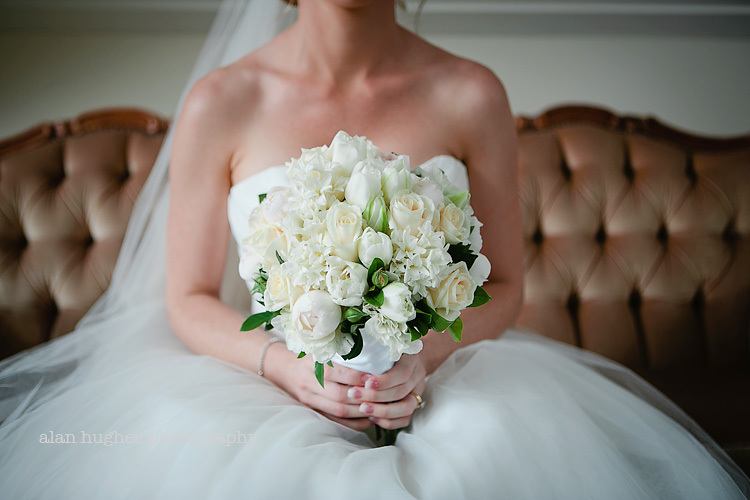 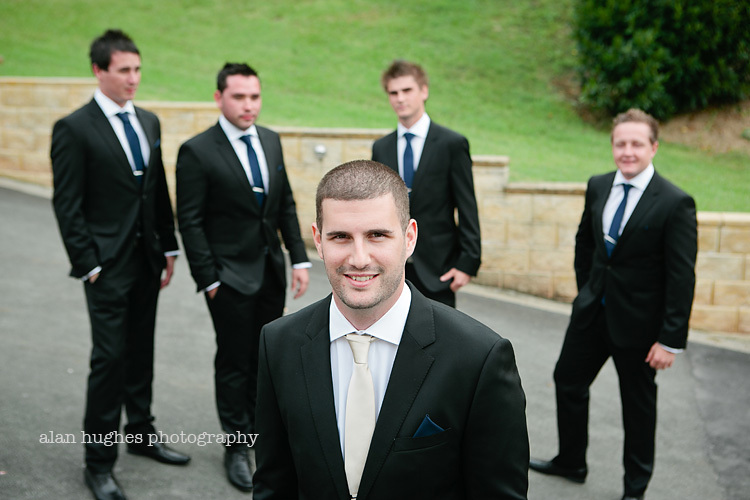 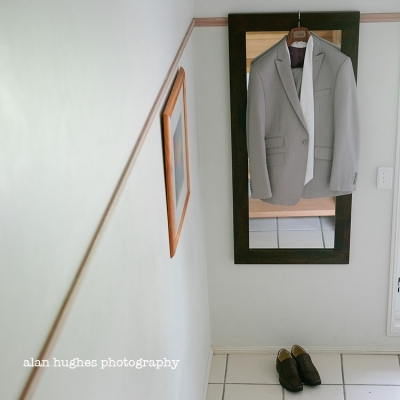 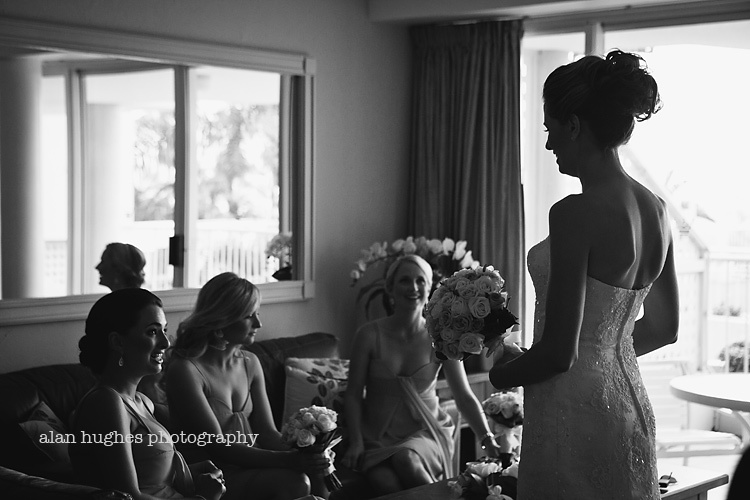 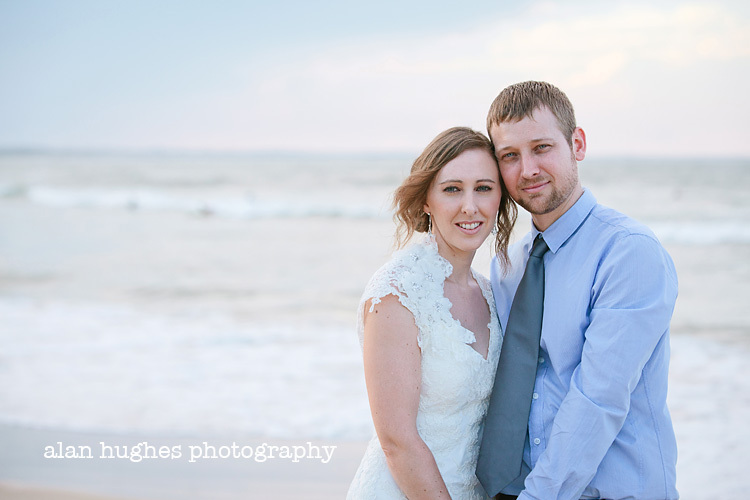 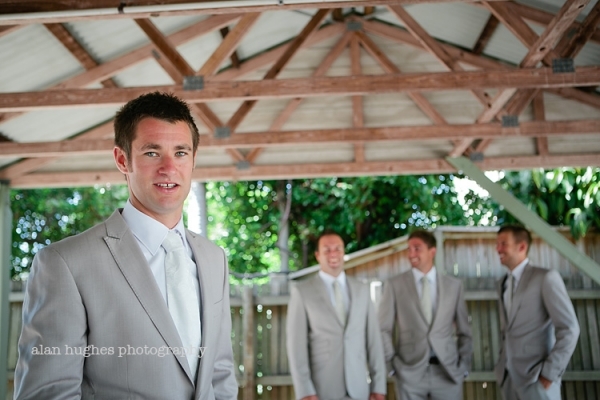 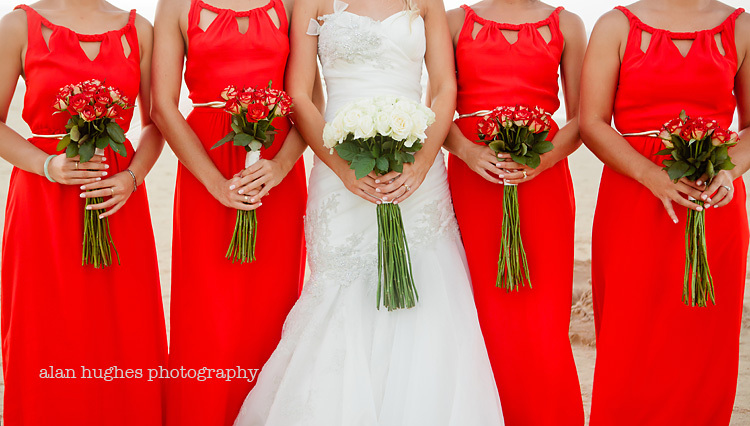 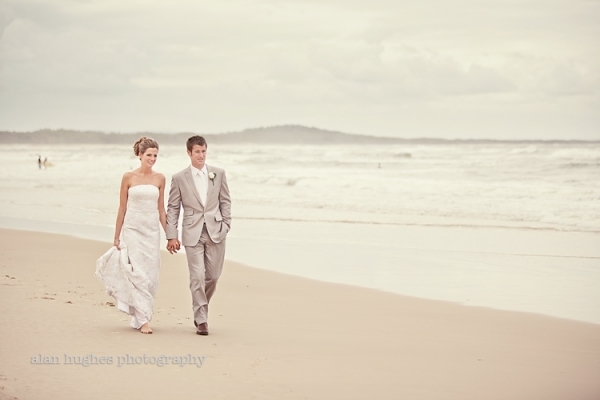 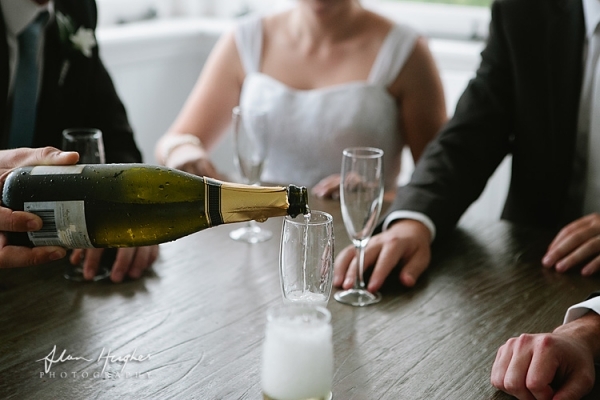 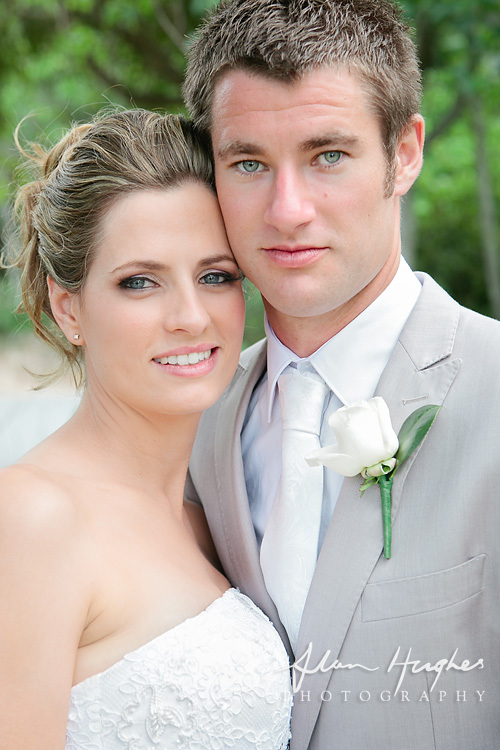 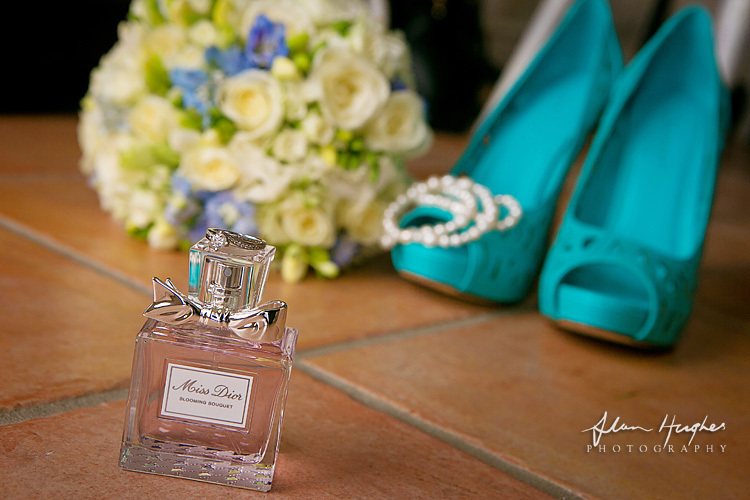 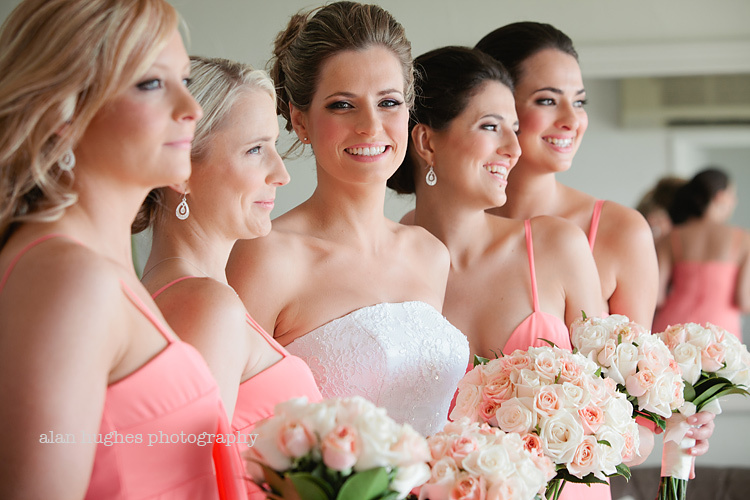 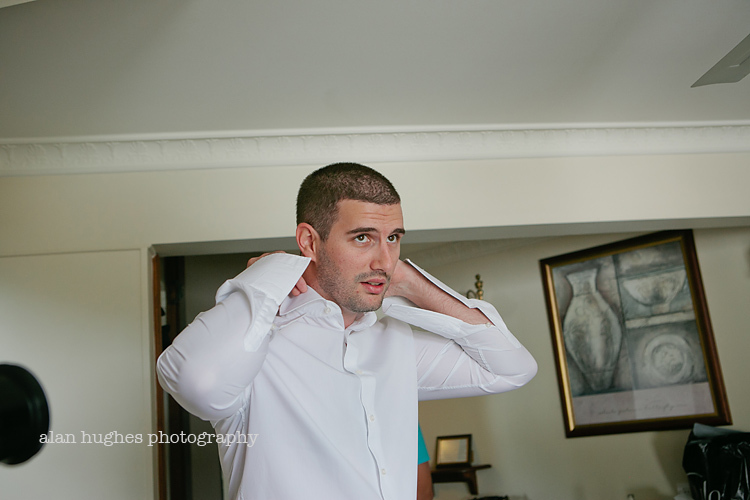 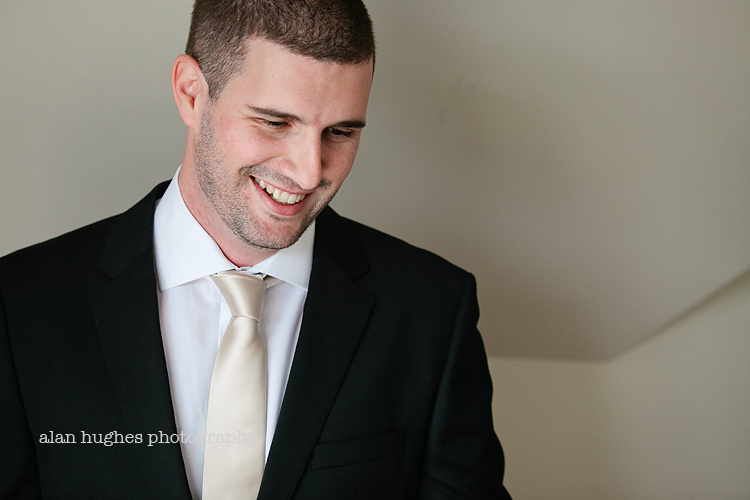 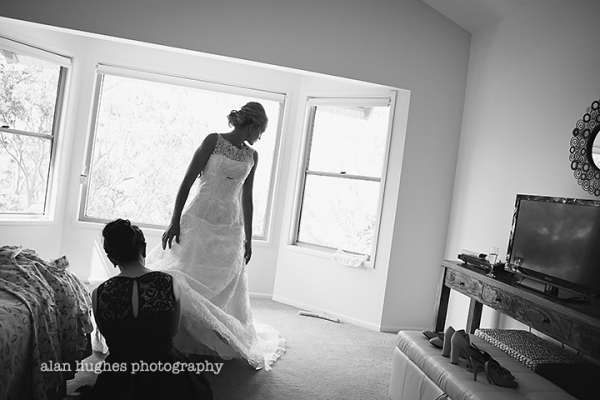 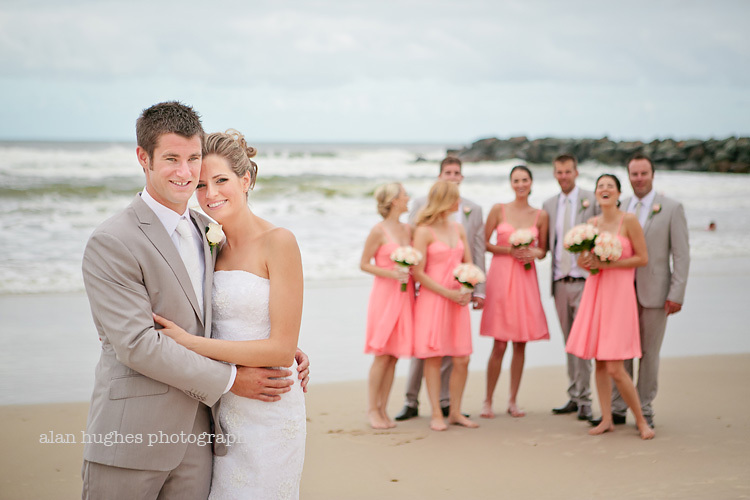 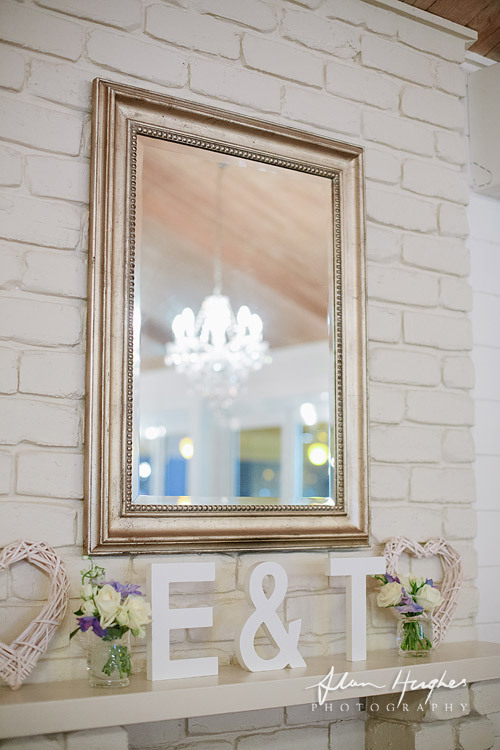 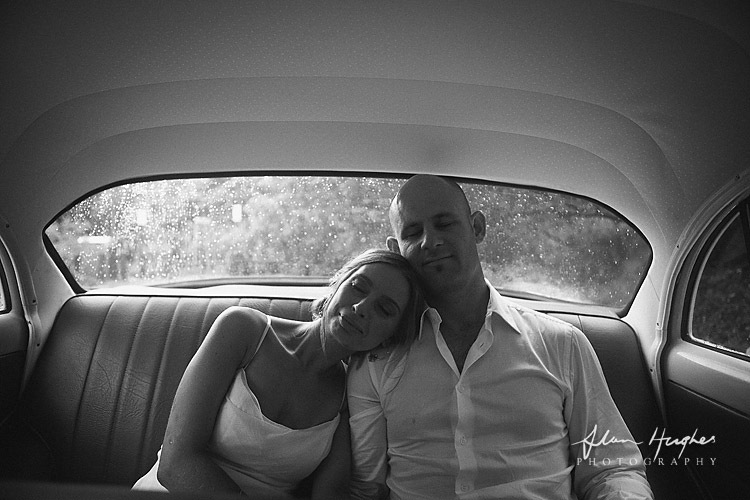 Christian & Alex came all the way from the South of France for their beautiful Noosa Main Beach wedding. The sky provided the most wonderful backdrop for this special occasion and it was a real pleasure to witness and capture these moments for them. 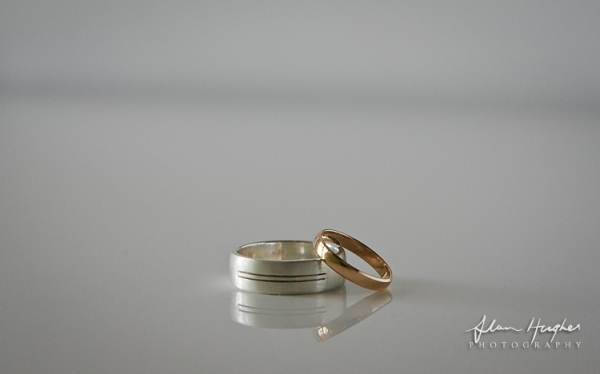 Congratulations to you both I wish you continued health and happiness. 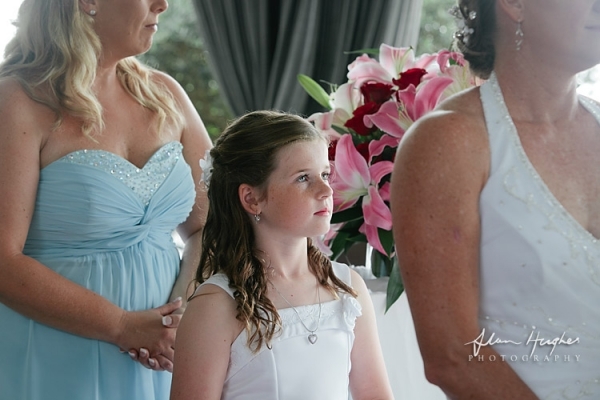 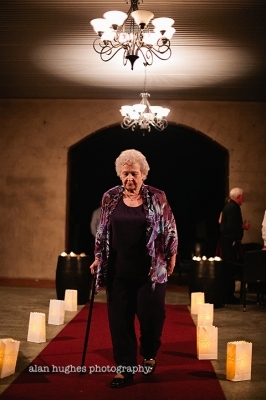 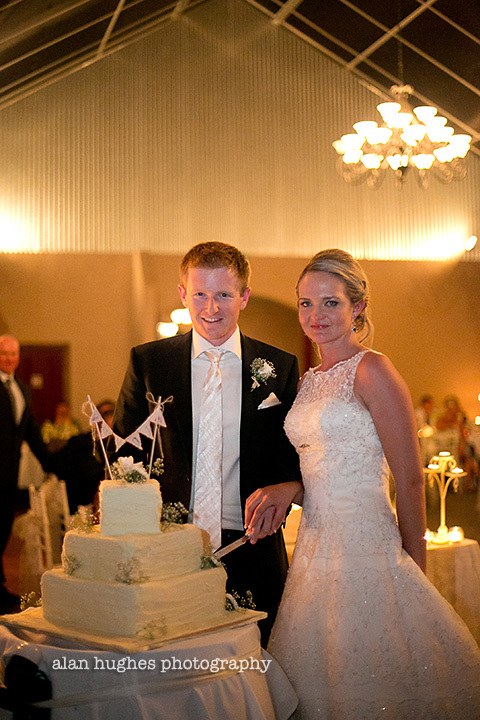 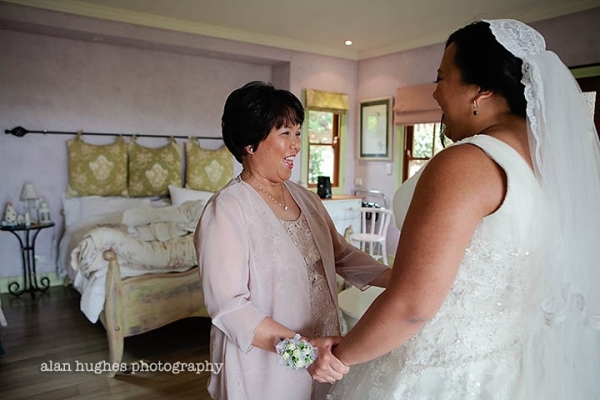 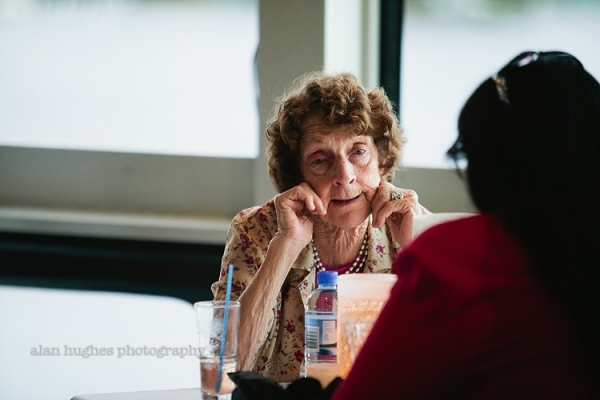 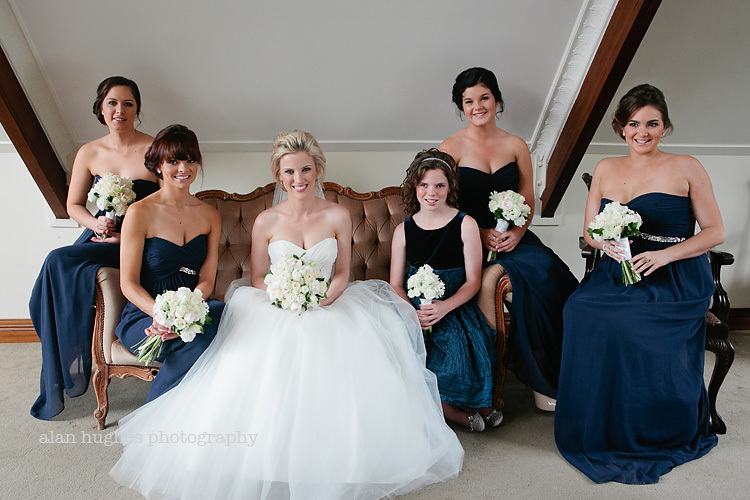 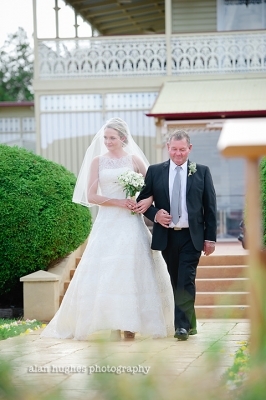 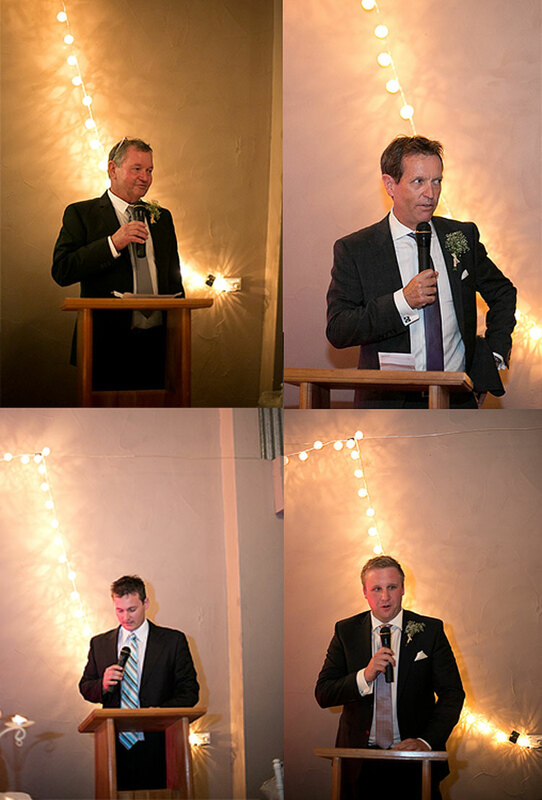 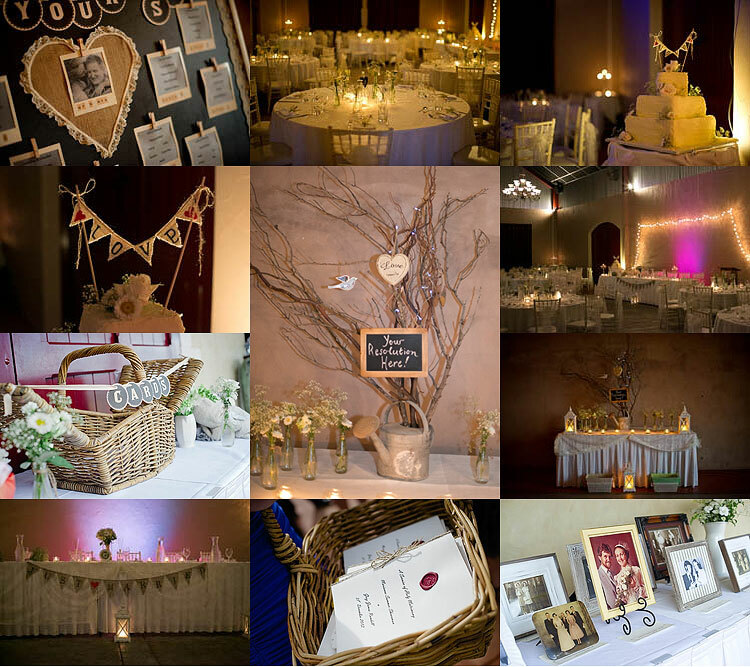 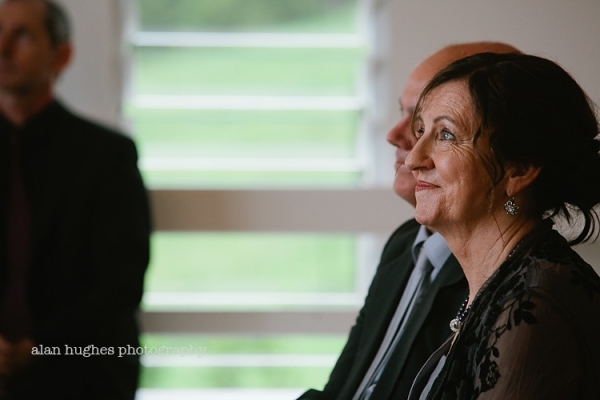 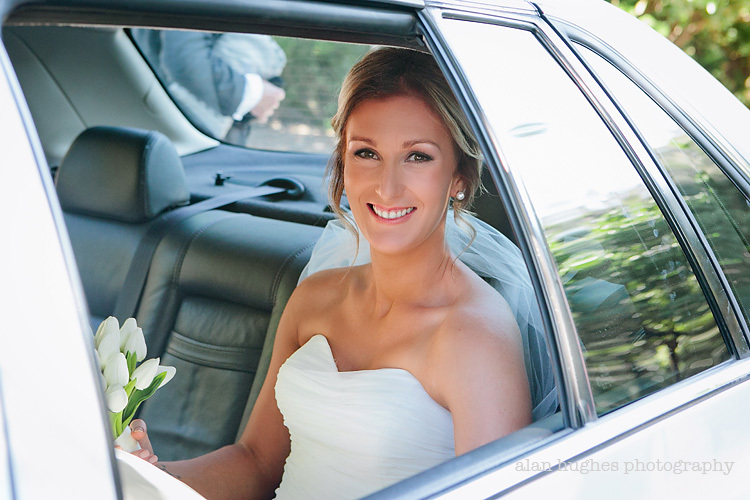 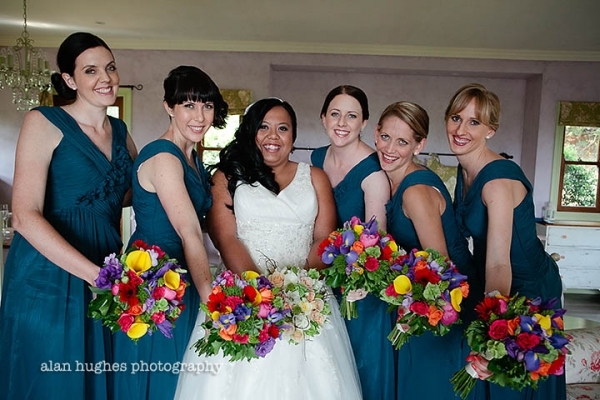 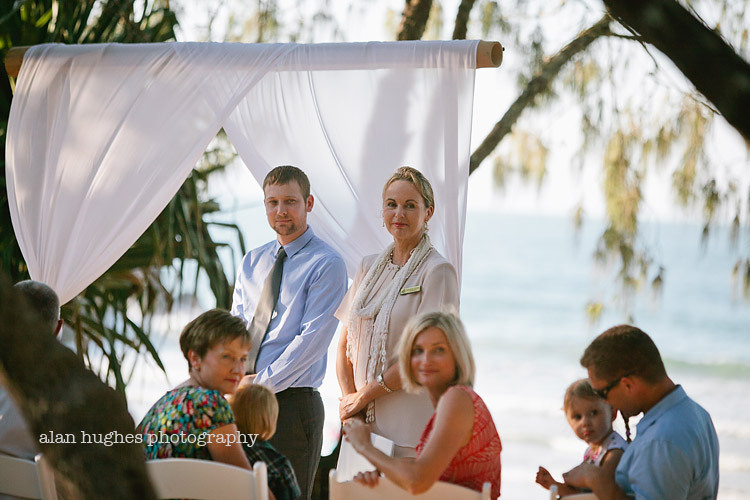 The celebrant was Jacqueline Gray, make-up by Vicki Nellis and the beach decorating by First Class Functions. 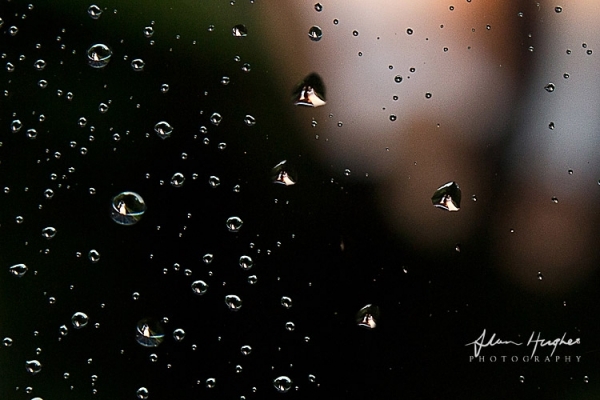 There seems to be a theme with my last few blog posts - rain. 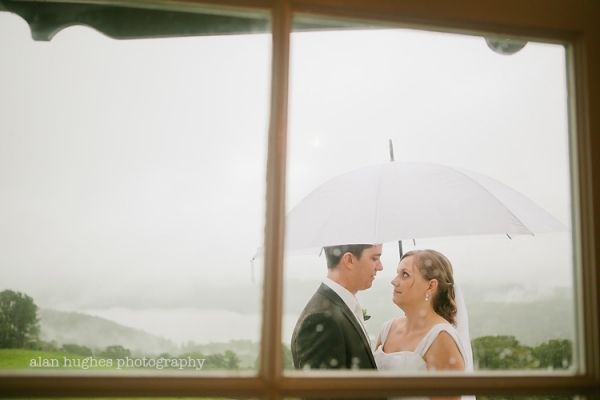 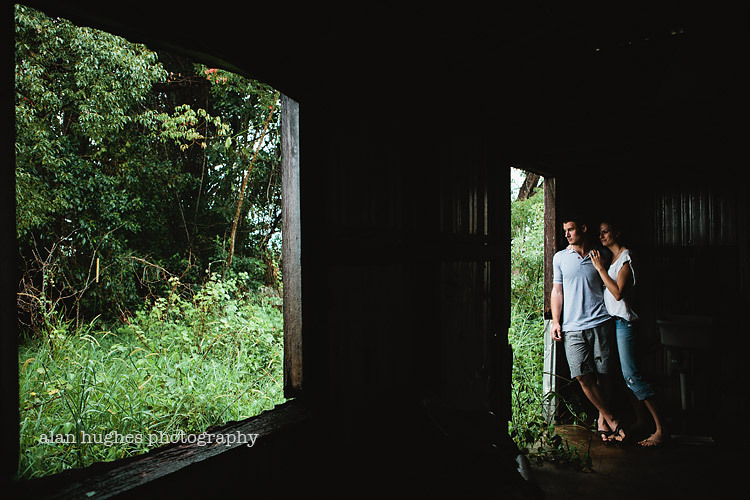 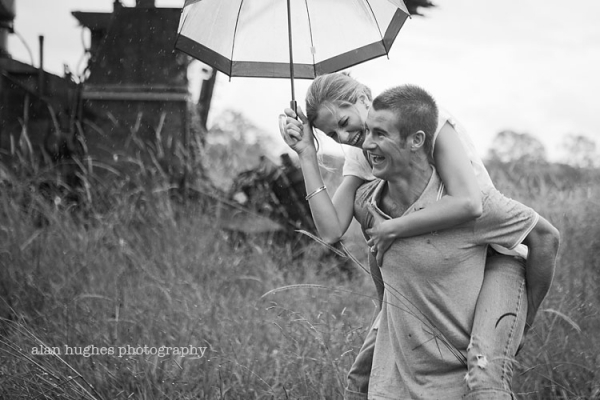 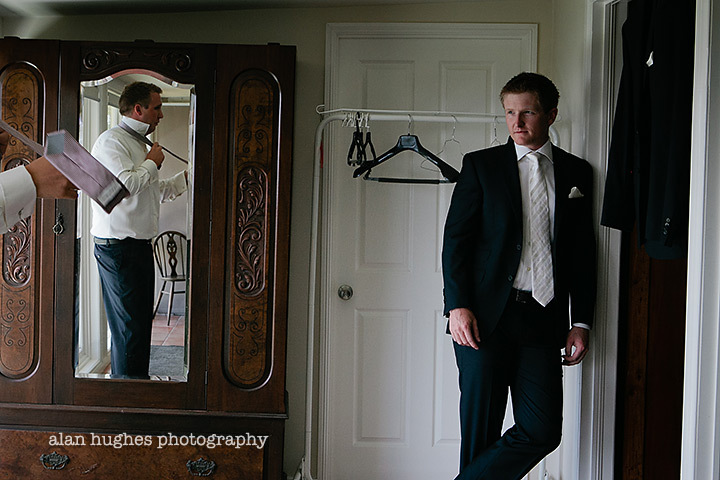 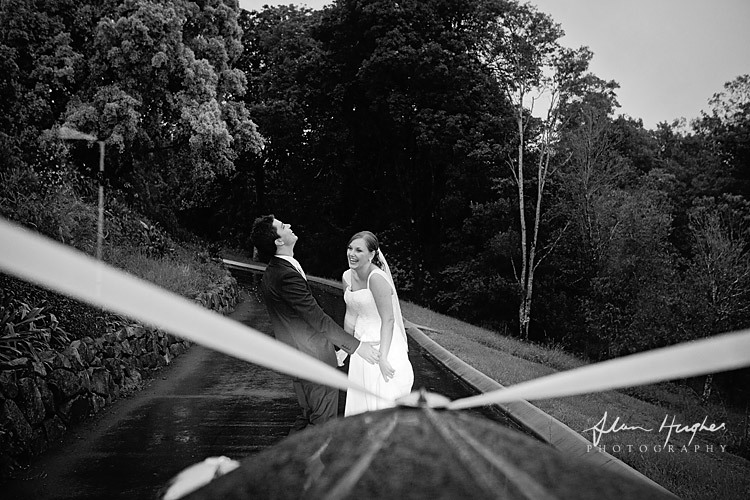 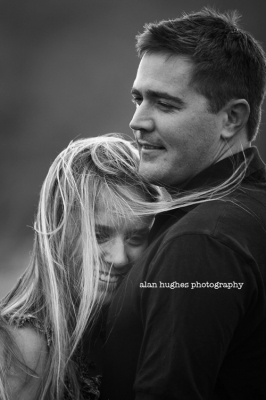 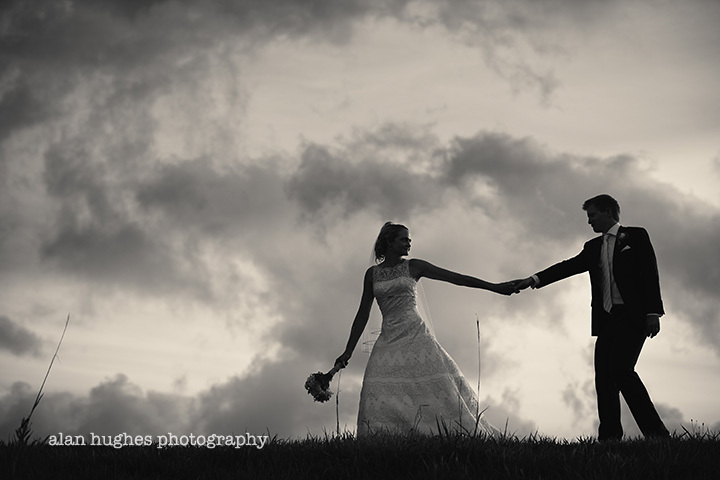 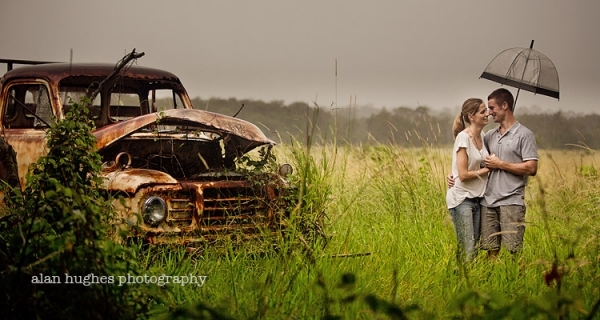 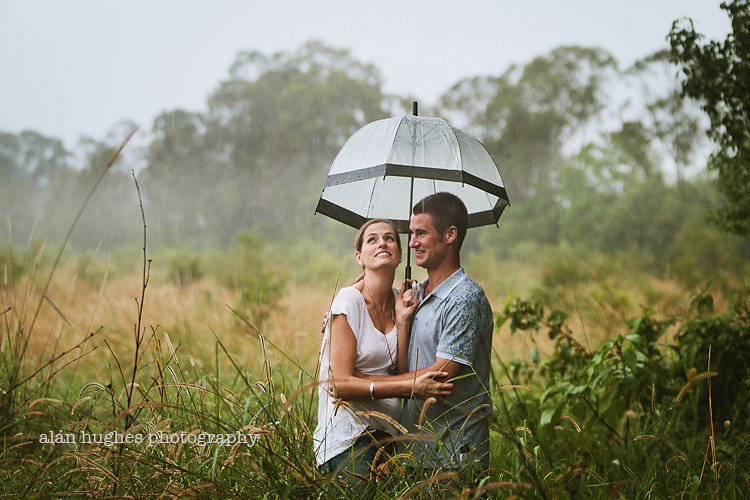 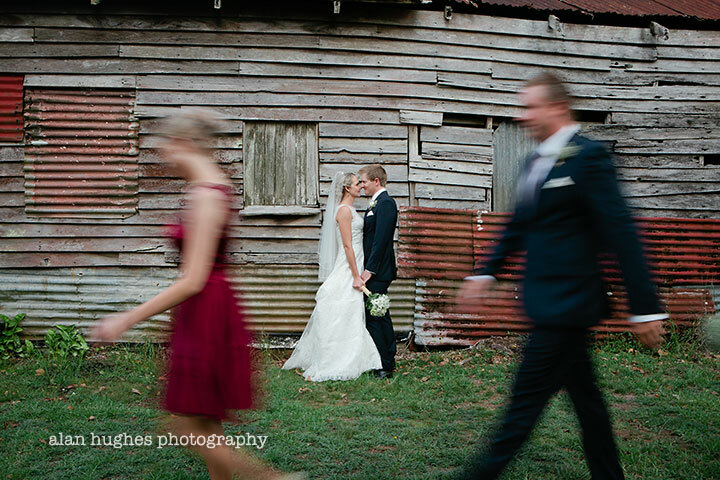 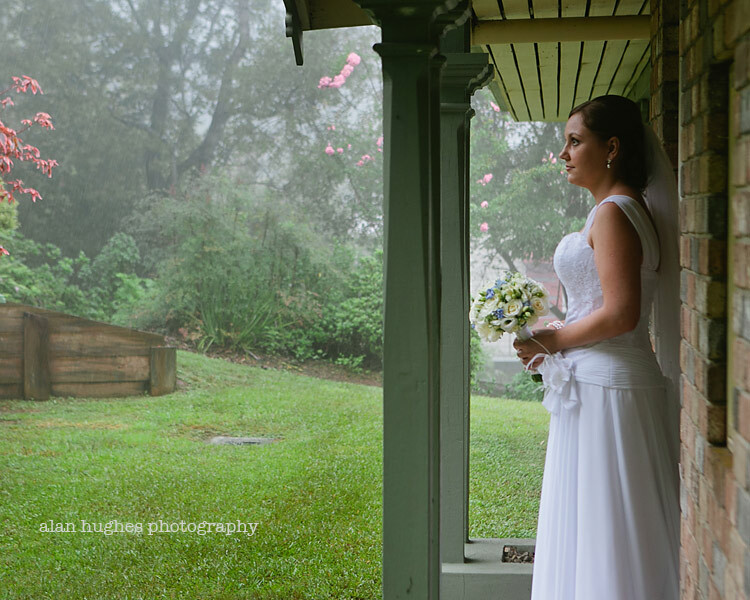 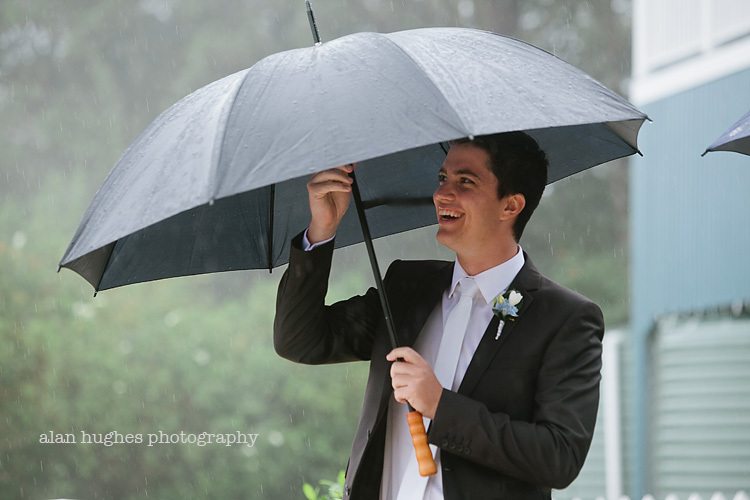 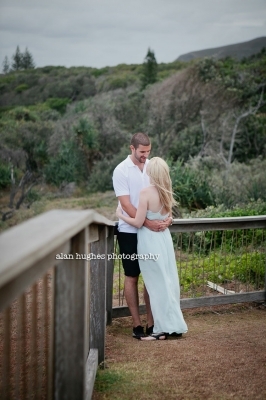 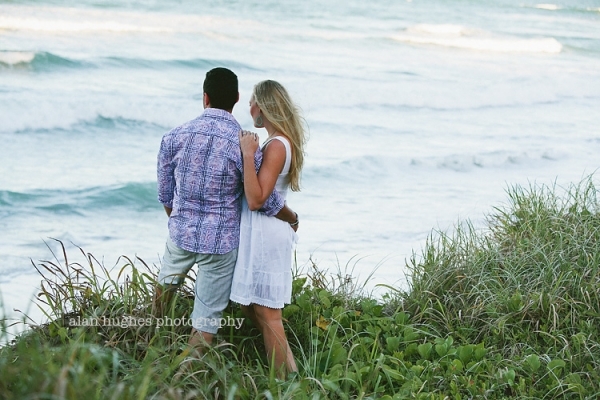 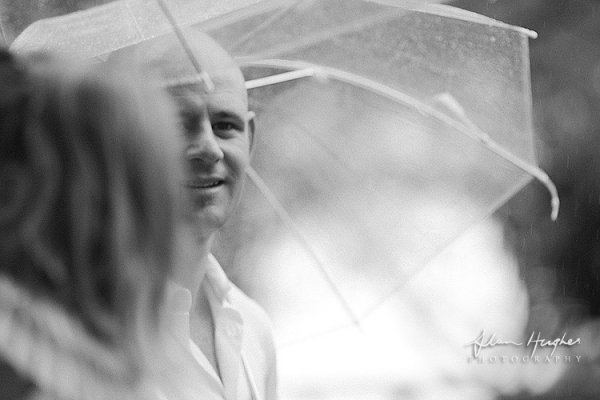 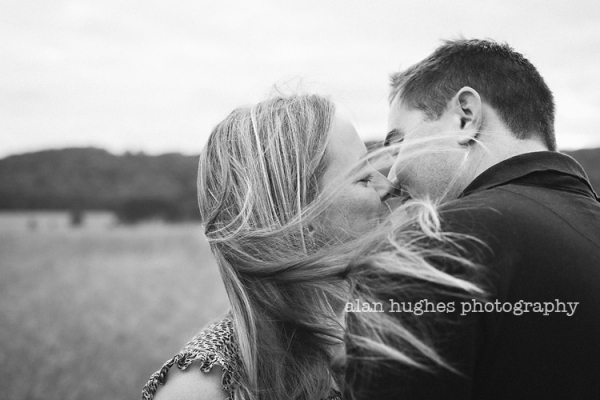 When I caught up with Amber and Cameron for their pre-wedding shoot it was same same as far as the weather goes. 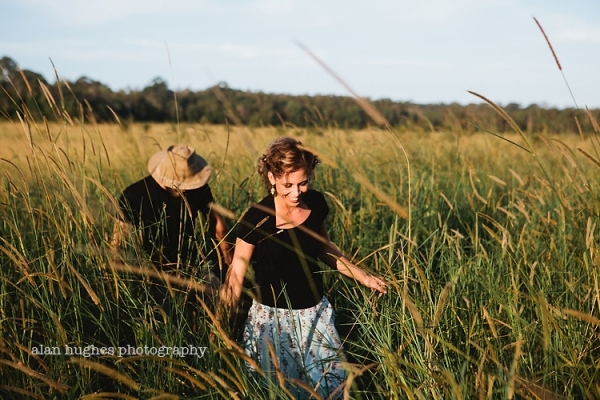 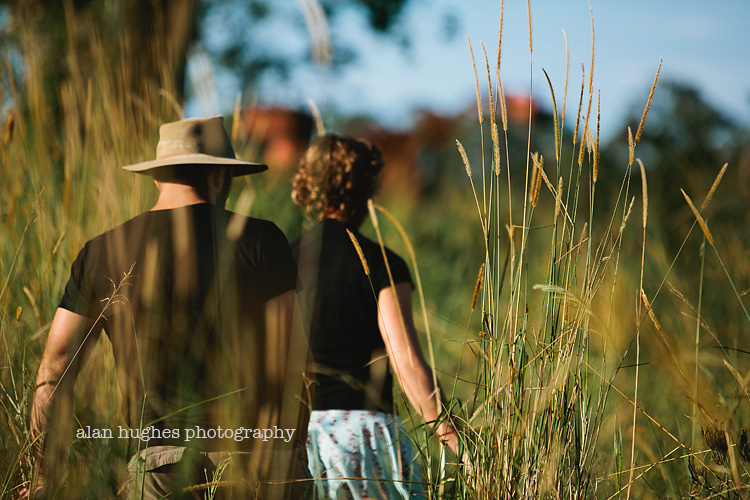 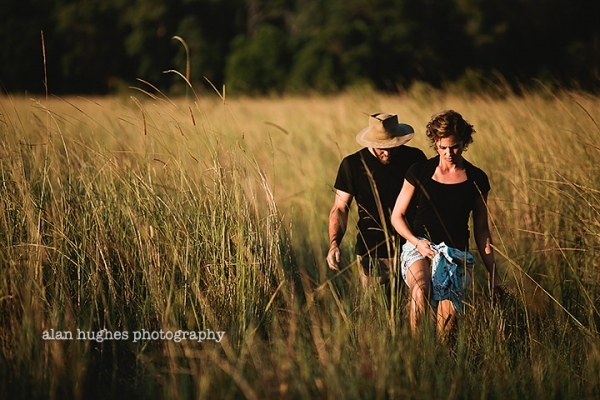 But these two were pretty game for a bit of an adventure into the long grass and wetness...so off we went into the wilds near Peregian to one of my fave locations nearby. 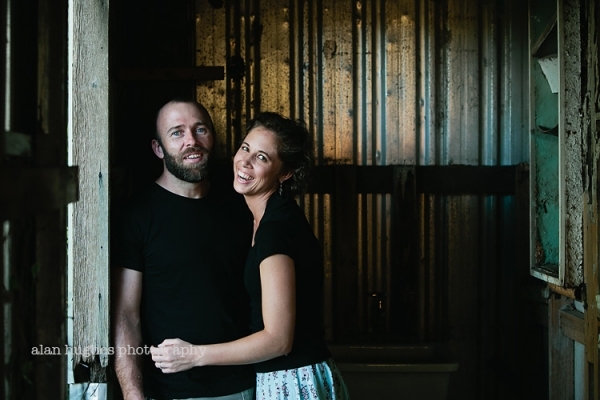 Really looking forward to these two's (is that a word?) 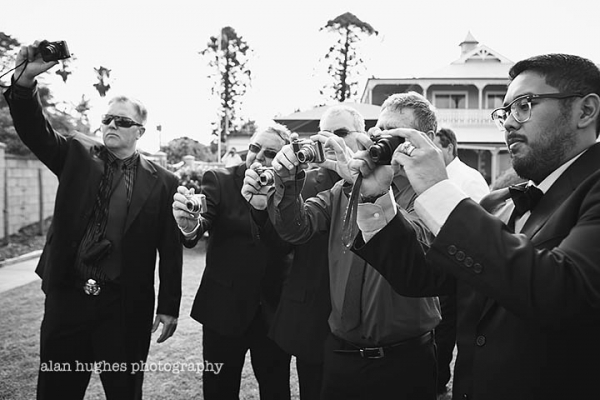 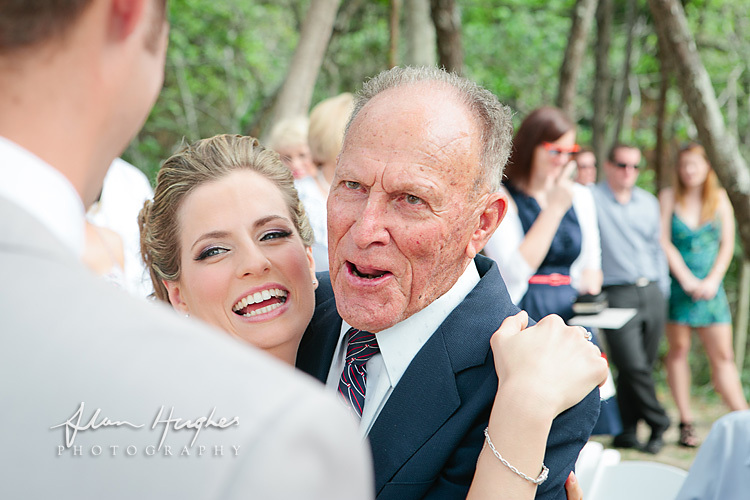 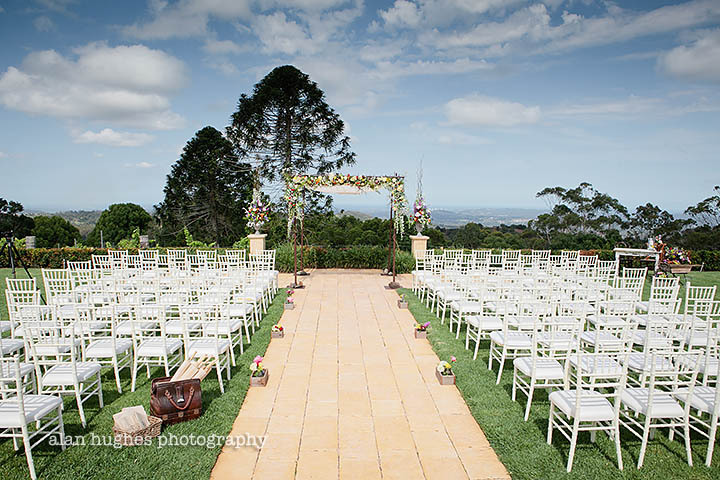 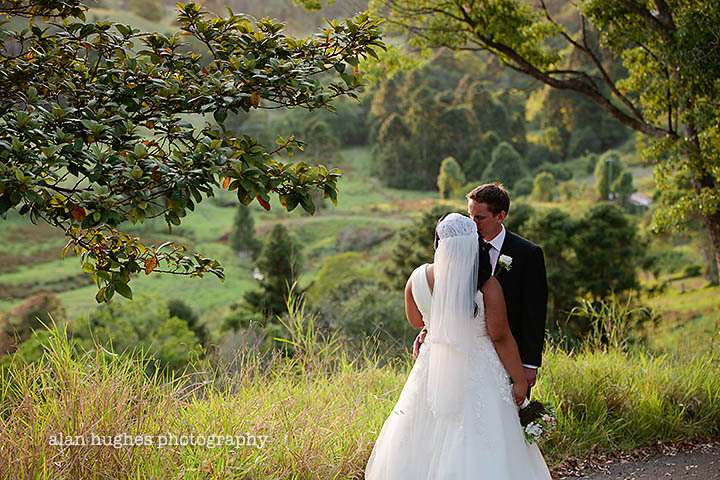 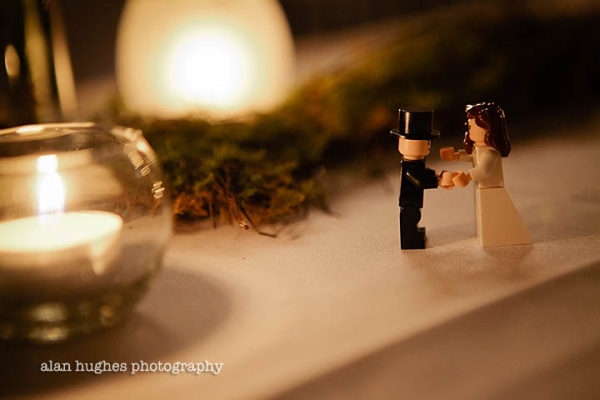 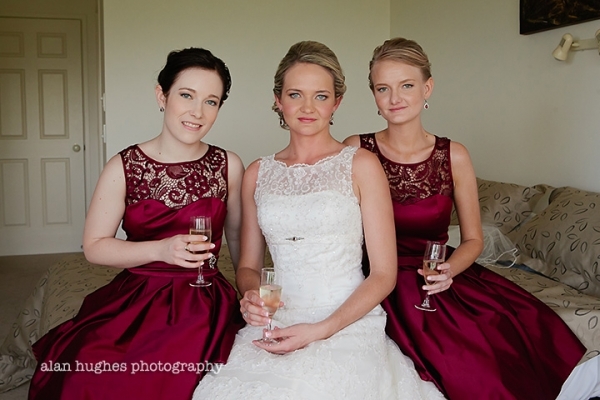 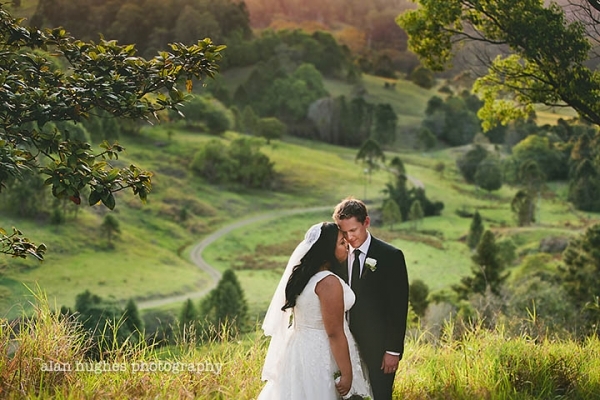 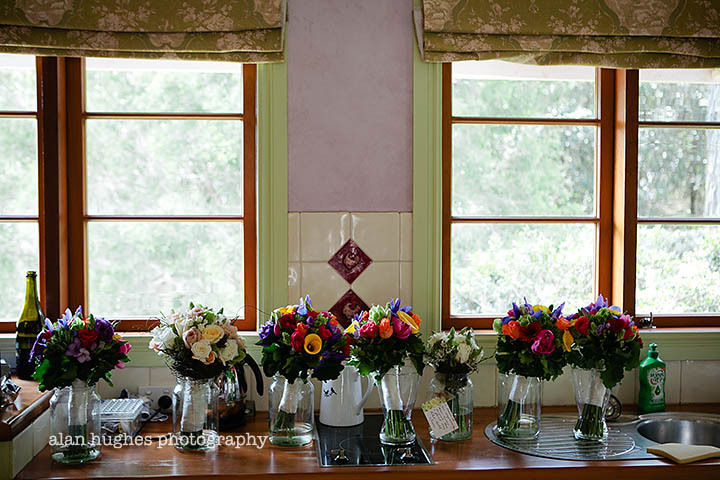 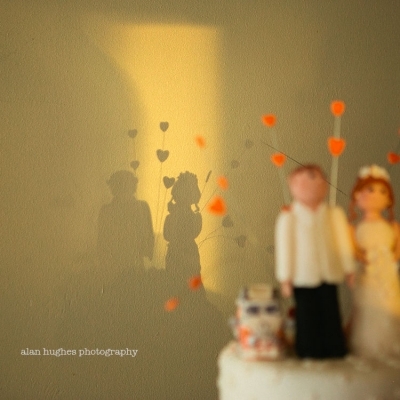 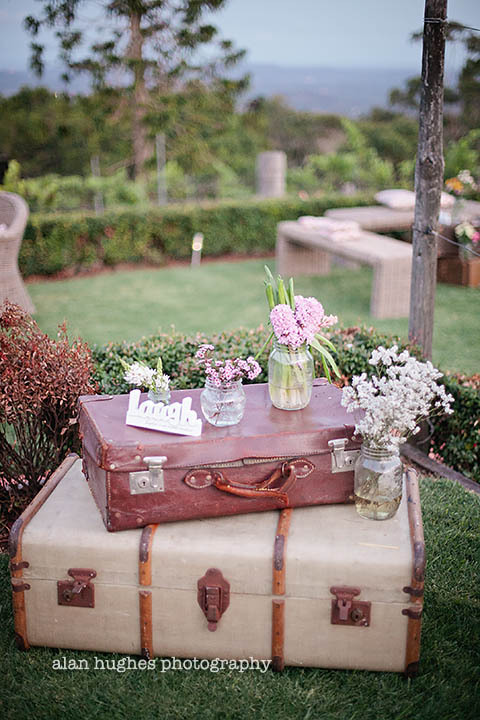 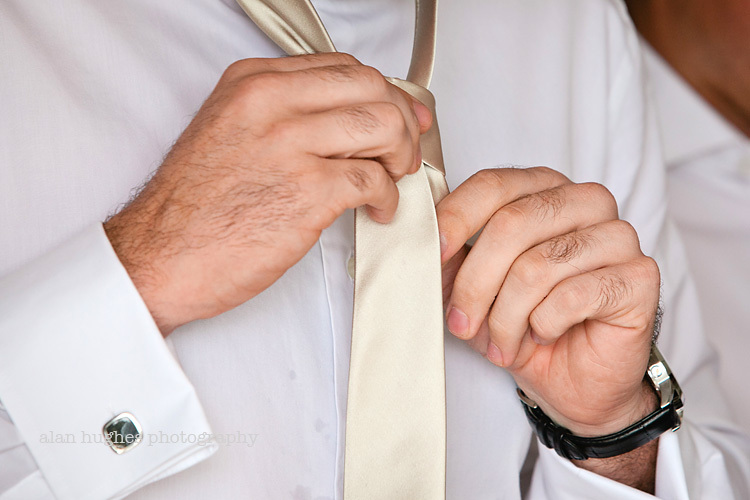 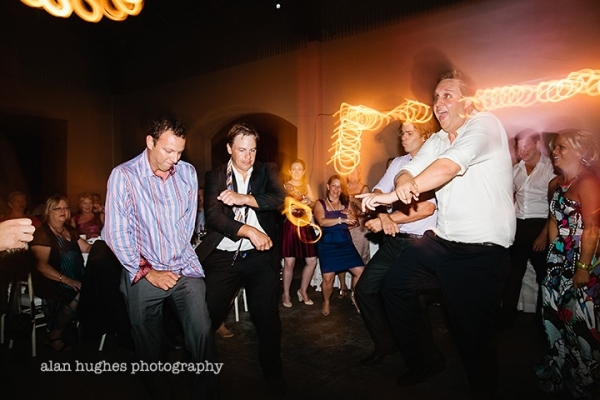 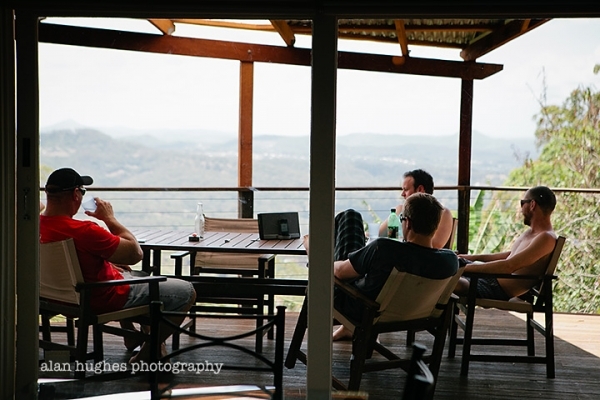 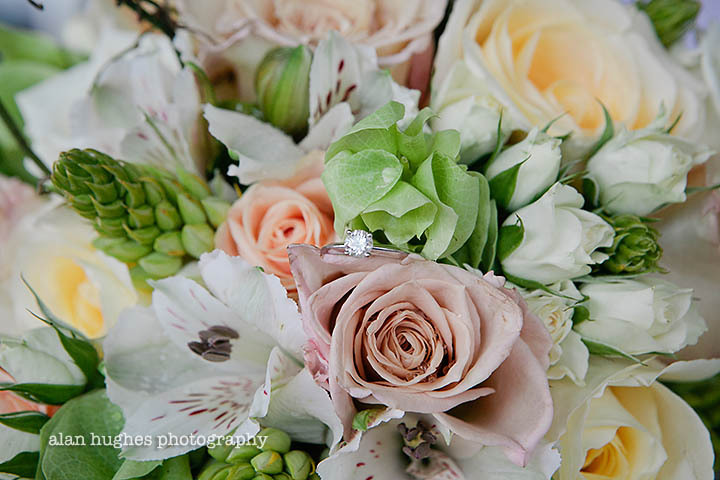 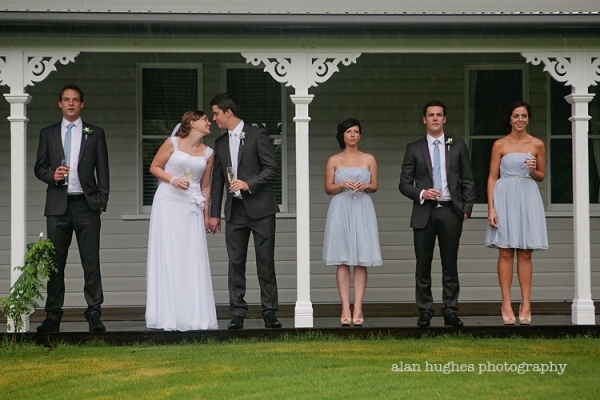 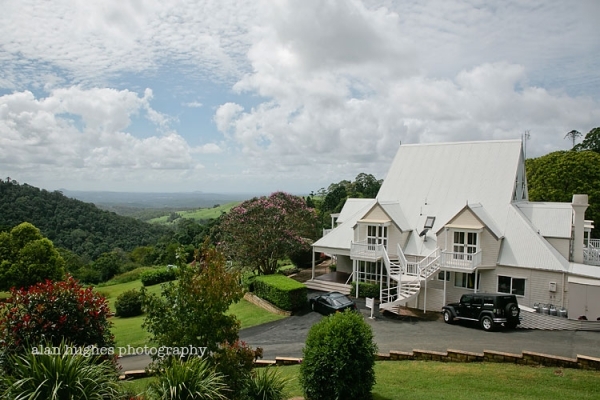 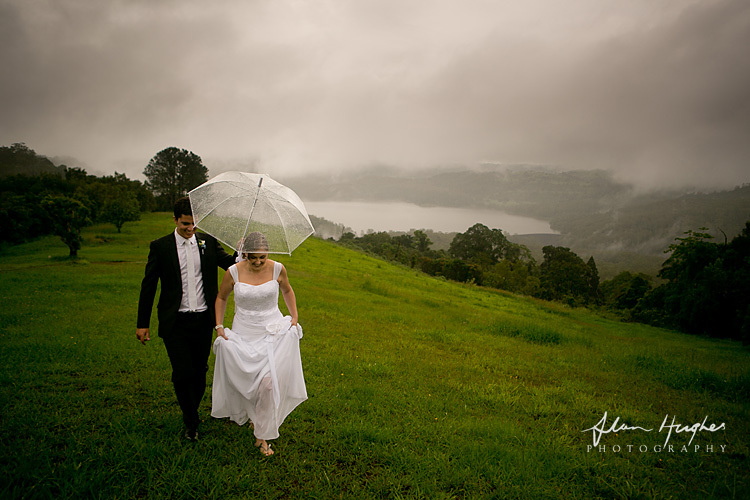 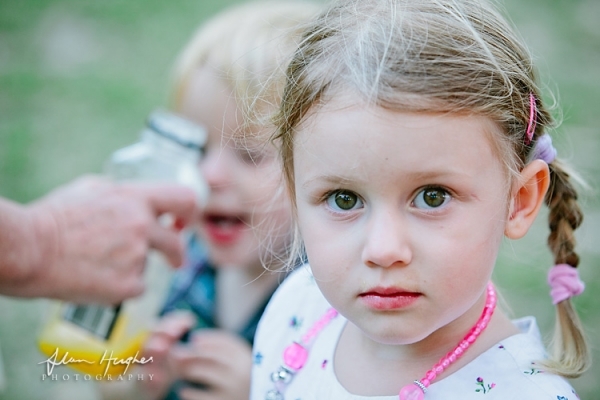 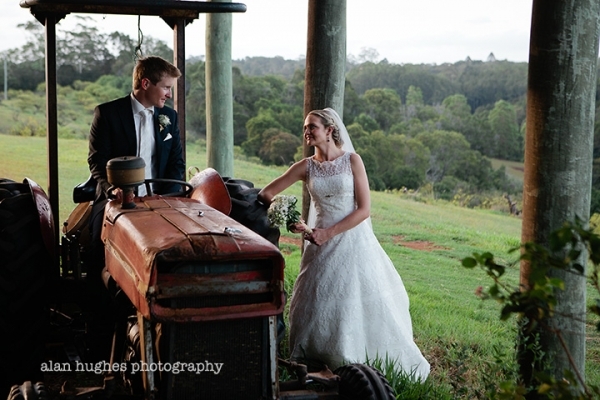 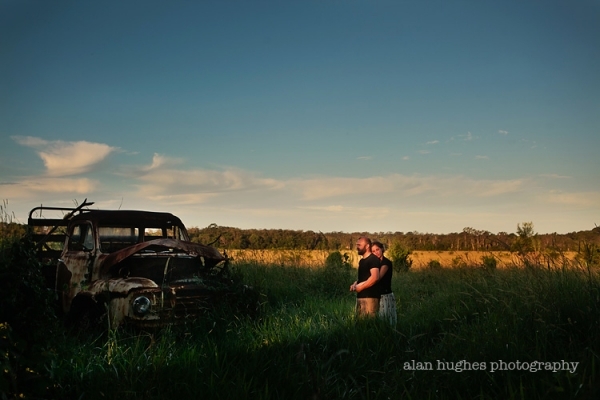 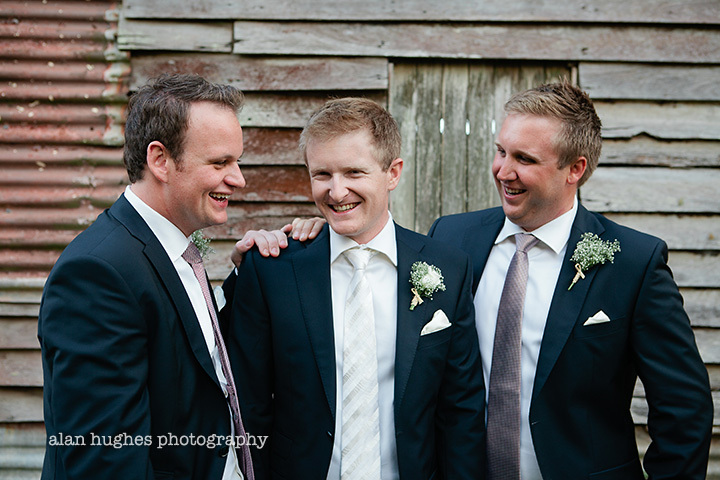 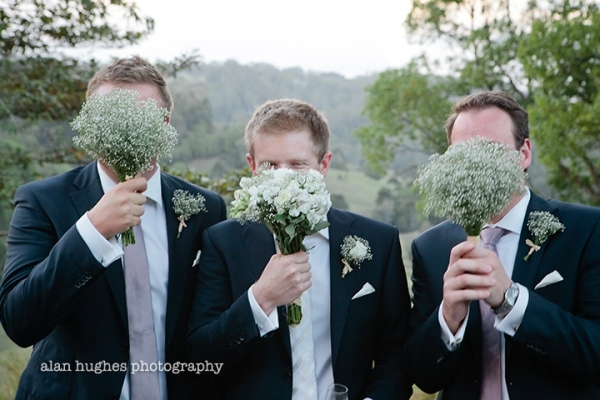 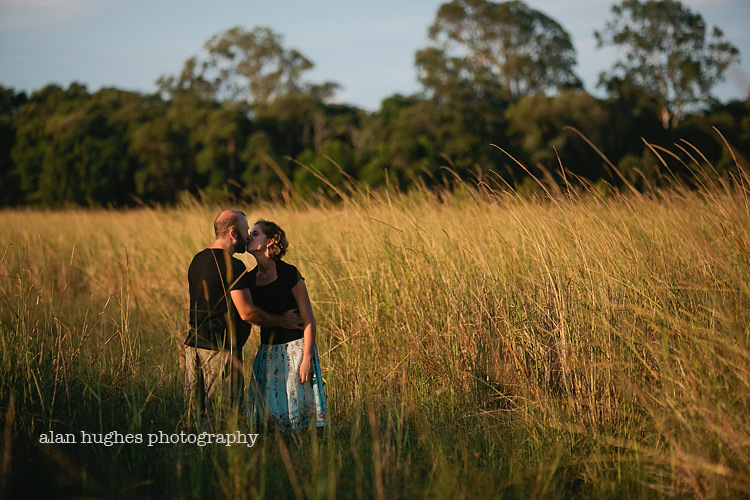 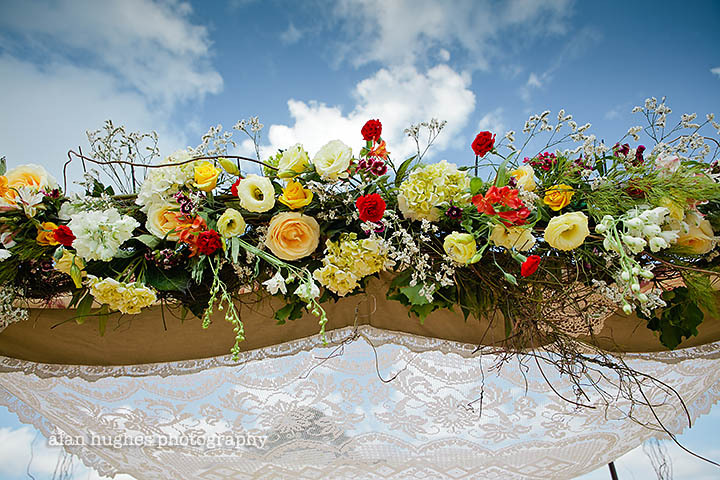 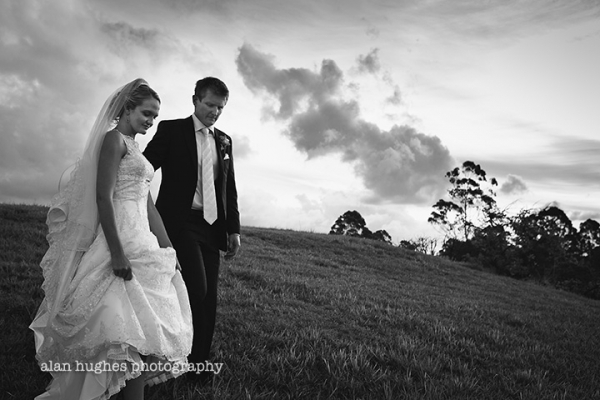 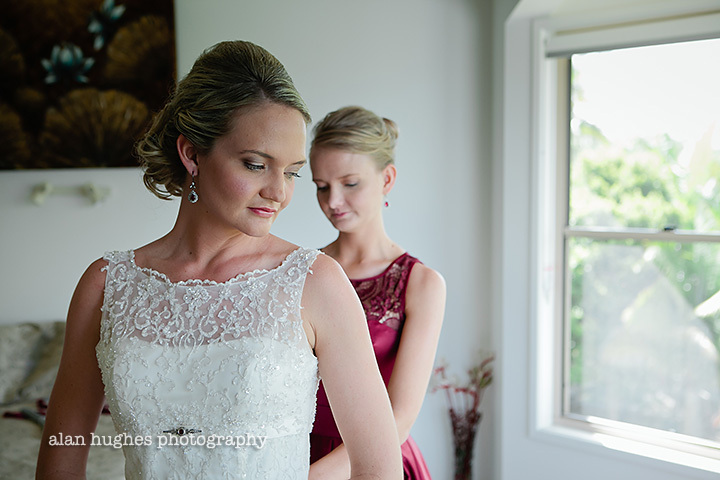 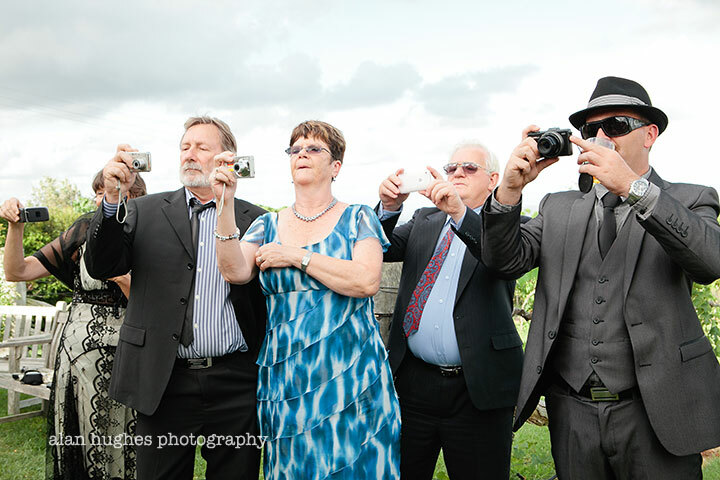 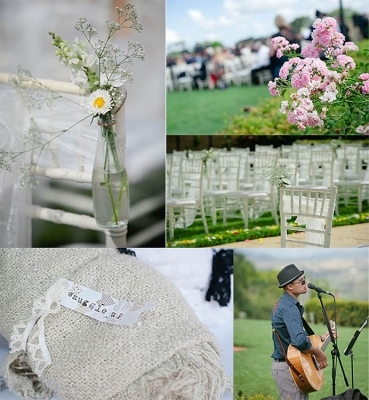 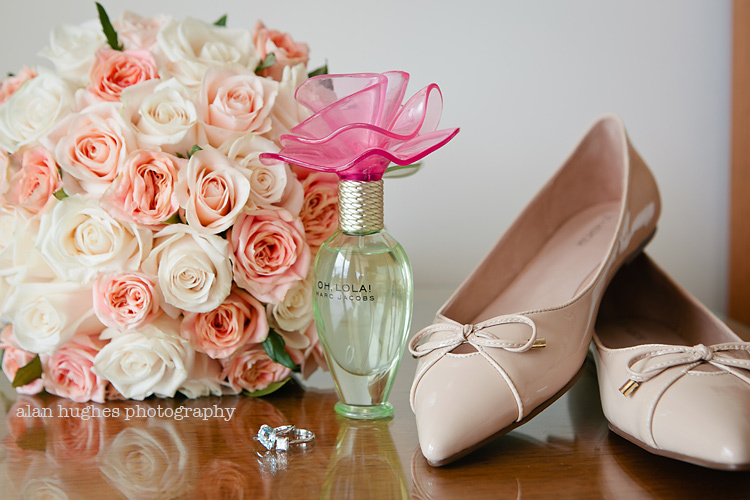 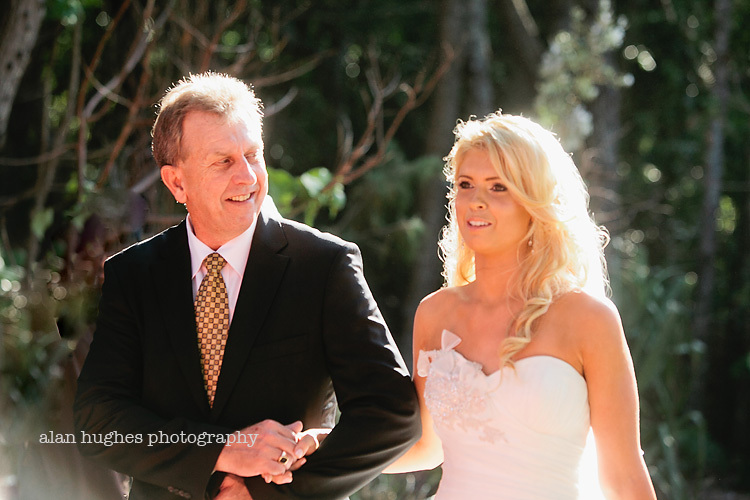 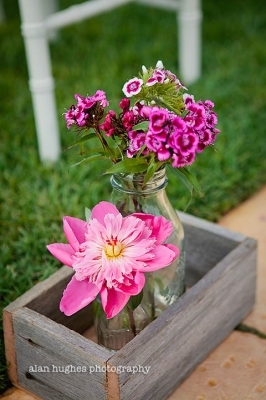 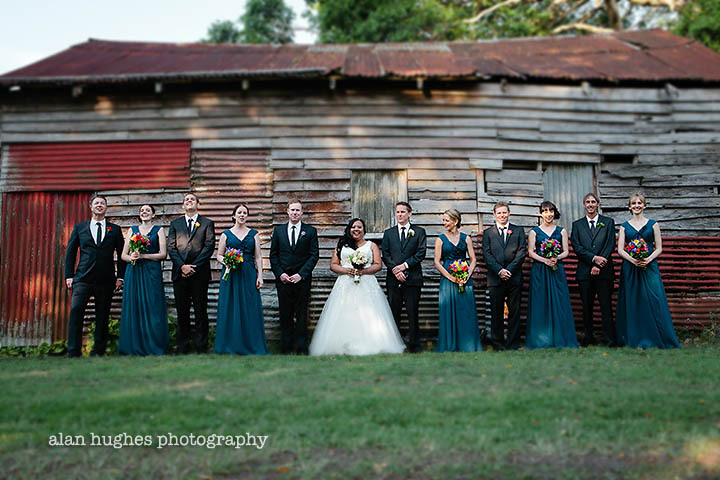 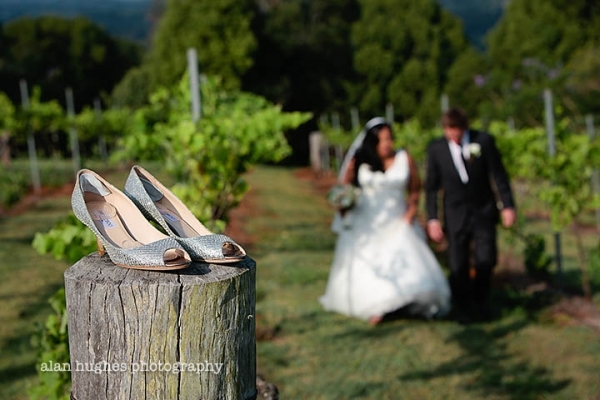 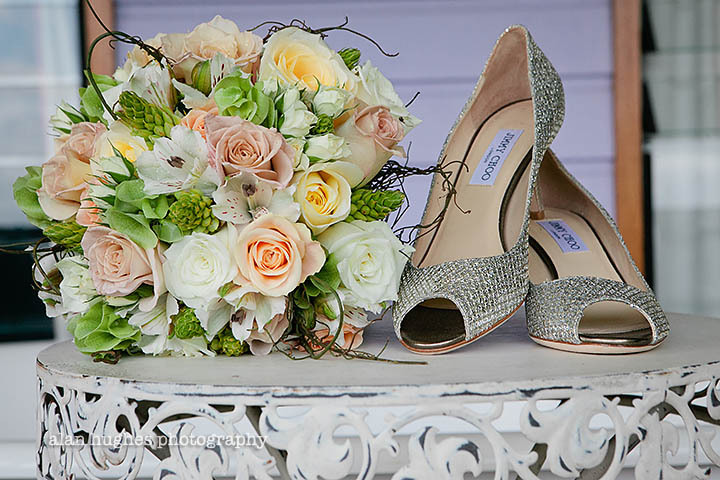 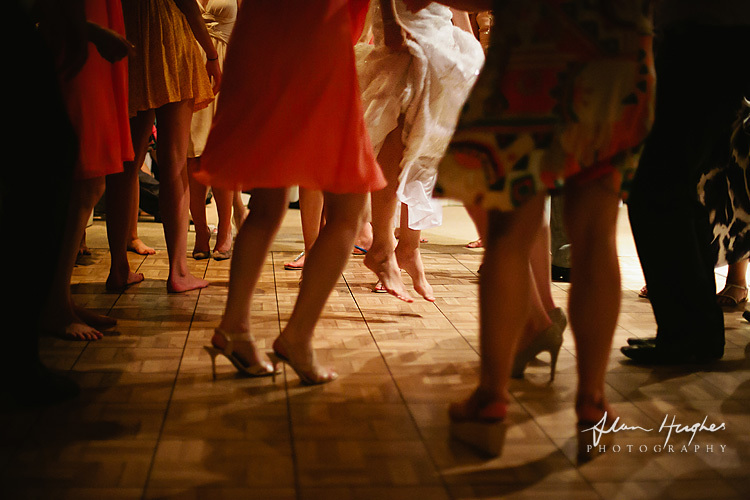 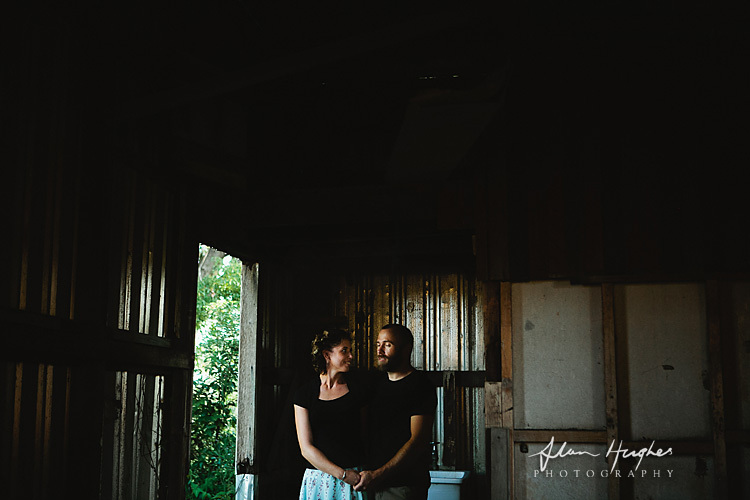 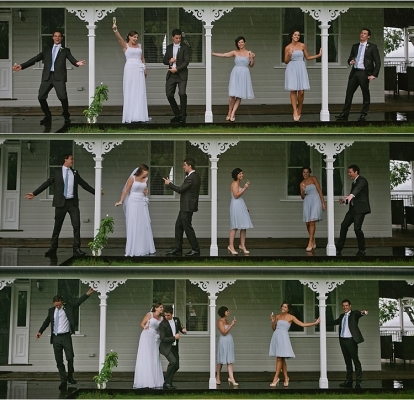 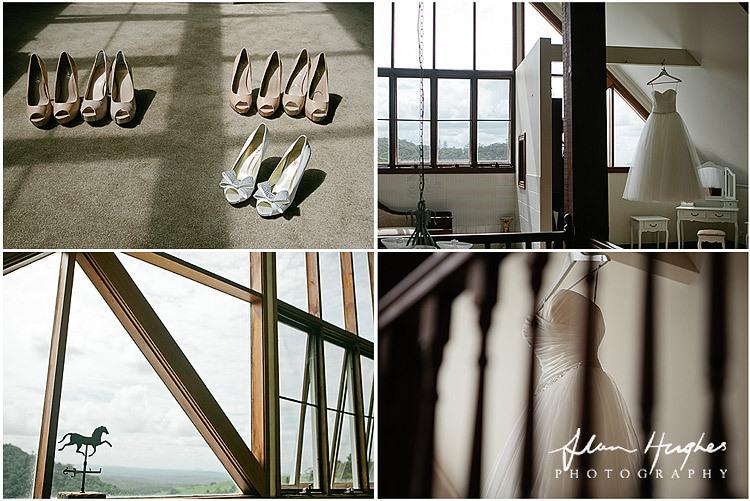 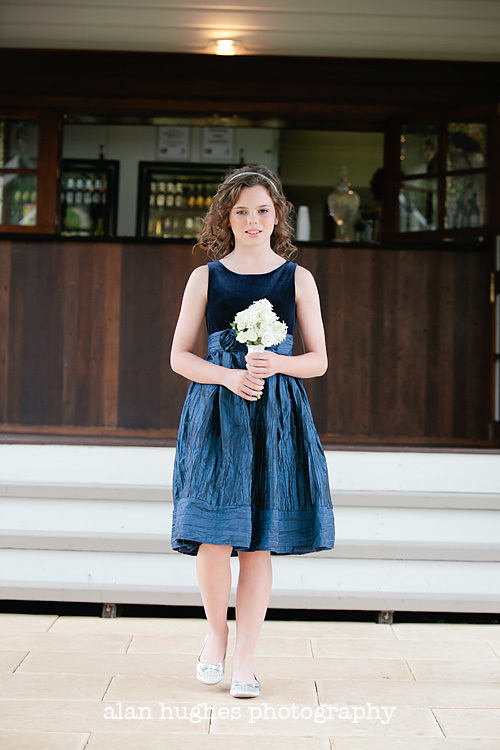 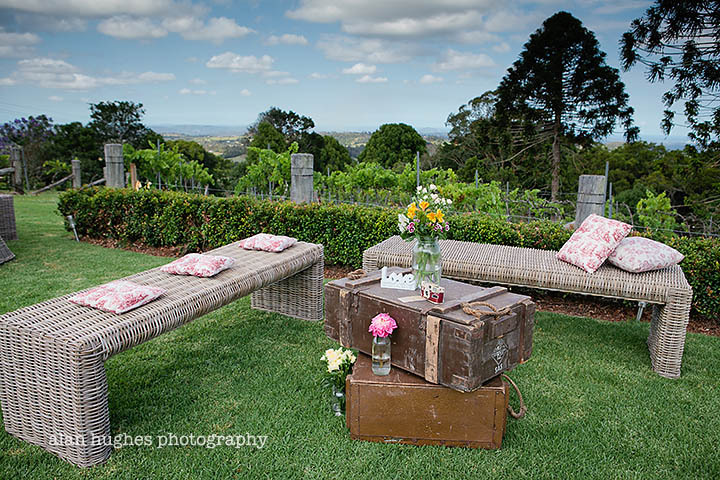 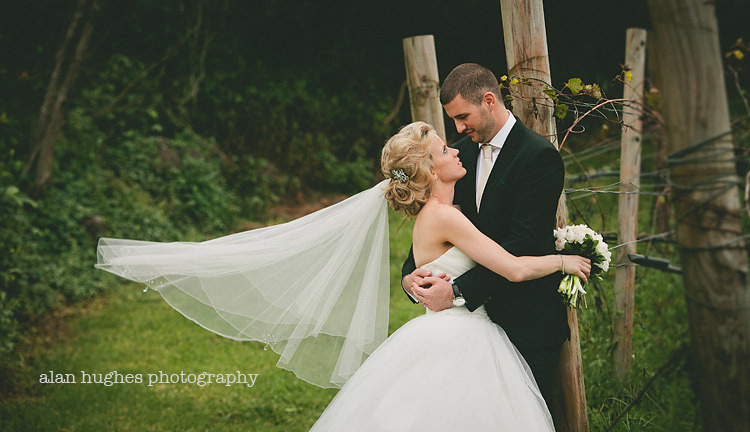 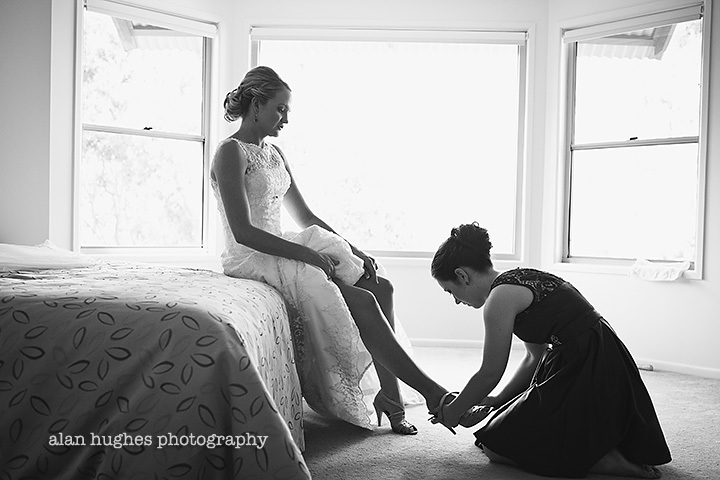 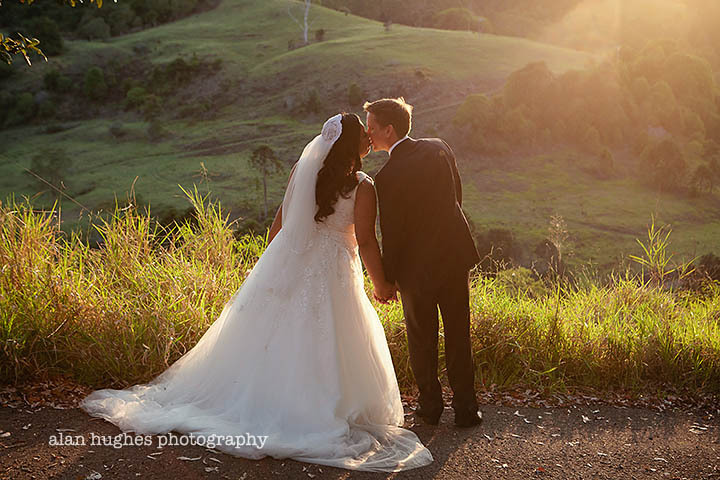 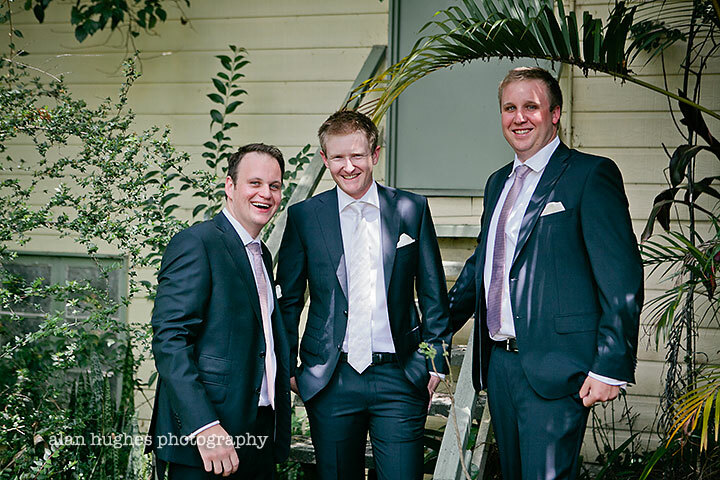 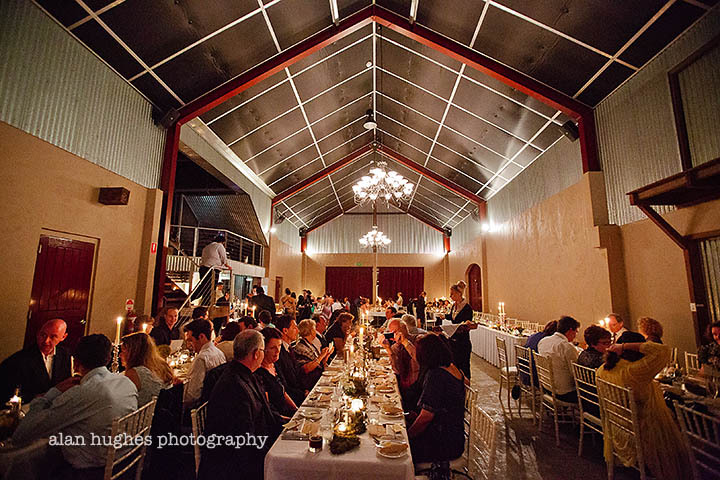 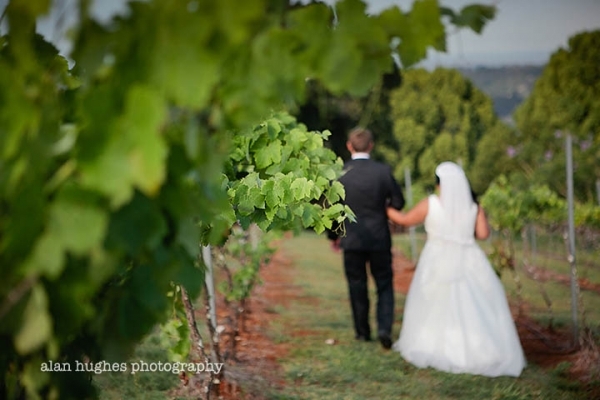 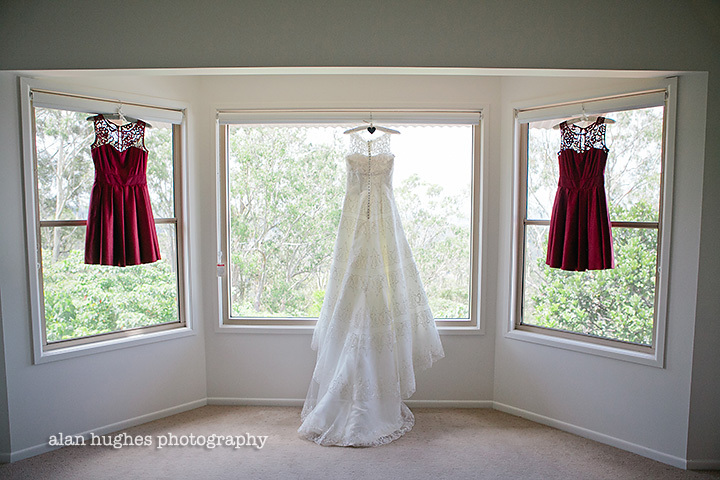 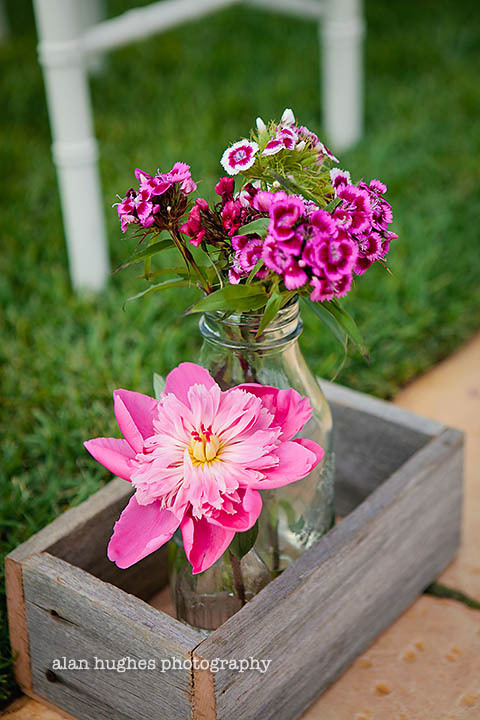 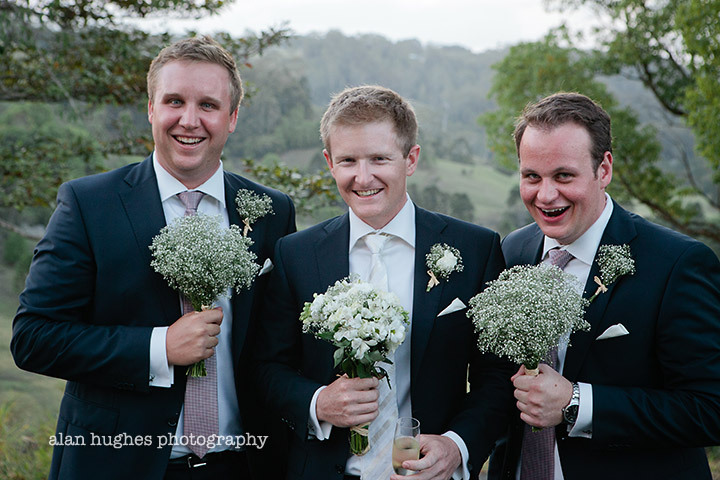 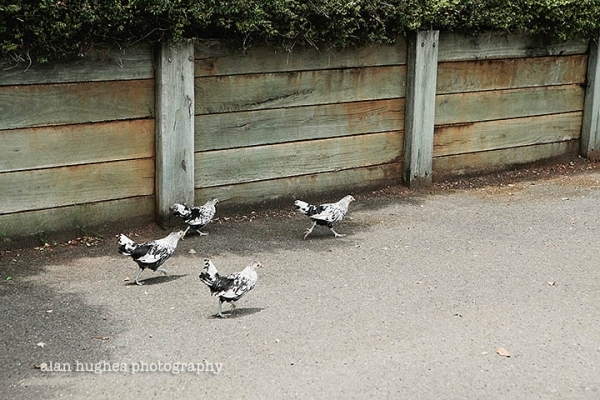 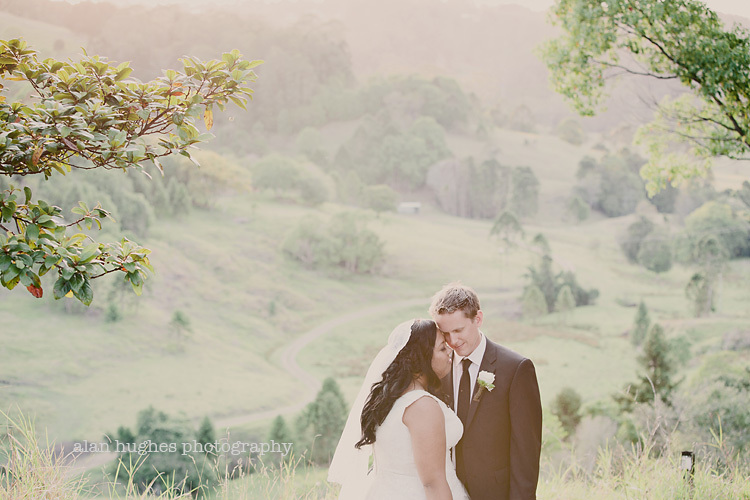 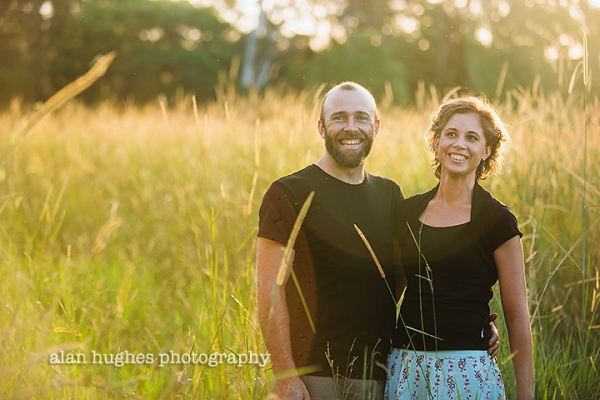 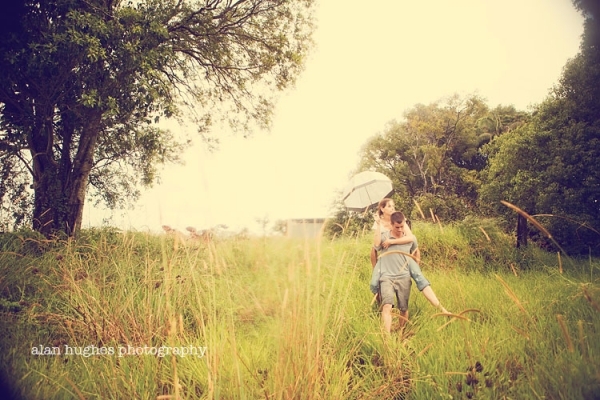 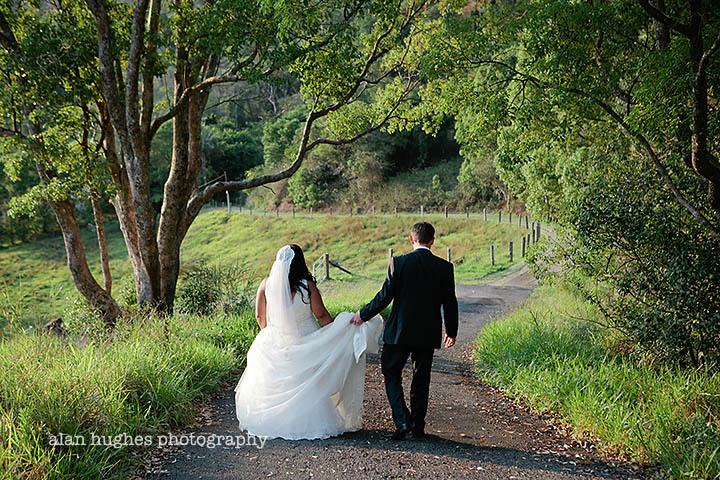 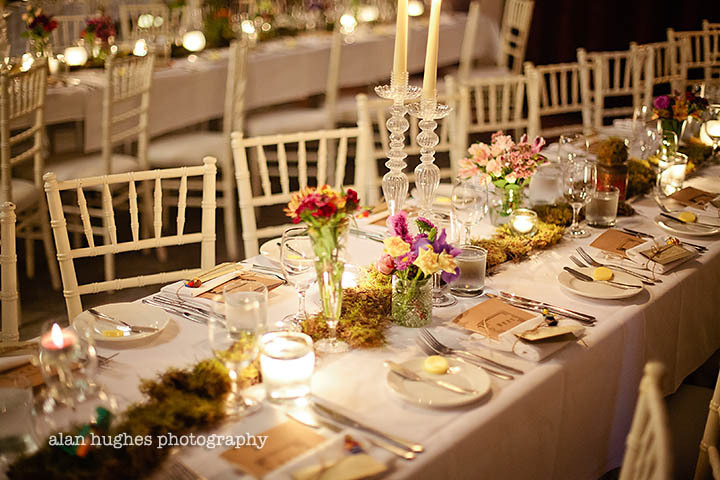 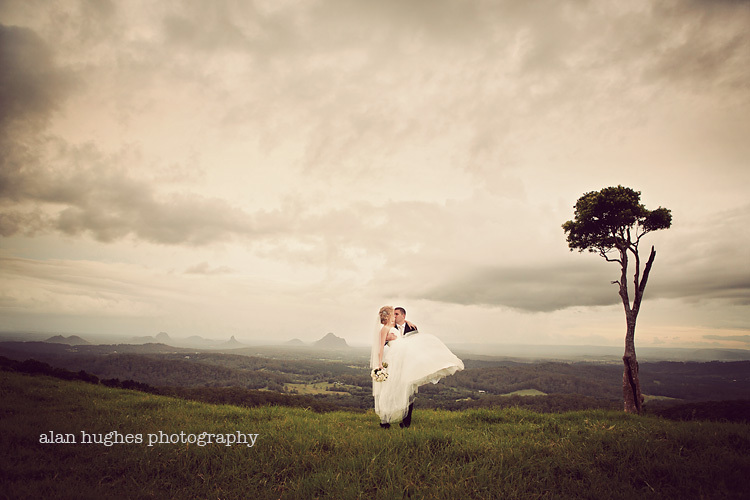 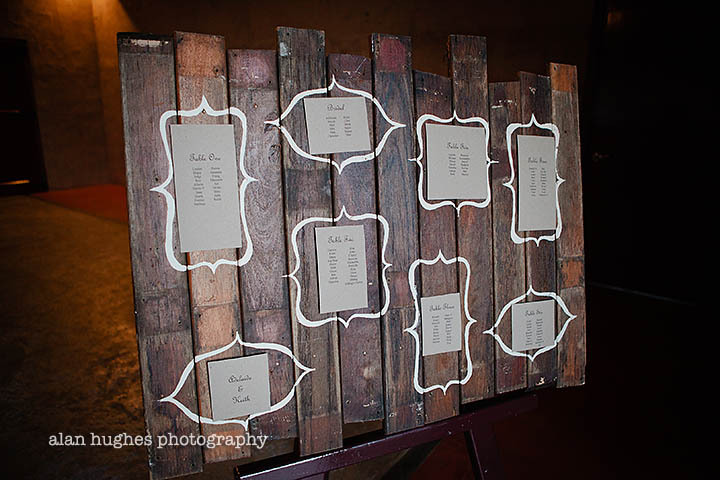 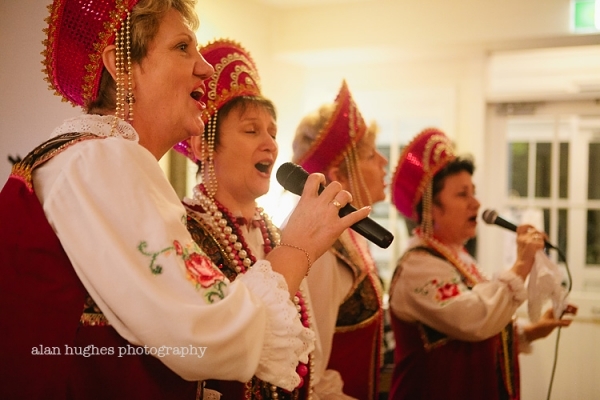 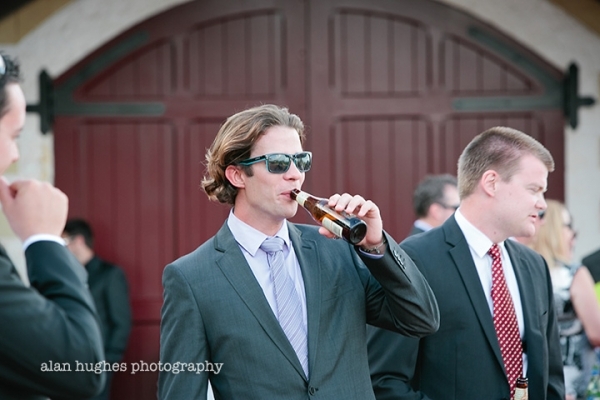 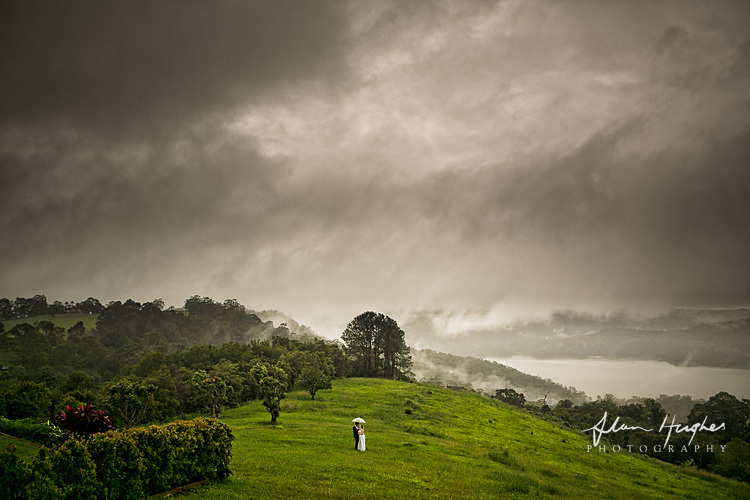 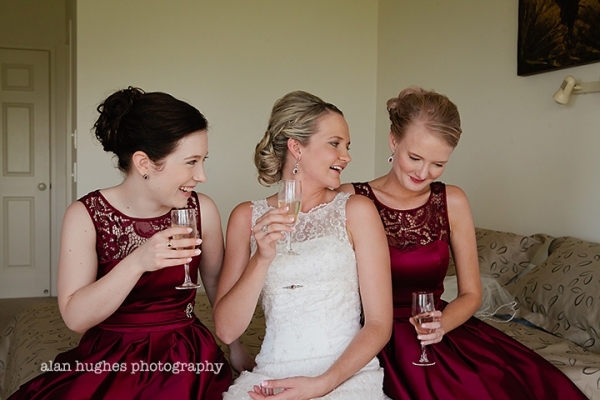 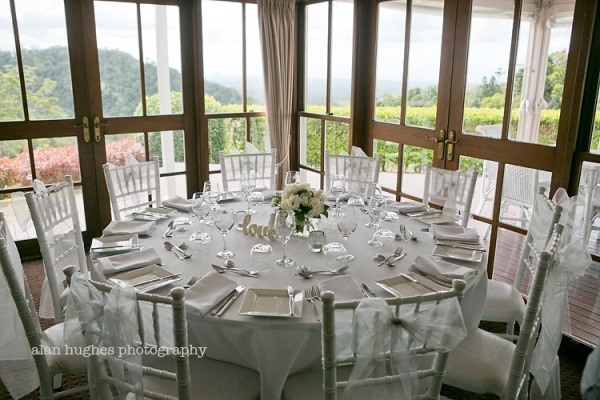 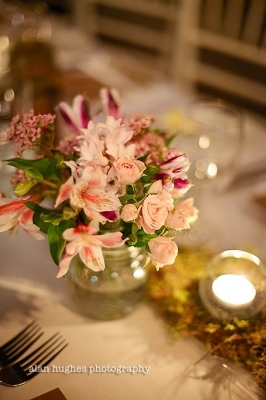 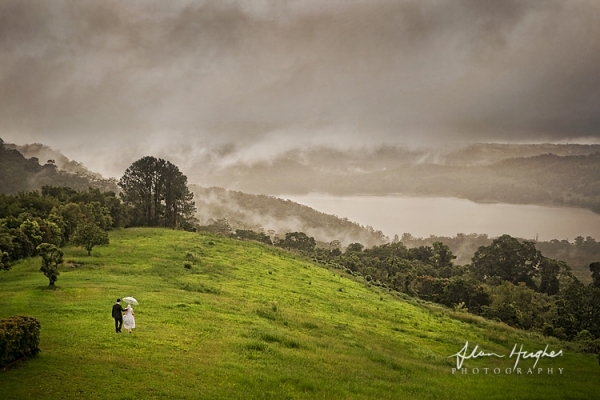 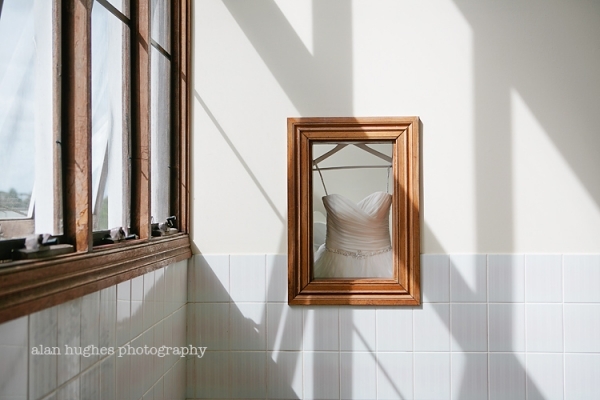 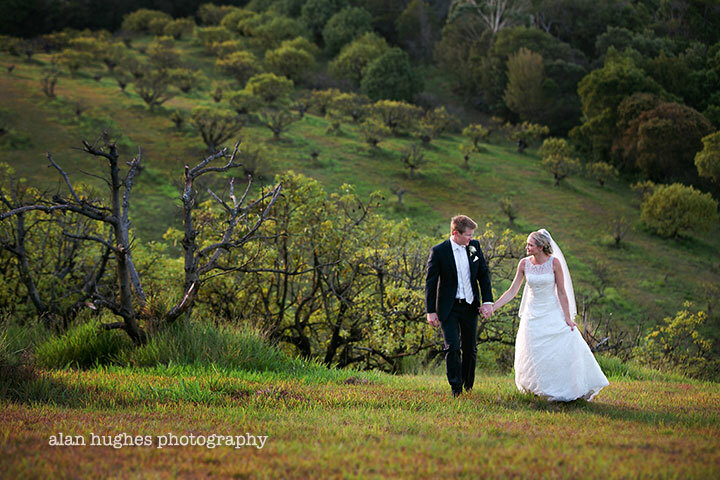 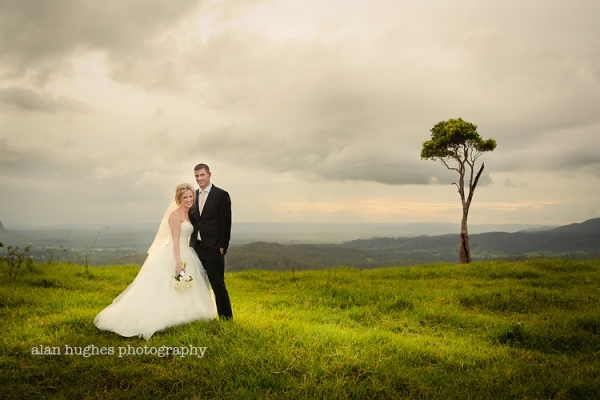 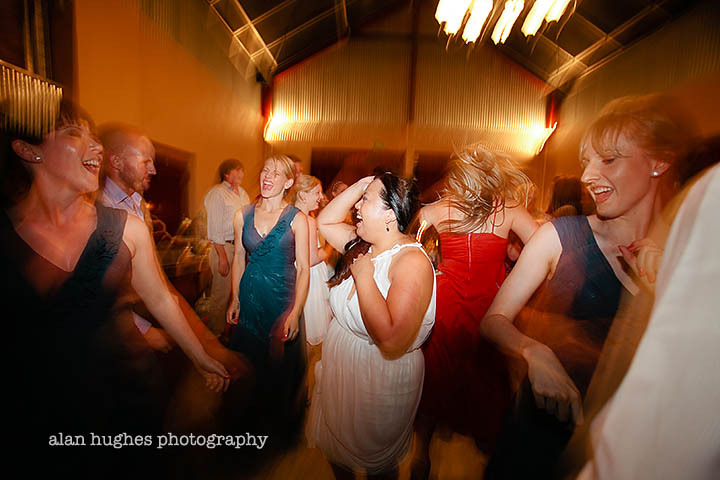 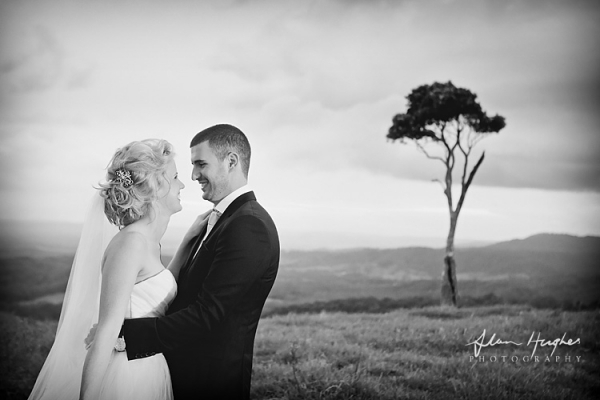 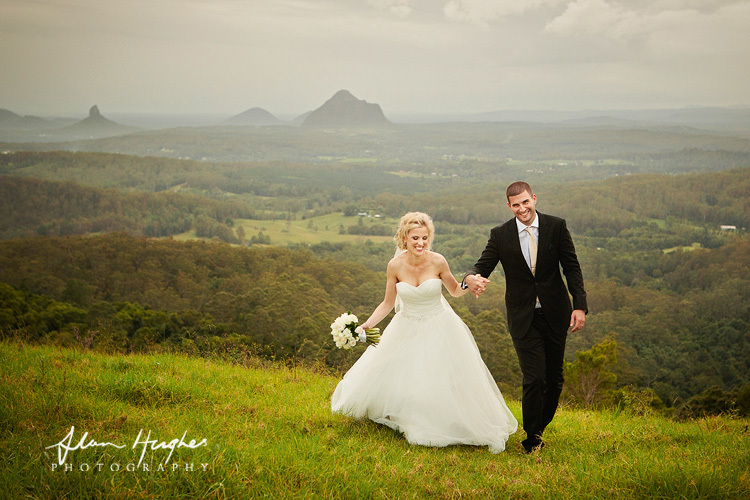 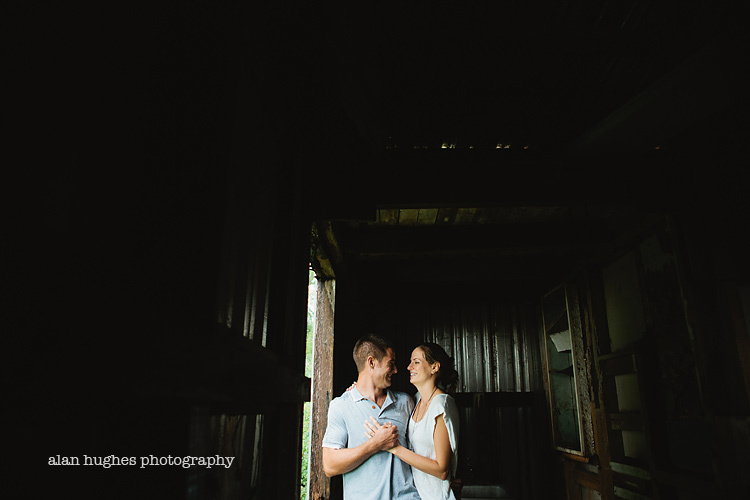 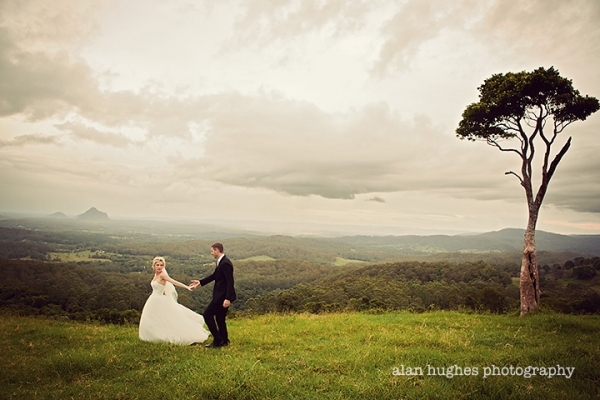 wedding next week in Maleny in the Sunshine Coast Hinterland. There seemed to be a love triangle happening in Rick & Janelle's lives, they obviously love each other and their gorgeous son Kaiden, but they also share a love for old Land Rovers...yes Land Rovers. 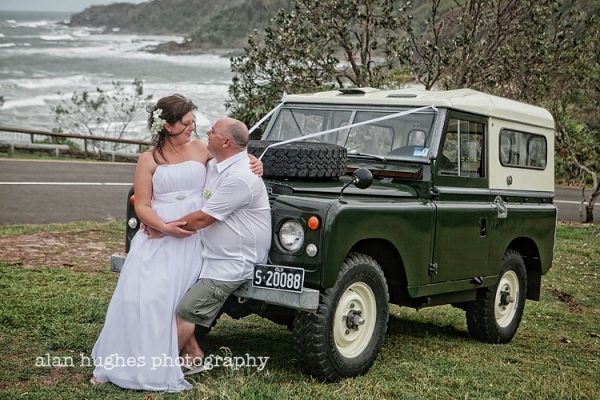 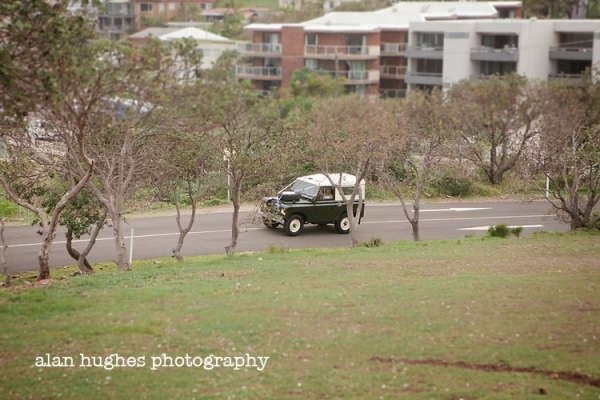 So for their wedding there were no guests, just the 3 of them and 2 Land Rovers! 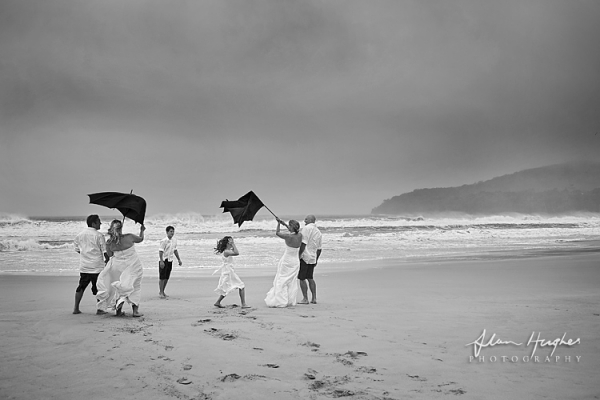 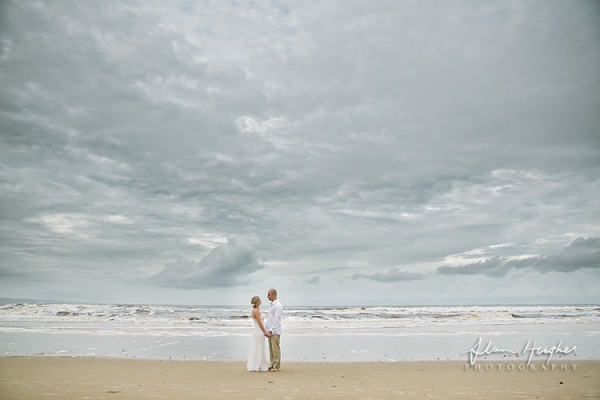 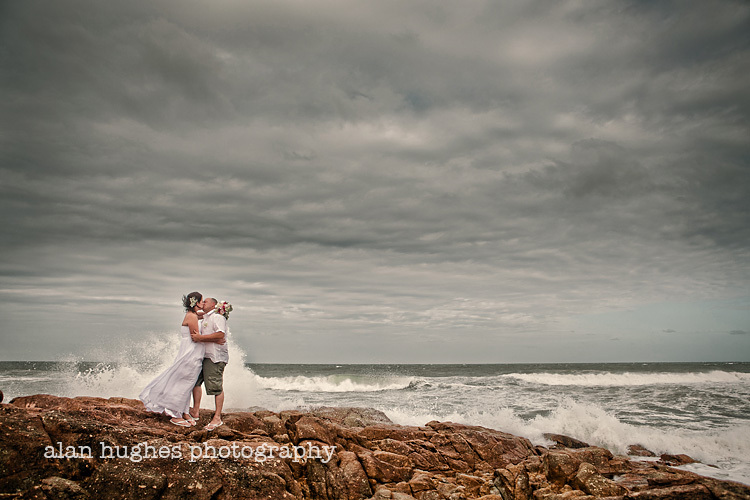 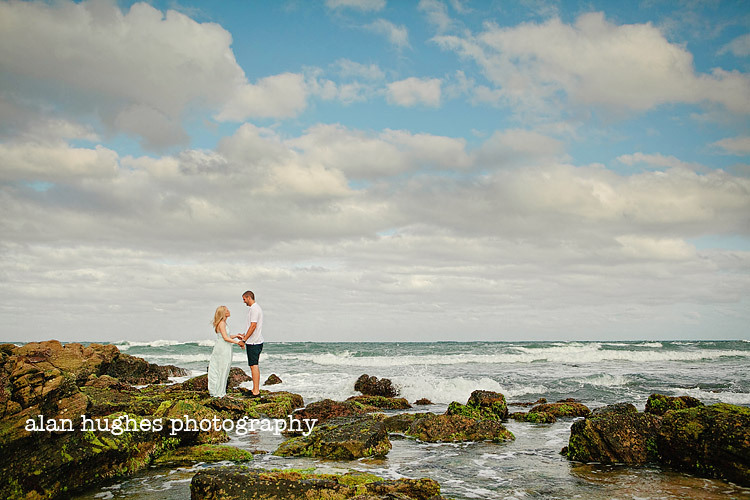 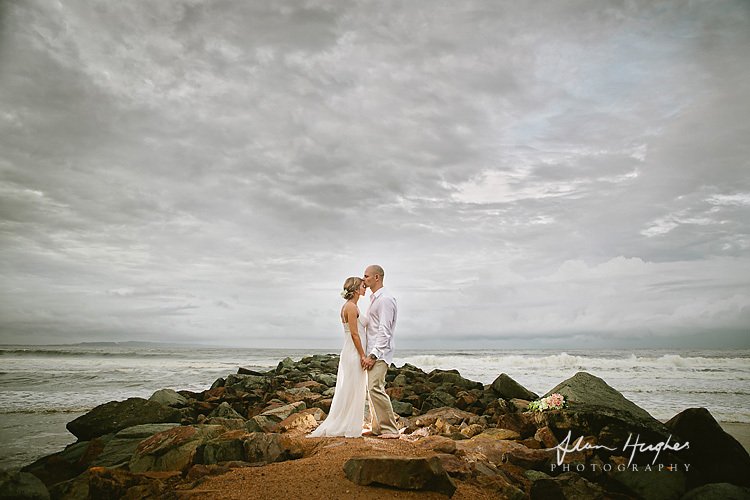 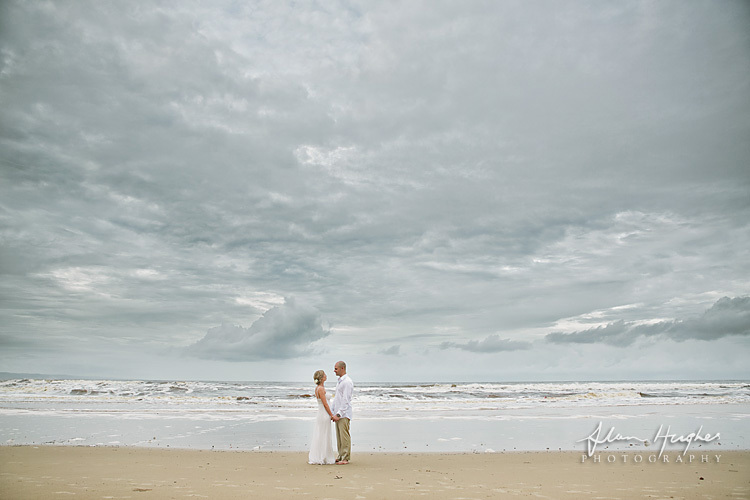 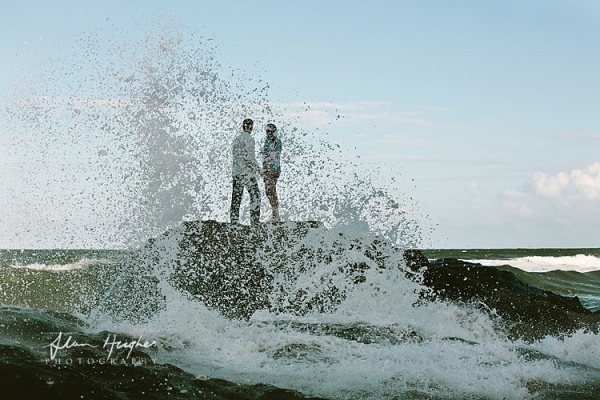 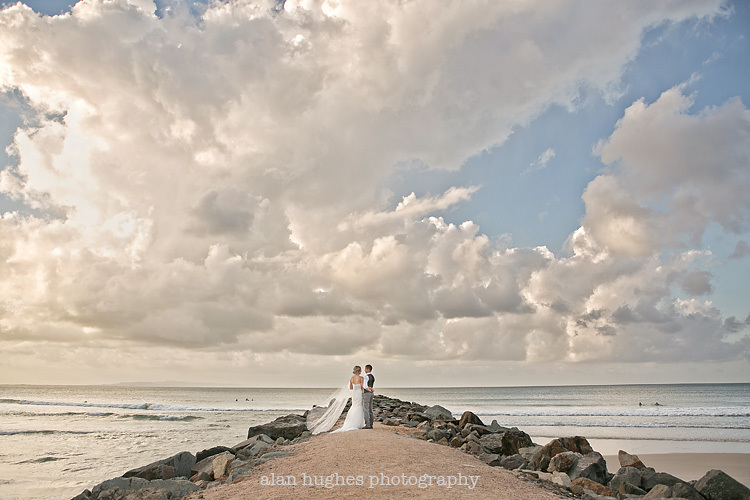 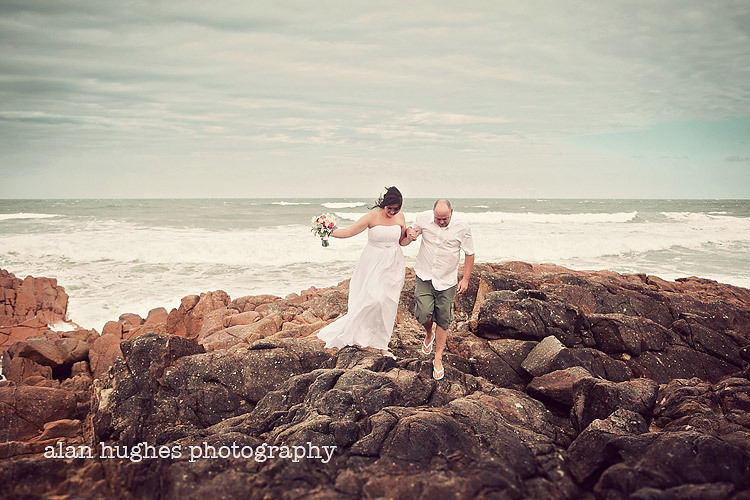 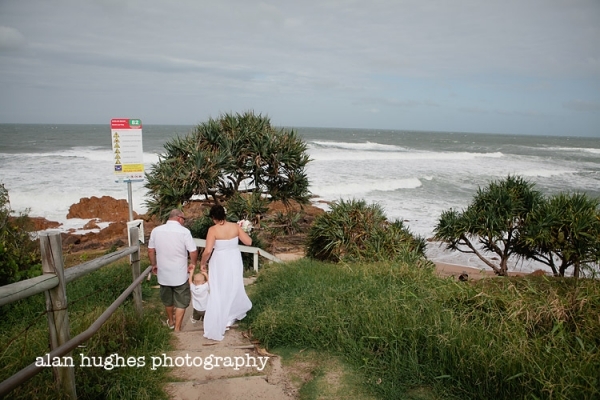 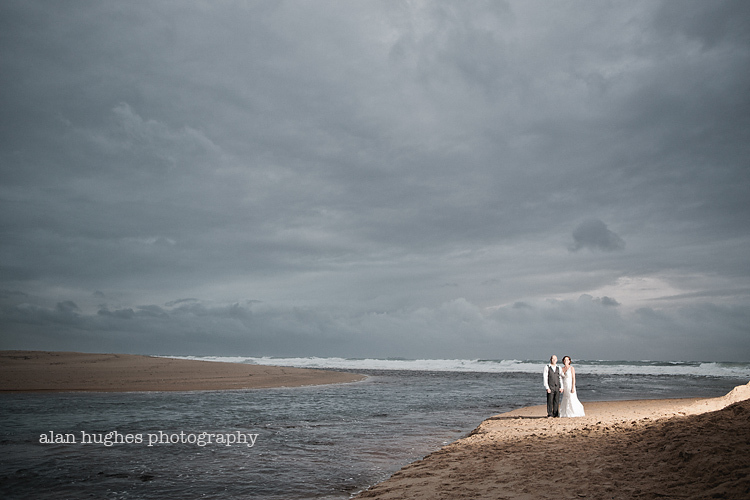 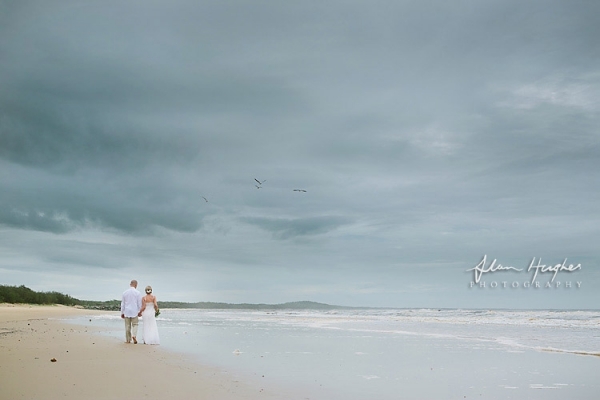 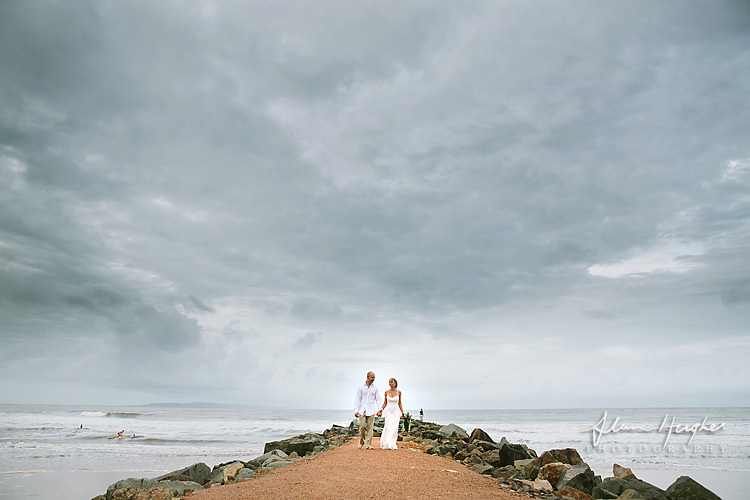 As for the wedding on Coolum First Bay it was a very windy day with the storm clouds rolling across the sky and the waves crashing against the rocks. 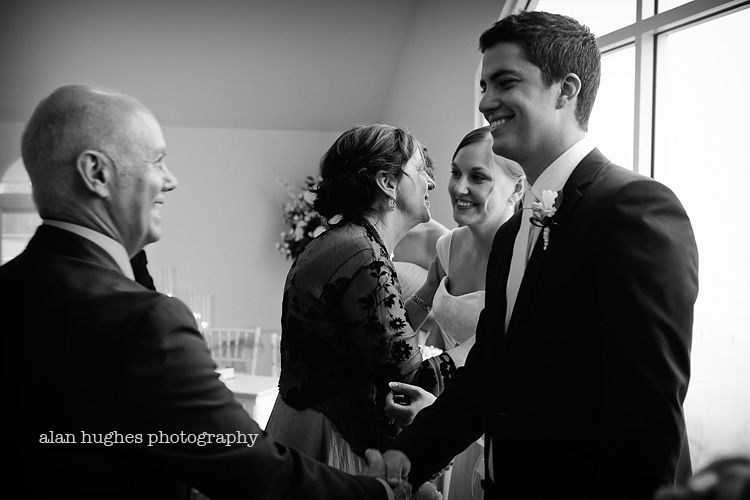 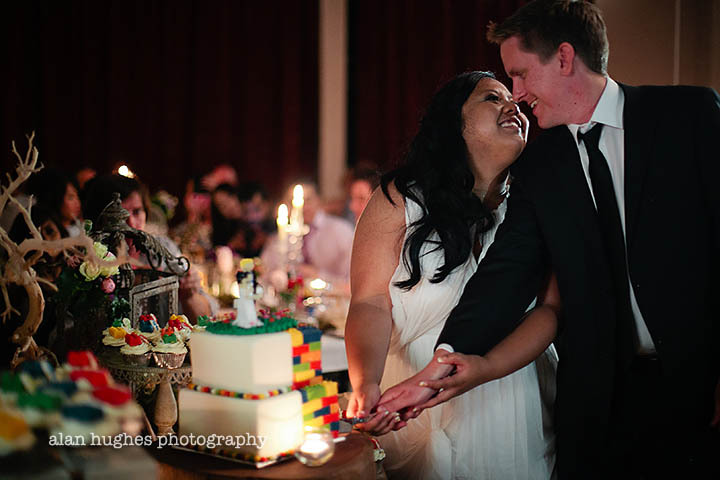 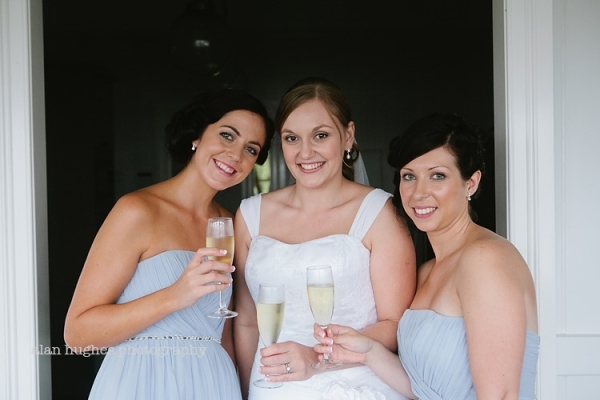 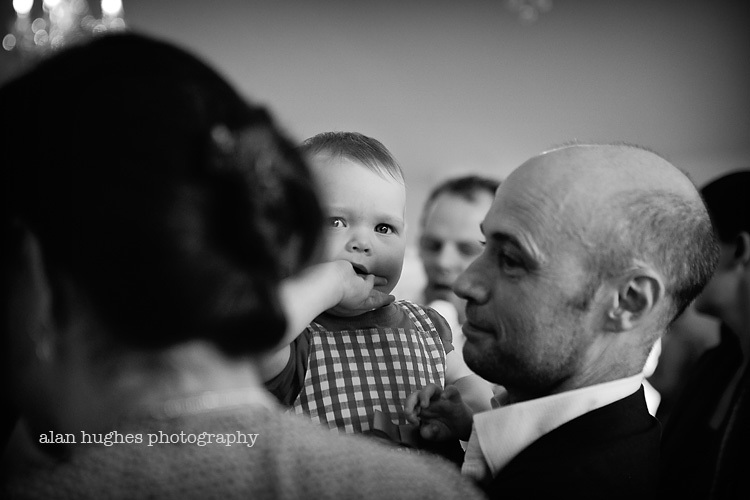 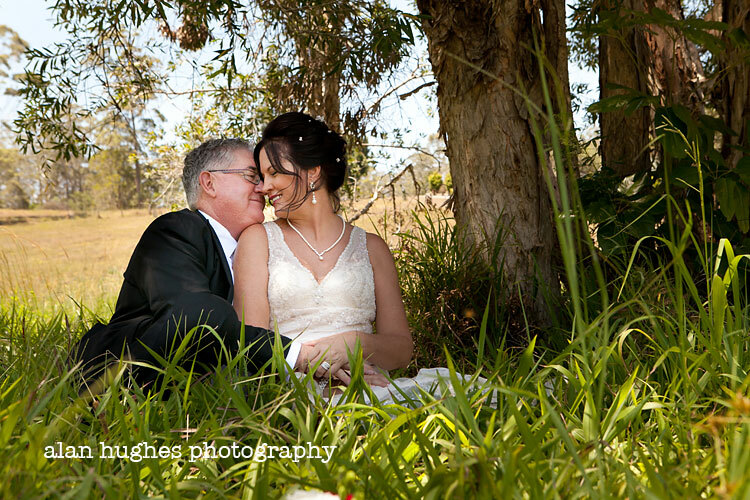 But all that mattered for little as these two got married in a sheltered corner by Jacqui Clarke celebrant. 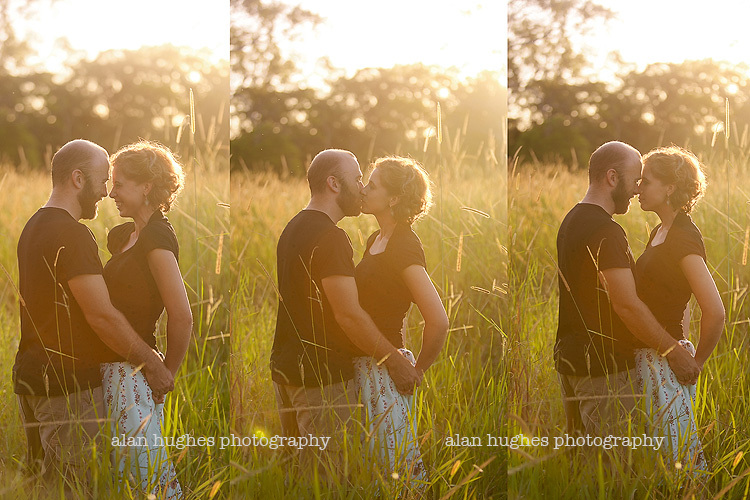 Just lately there's not been alot of golden sunsets to speak of during the week, or at least most evenings when I plan an engagement shoot or pre-wedding photography session. 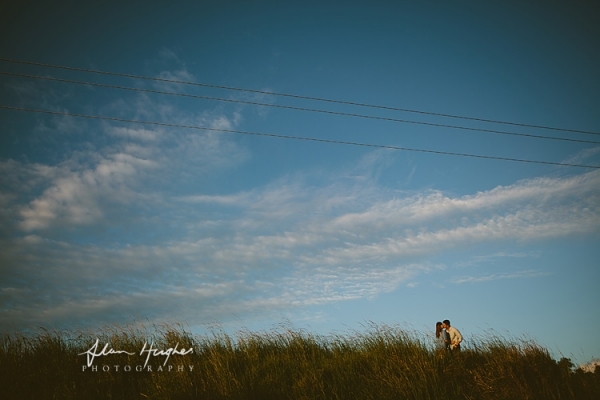 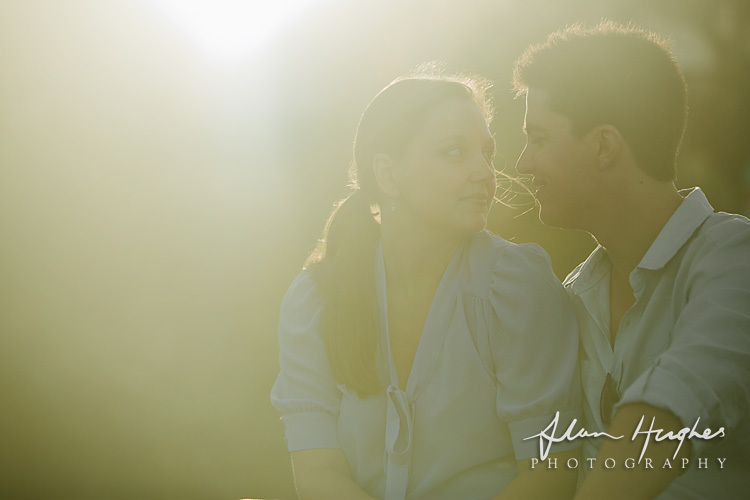 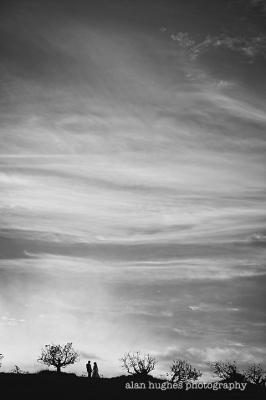 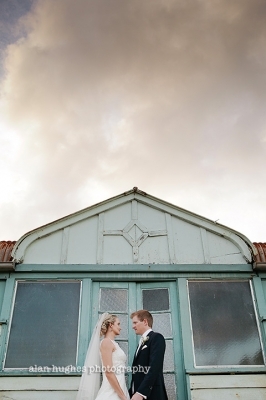 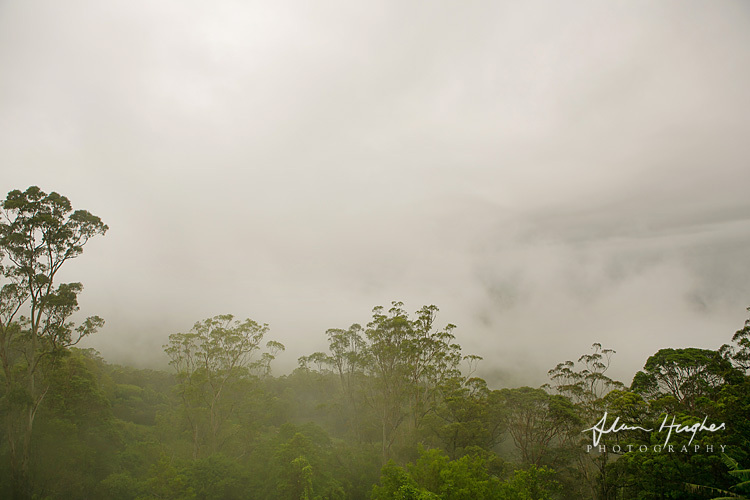 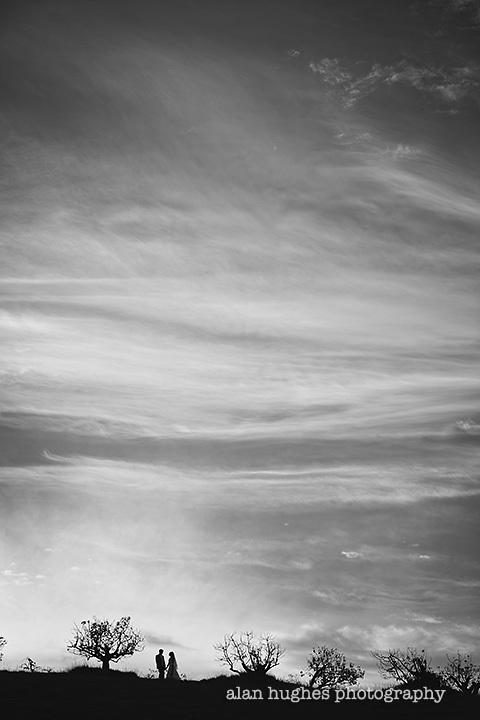 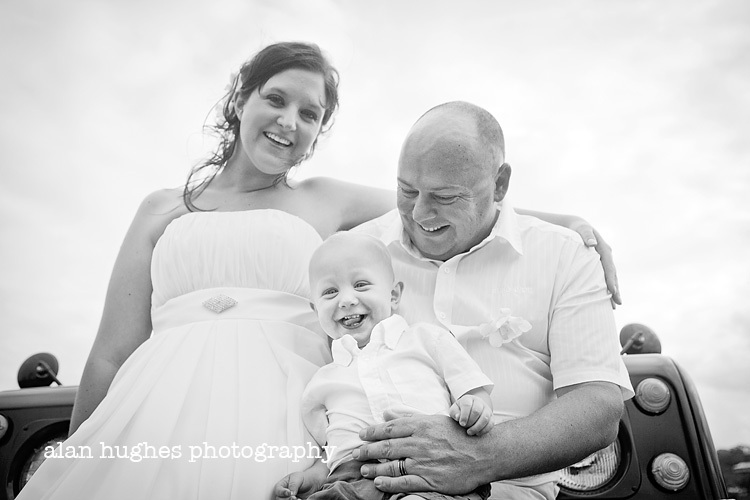 When I caught up with Emm & Jacob it was one such afternoon where there was just clouds and the light was fairly flat. 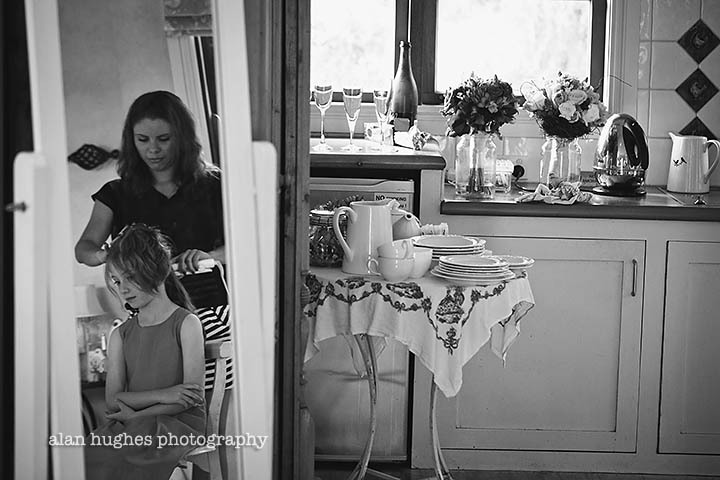 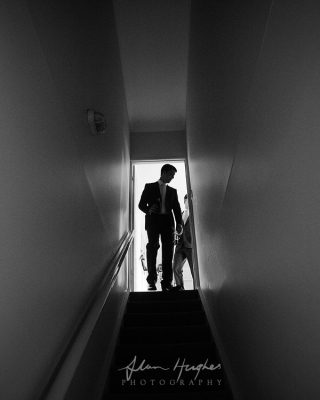 However, this made for fabulous black and white images of these two, who are getting married...err tomorrow at Annabella Wedding Chapel. 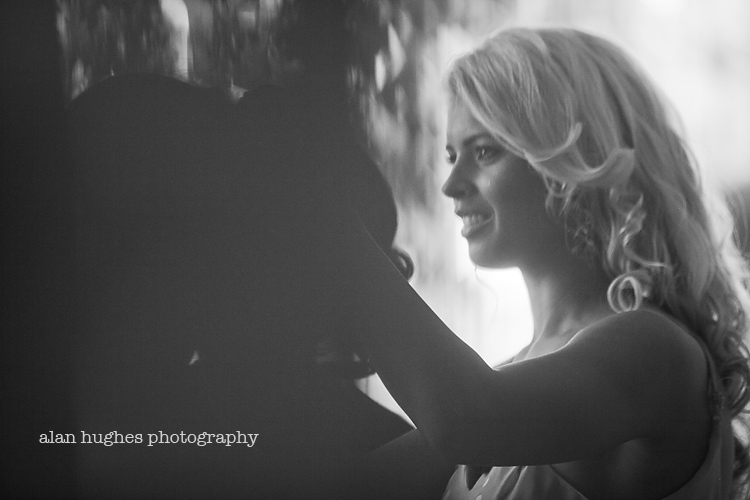 I love the feel mono gives images and I think this is the first time I've posted all black and white photos. 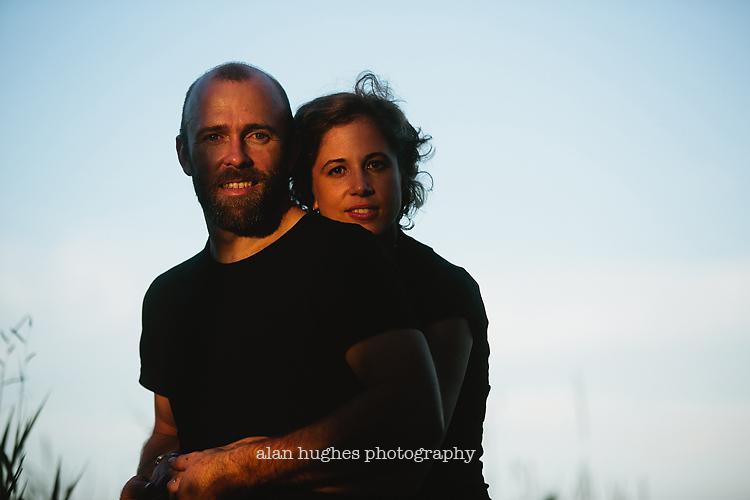 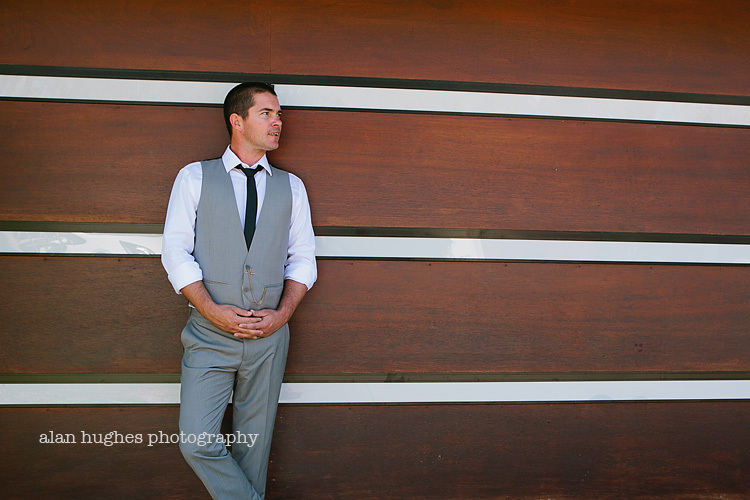 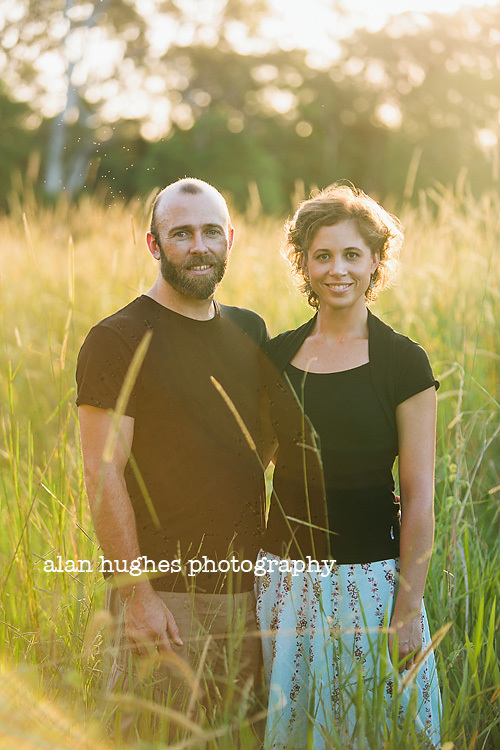 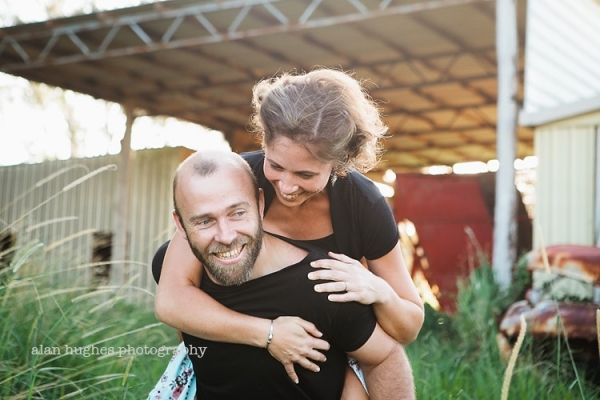 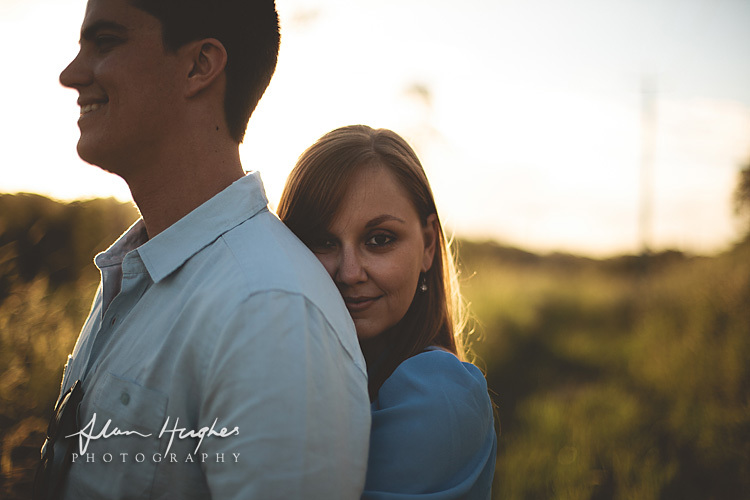 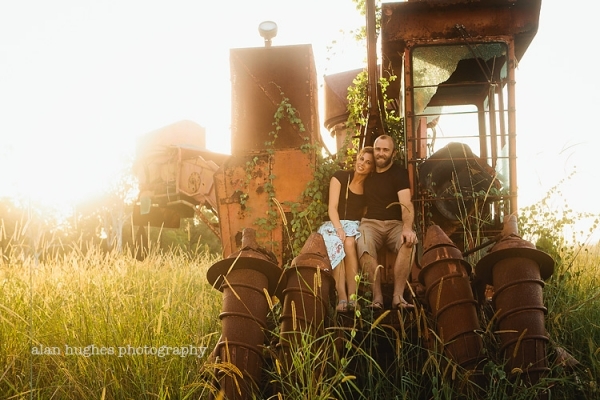 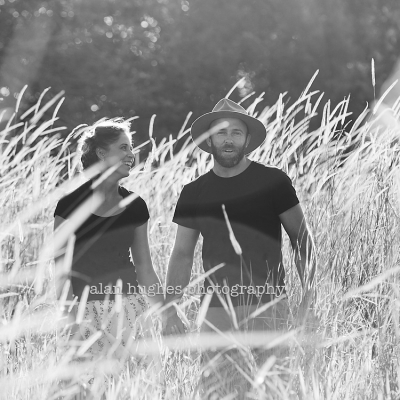 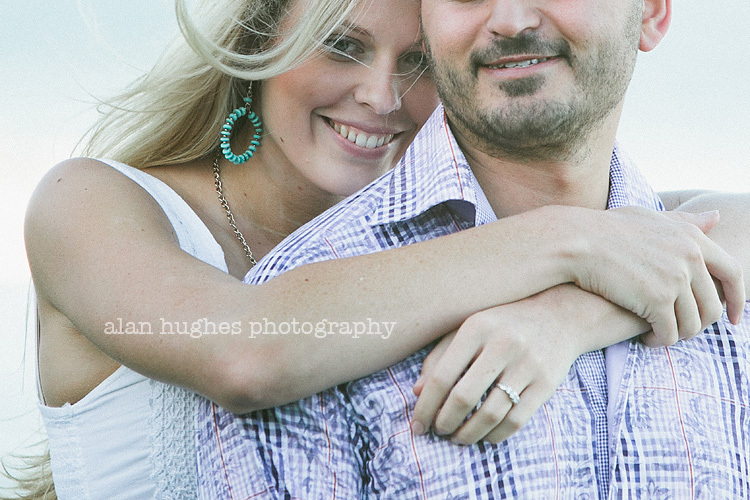 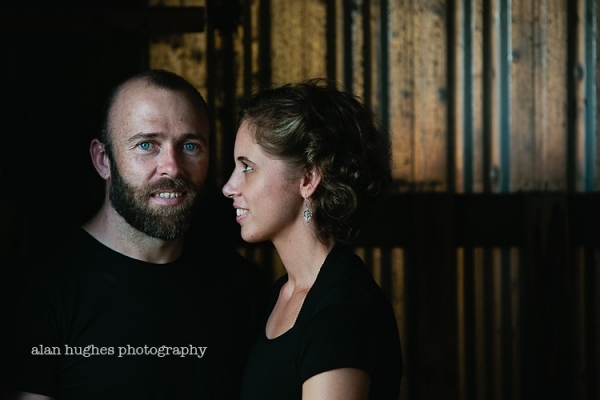 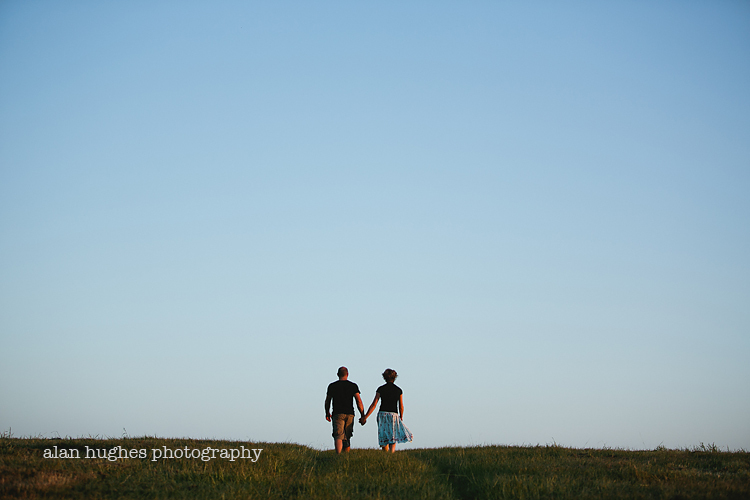 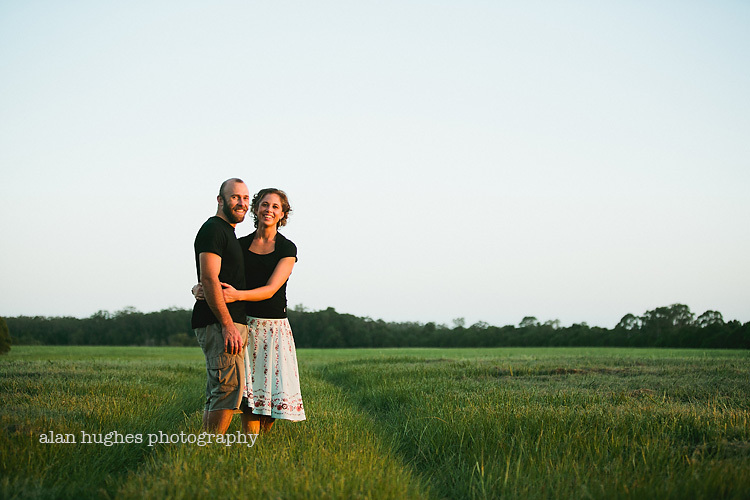 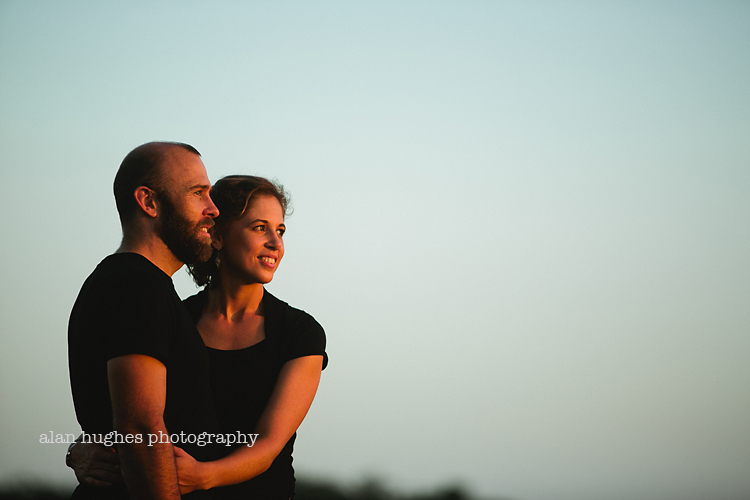 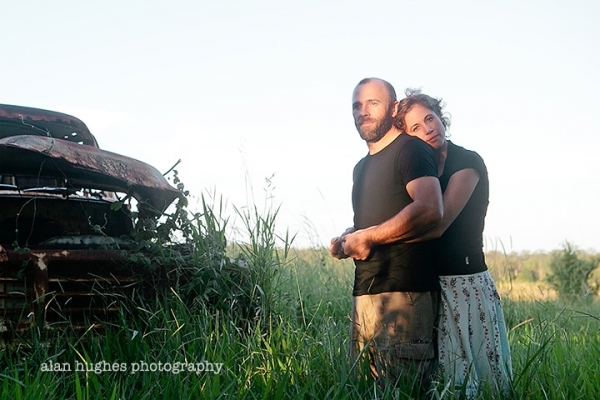 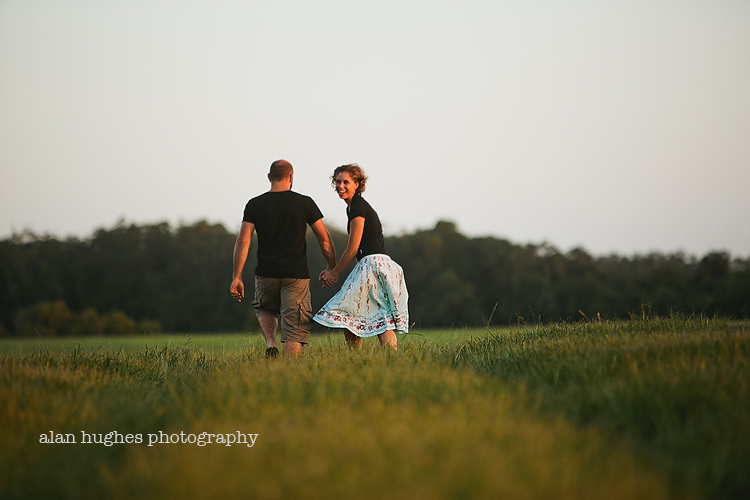 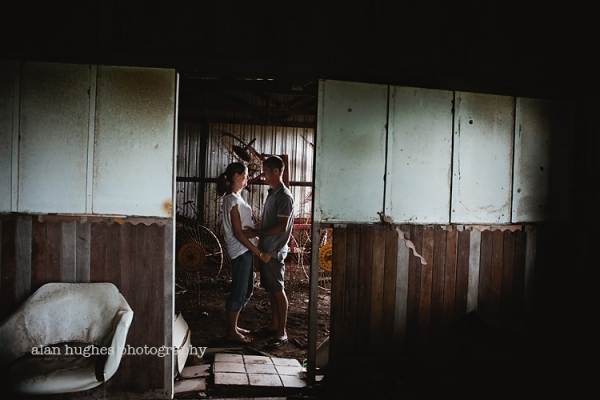 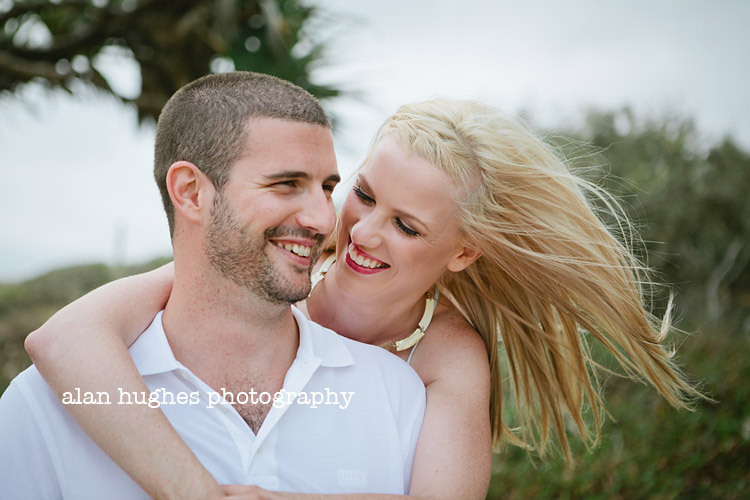 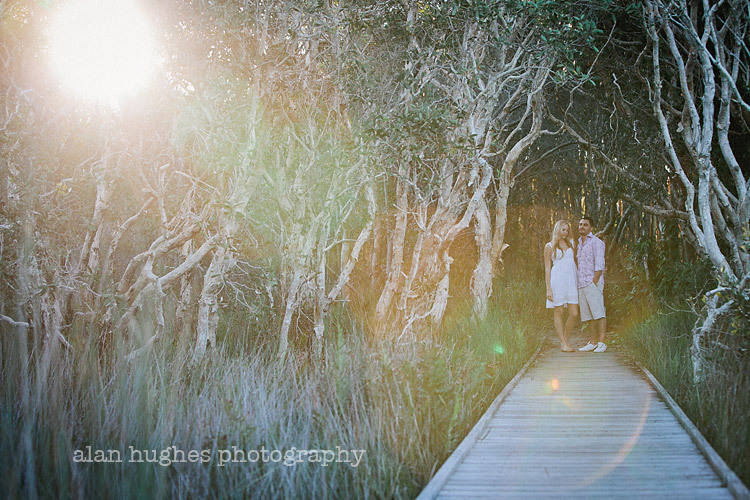 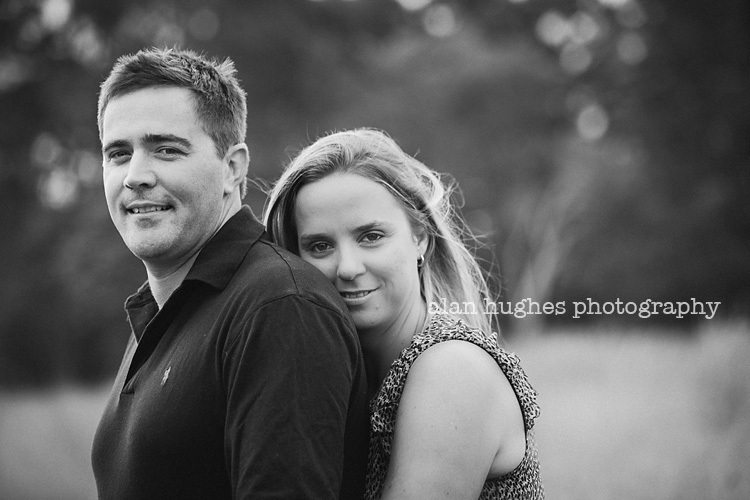 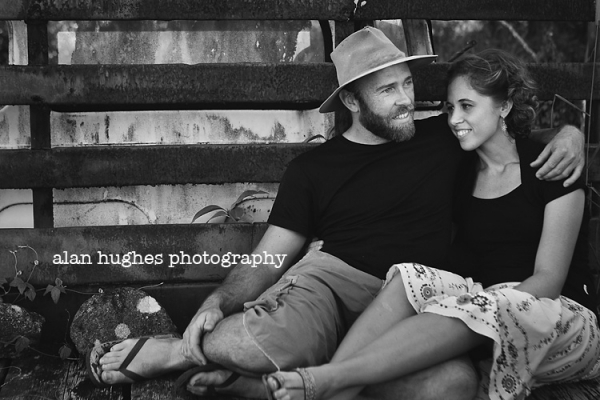 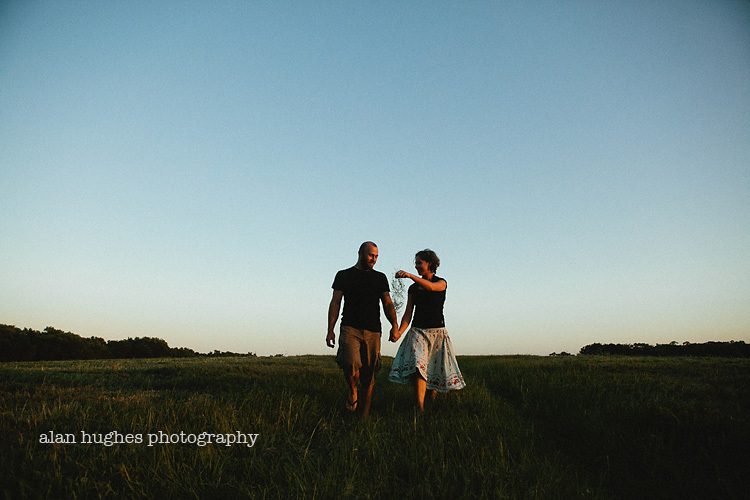 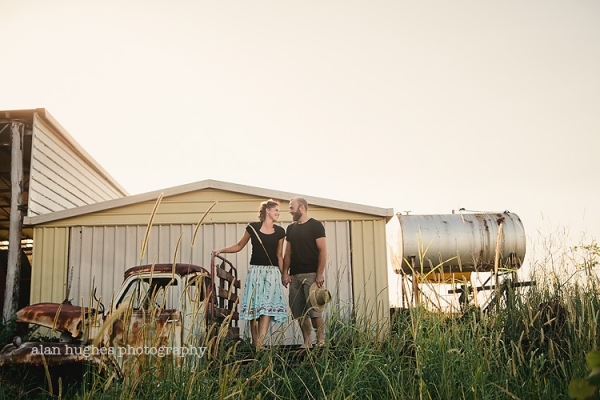 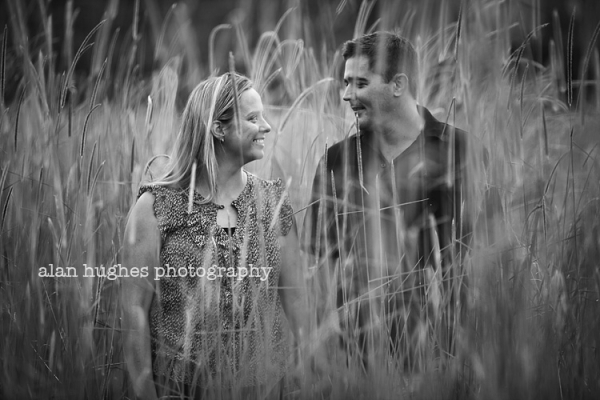 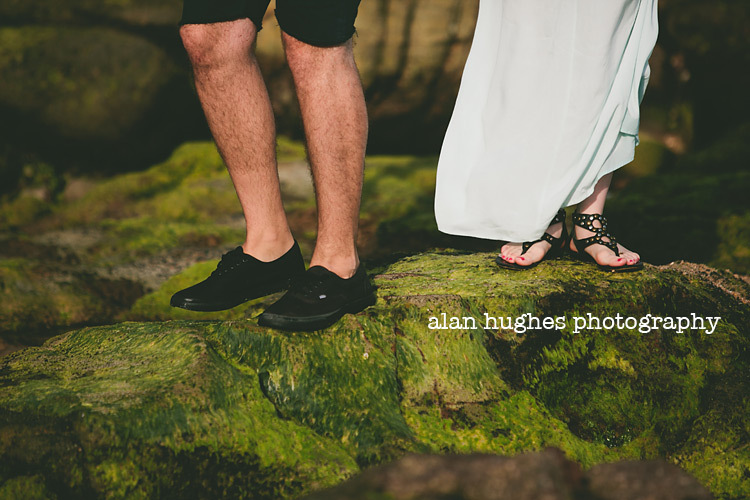 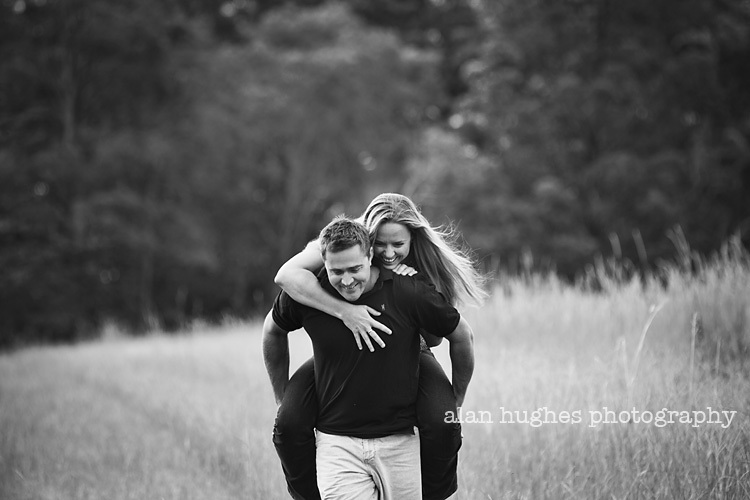 I caught up with Rachael & Ryan for their pre-wedding shoot a few days ago. 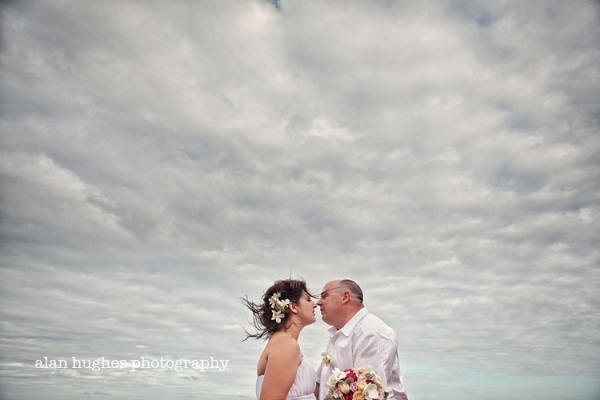 We headed down to Point Arkright on a perfect afternoon - plenty of sunshine and some beatiful clouds offshore. 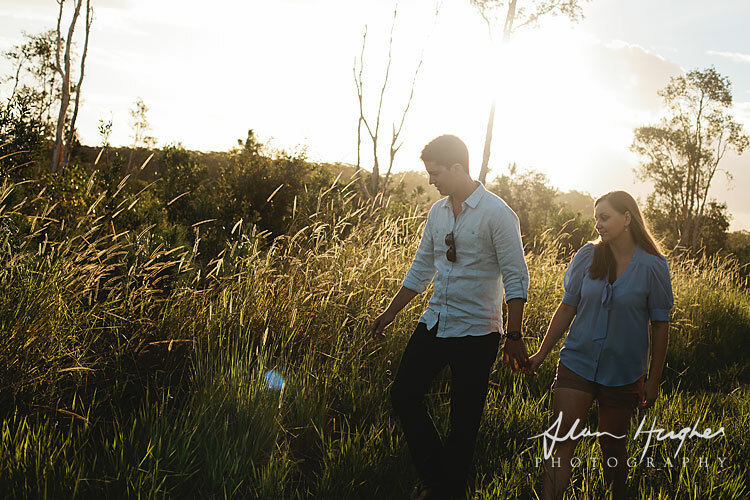 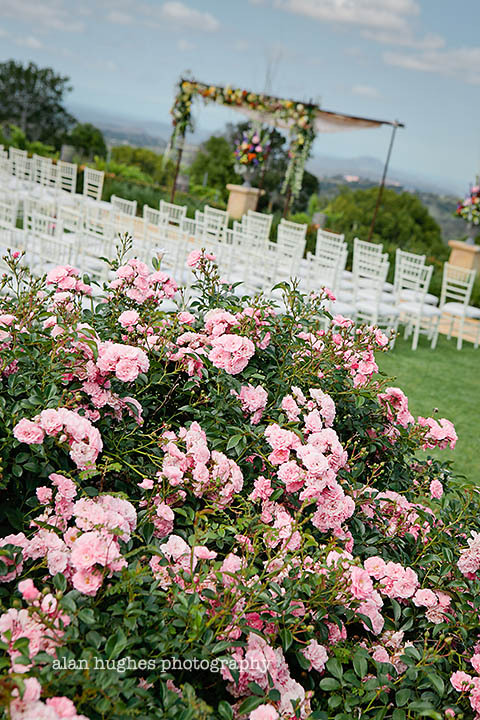 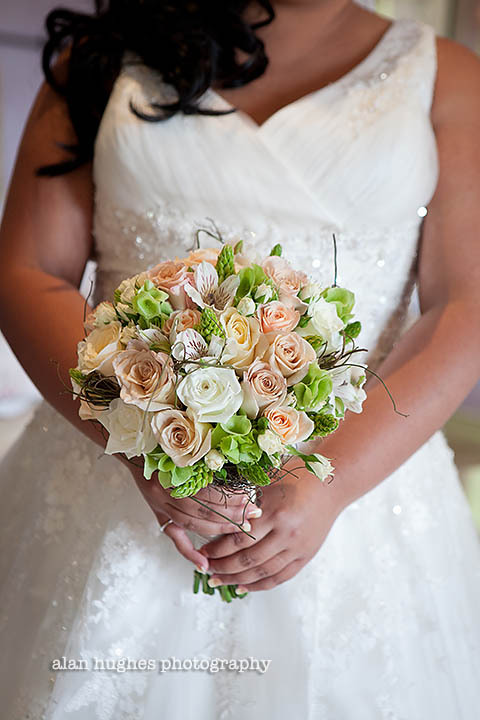 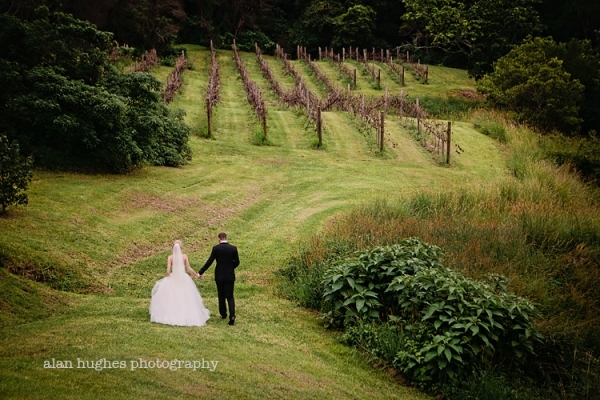 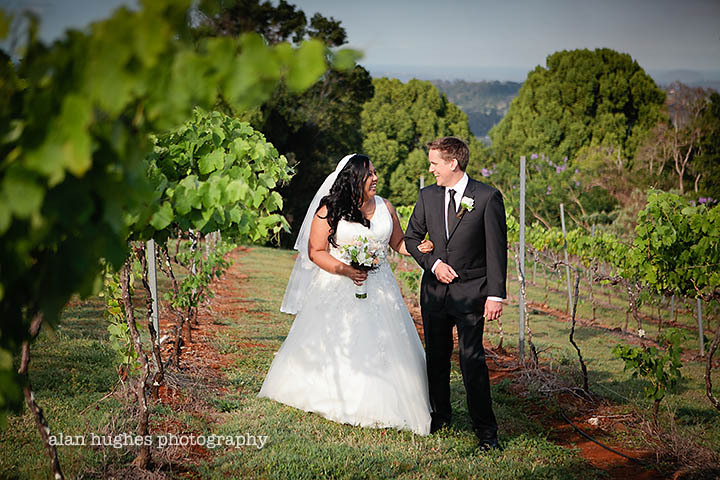 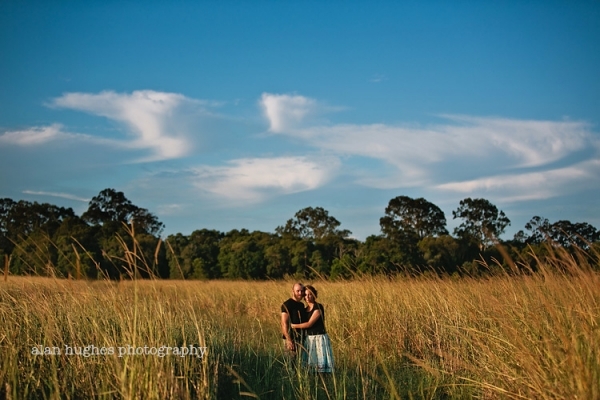 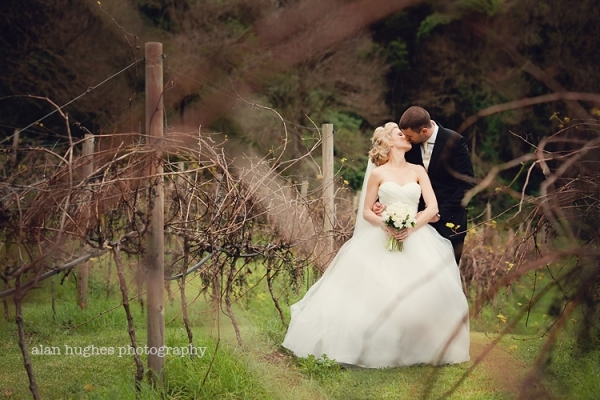 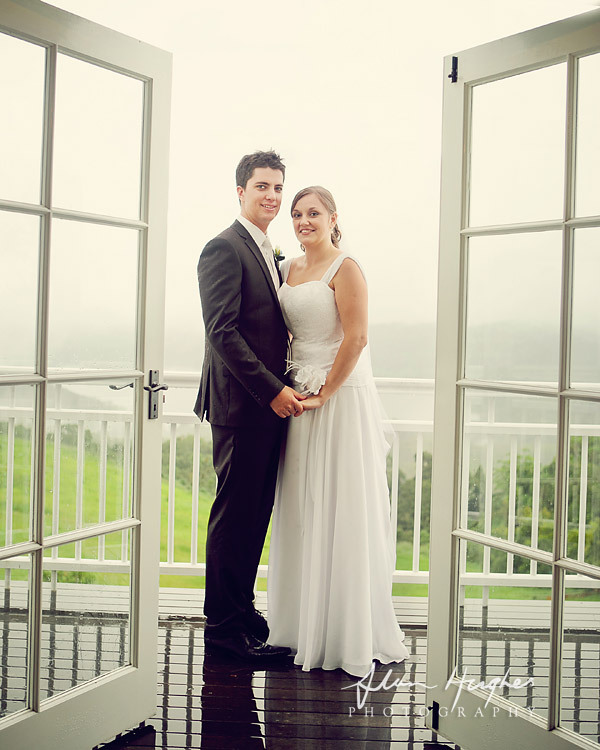 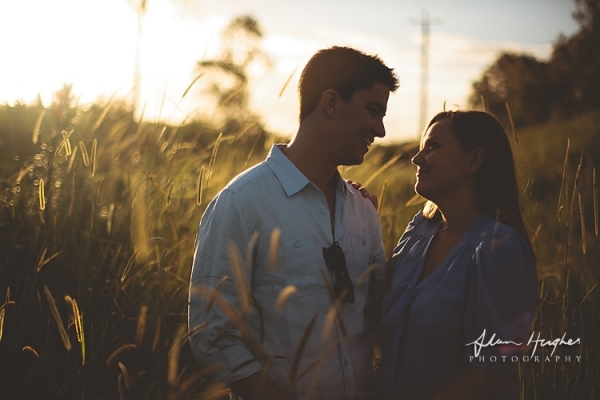 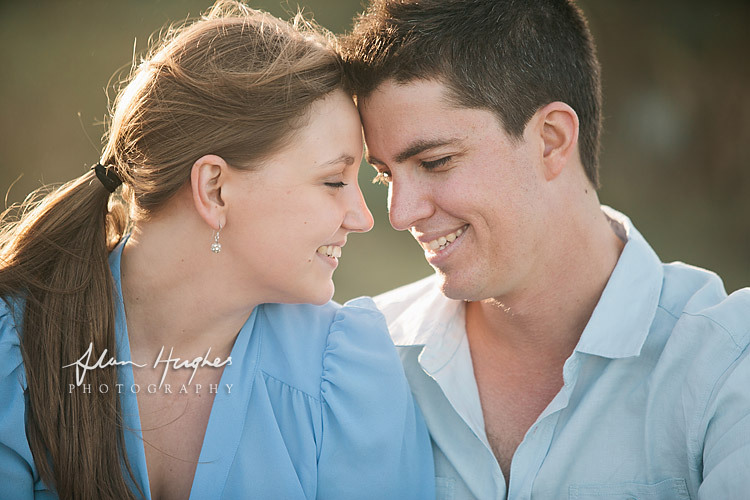 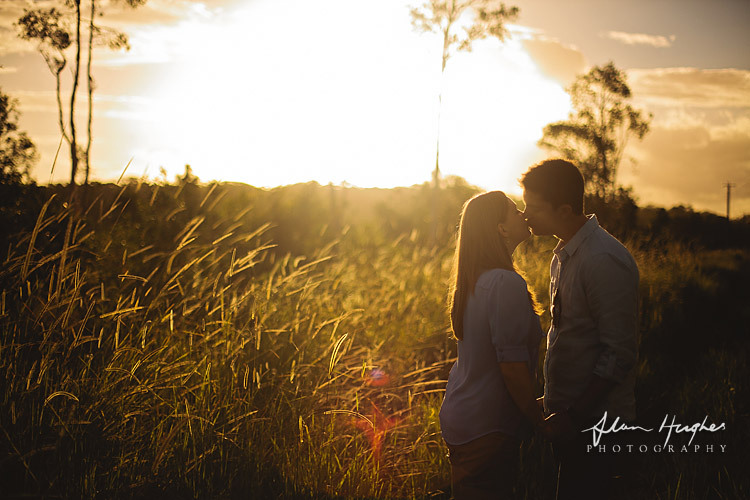 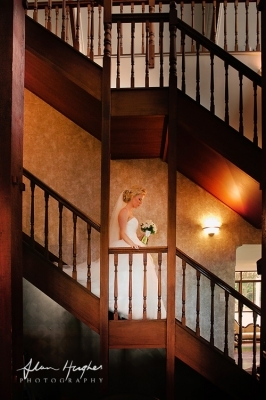 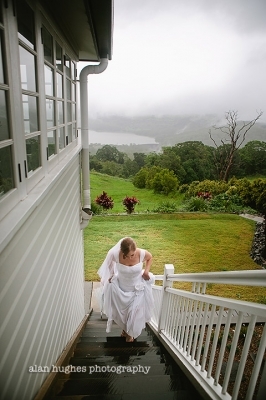 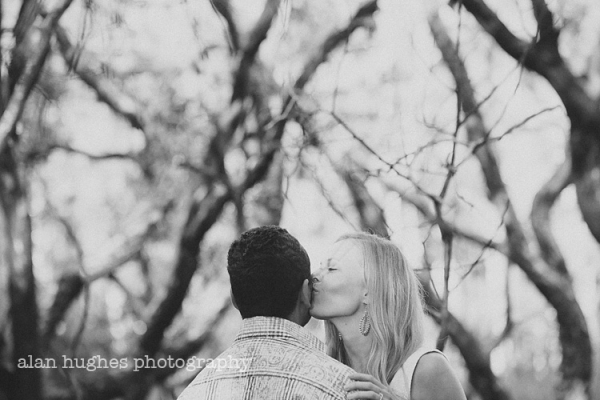 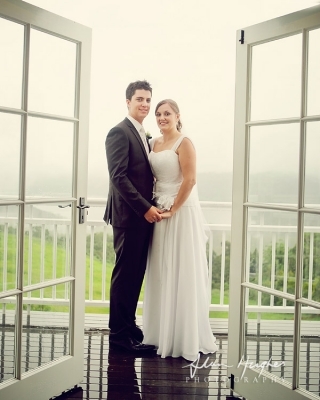 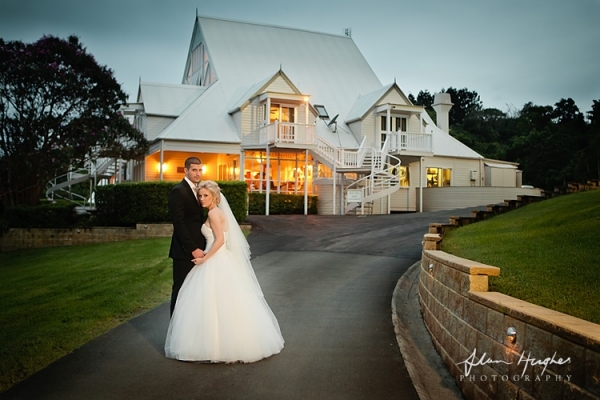 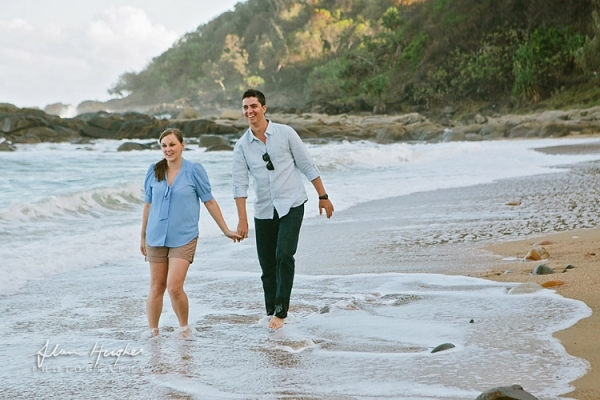 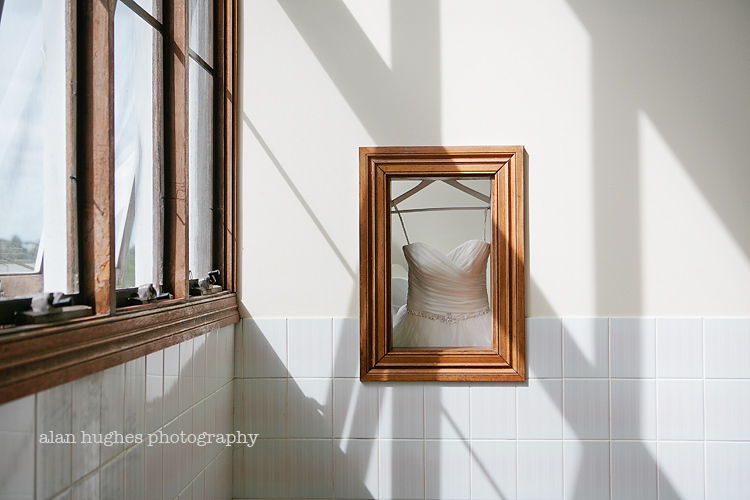 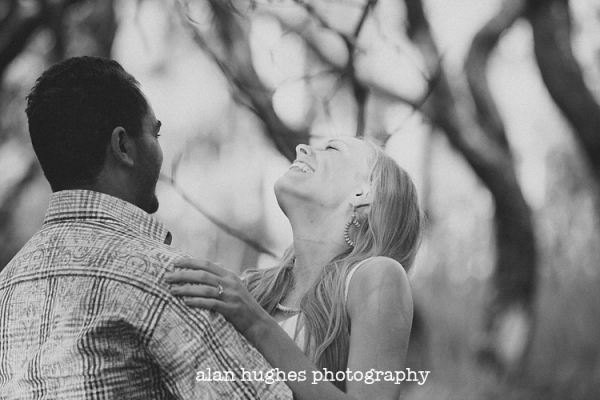 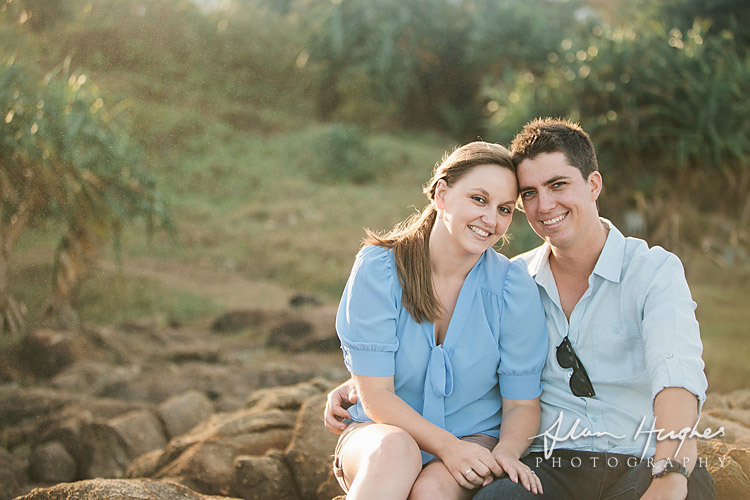 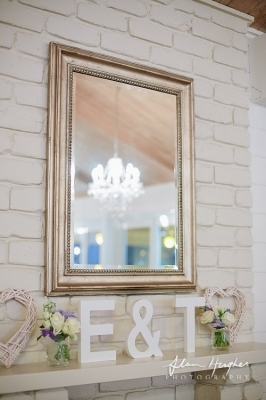 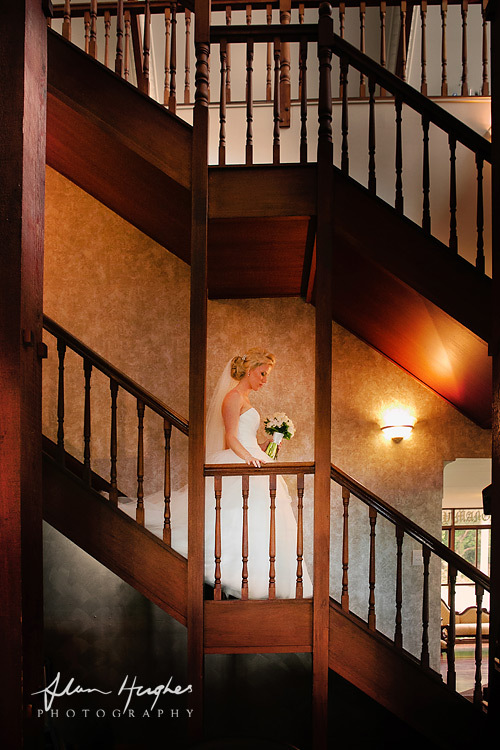 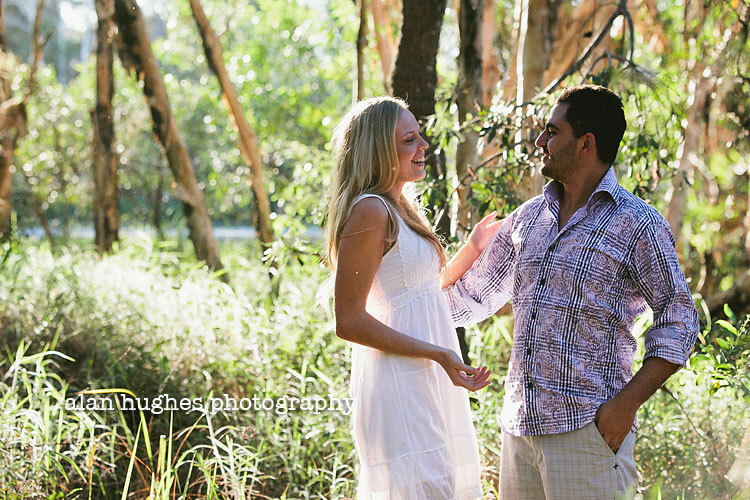 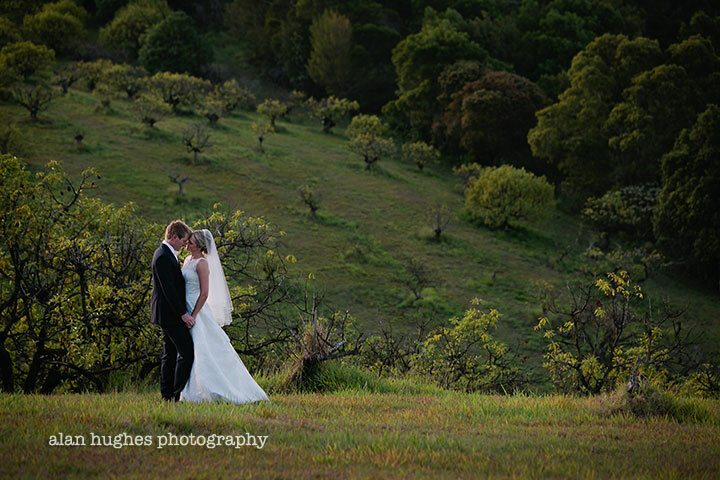 They're getting married at Maleny Manor in April on what will be another perfect day. 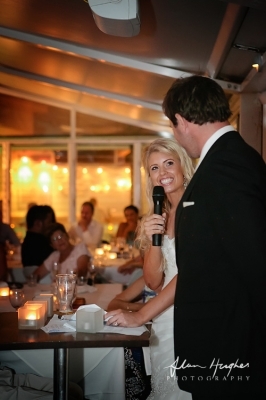 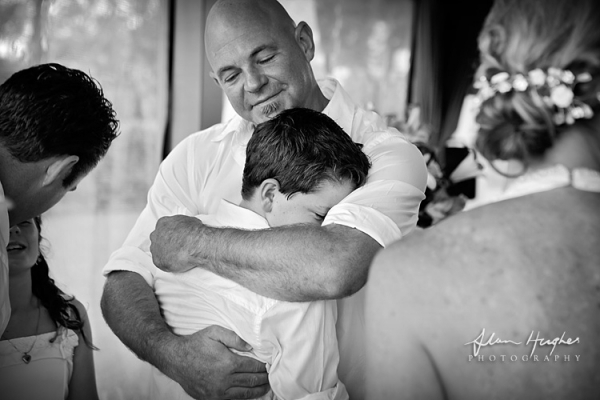 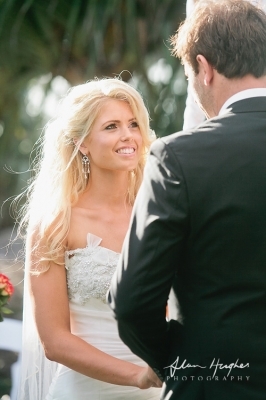 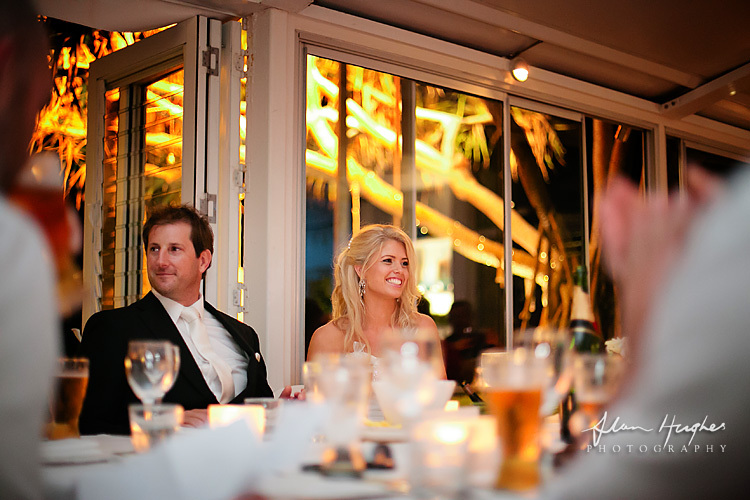 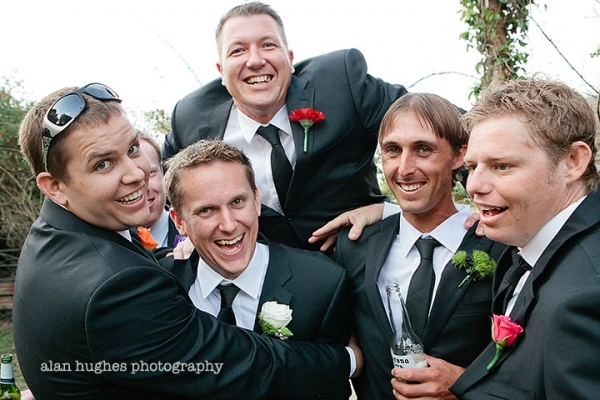 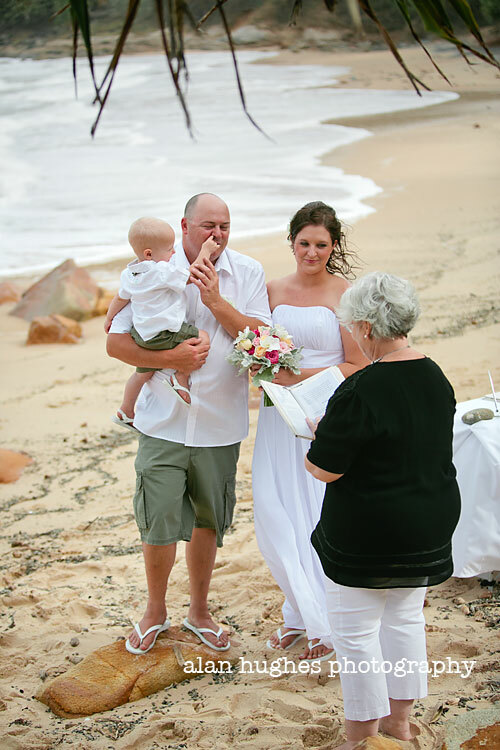 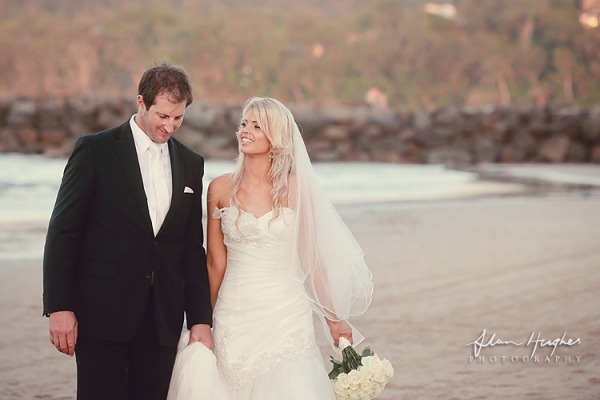 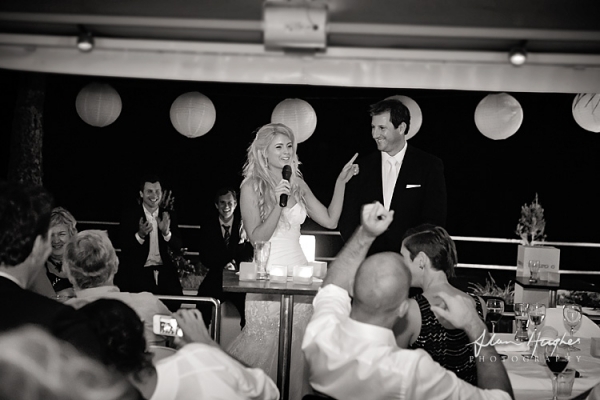 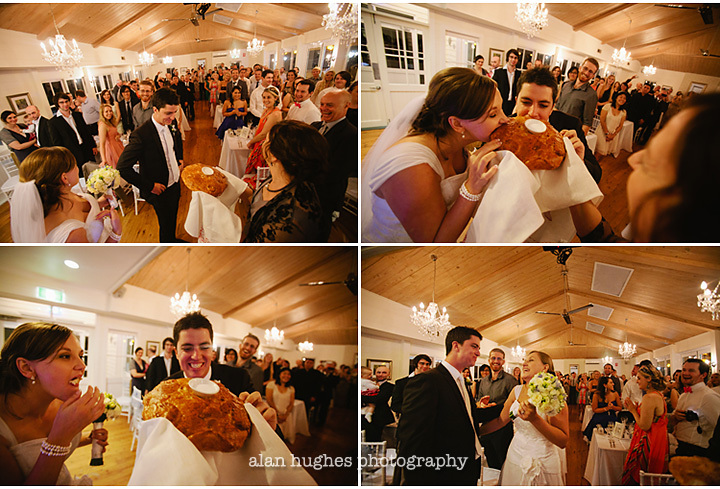 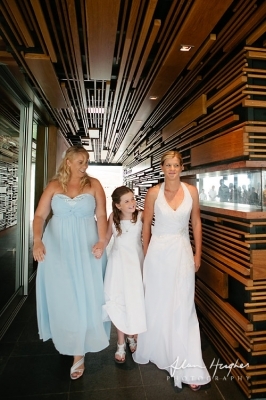 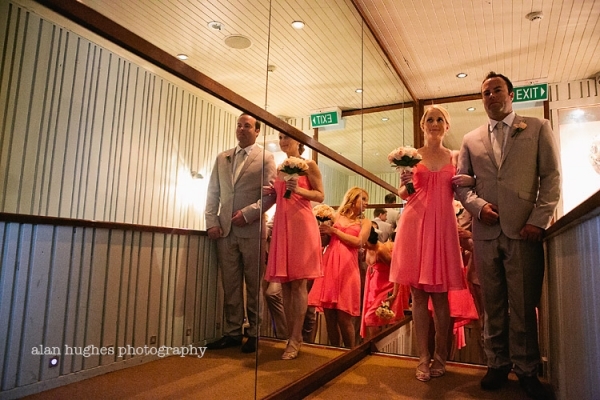 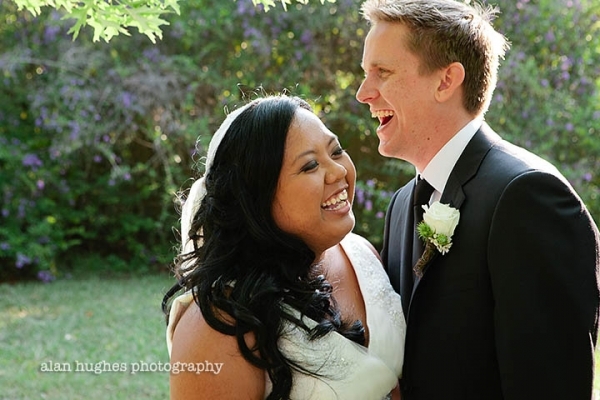 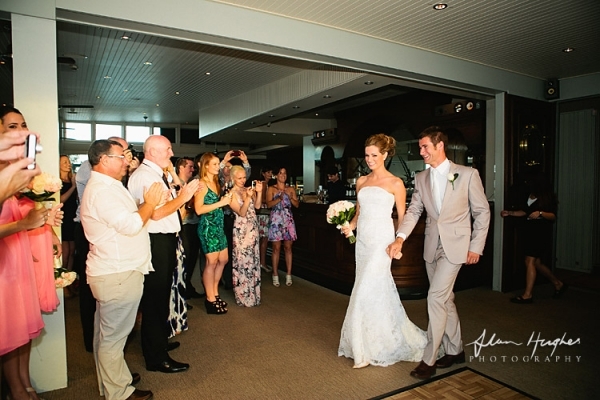 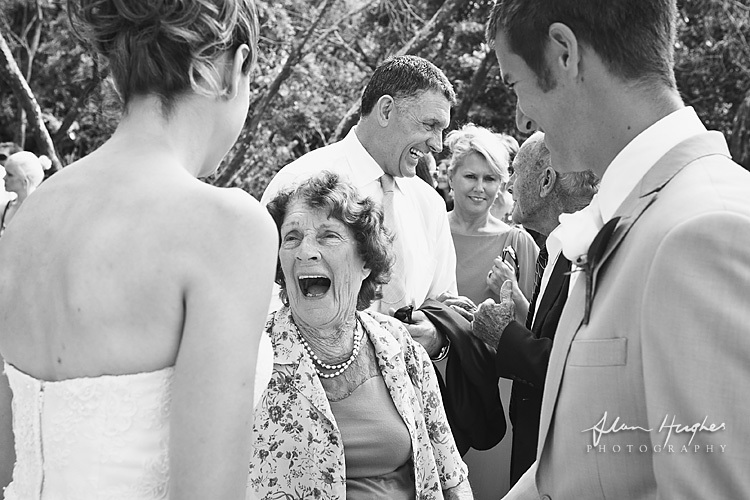 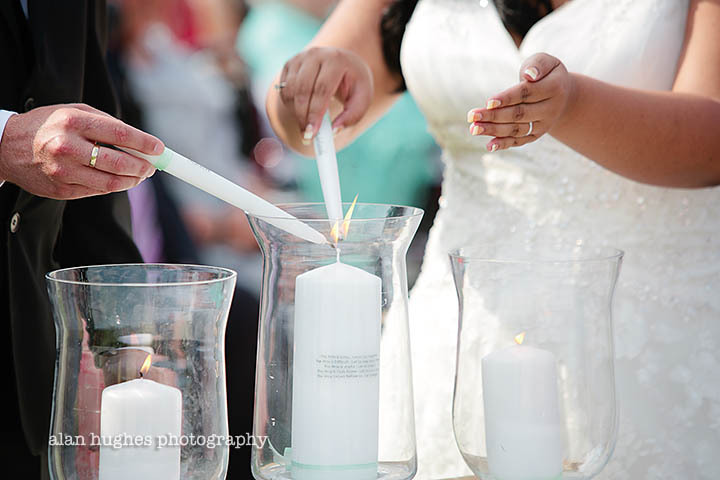 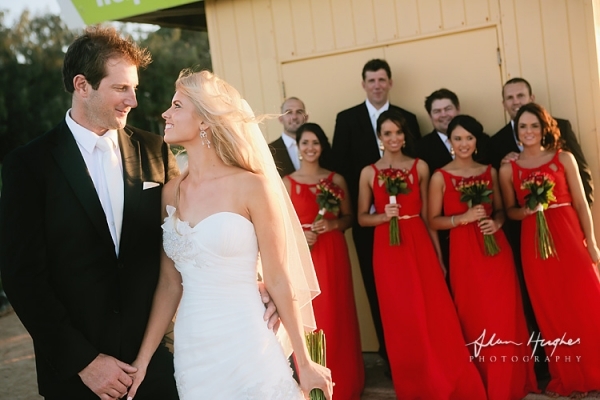 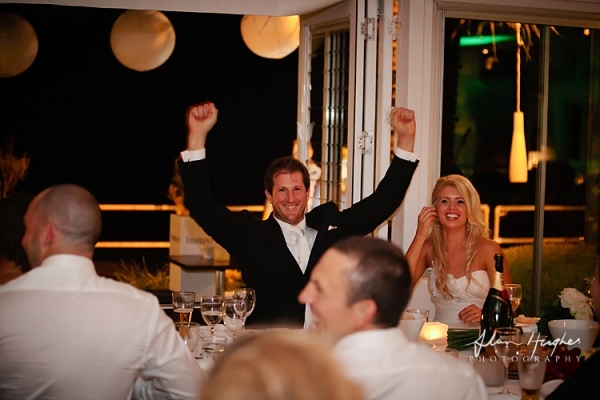 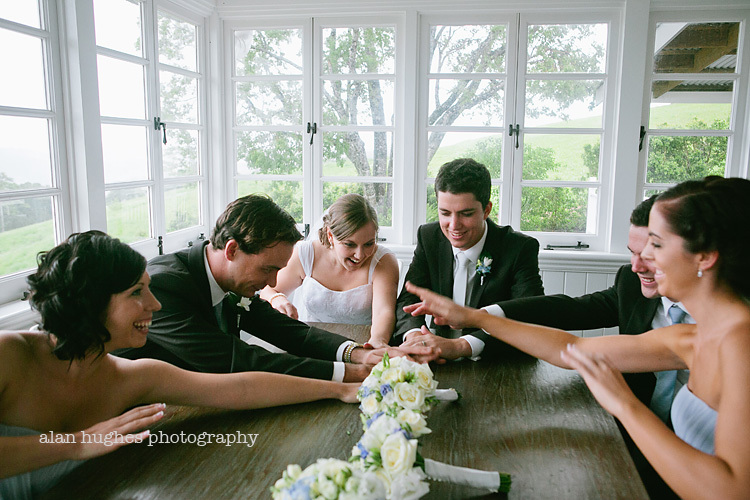 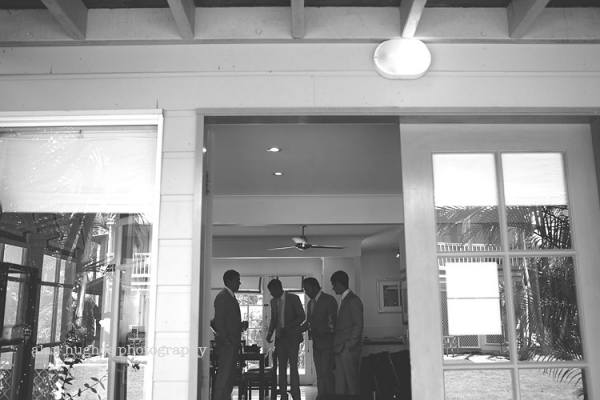 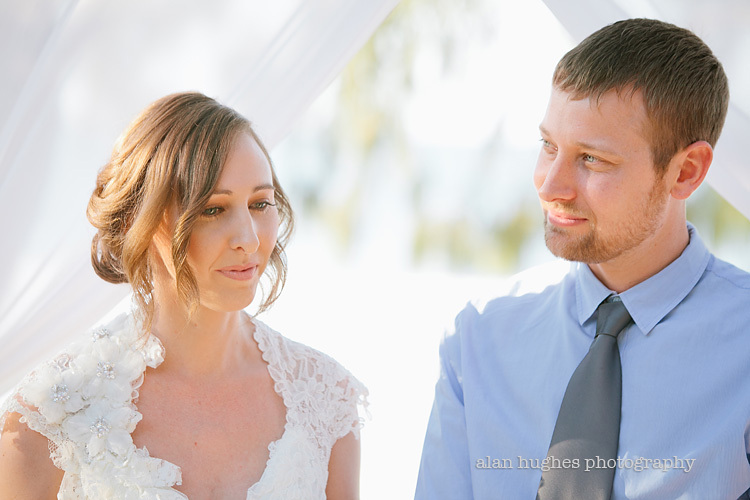 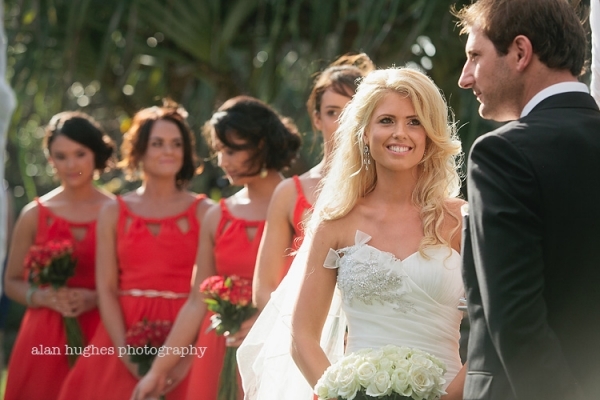 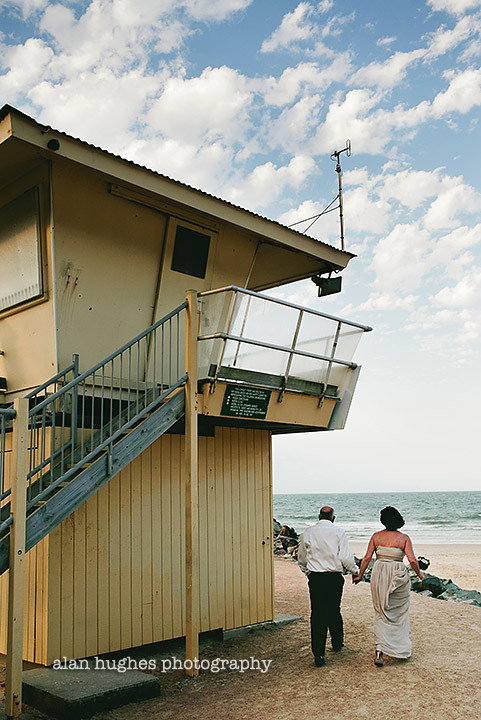 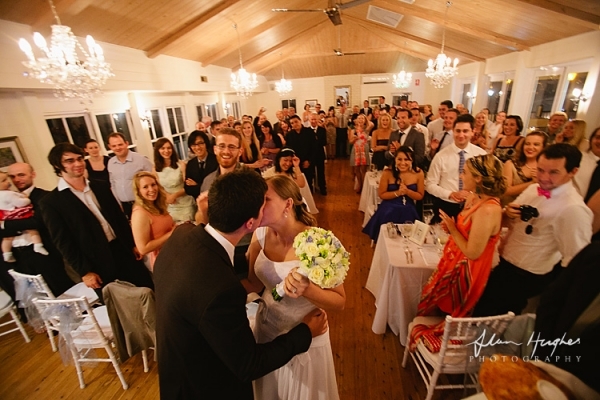 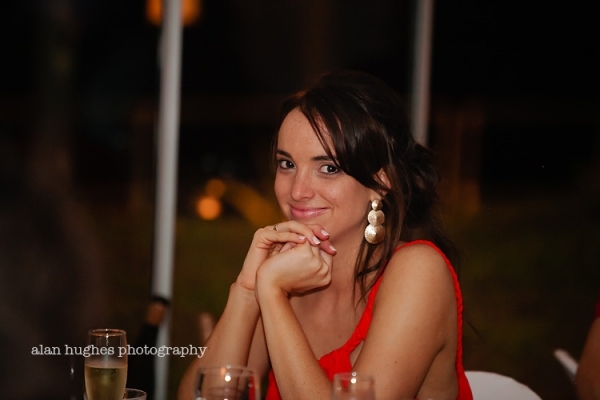 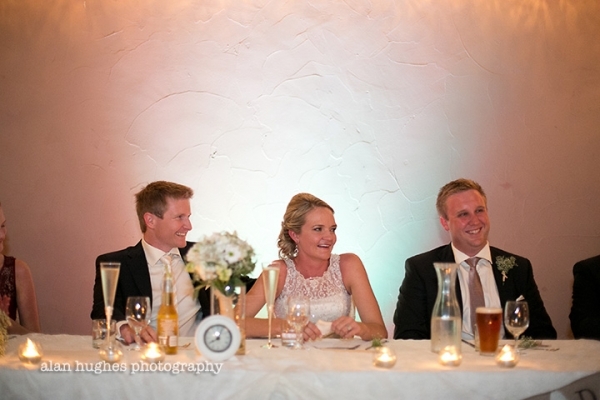 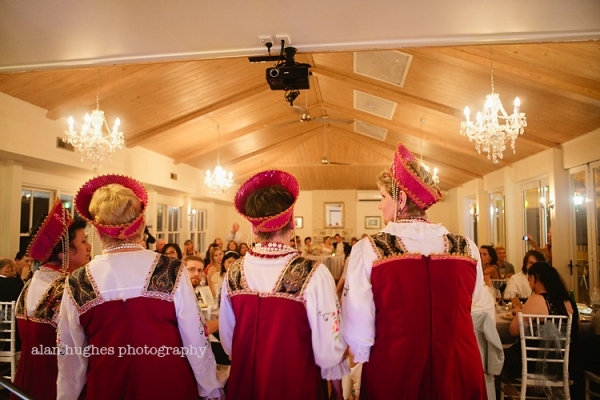 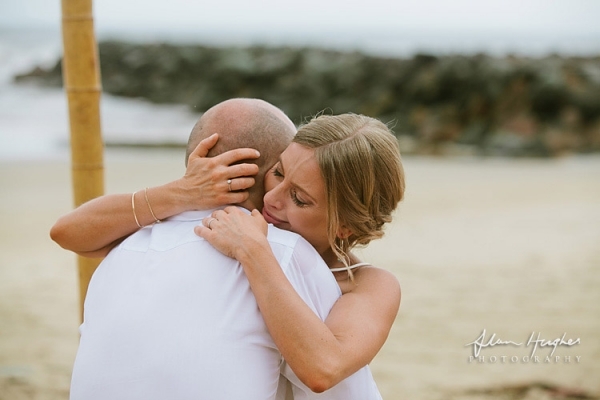 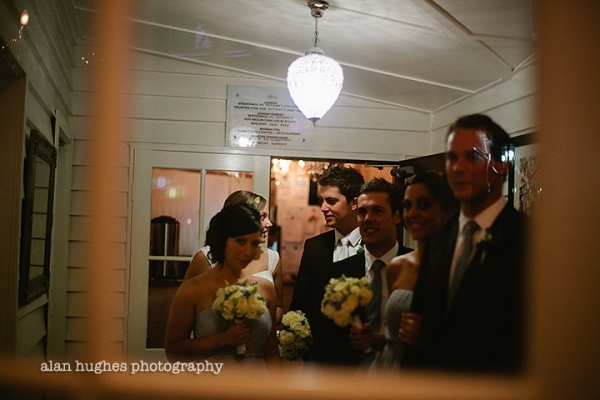 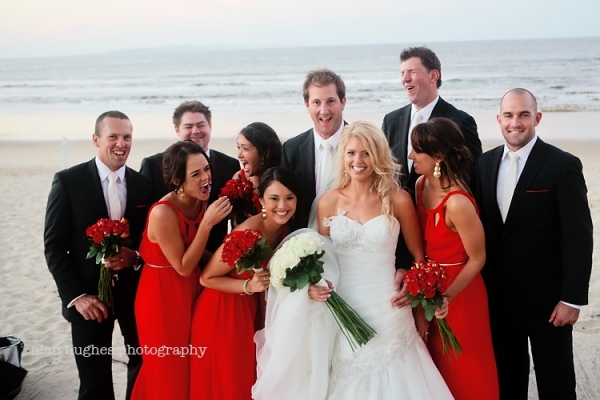 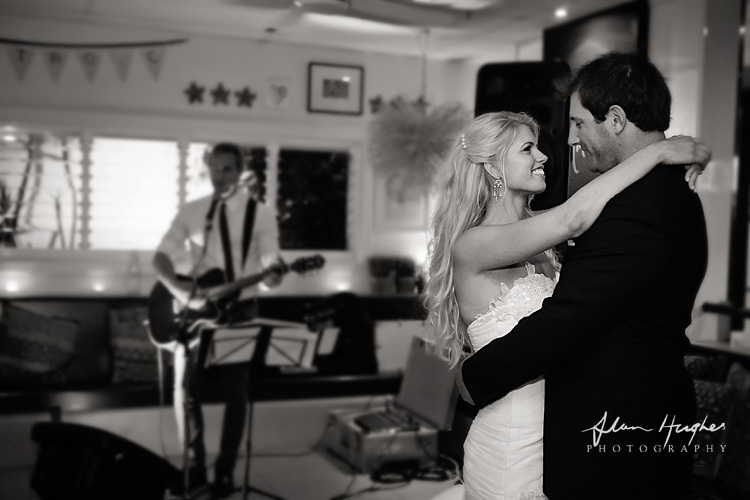 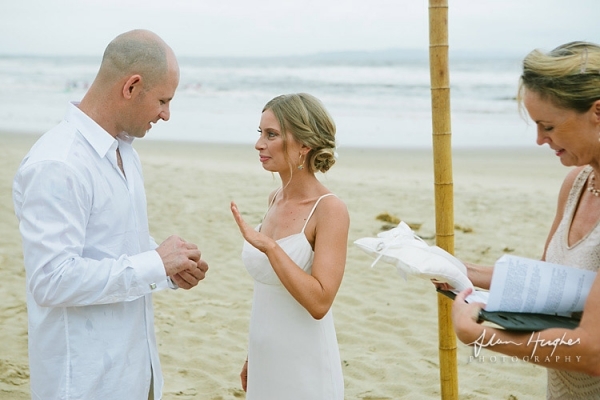 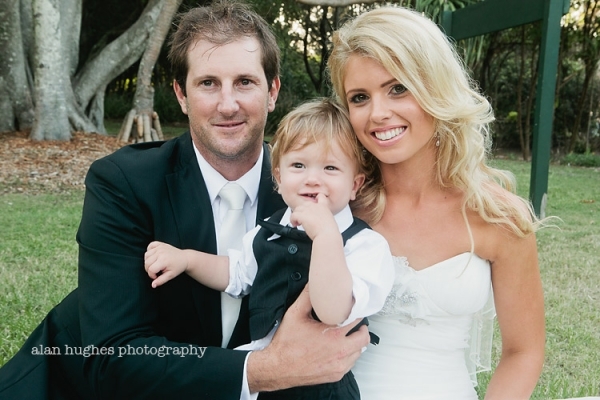 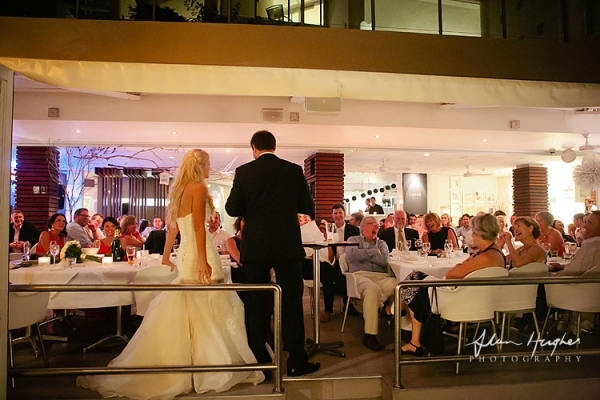 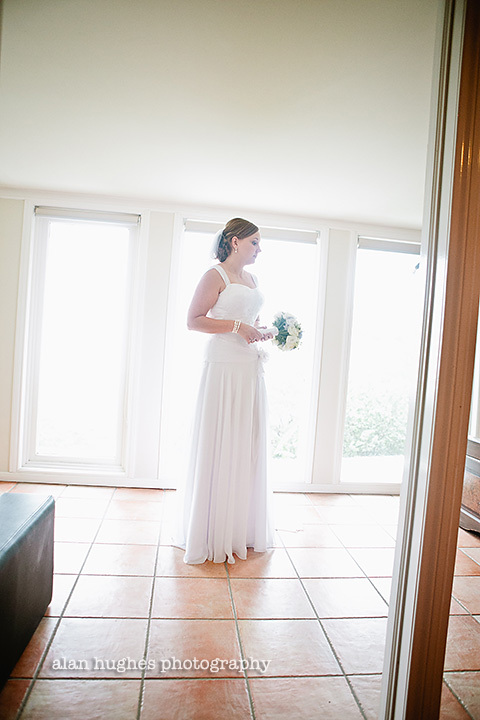 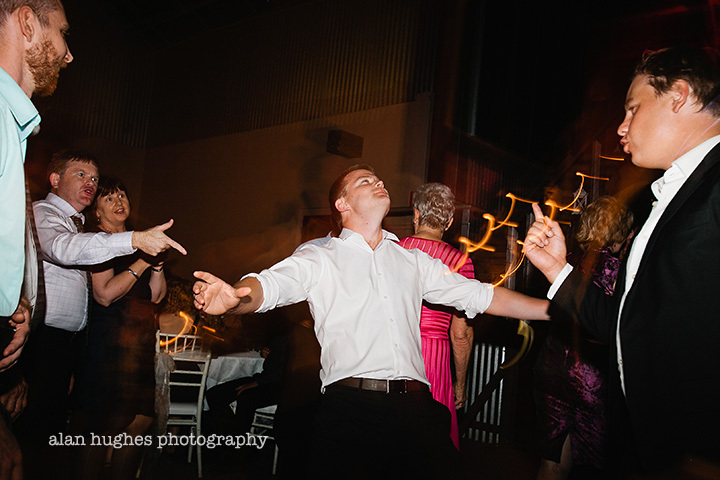 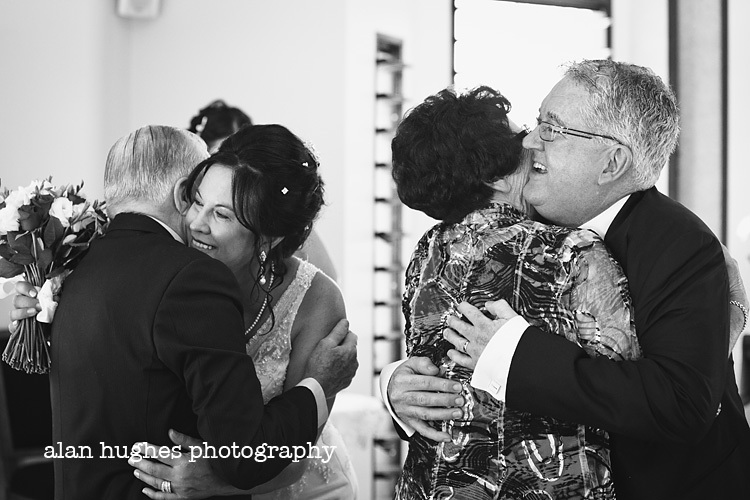 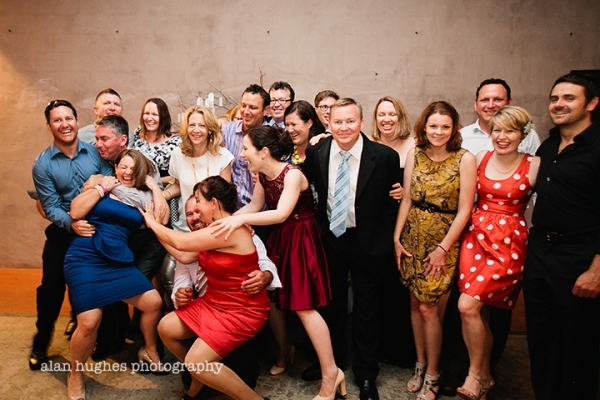 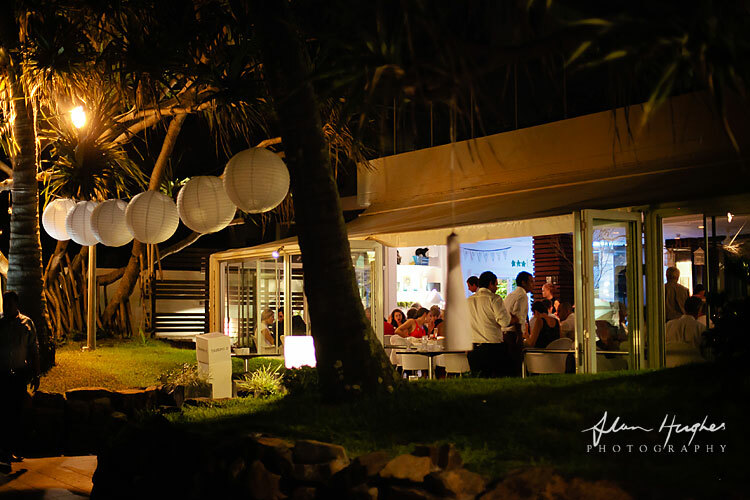 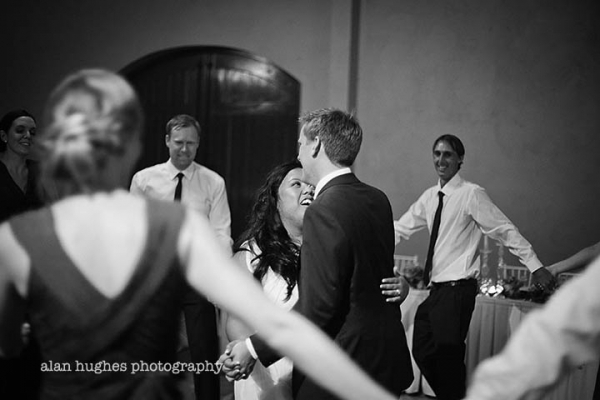 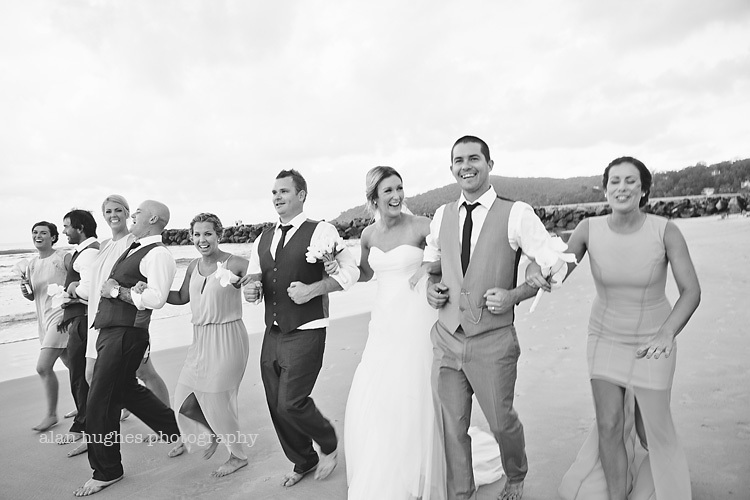 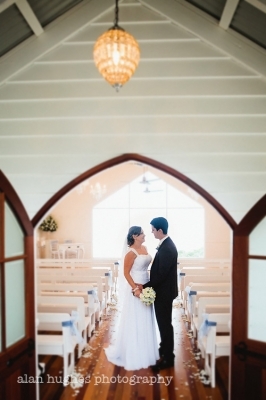 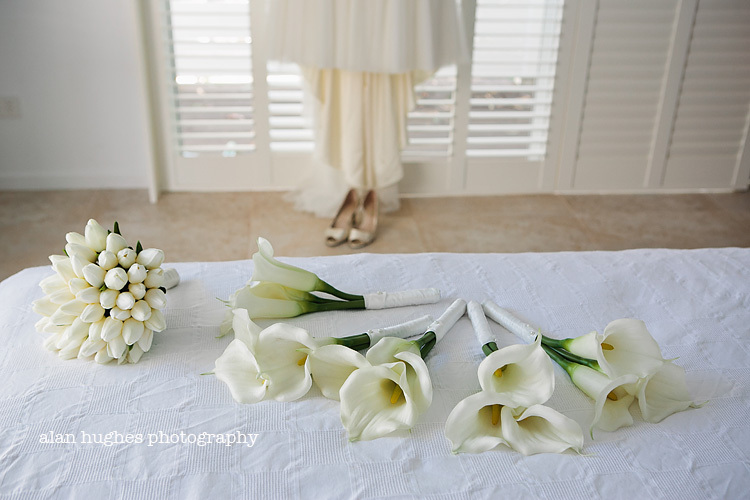 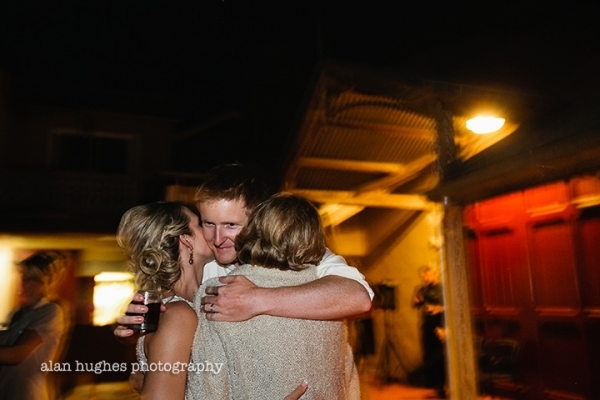 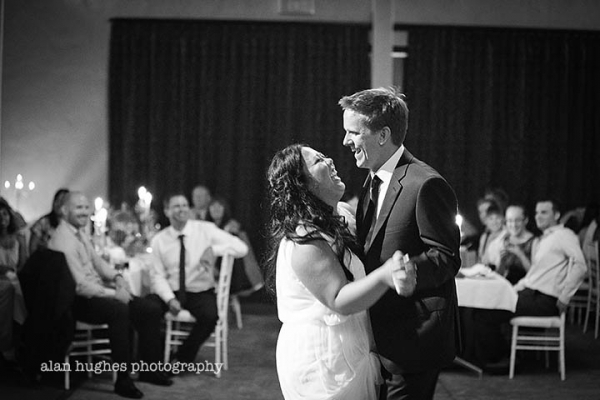 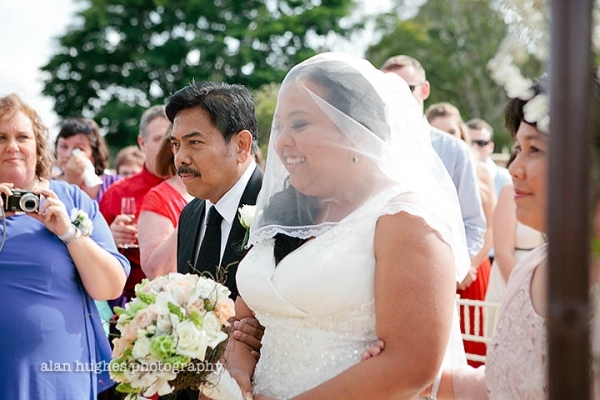 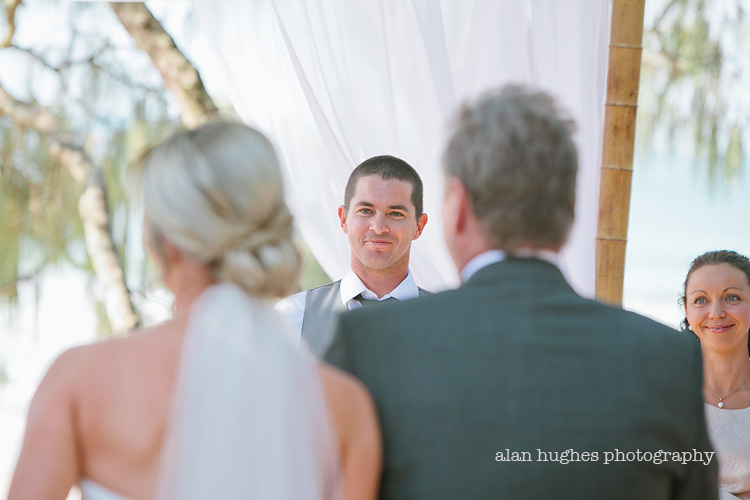 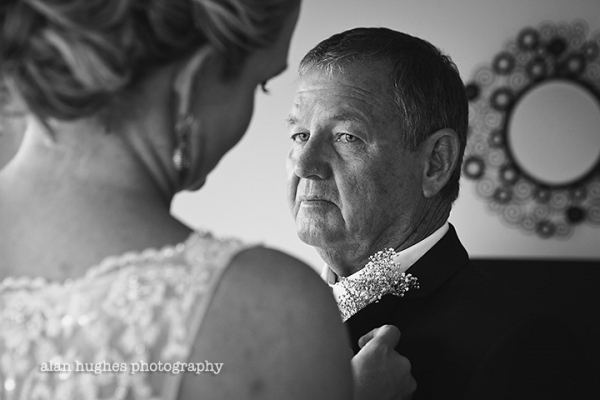 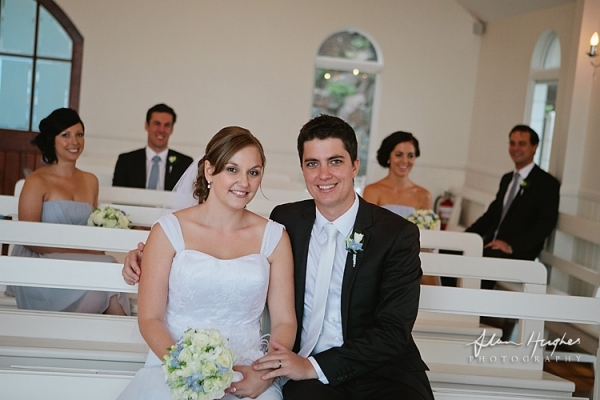 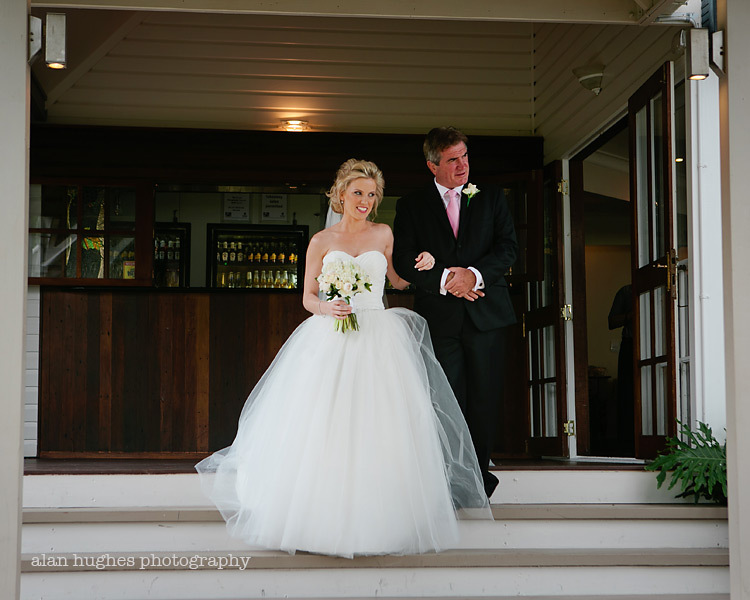 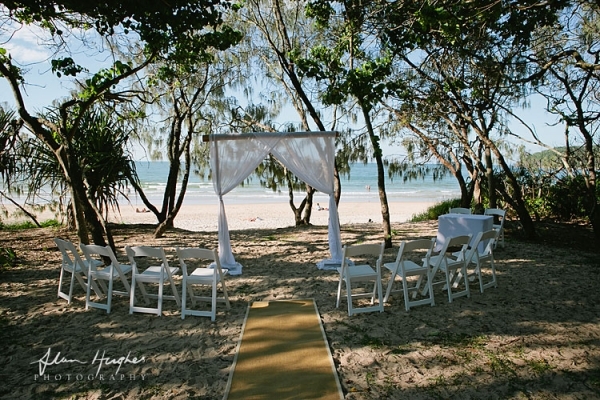 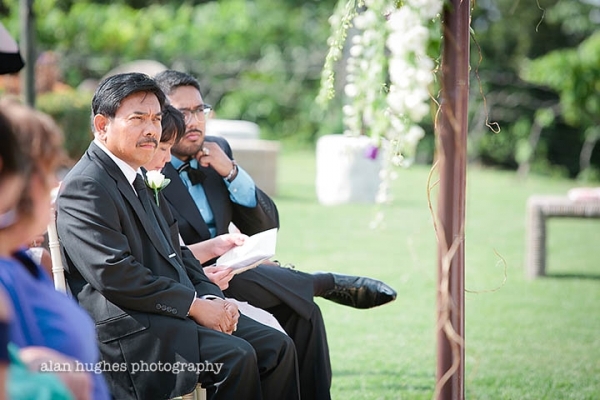 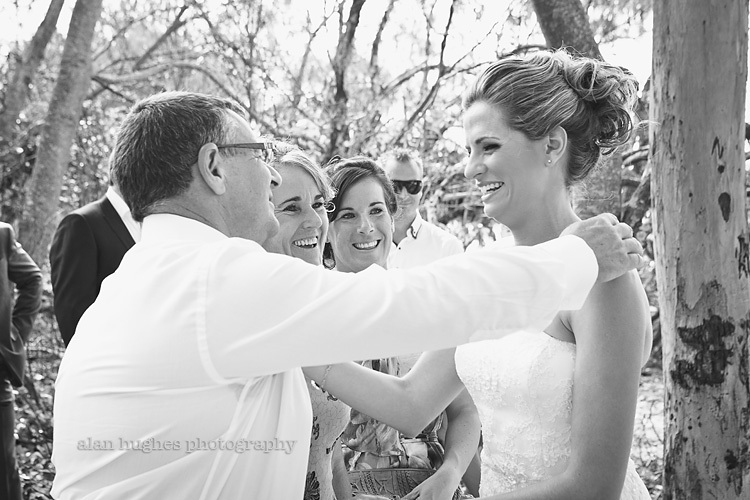 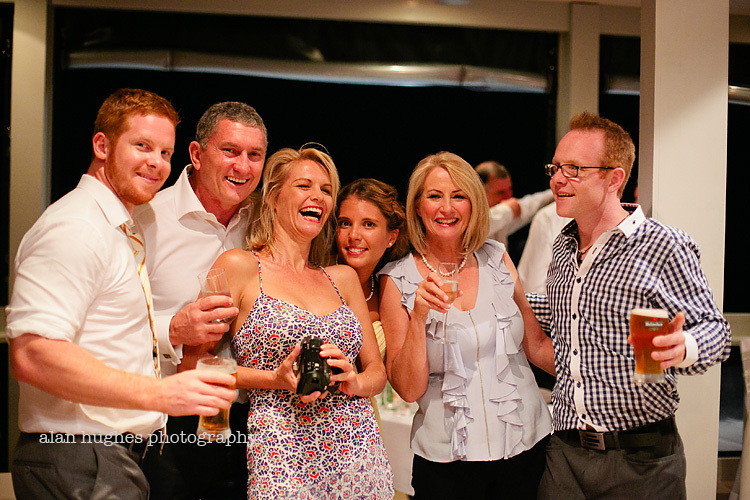 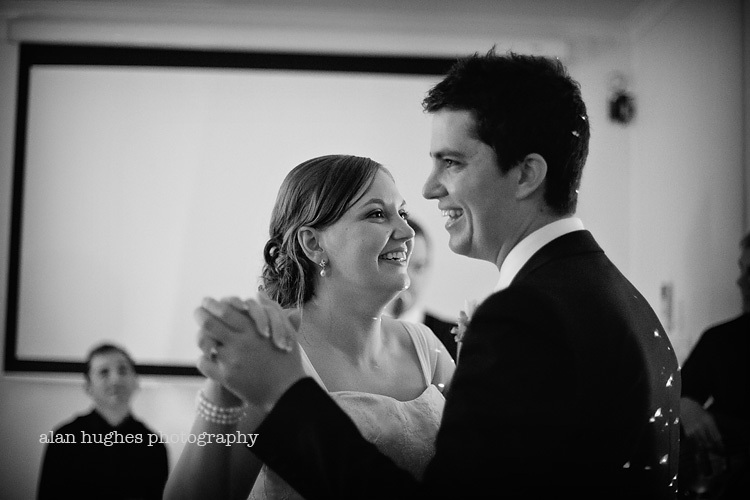 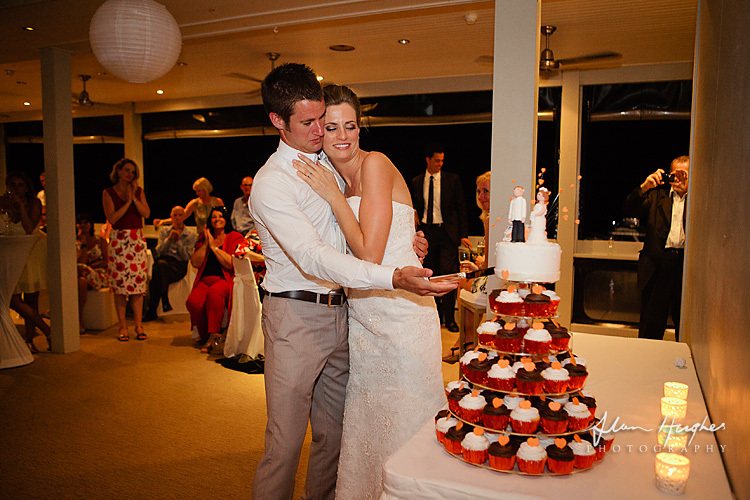 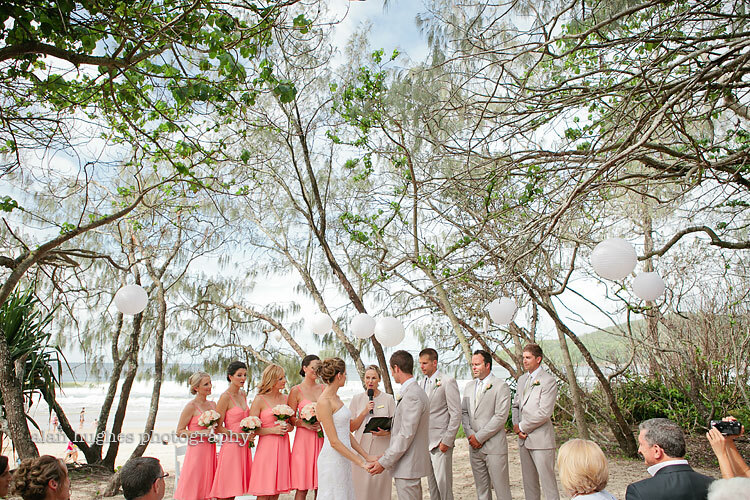 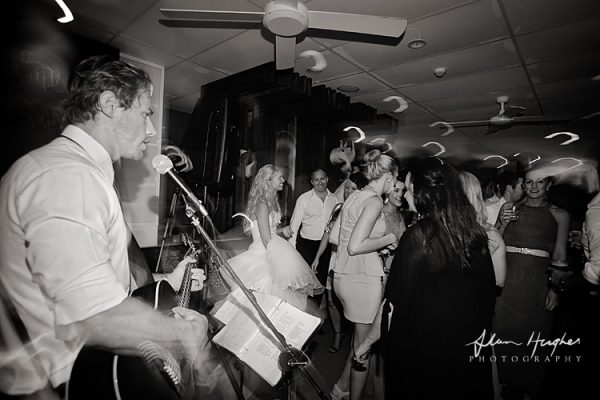 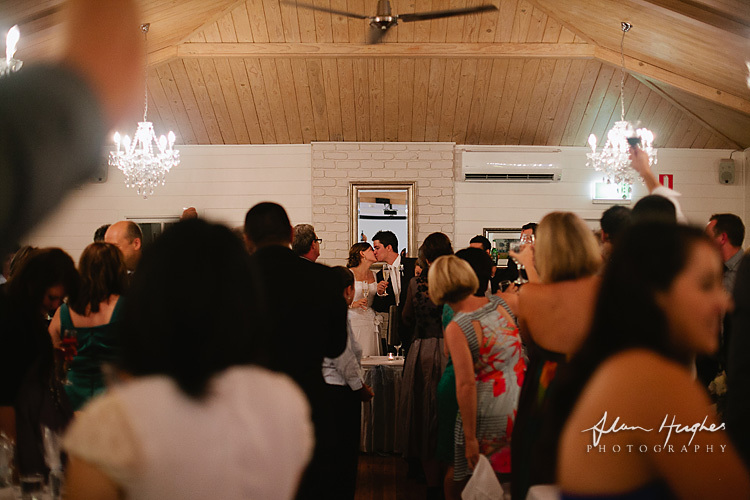 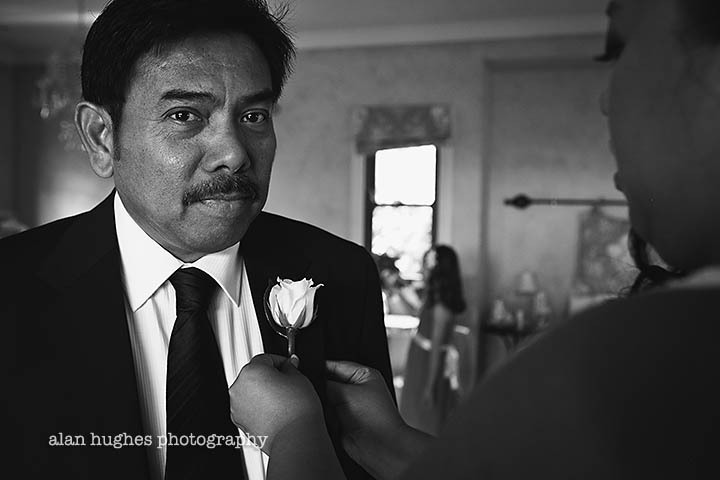 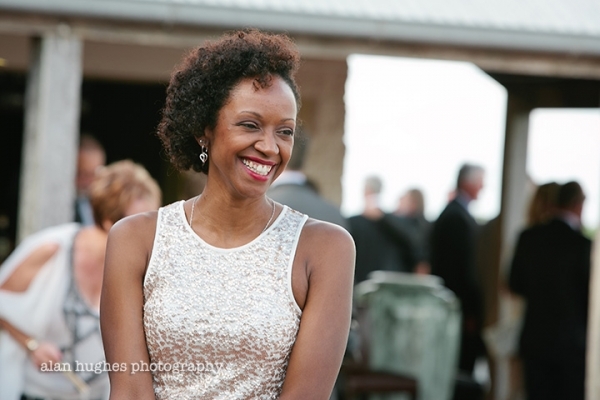 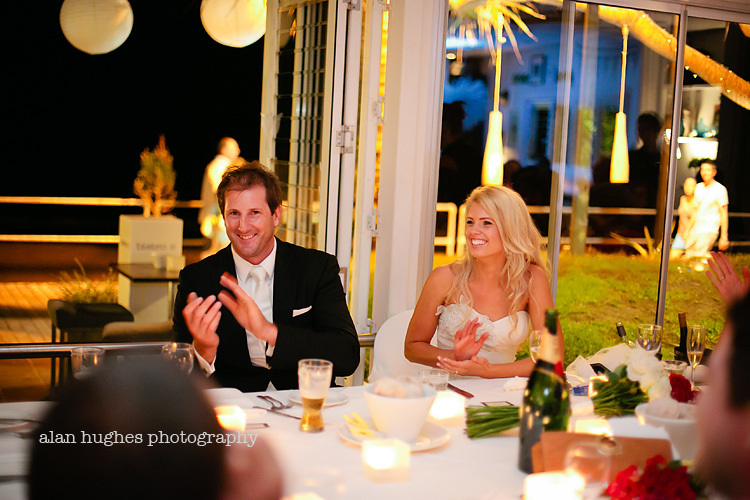 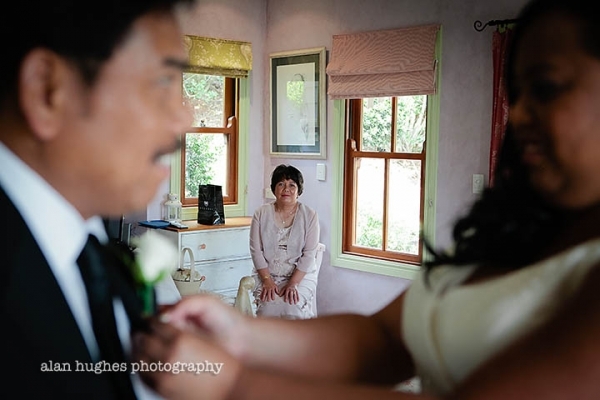 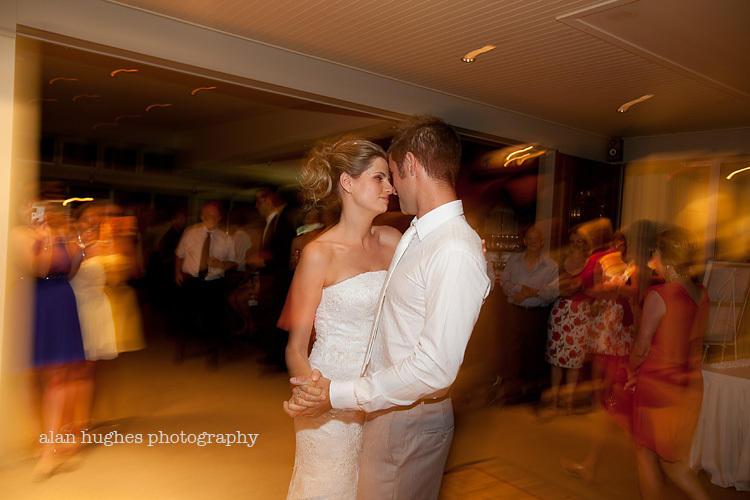 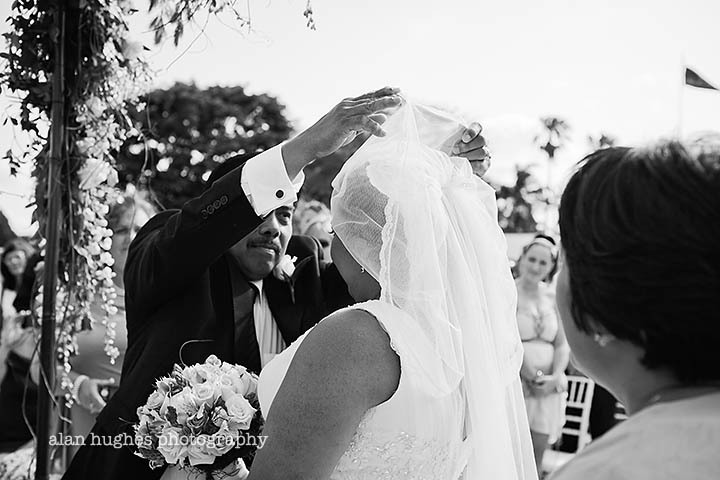 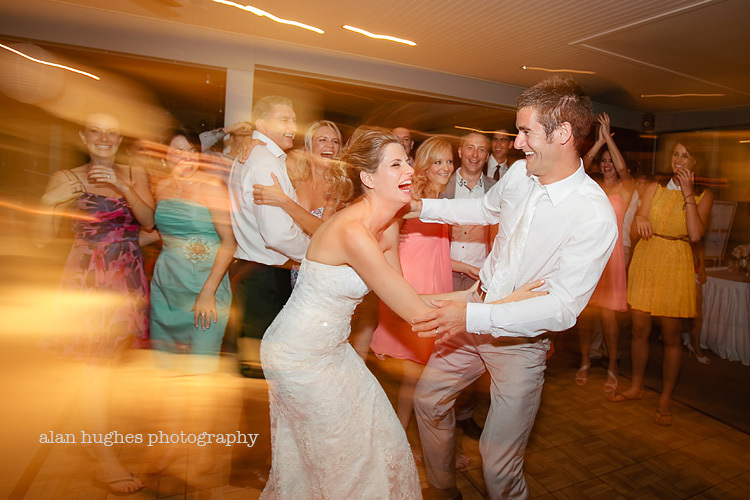 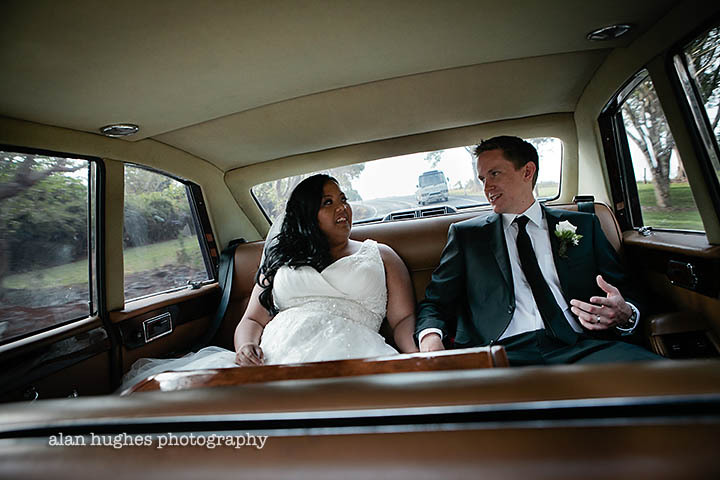 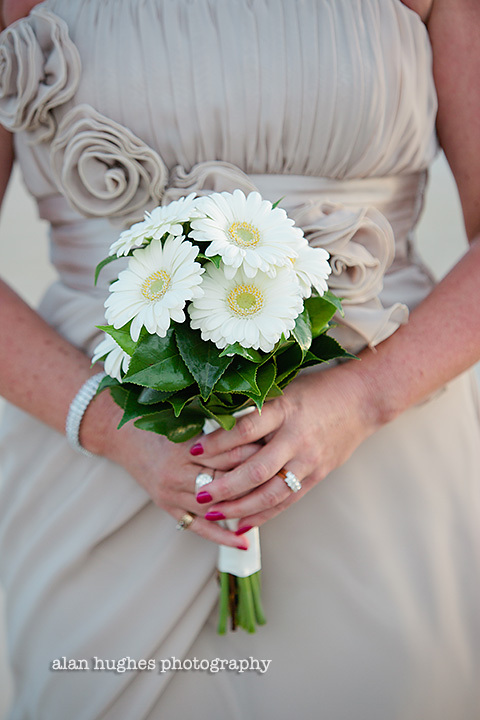 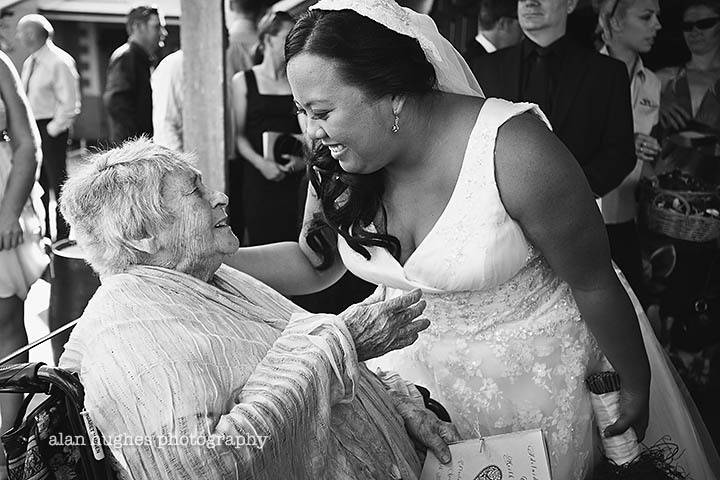 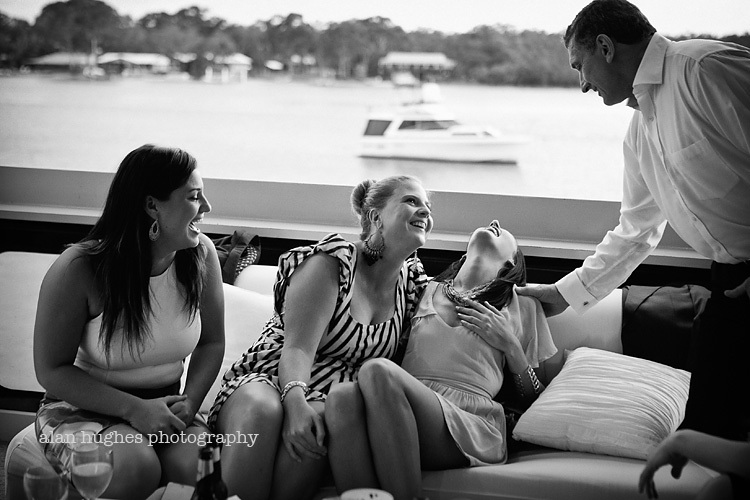 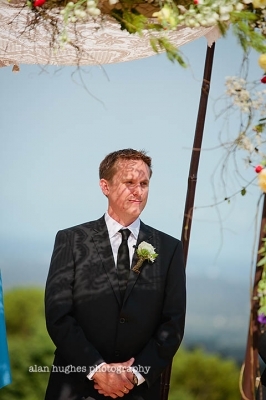 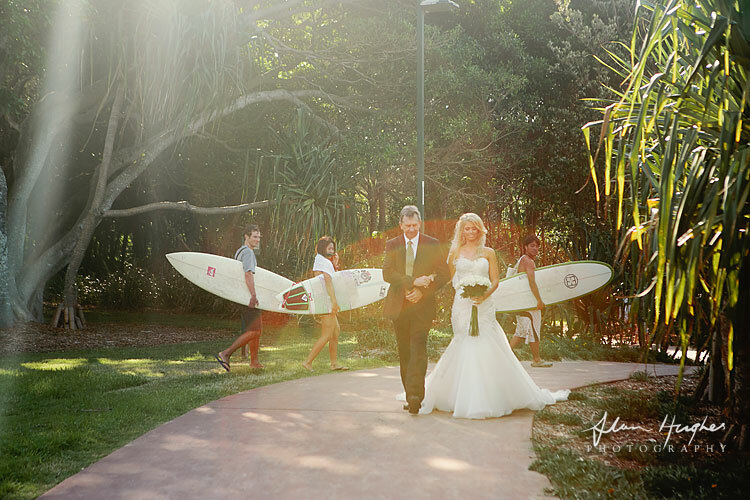 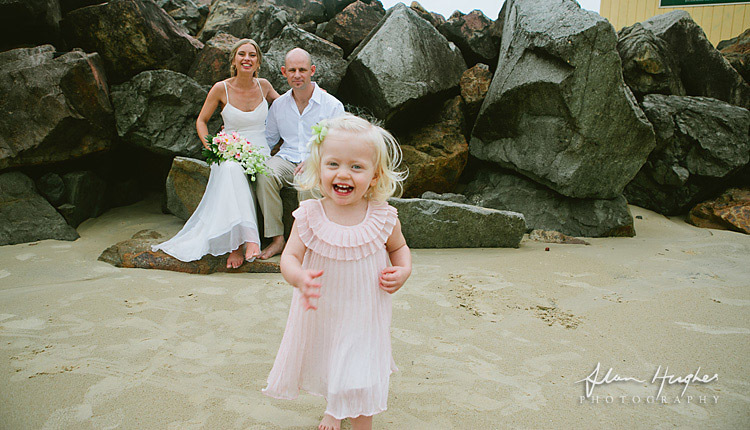 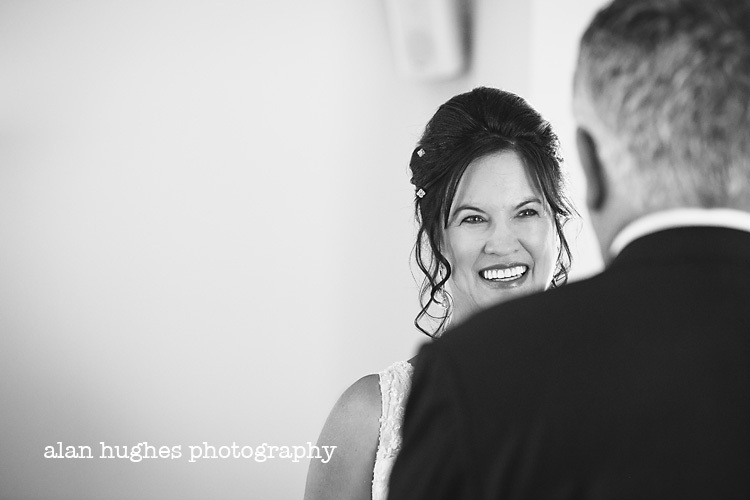 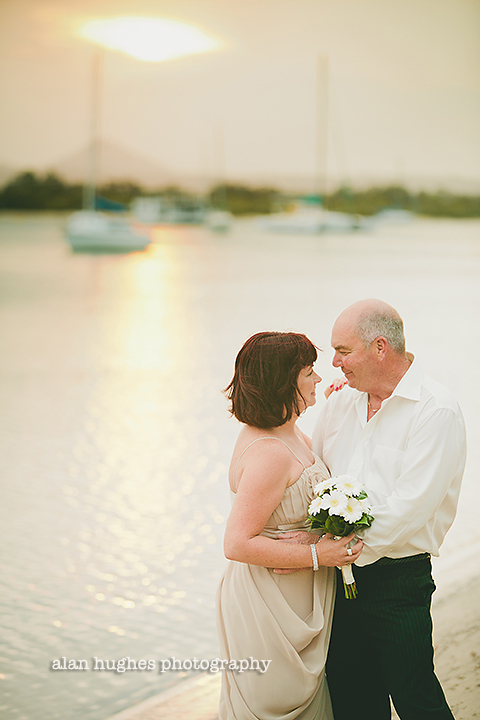 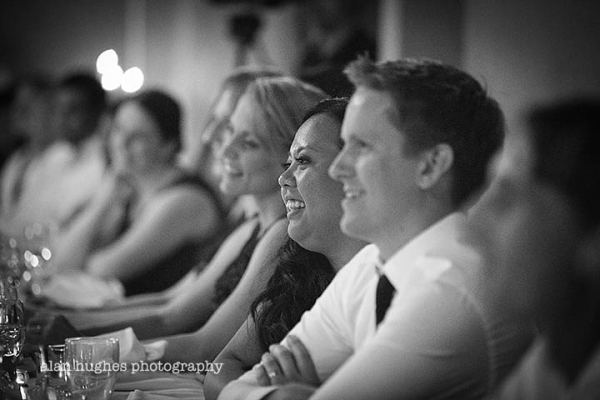 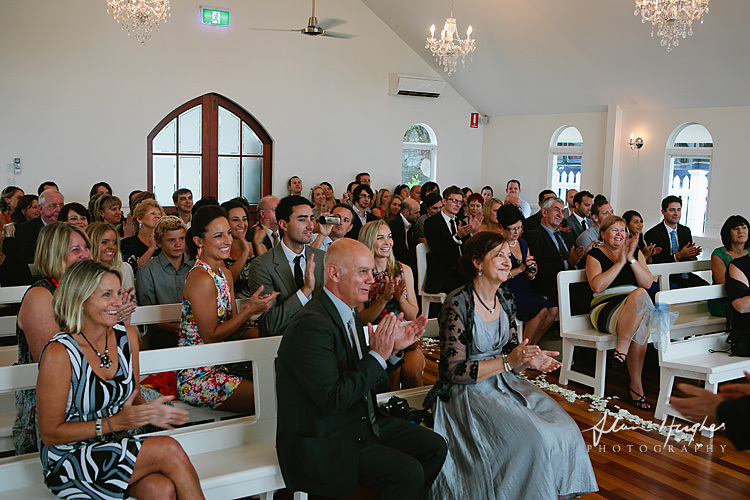 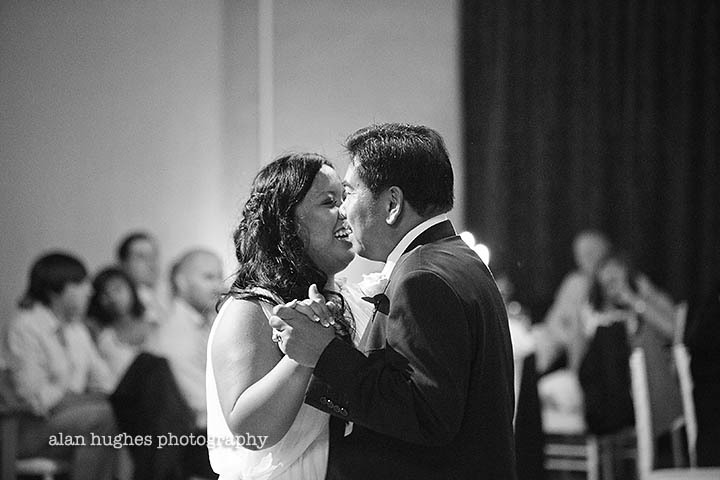 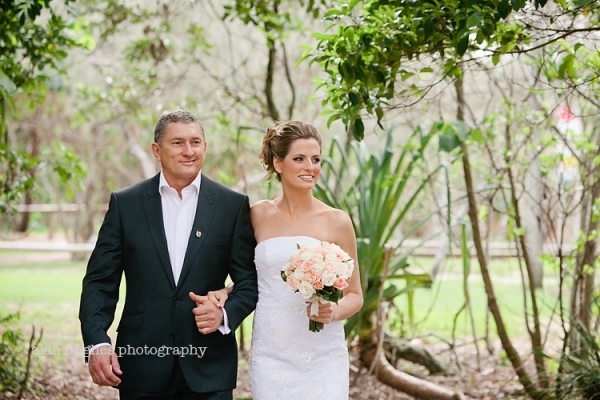 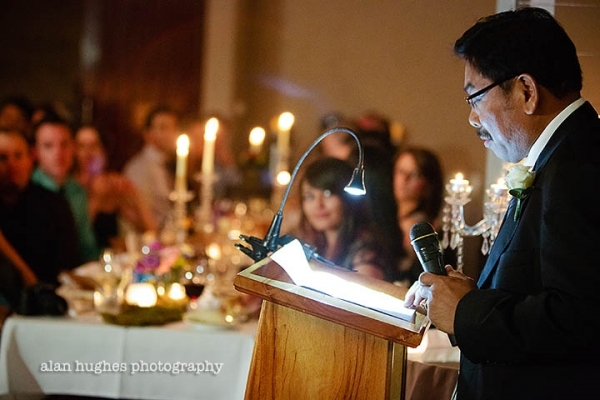 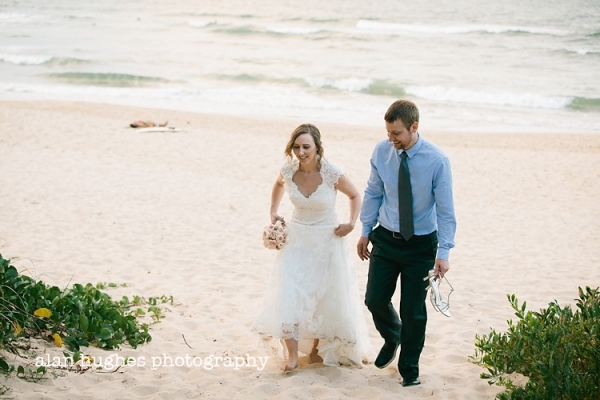 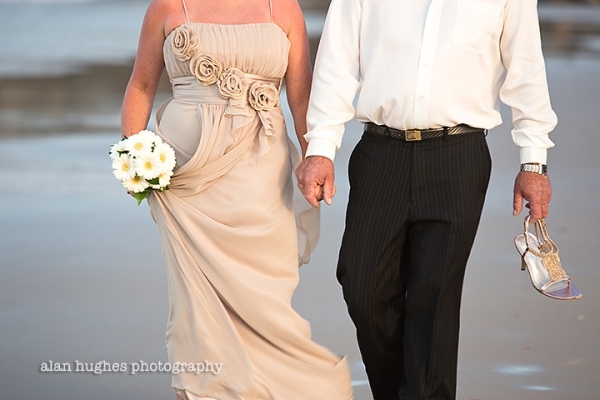 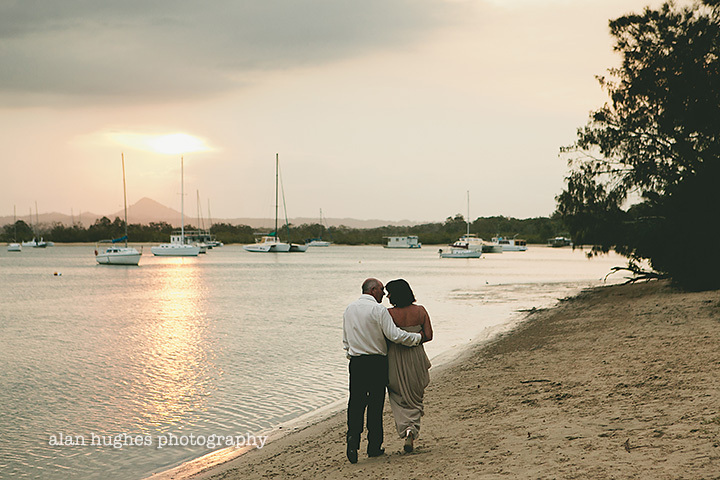 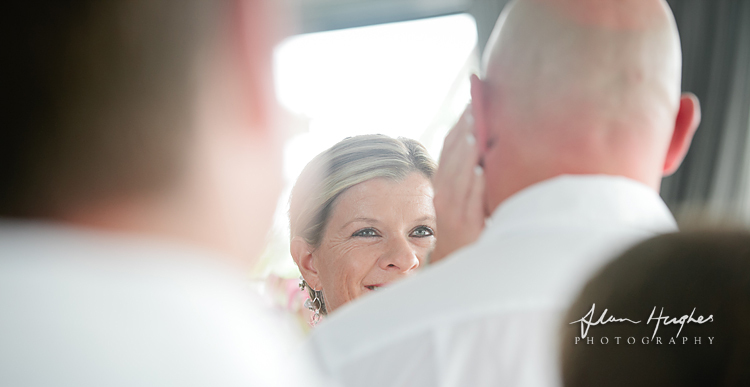 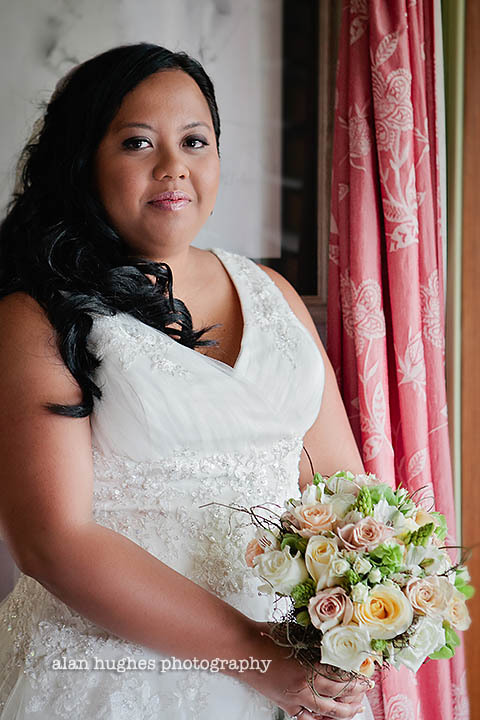 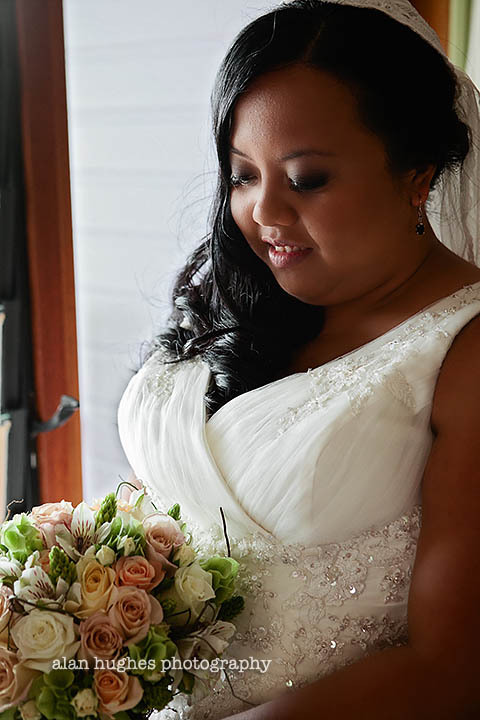 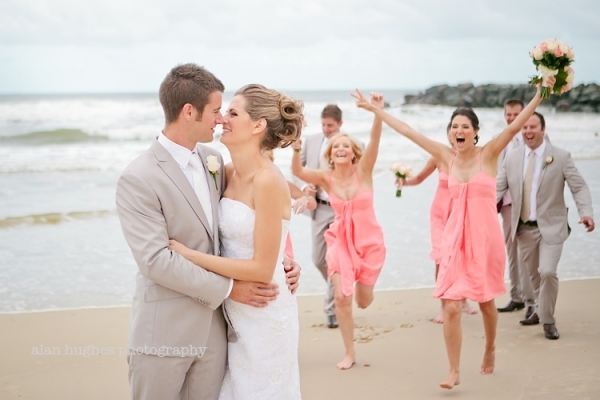 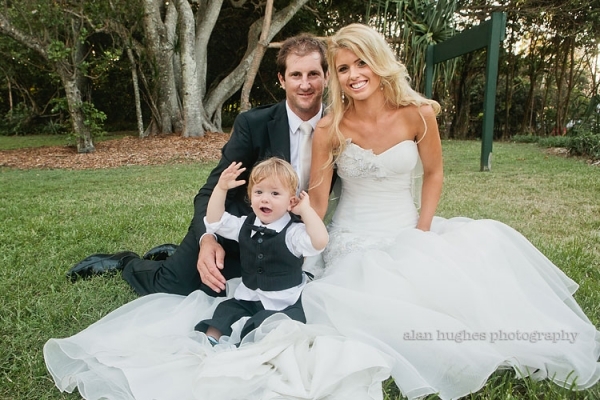 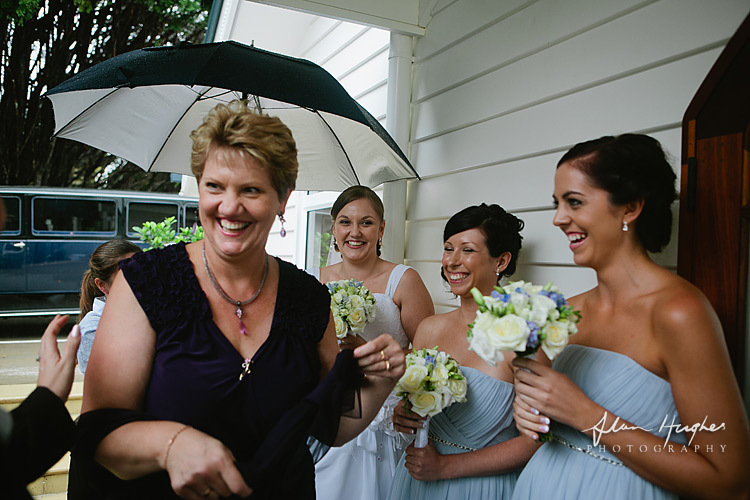 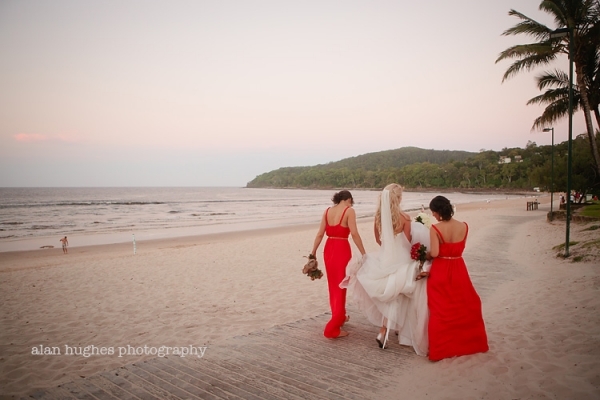 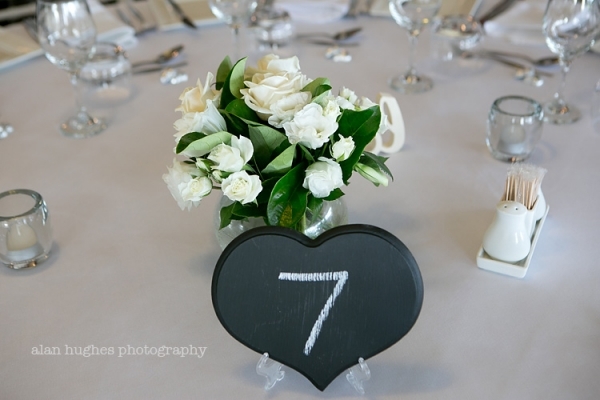 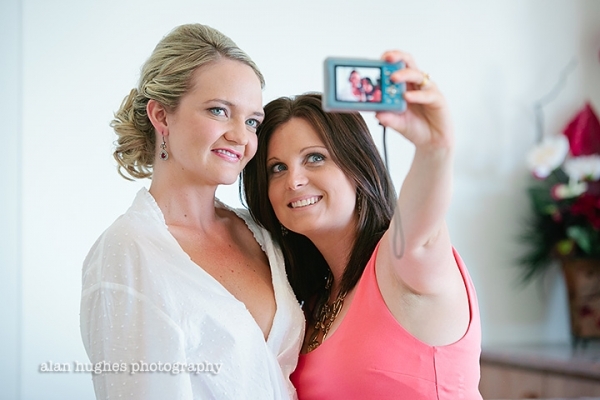 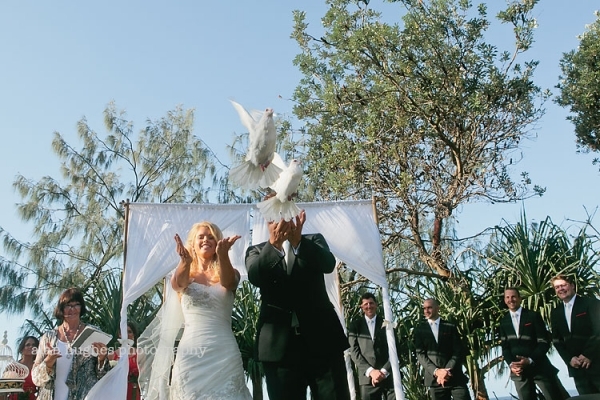 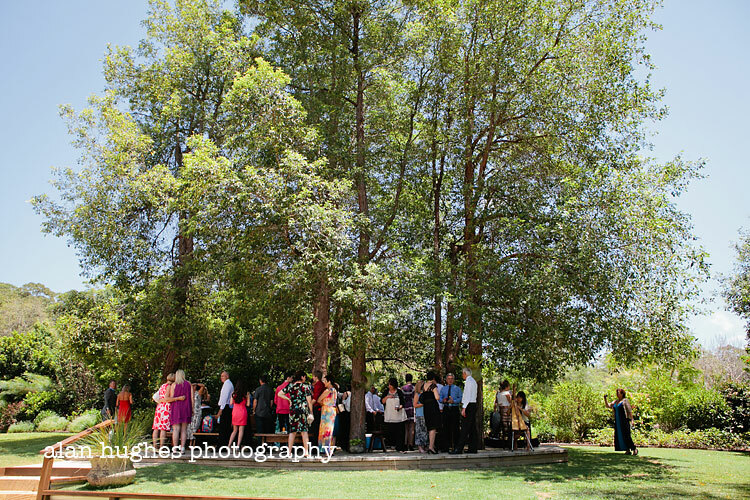 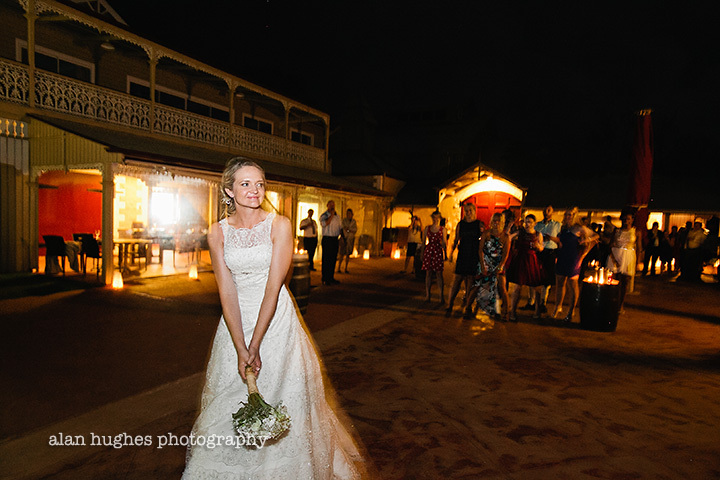 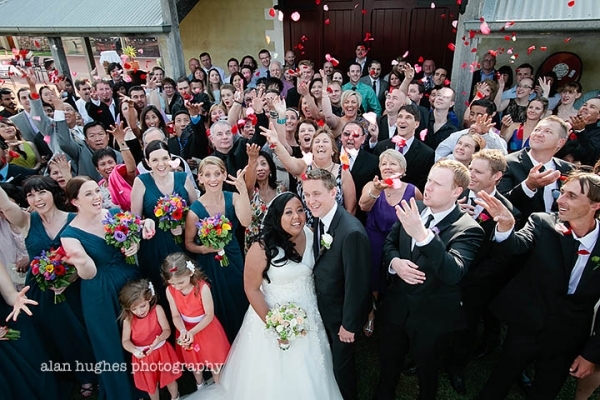 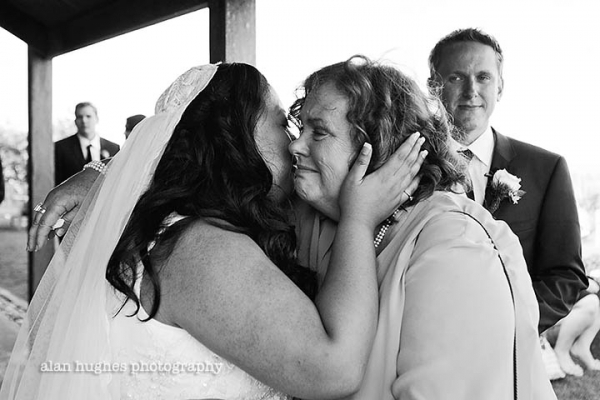 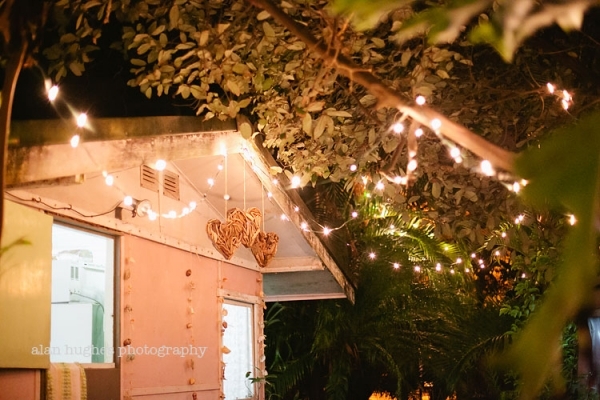 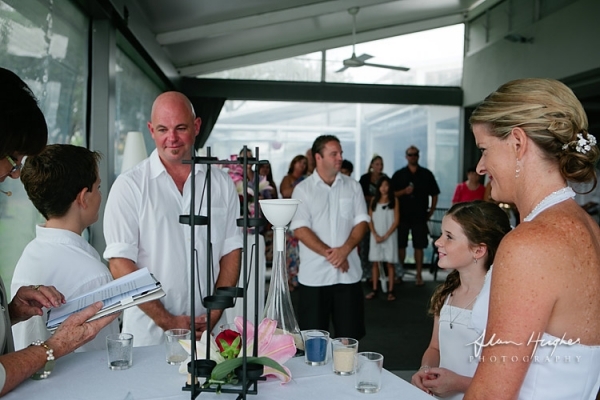 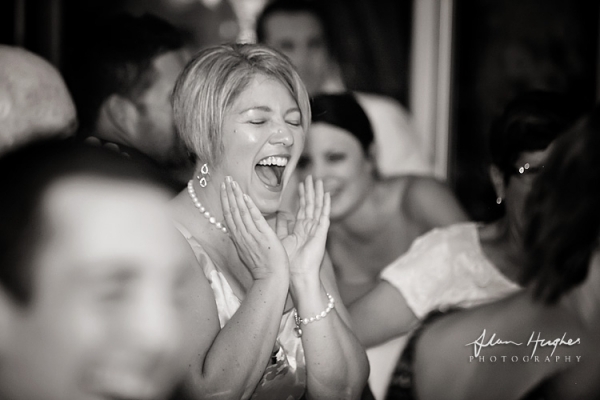 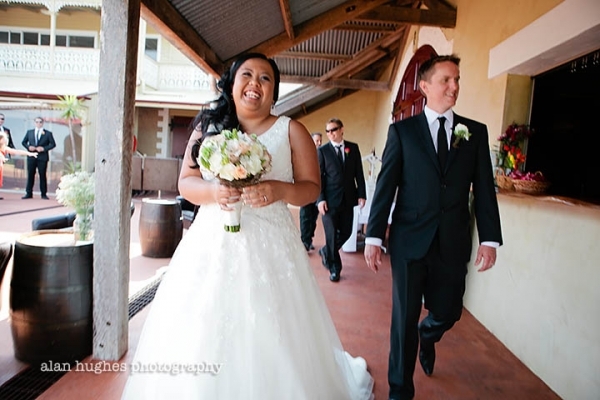 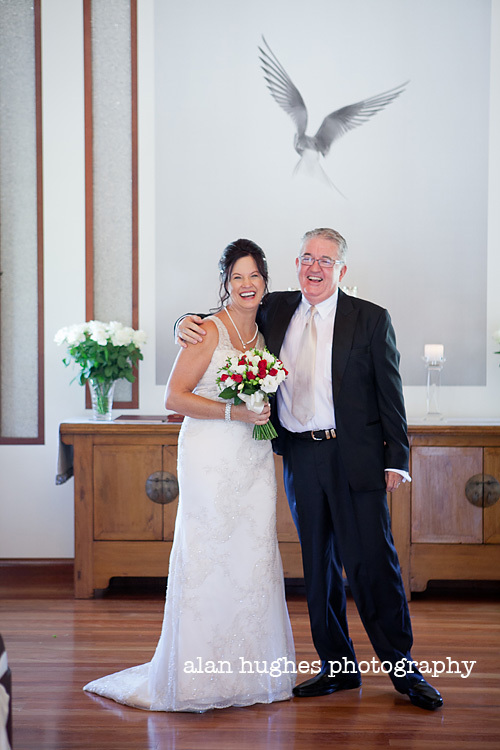 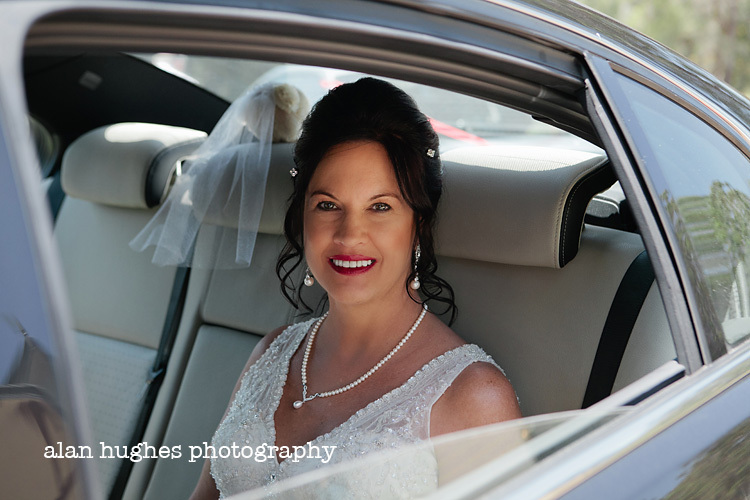 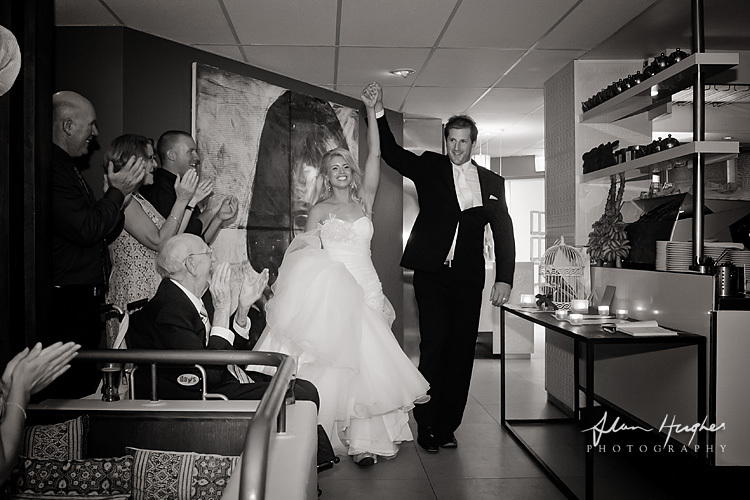 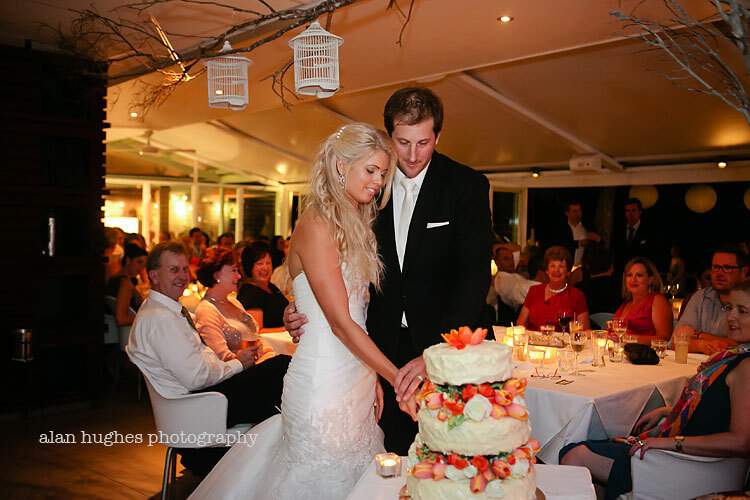 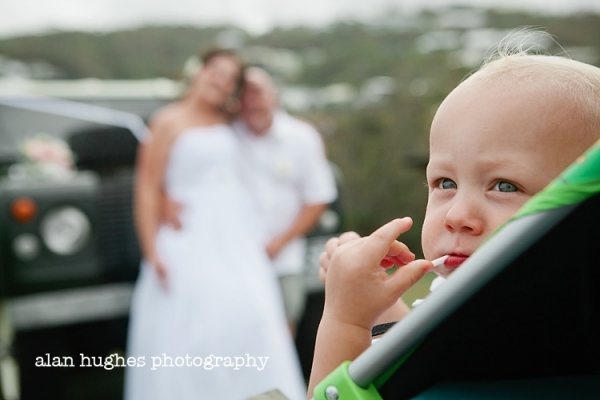 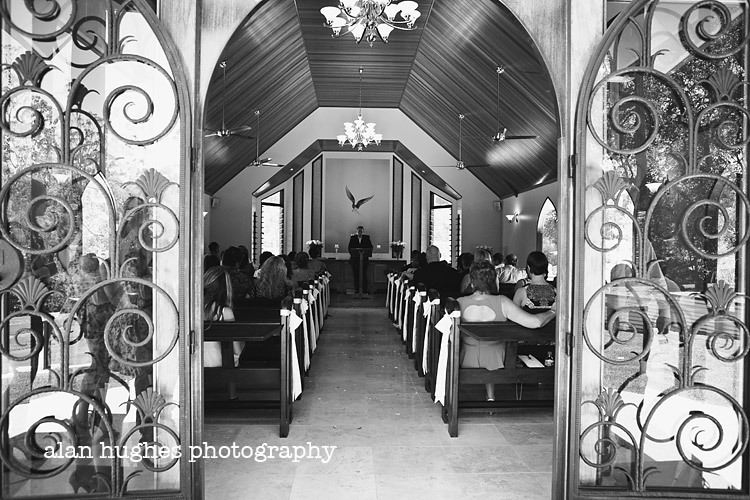 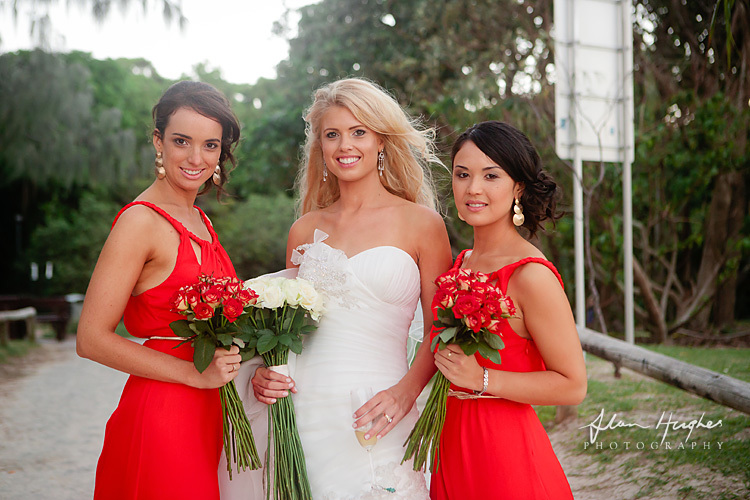 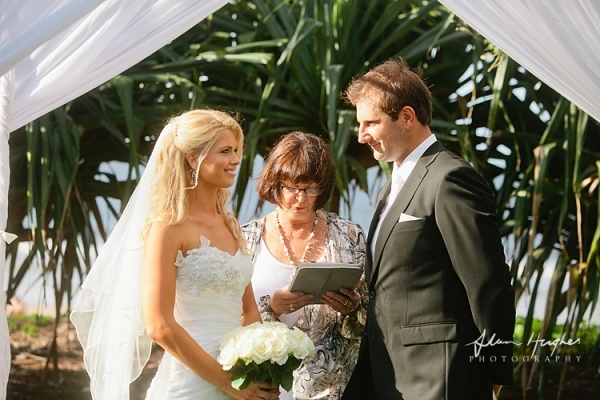 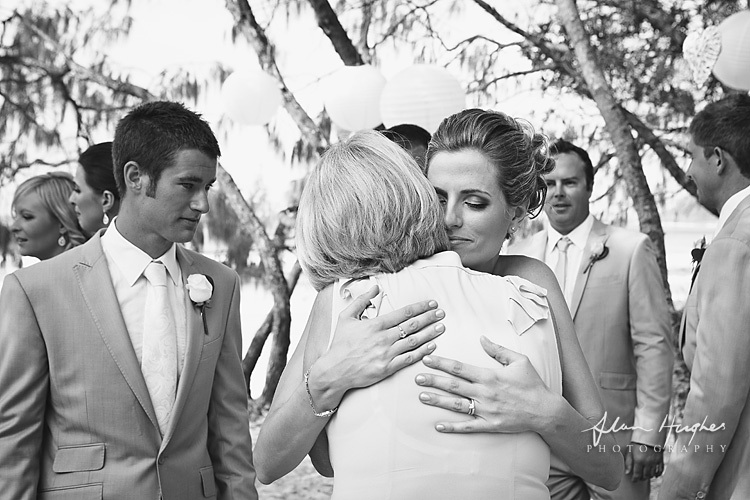 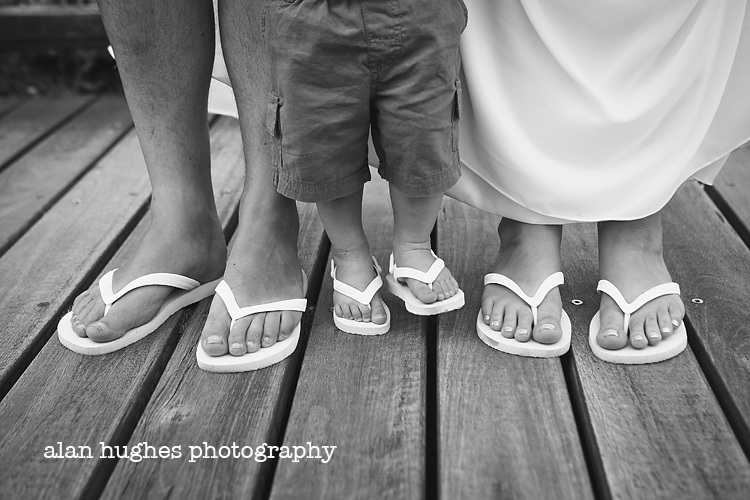 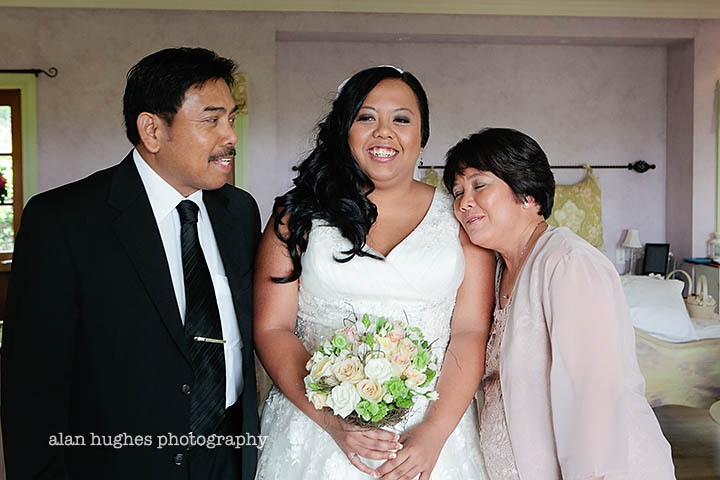 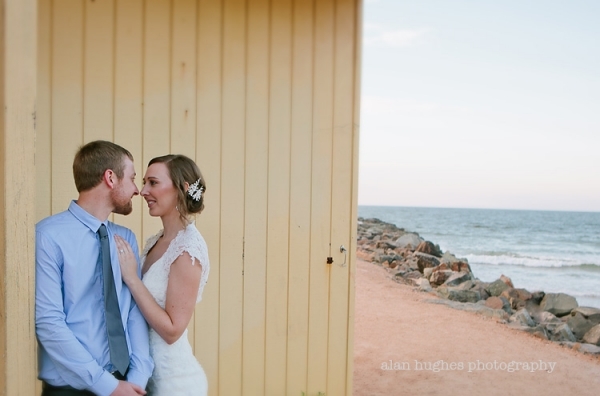 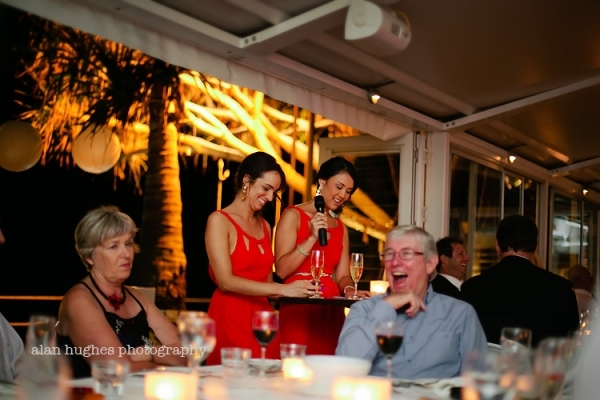 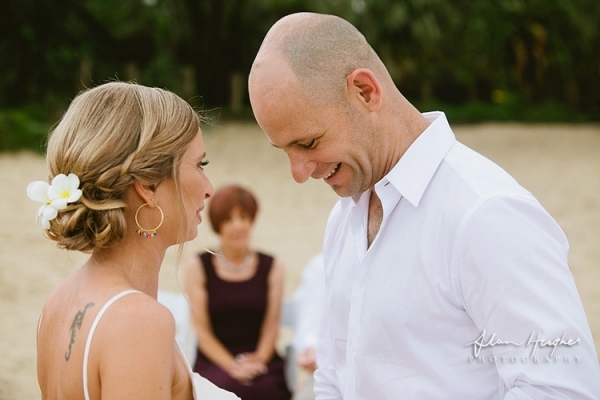 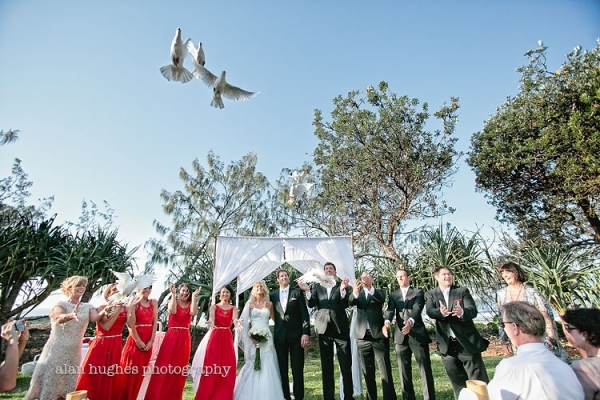 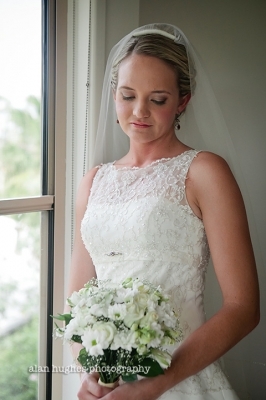 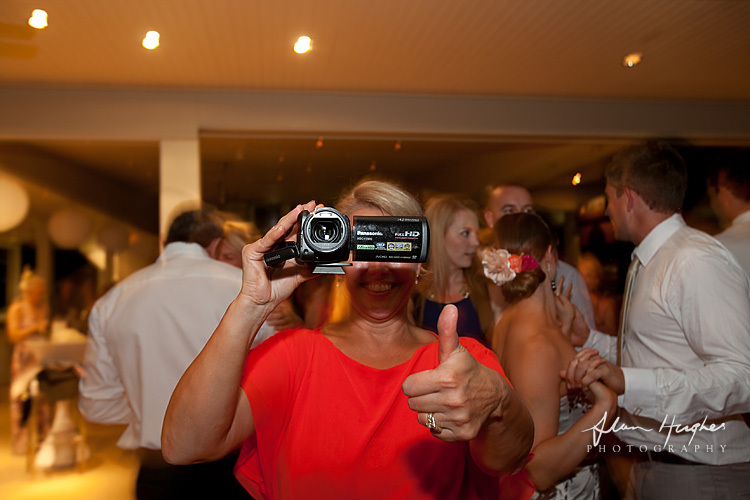 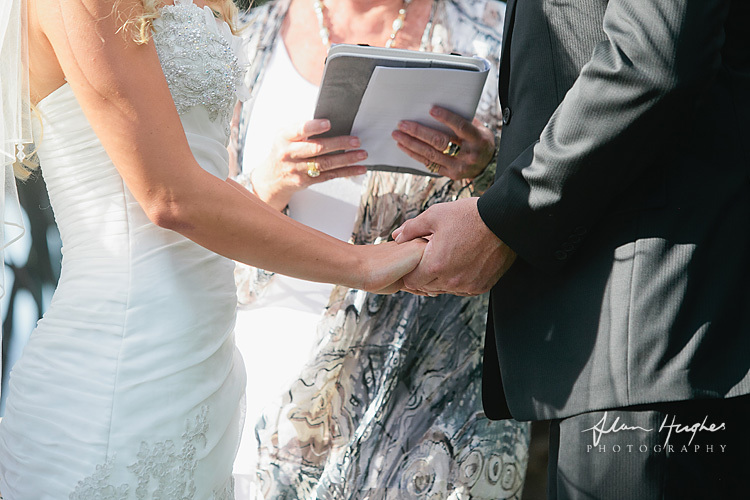 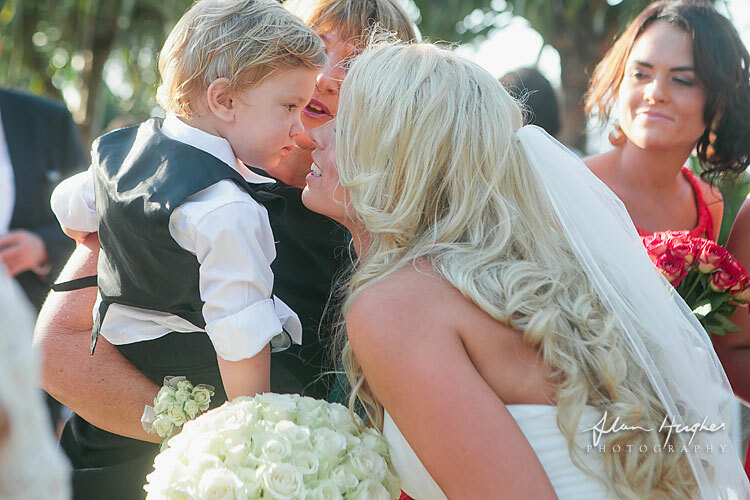 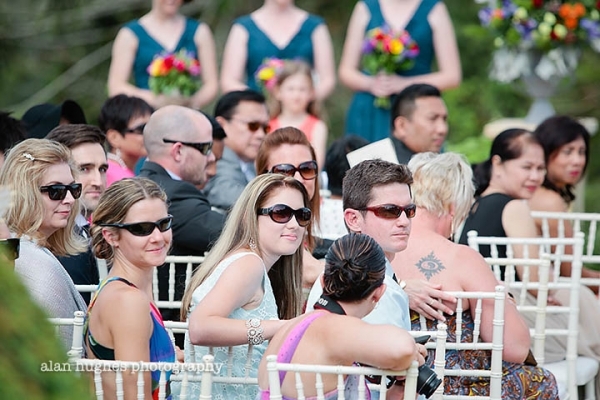 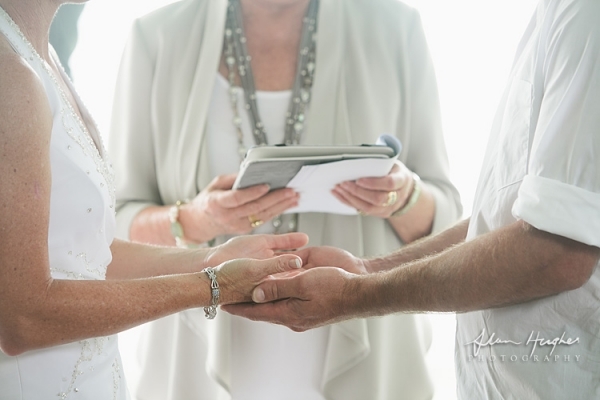 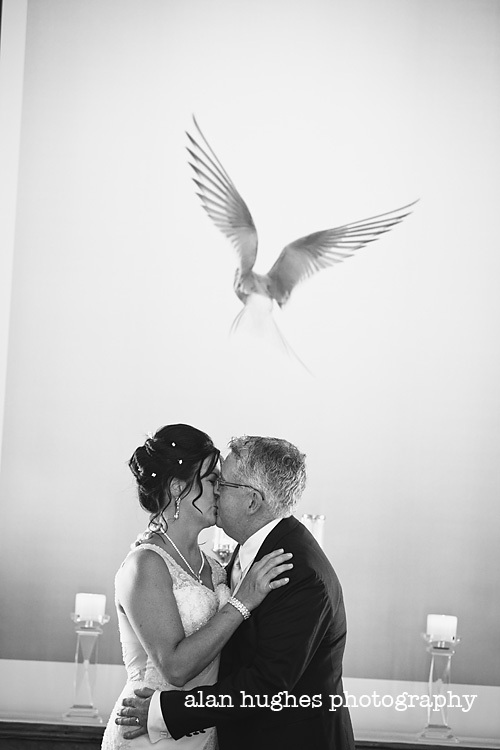 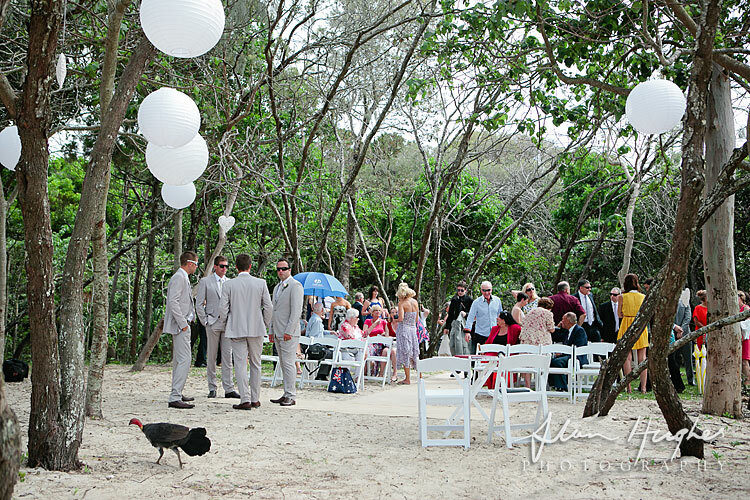 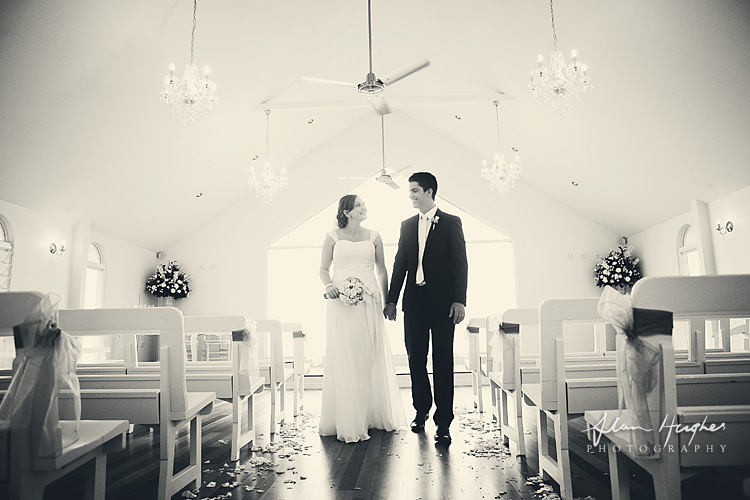 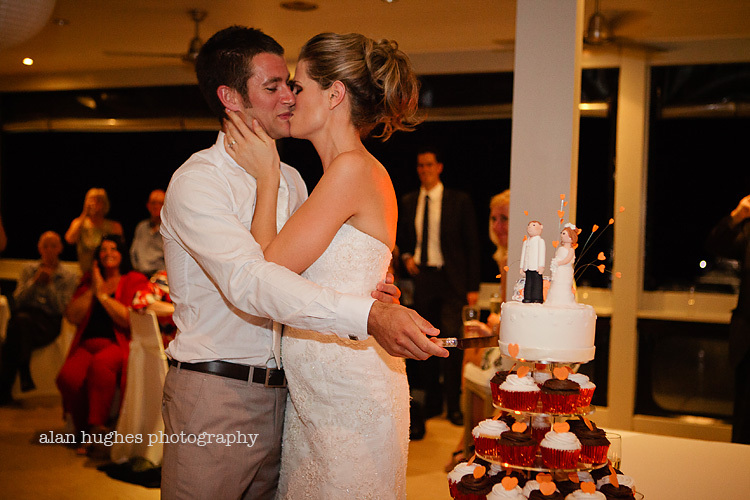 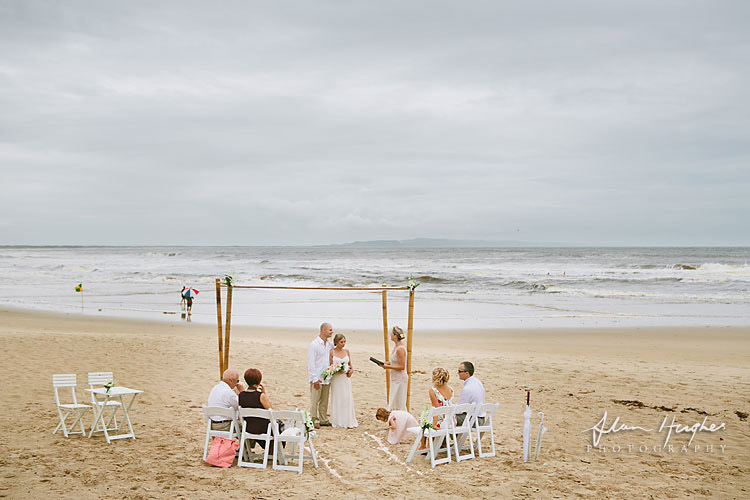 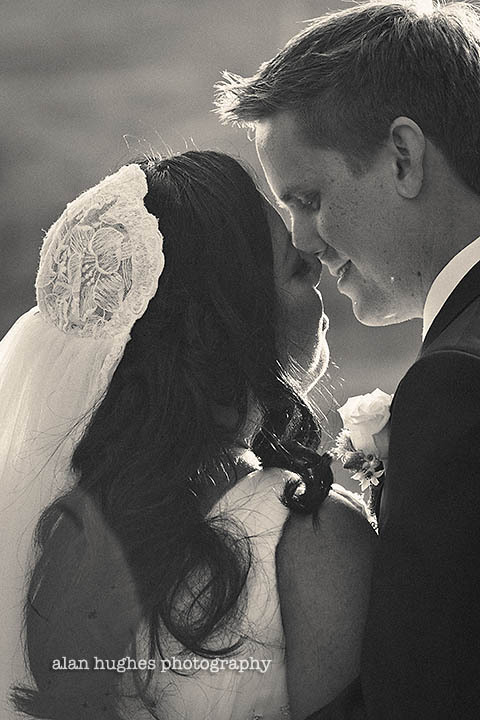 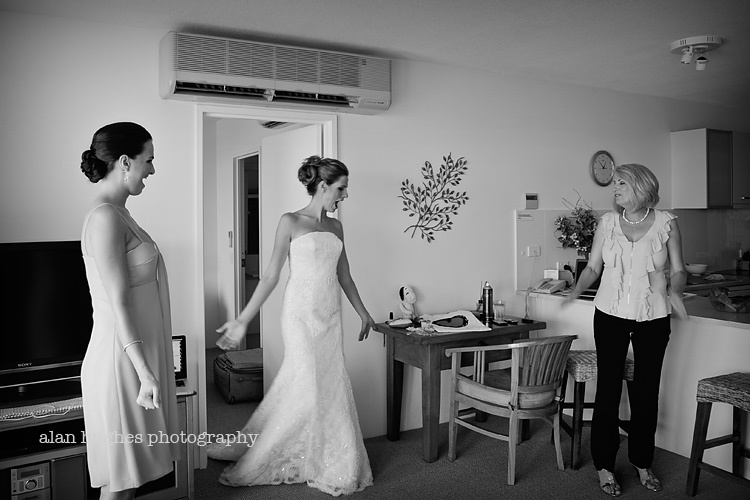 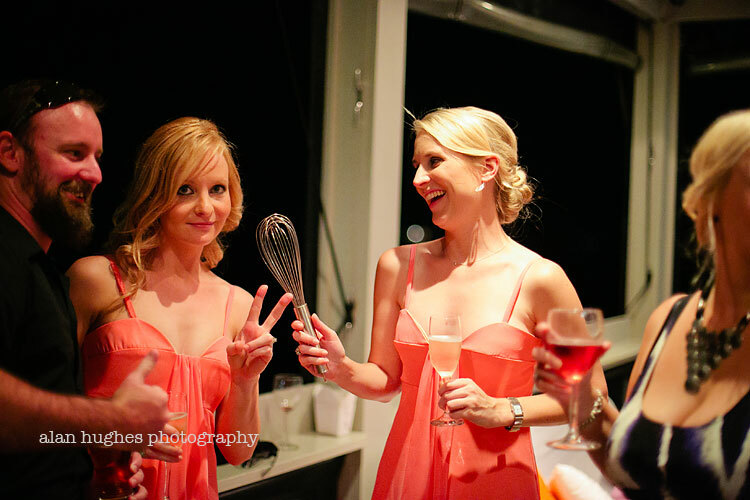 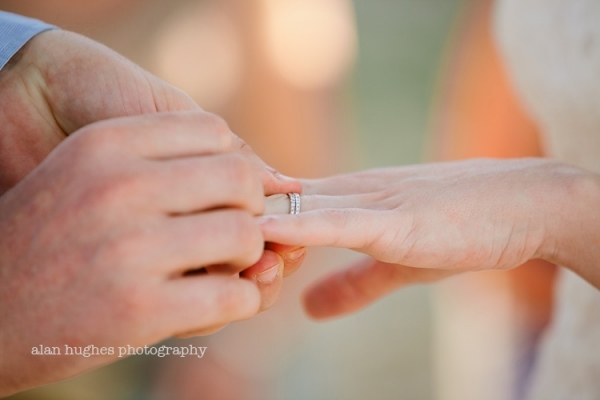 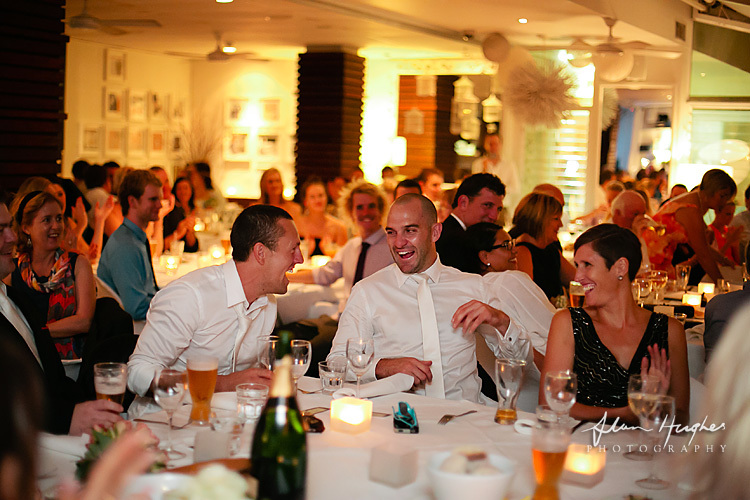 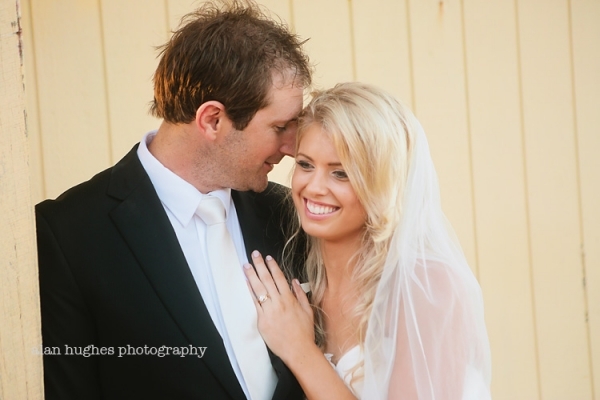 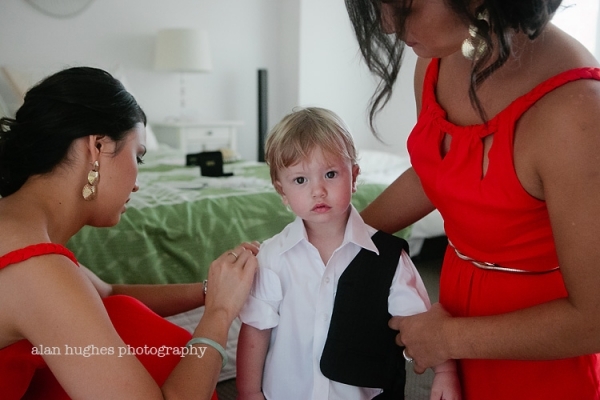 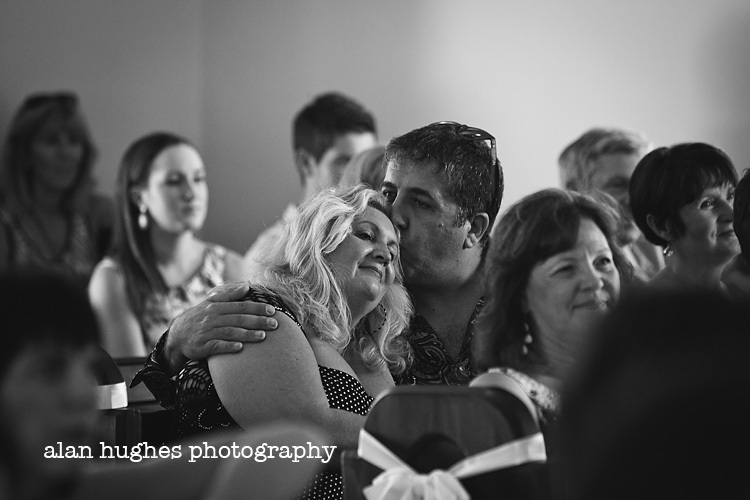 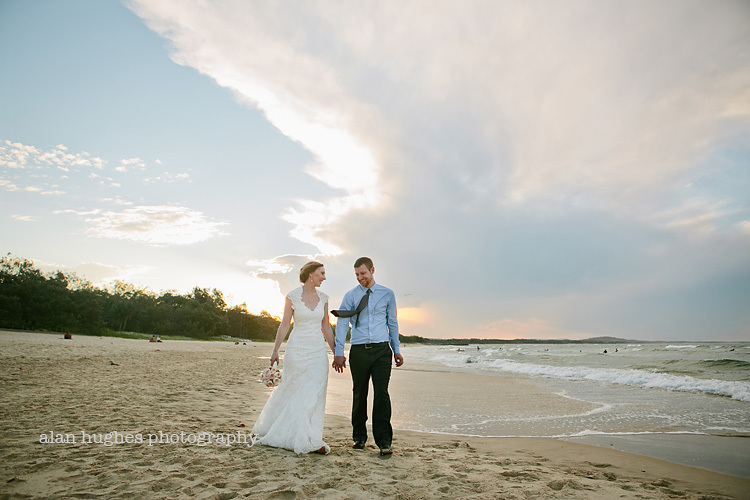 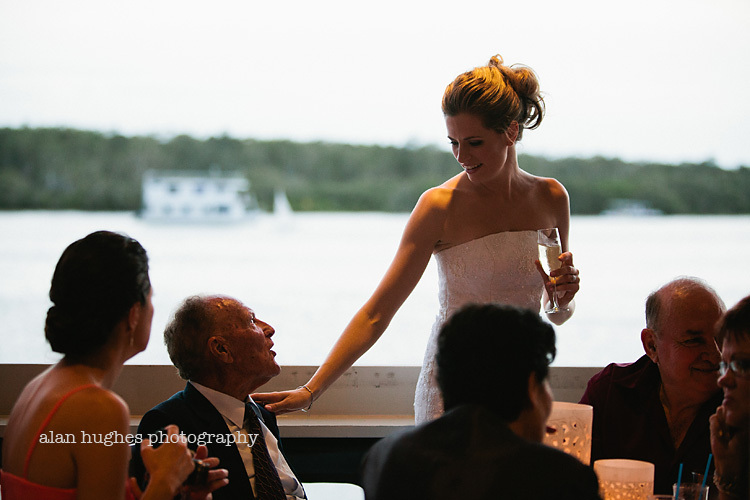 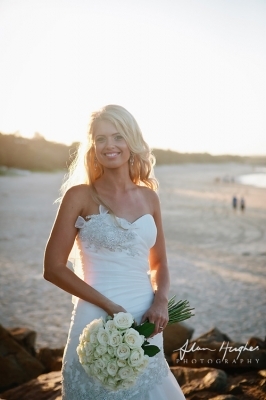 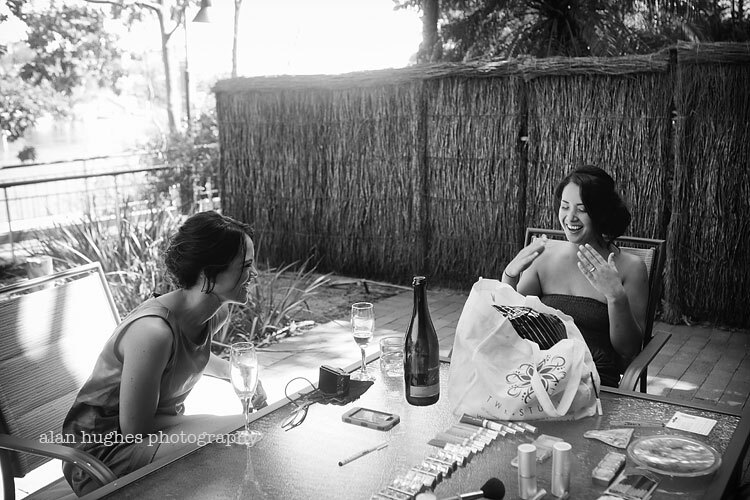 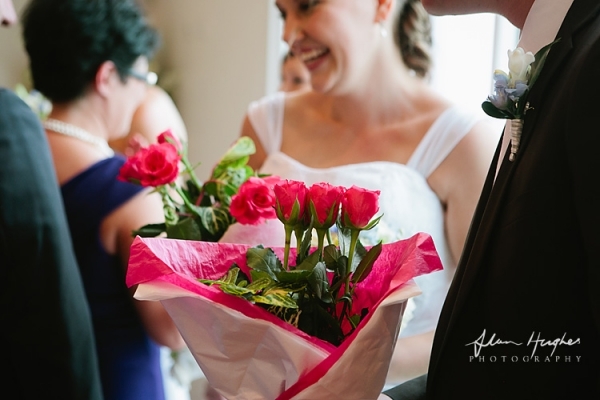 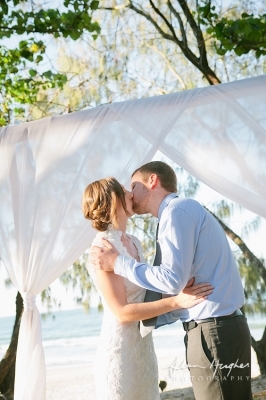 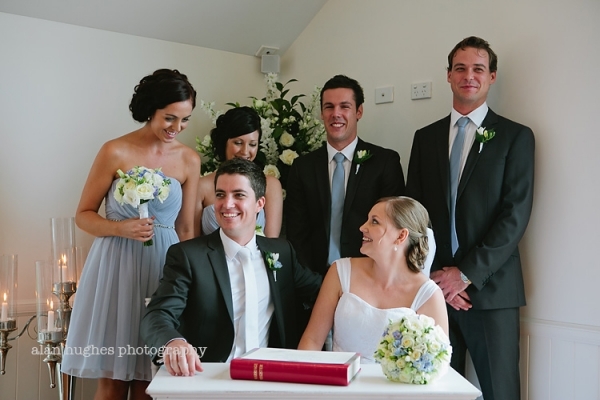 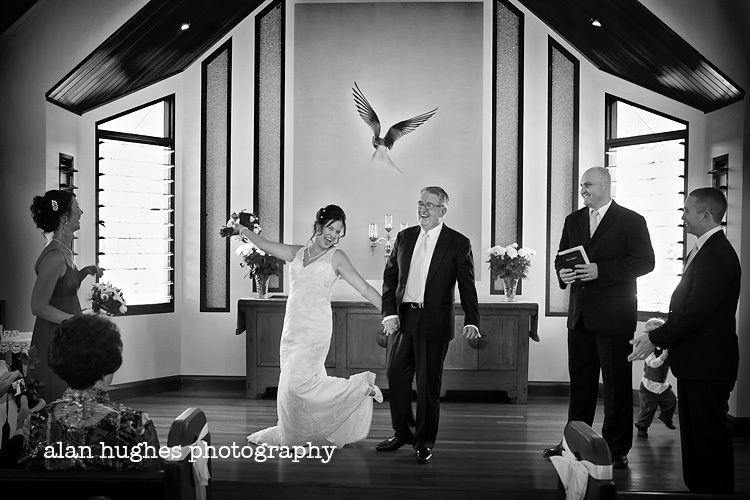 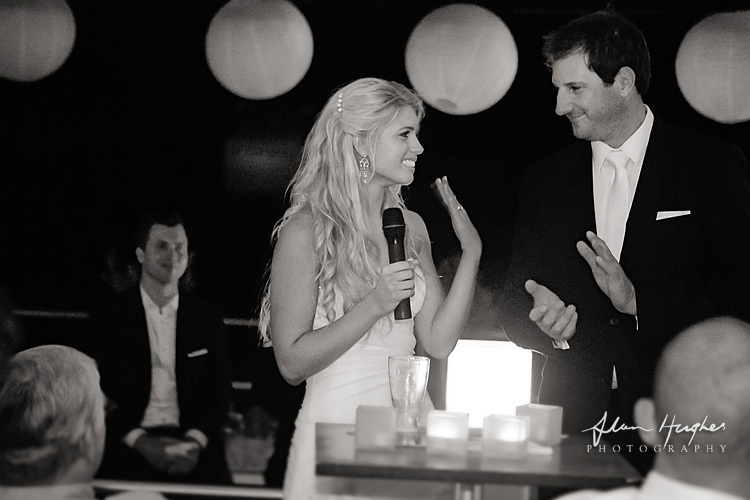 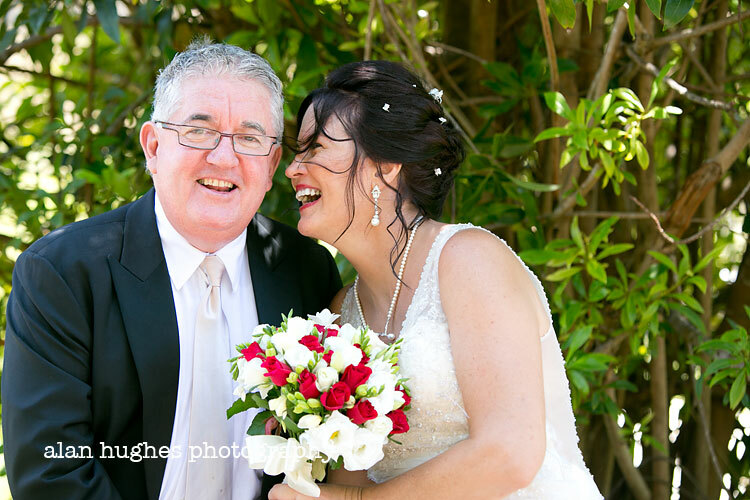 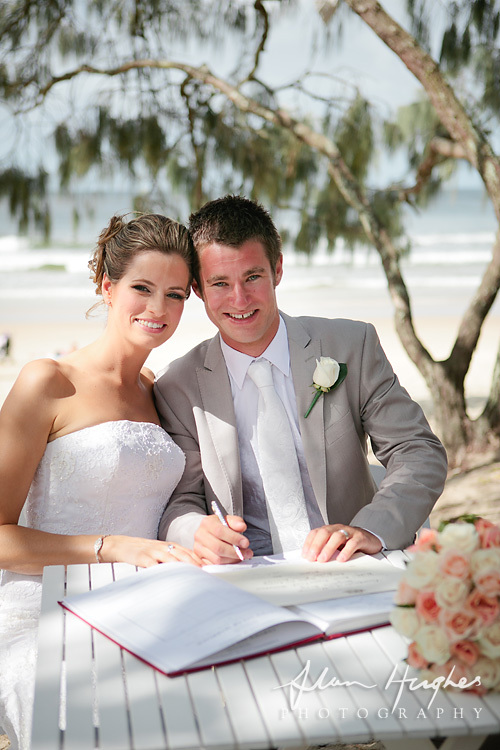 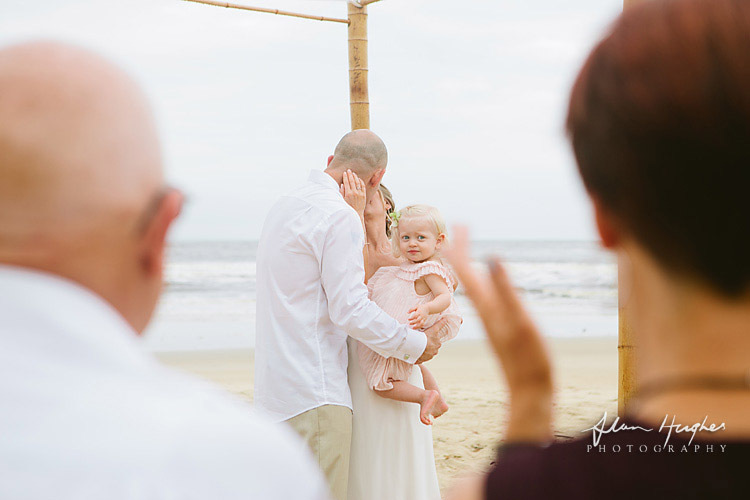 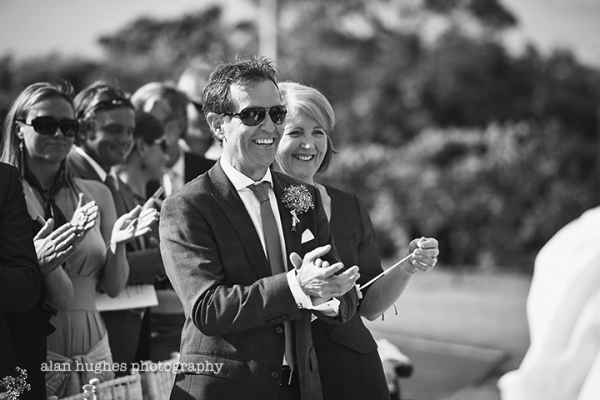 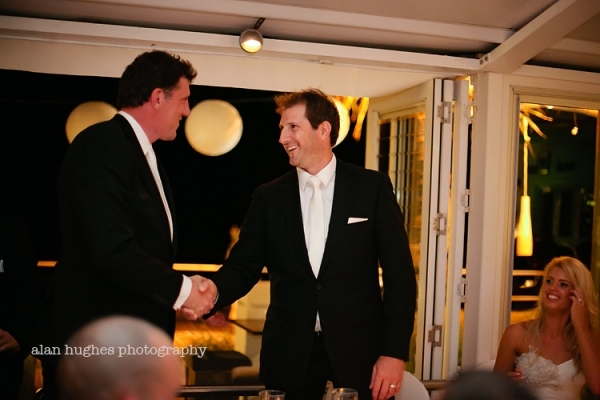 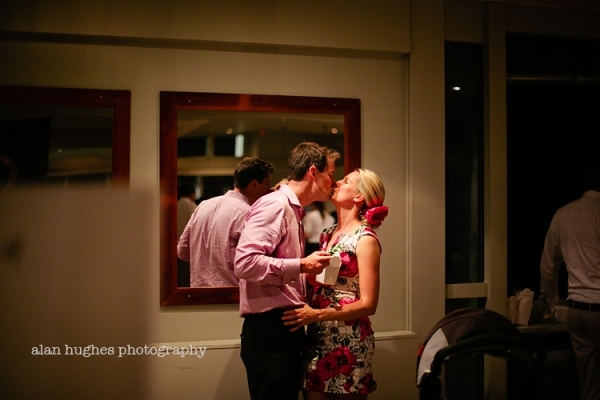 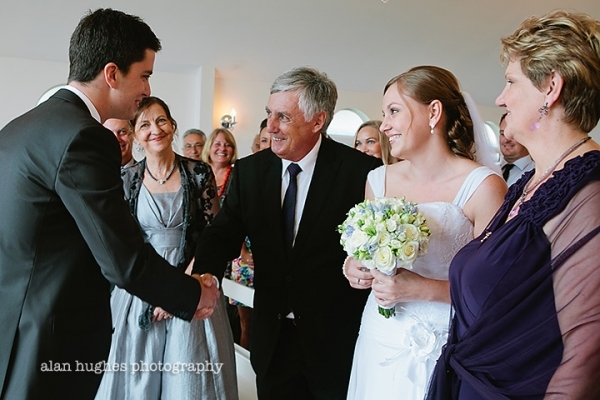 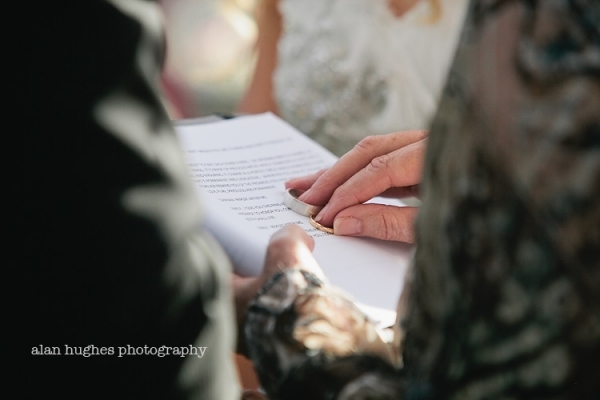 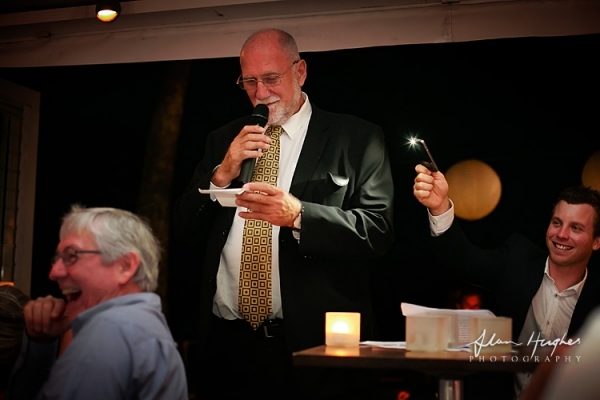 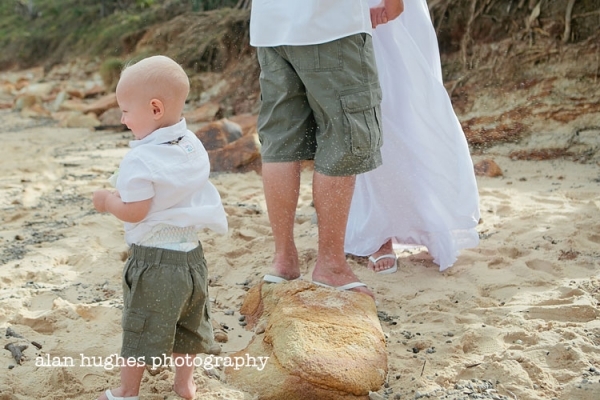 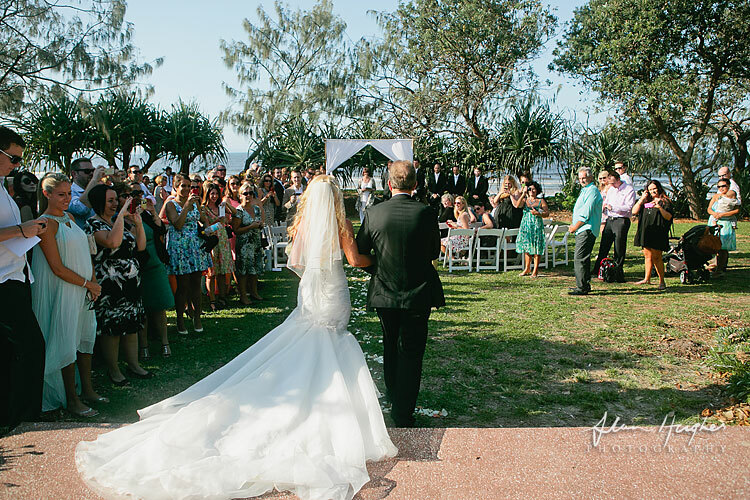 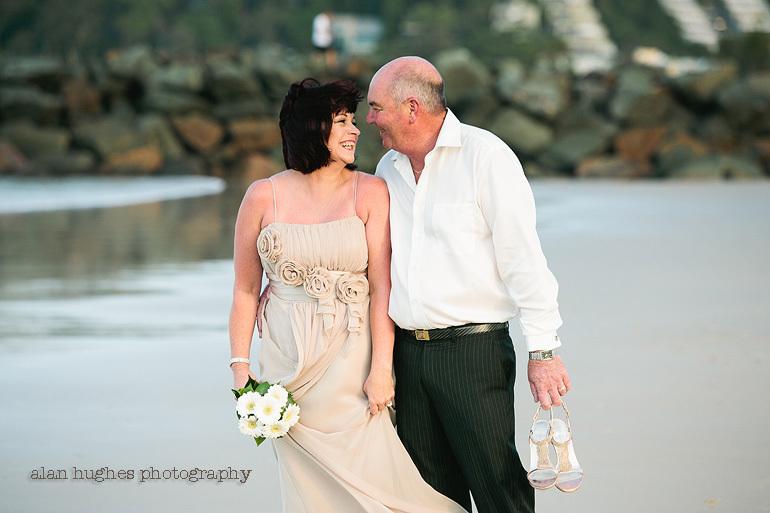 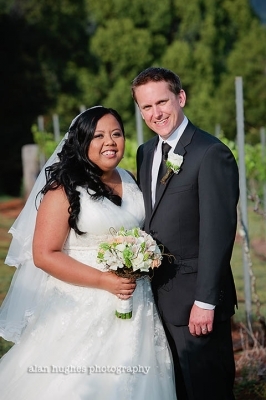 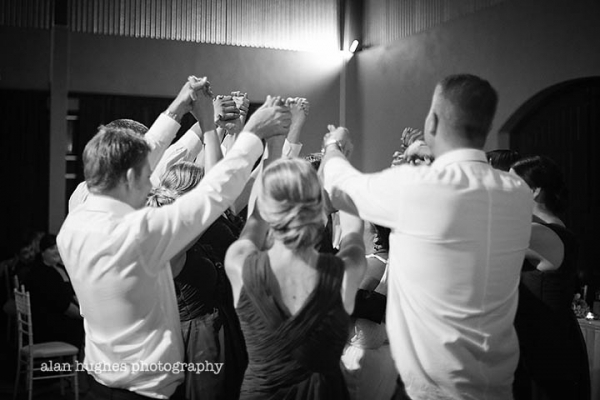 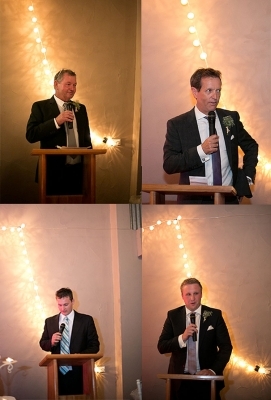 Charmaine & Noel got married in a very intimate wedding ceremony at Access 14 on Noosa Main Beach. 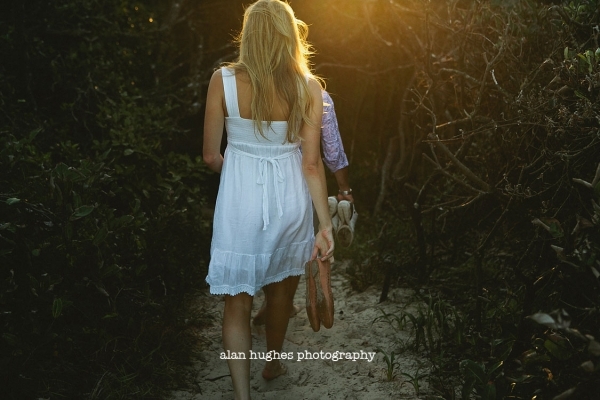 The witnesses were a couple of people who happened to be on holiday and relaxing on the beach but they too were swept up by the love affair that was clear to see. 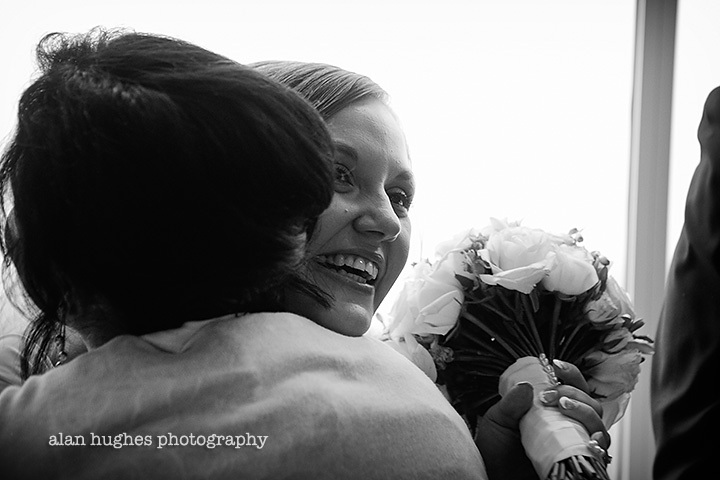 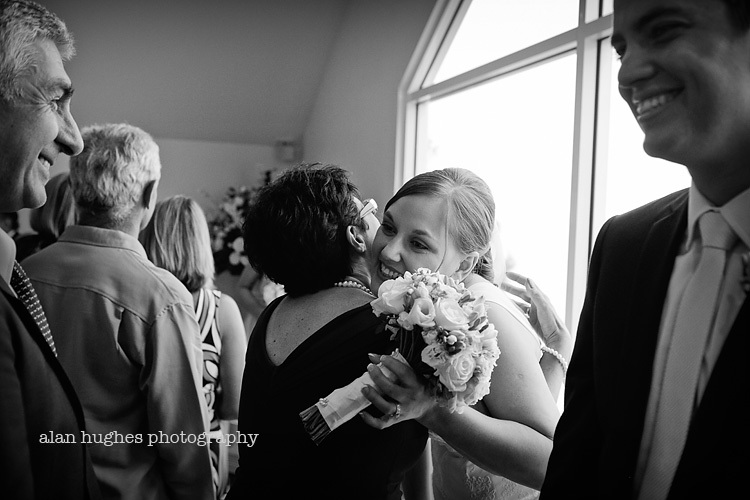 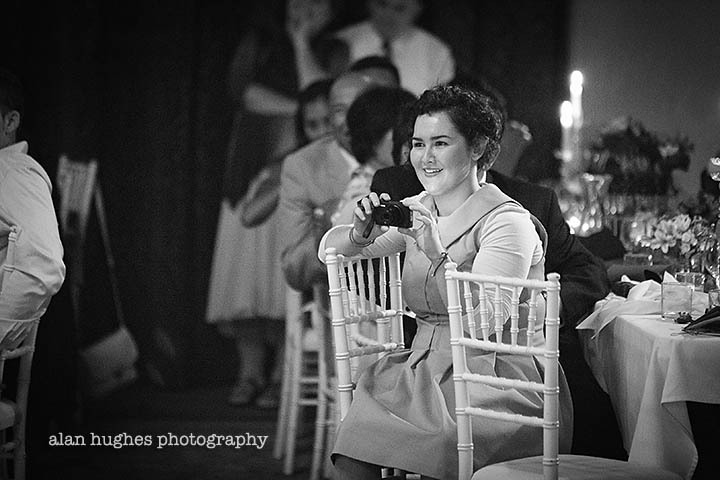 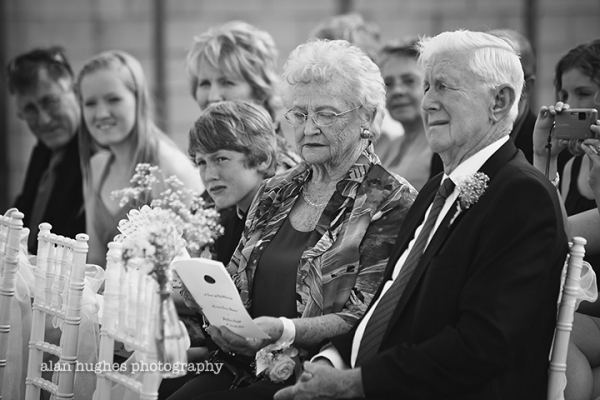 Thank you for allowing me to capture the special moments, it was a real privelege and congratulations to you both.